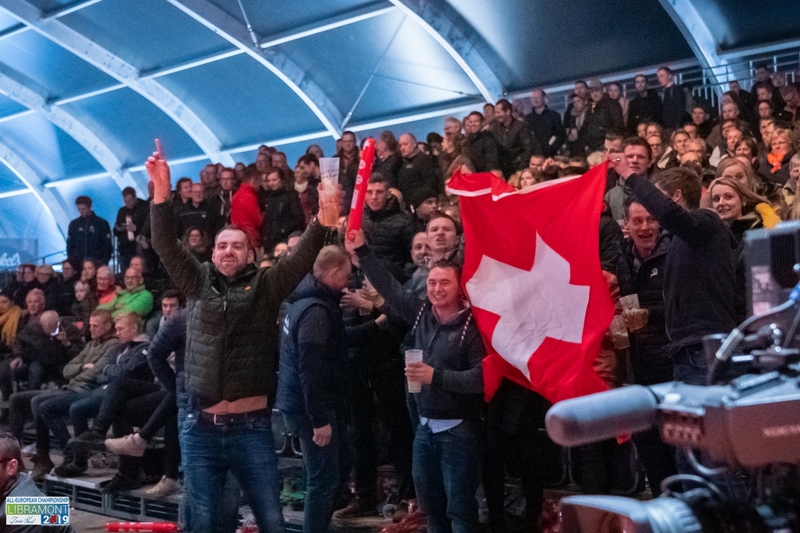 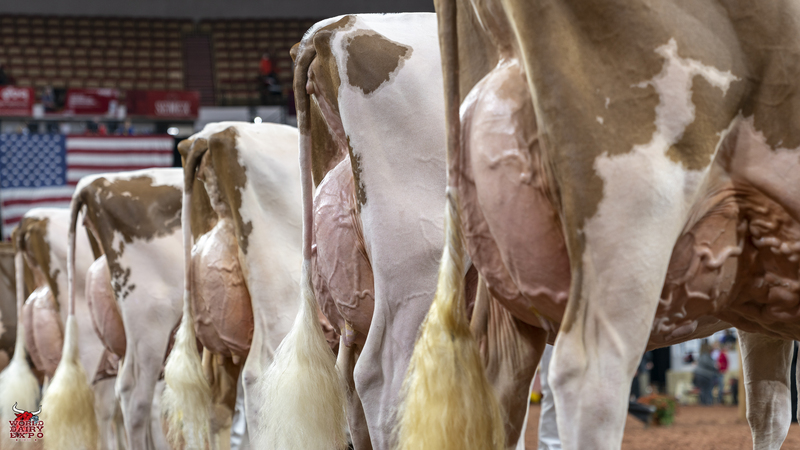 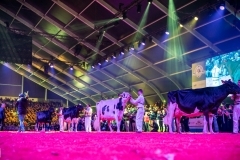 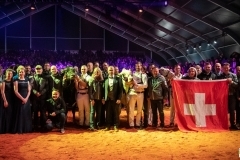 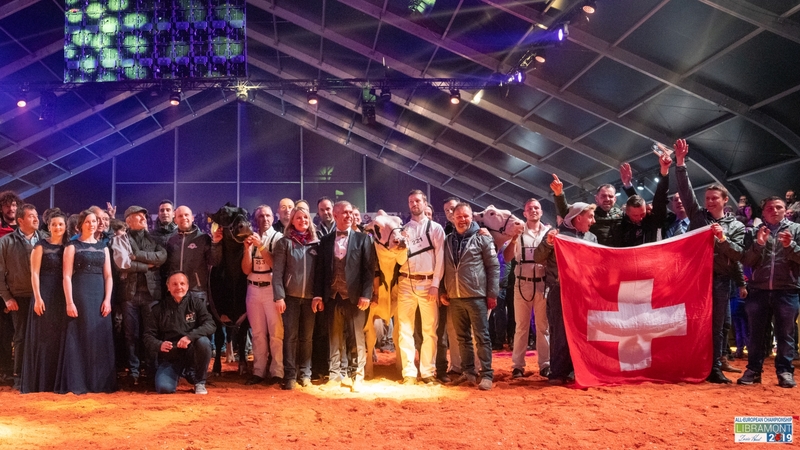 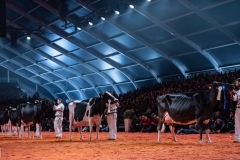 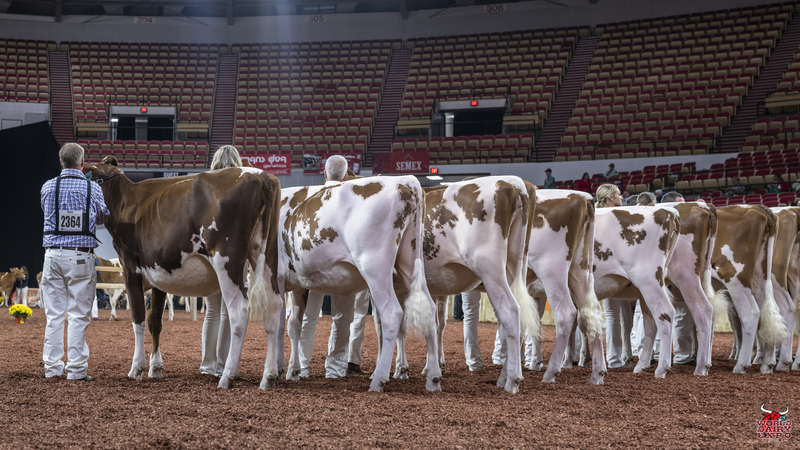 Oakfield A Shampagne-Red-ET took home two Champion trophies at the International Red & White Show. 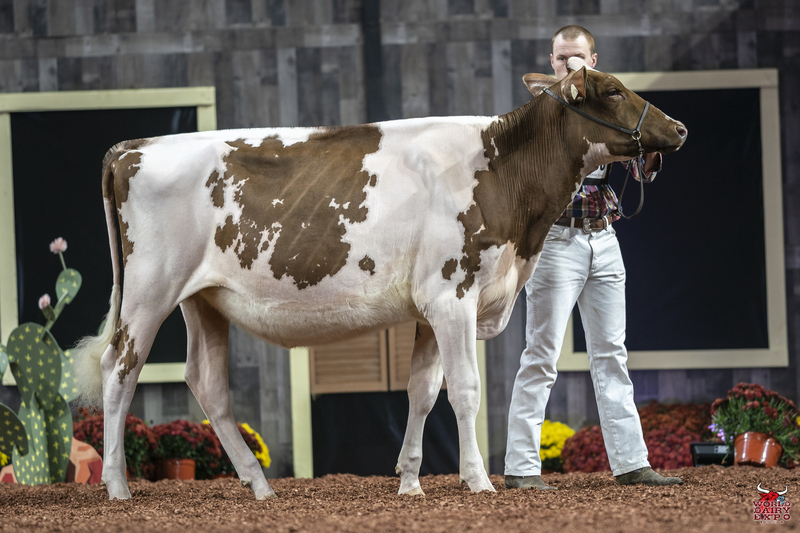 Owned by Westcoast Holsteins, Chilliwack, B.C., Canada. 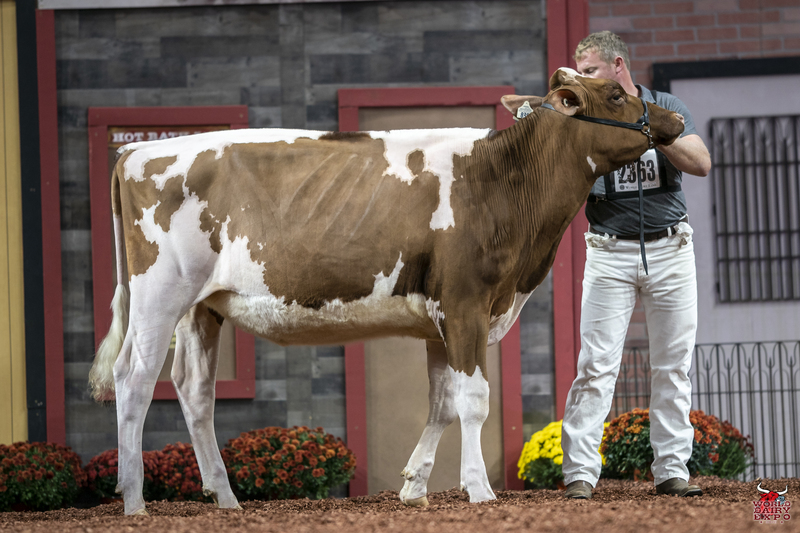 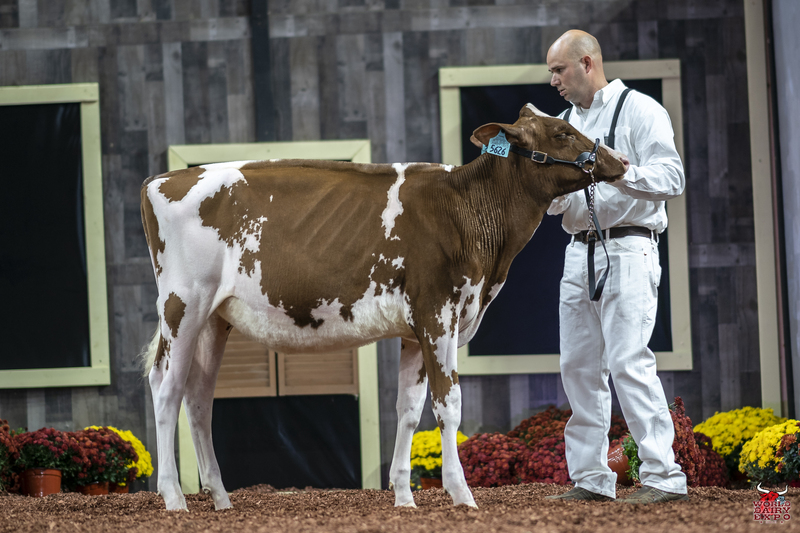 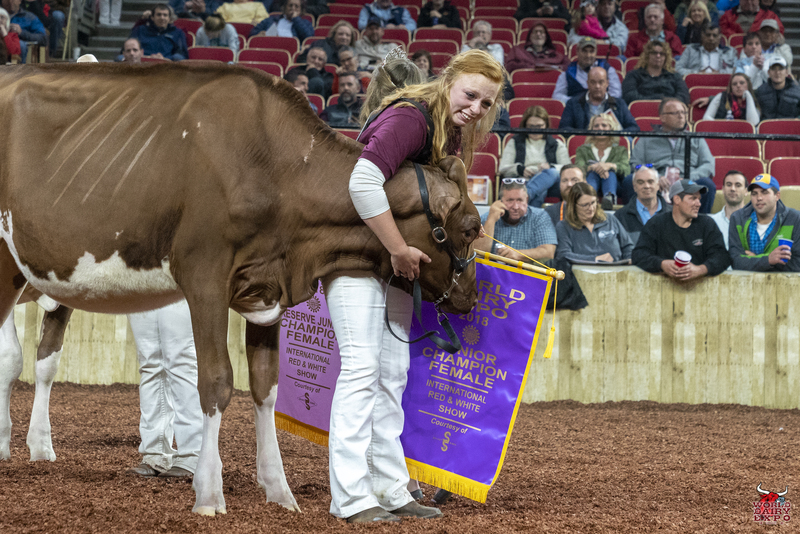 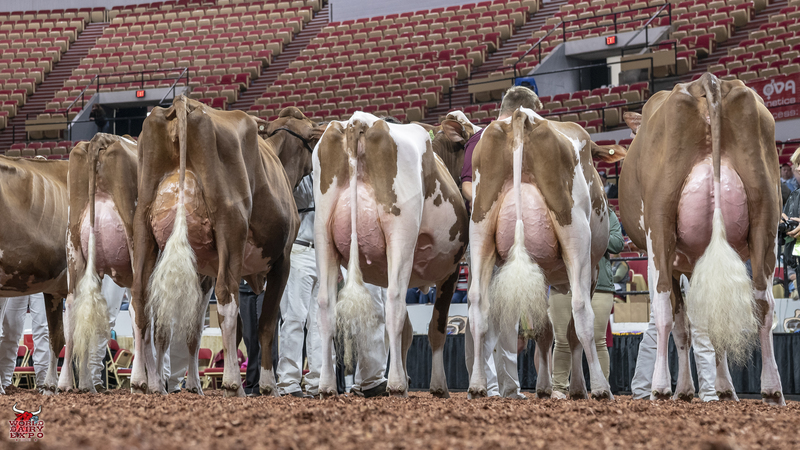 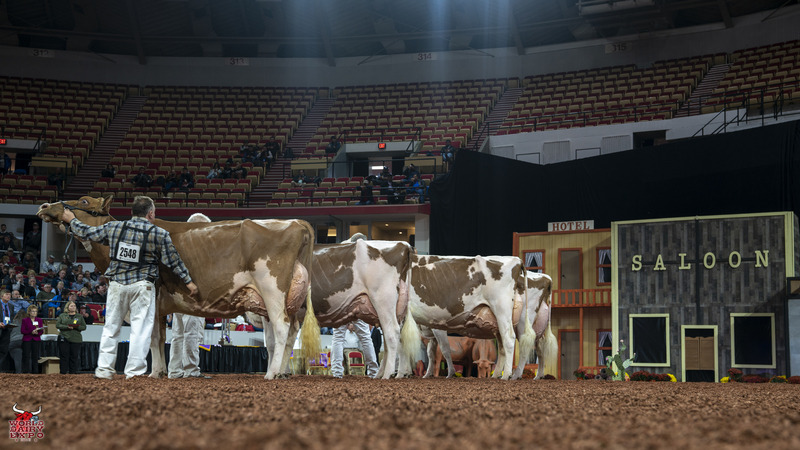 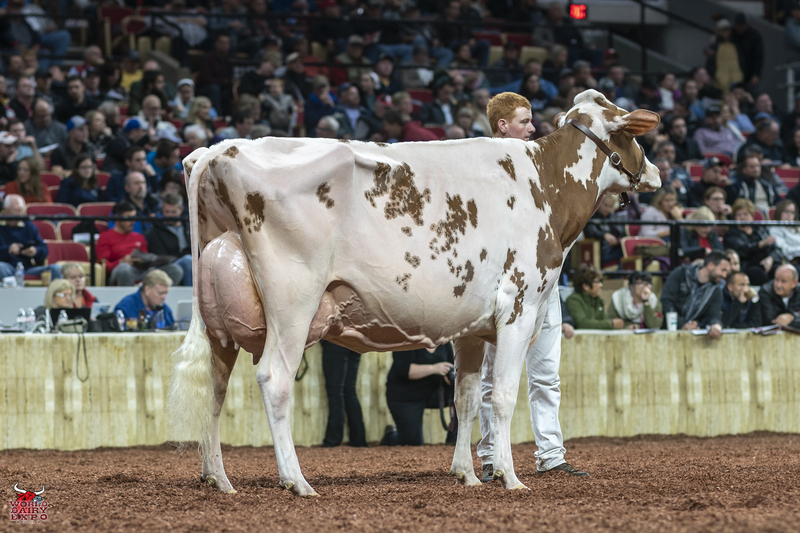 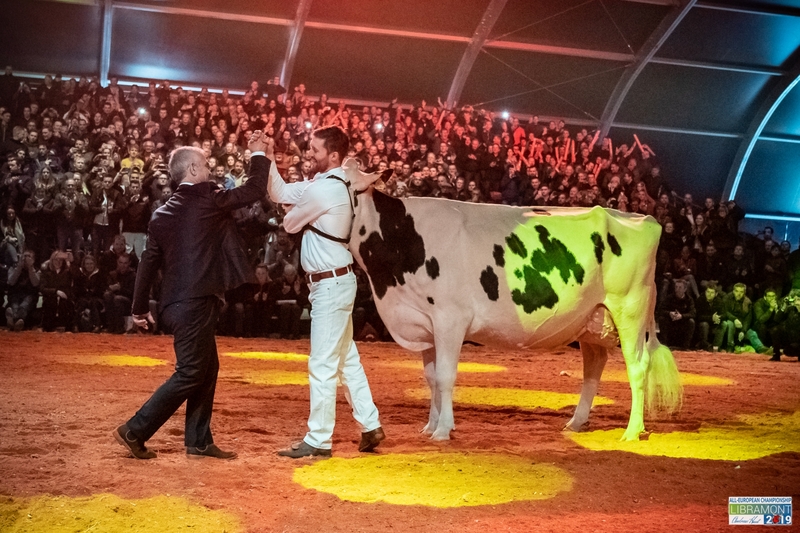 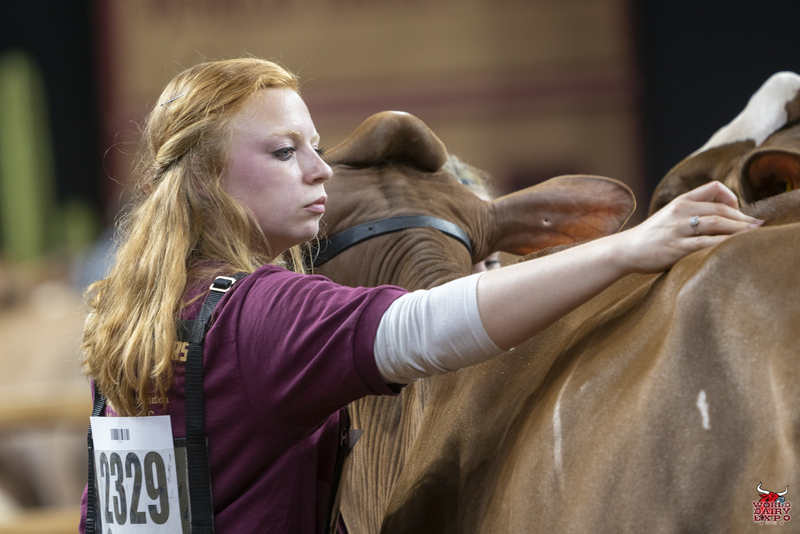 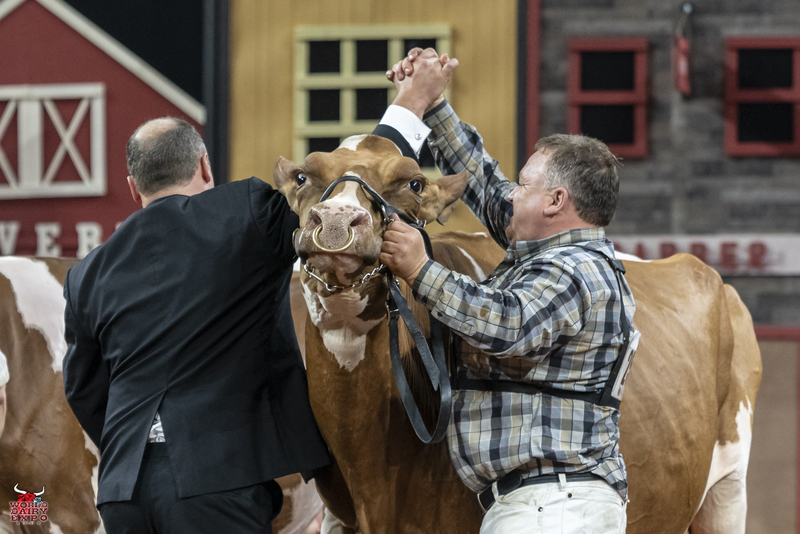 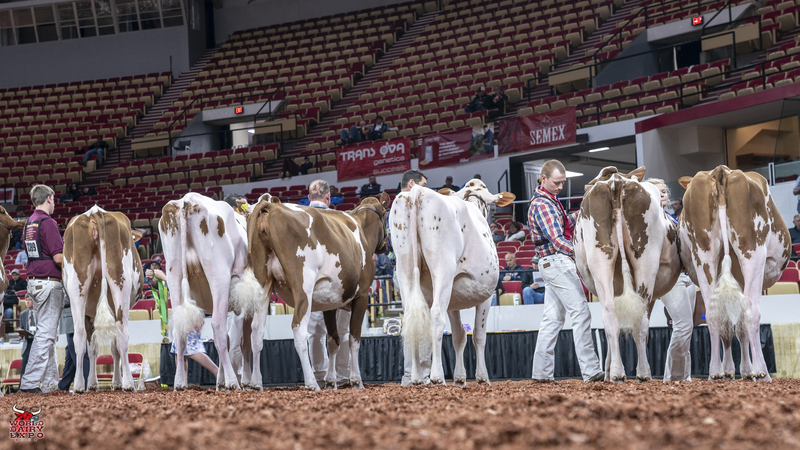 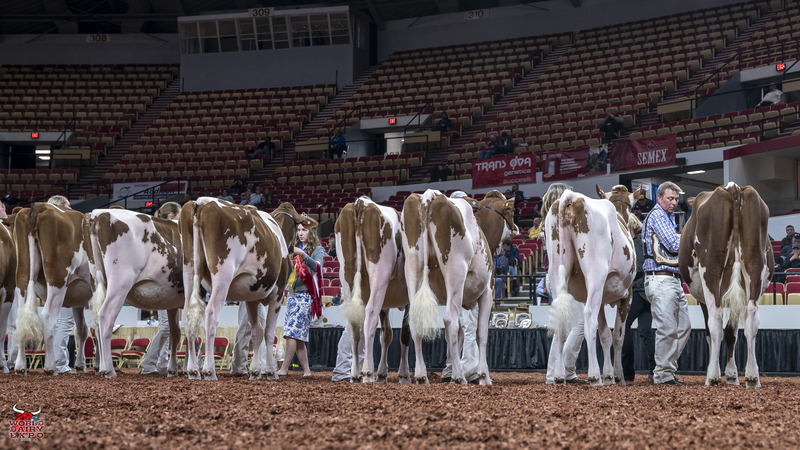 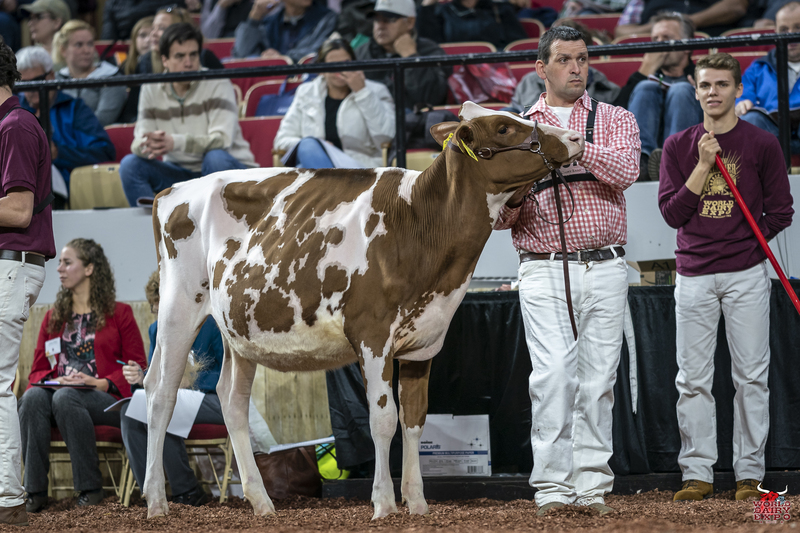 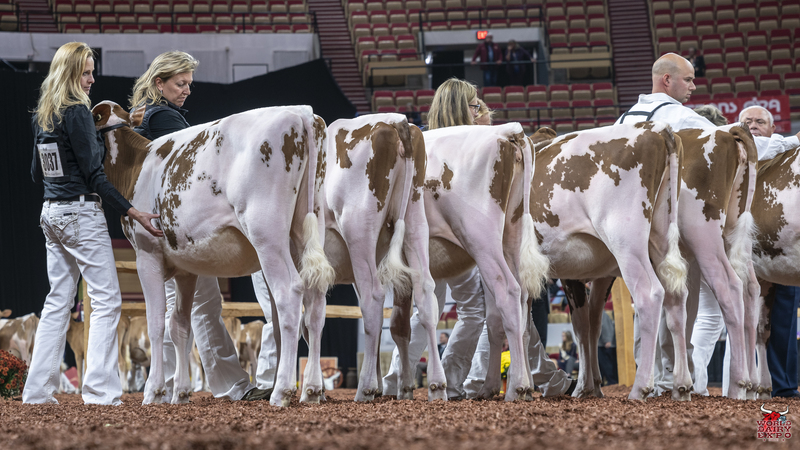 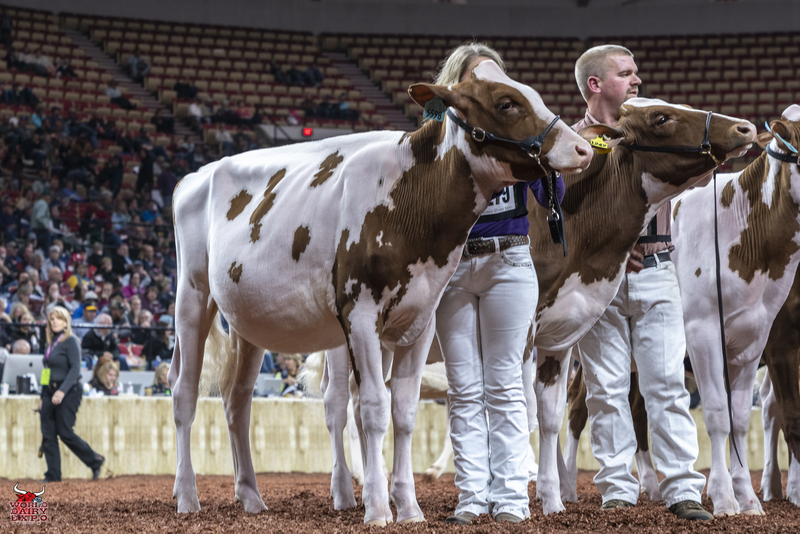 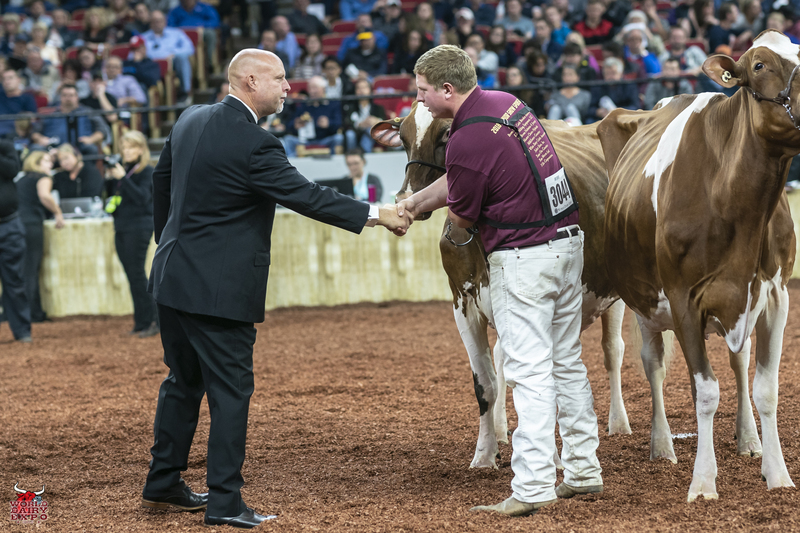 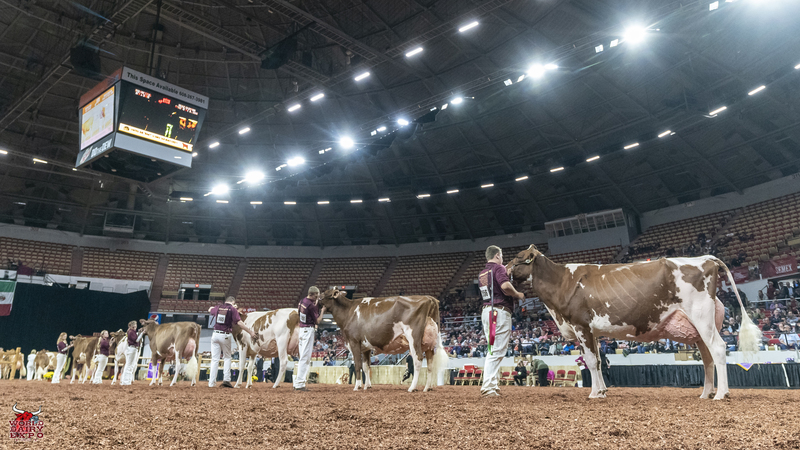 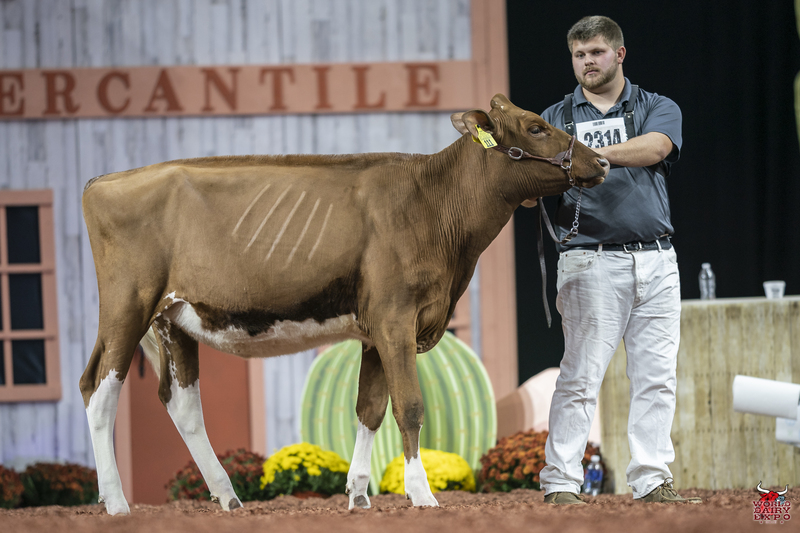 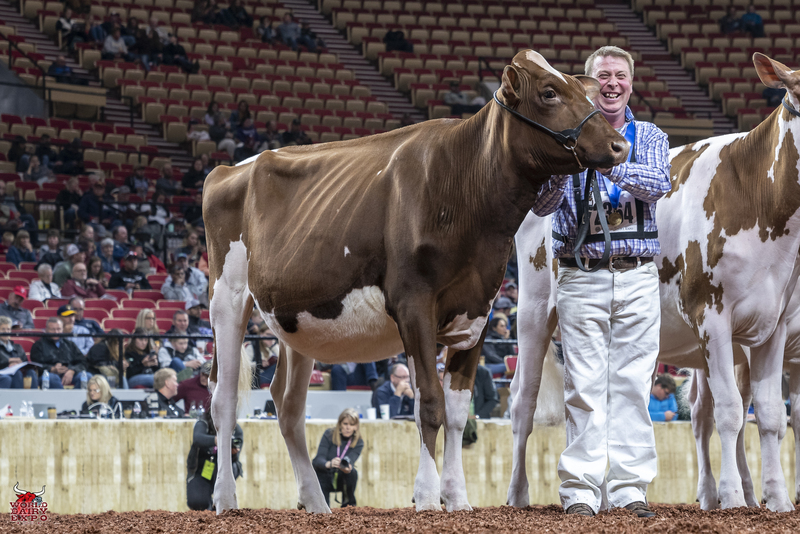 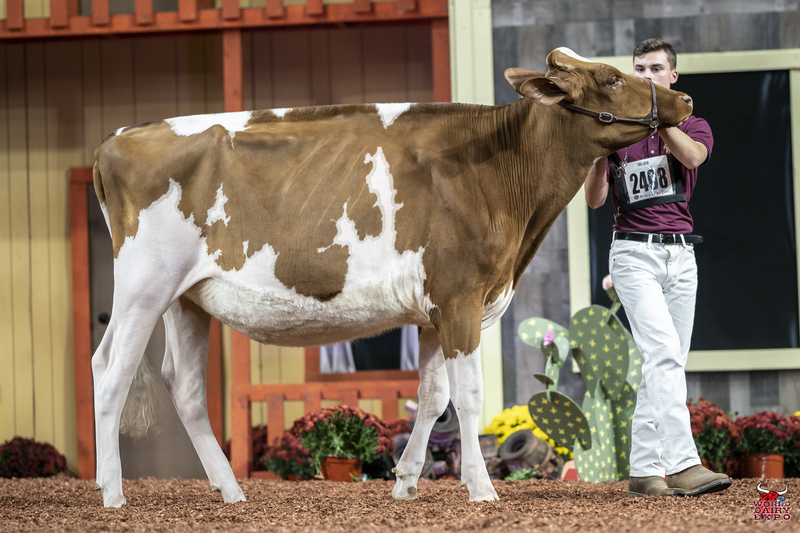 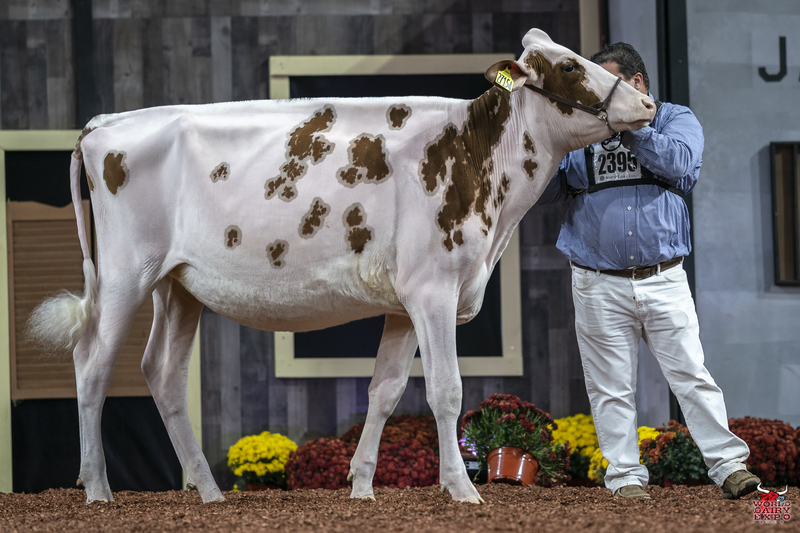 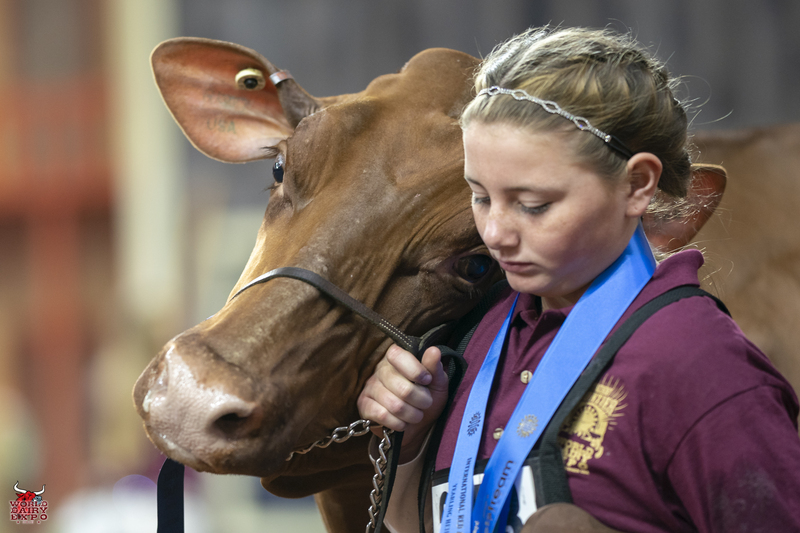 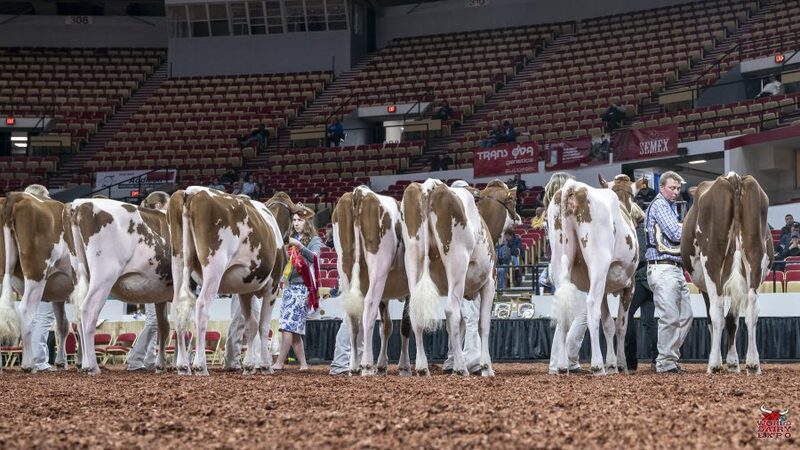 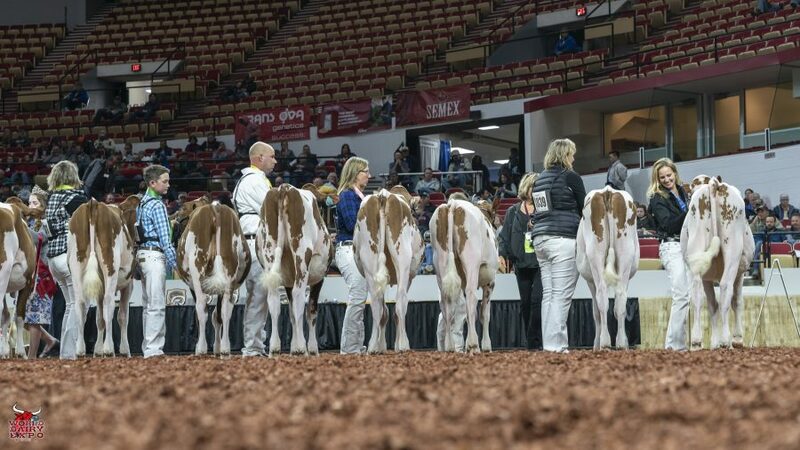 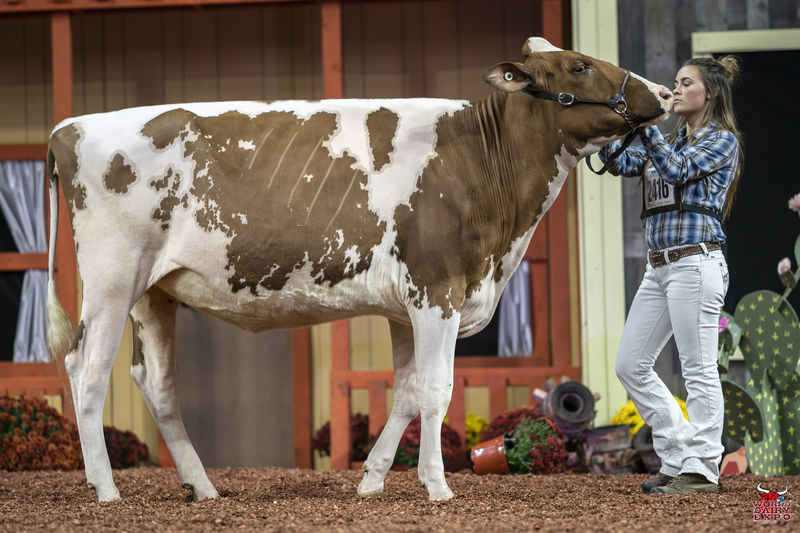 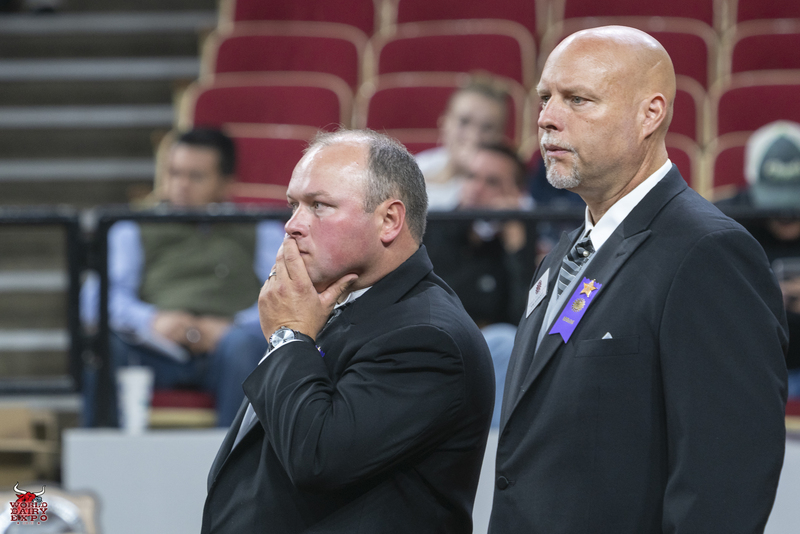 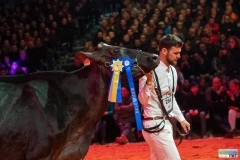 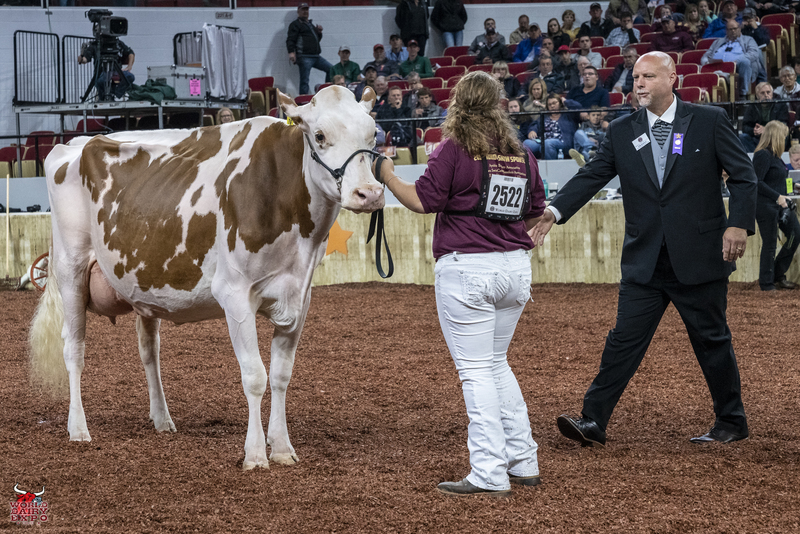 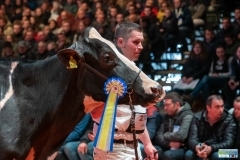 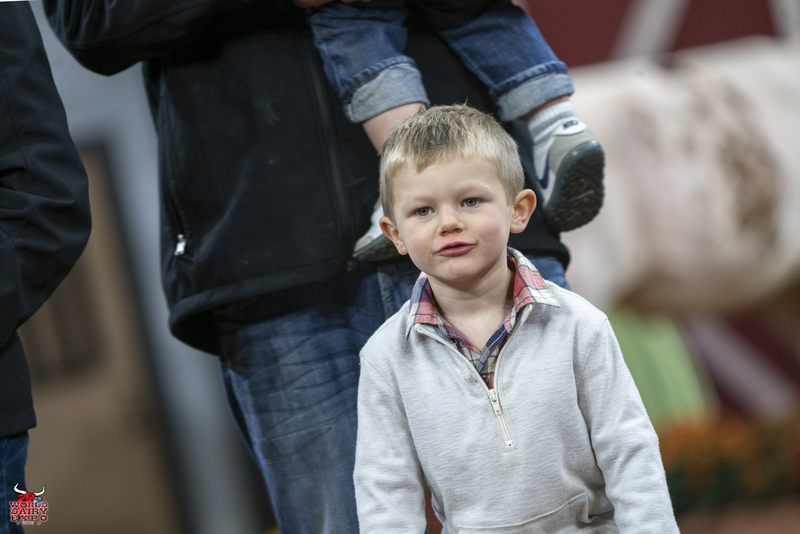 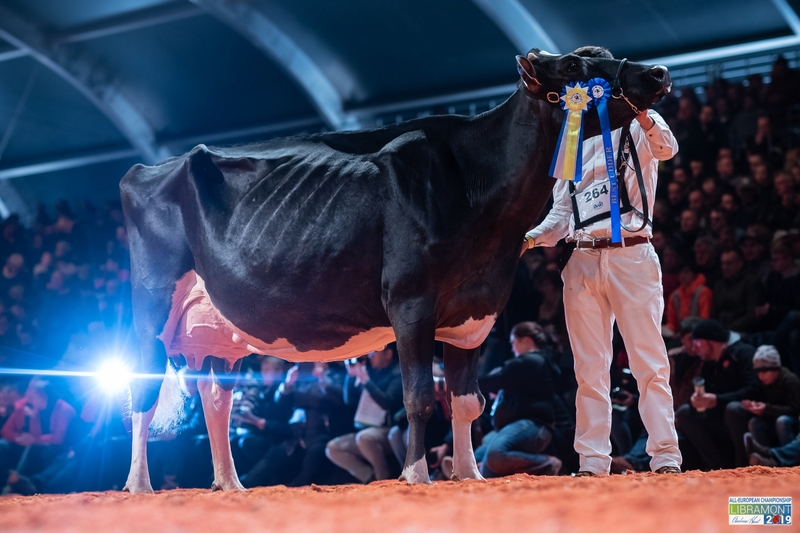 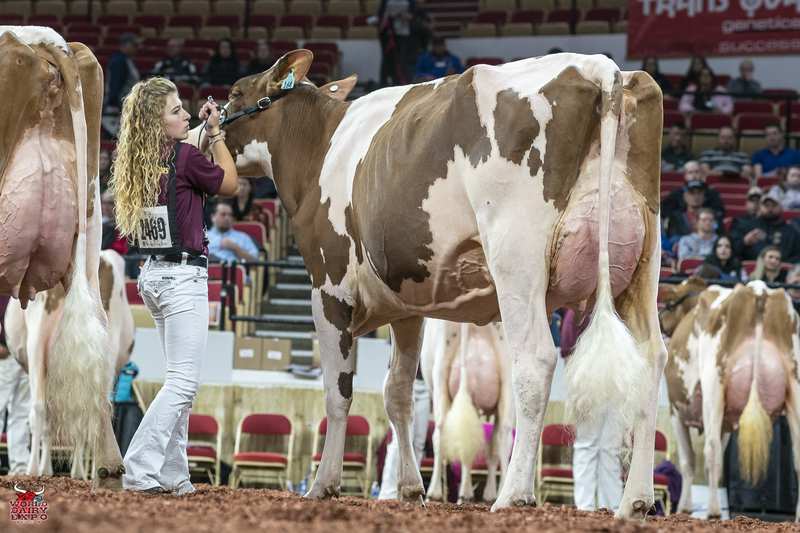 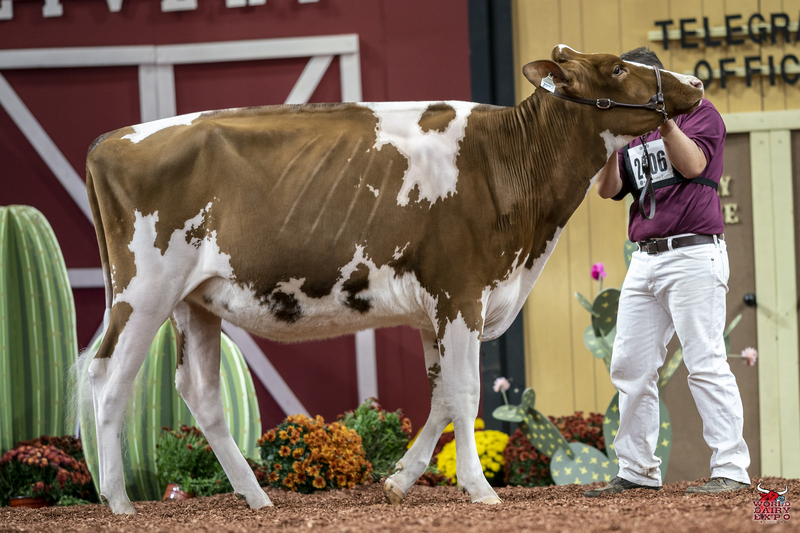 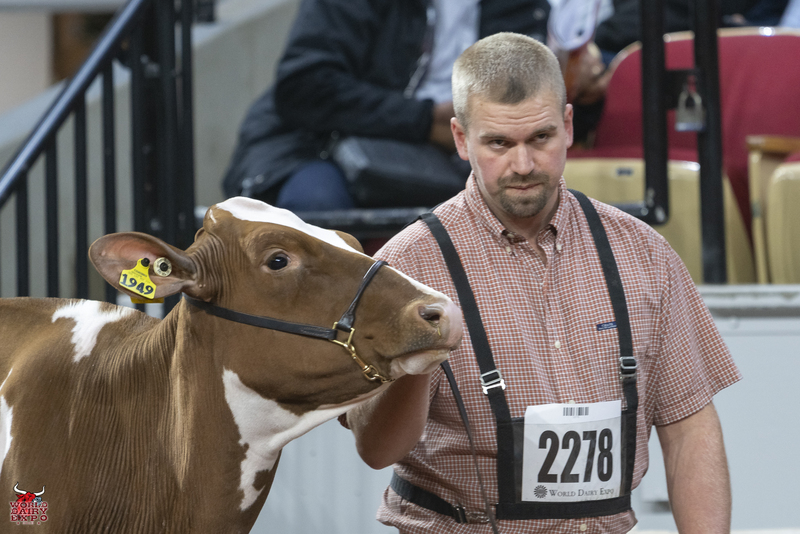 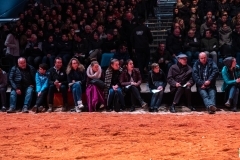 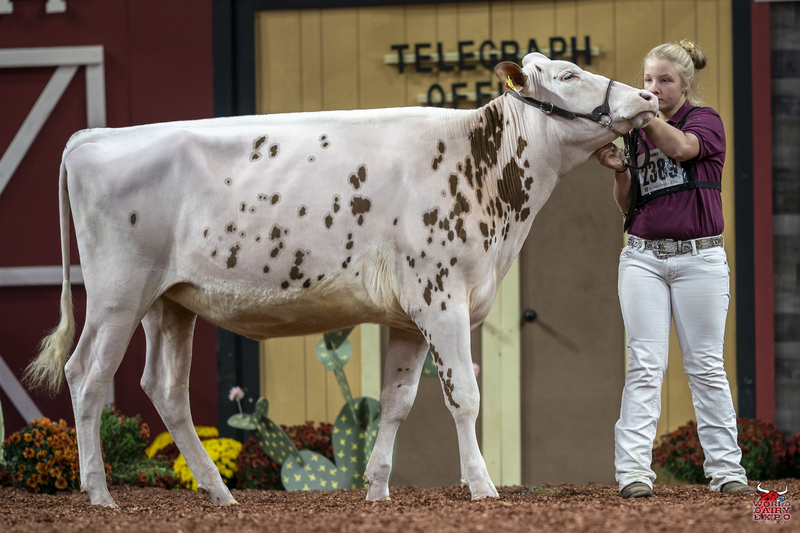 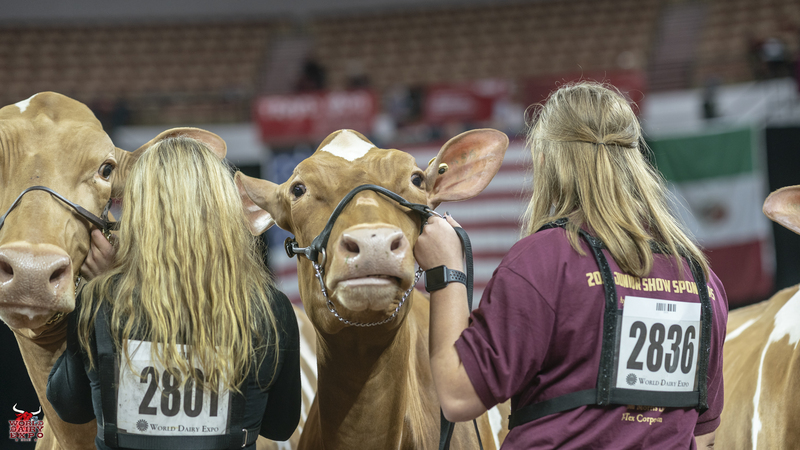 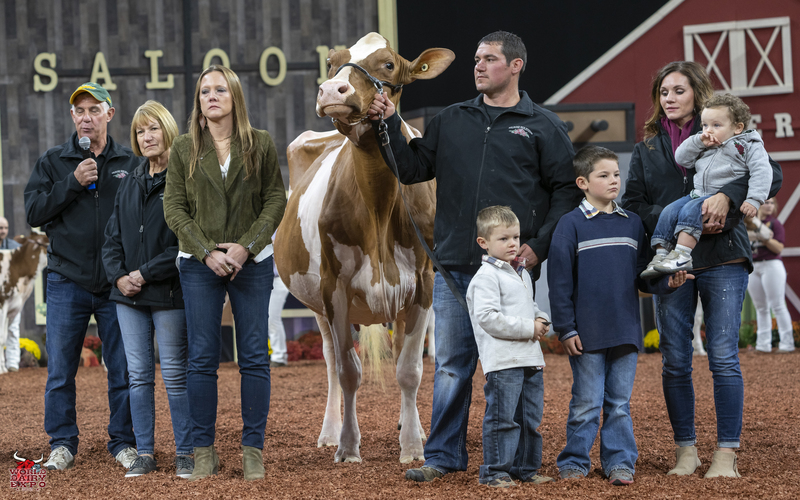 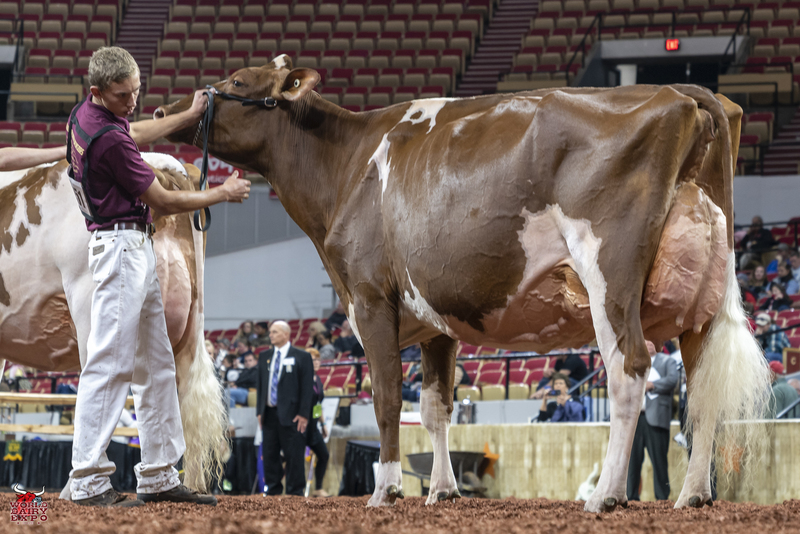 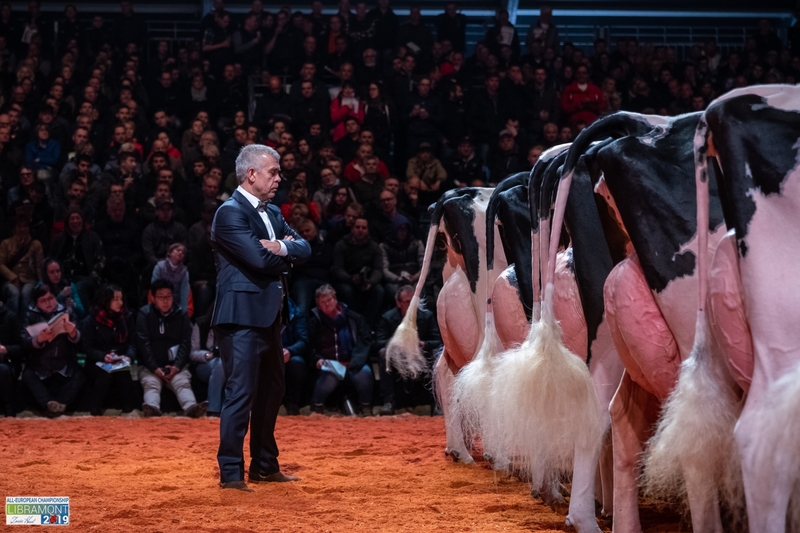 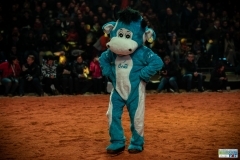 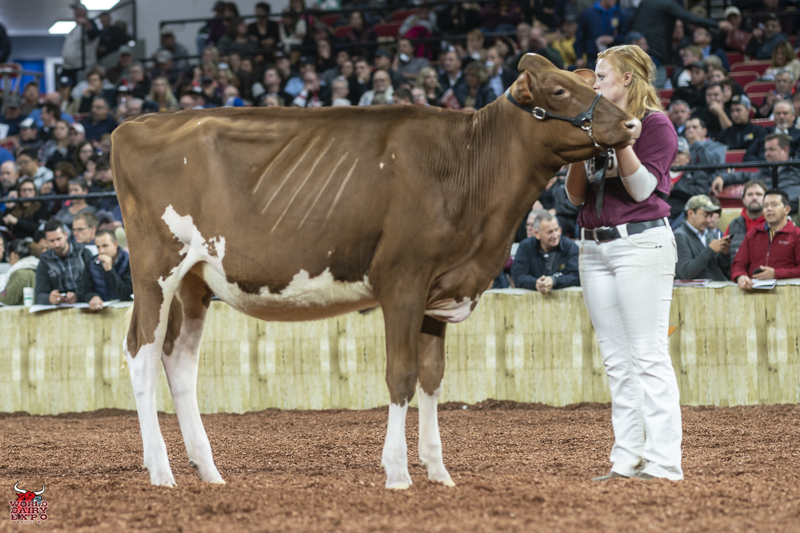 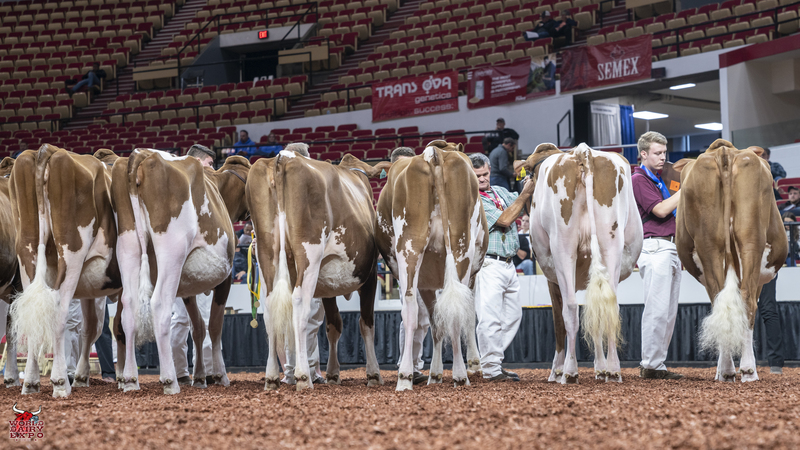 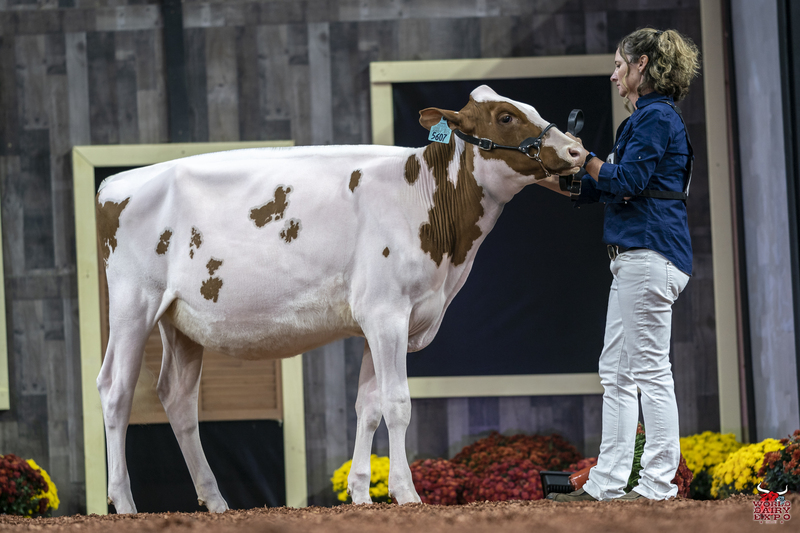 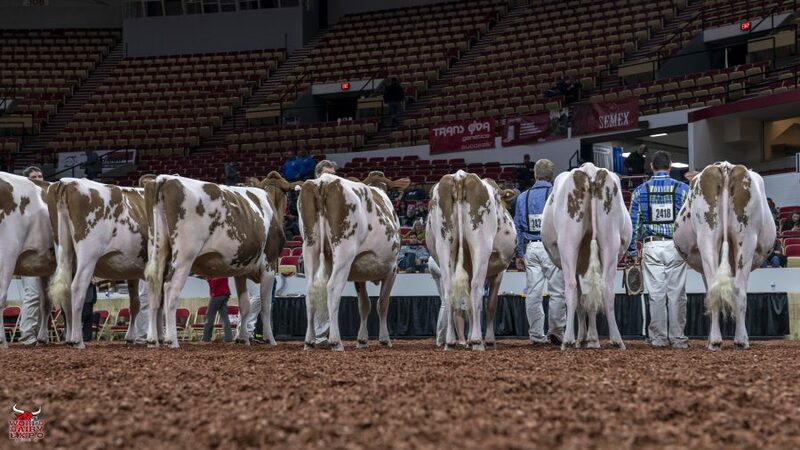 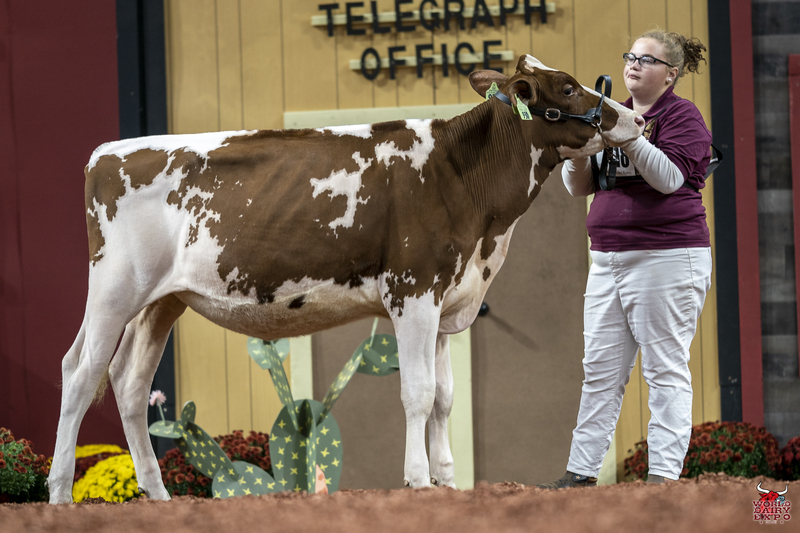 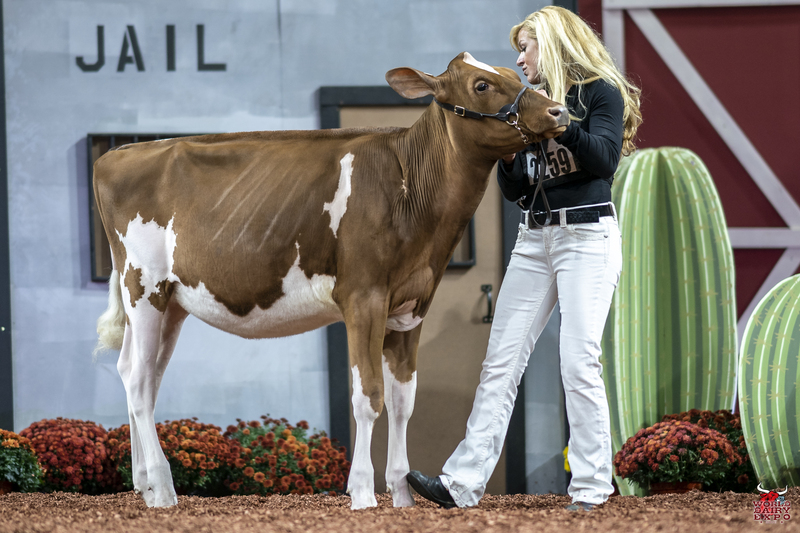 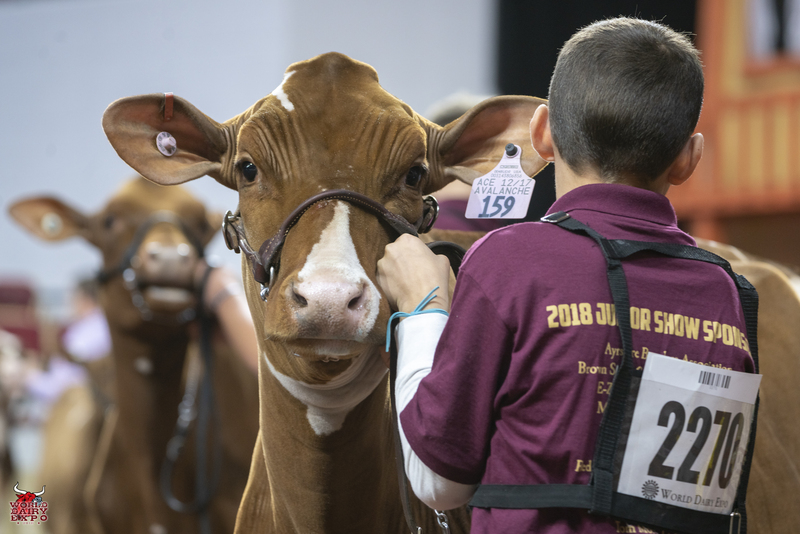 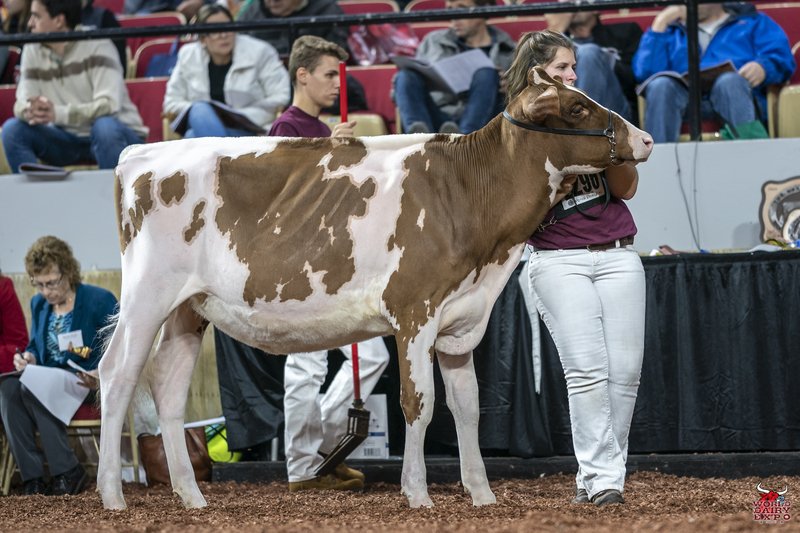 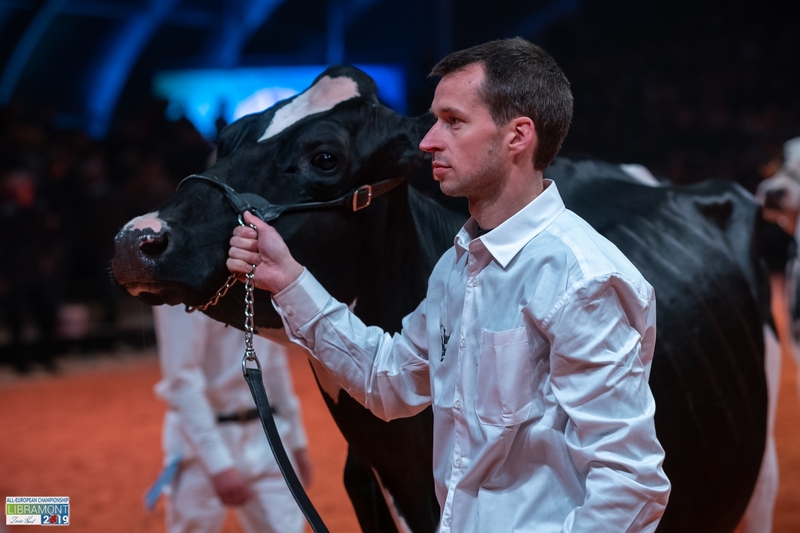 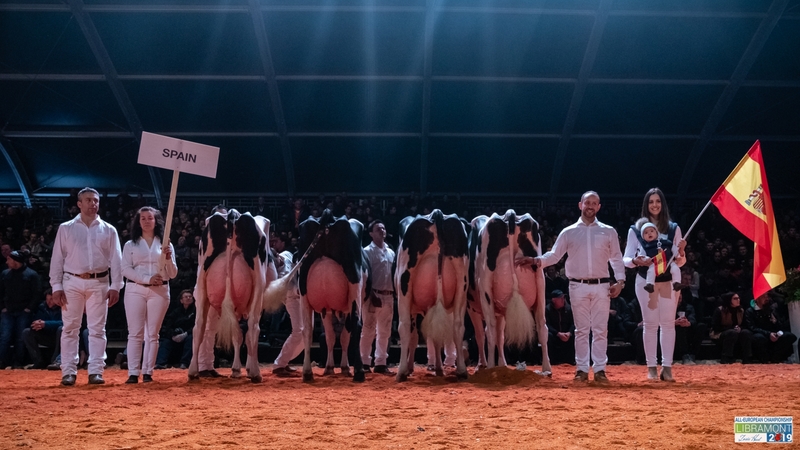 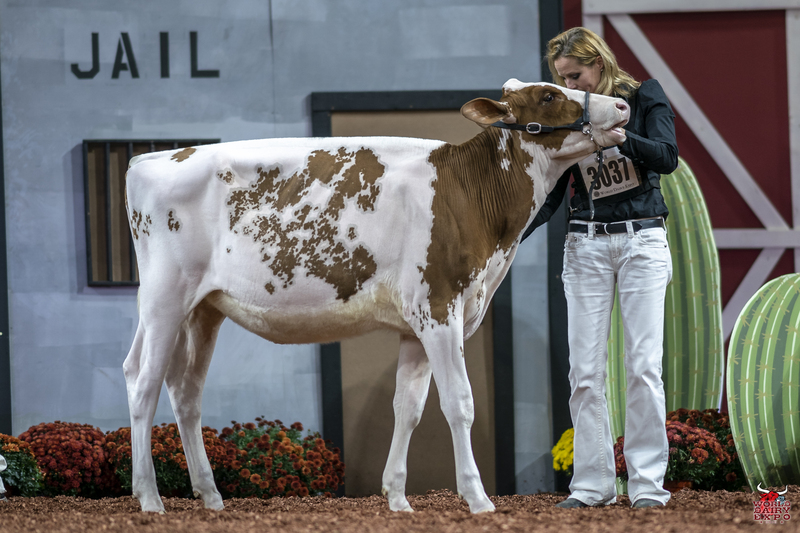 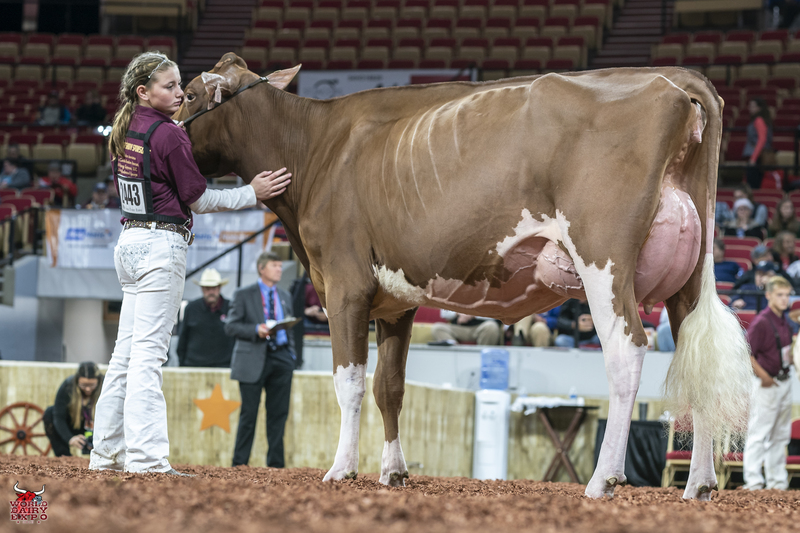 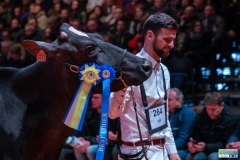 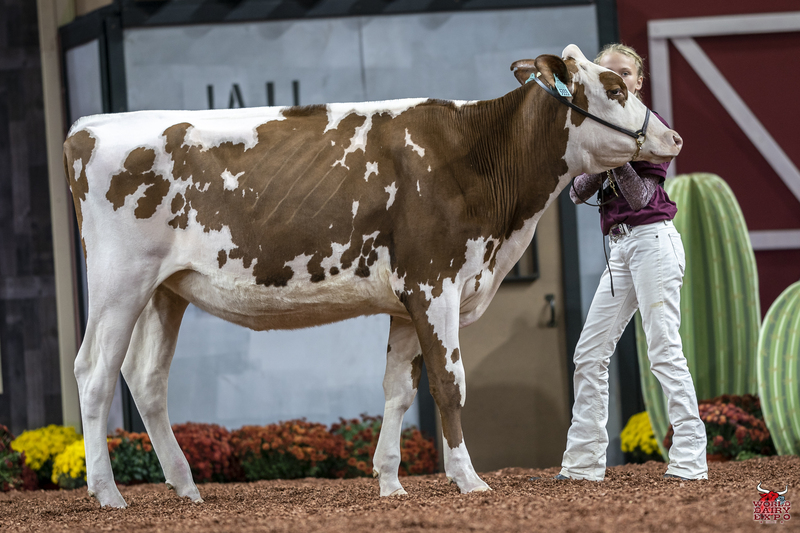 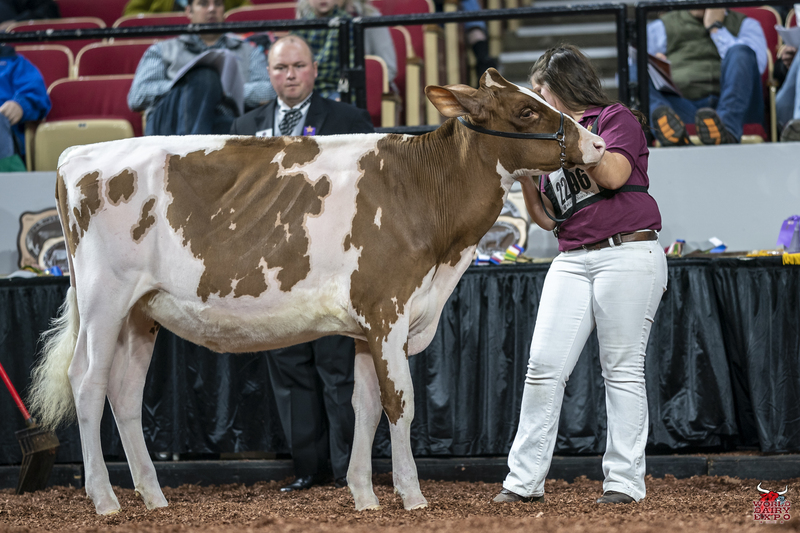 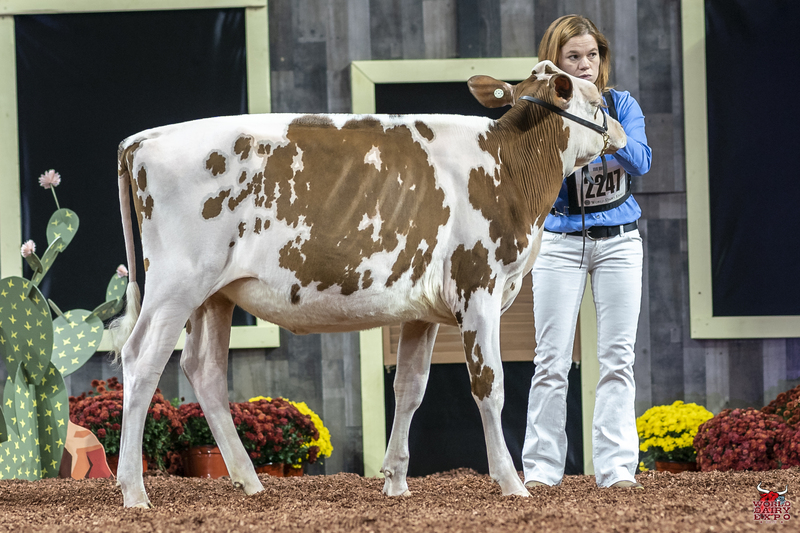 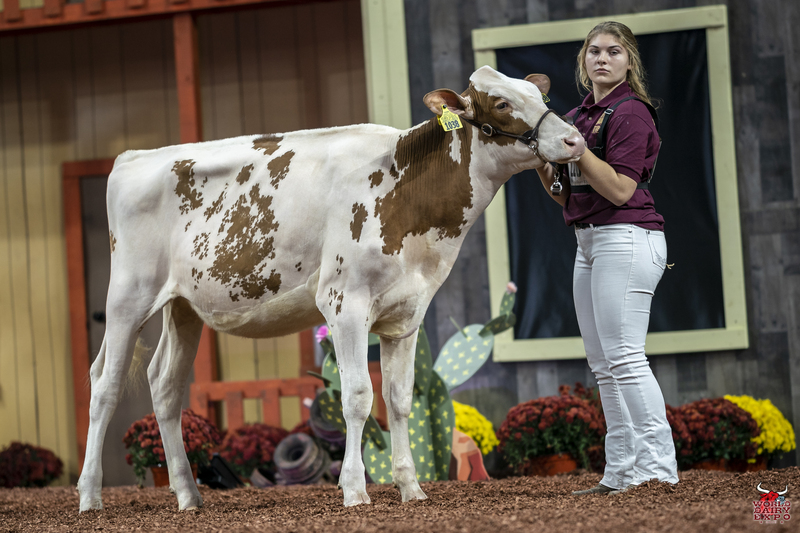 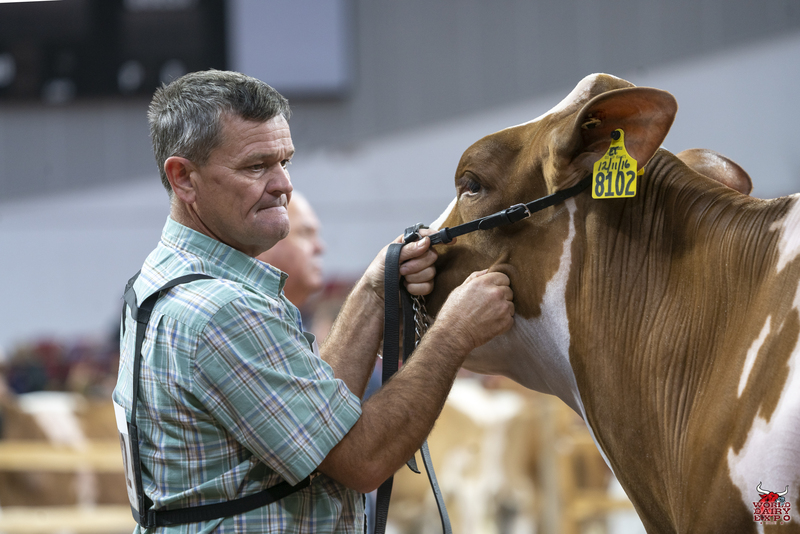 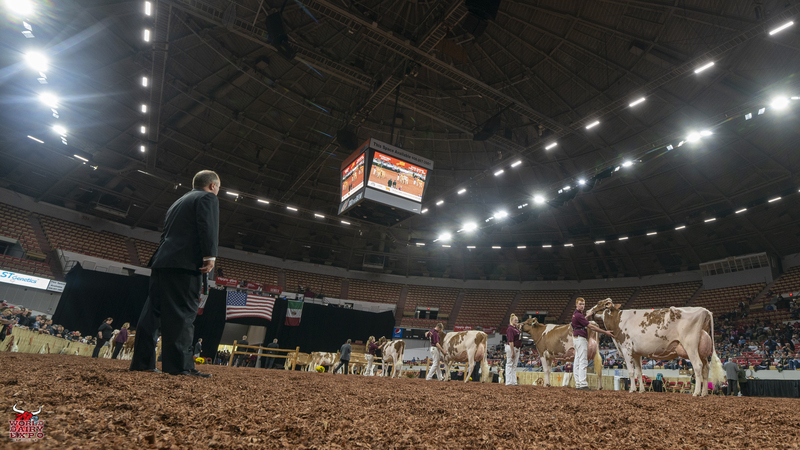 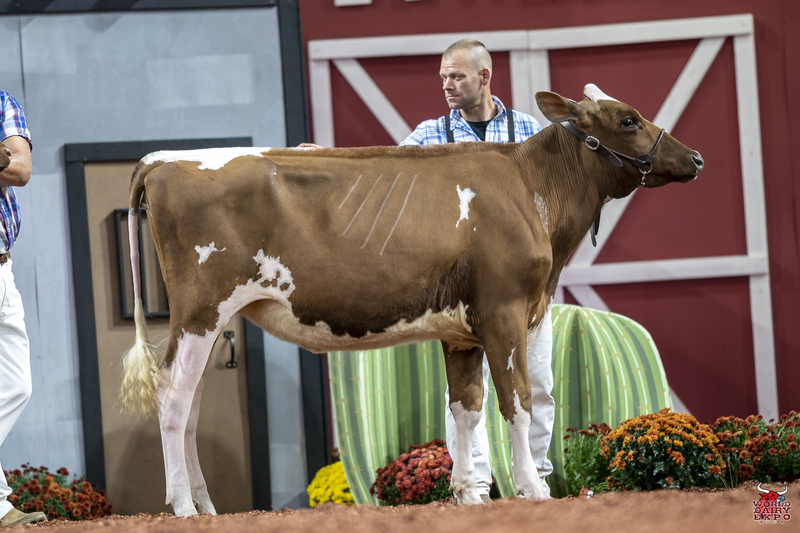 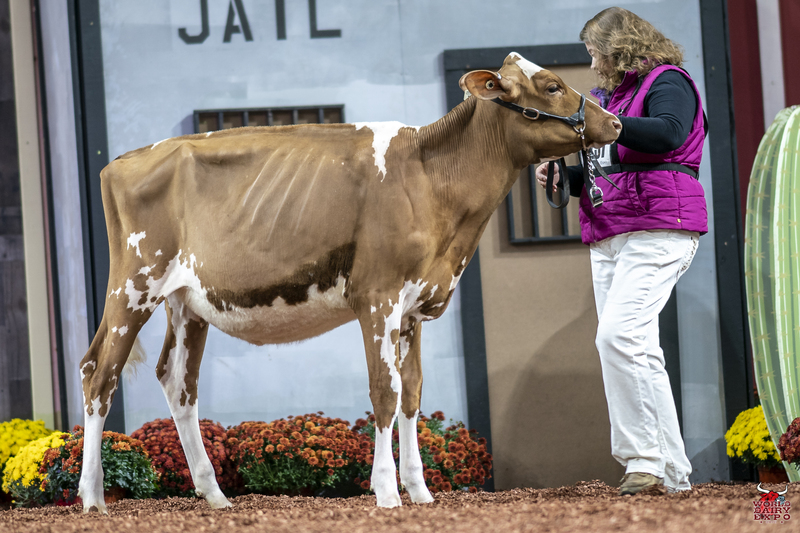 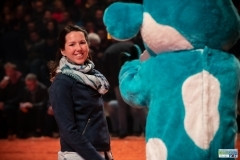 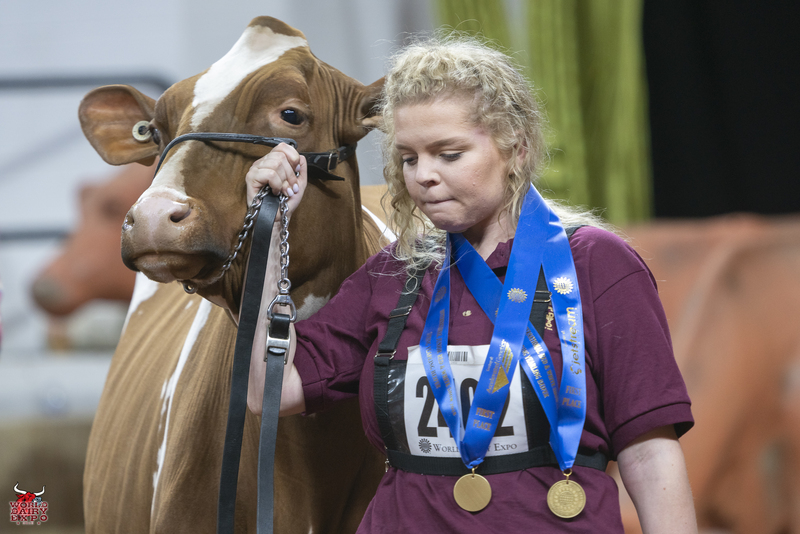 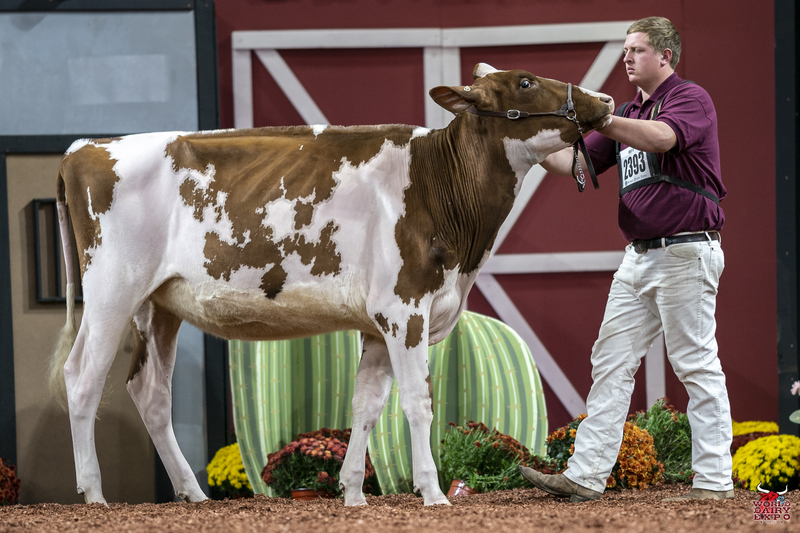 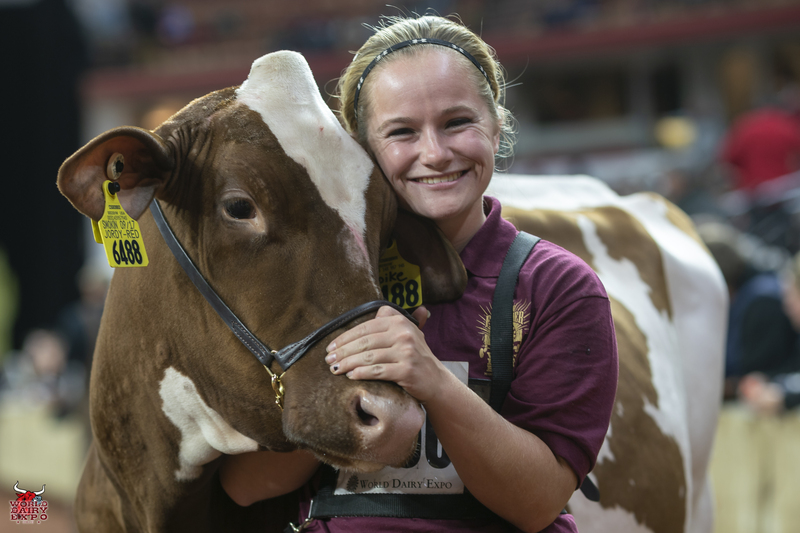 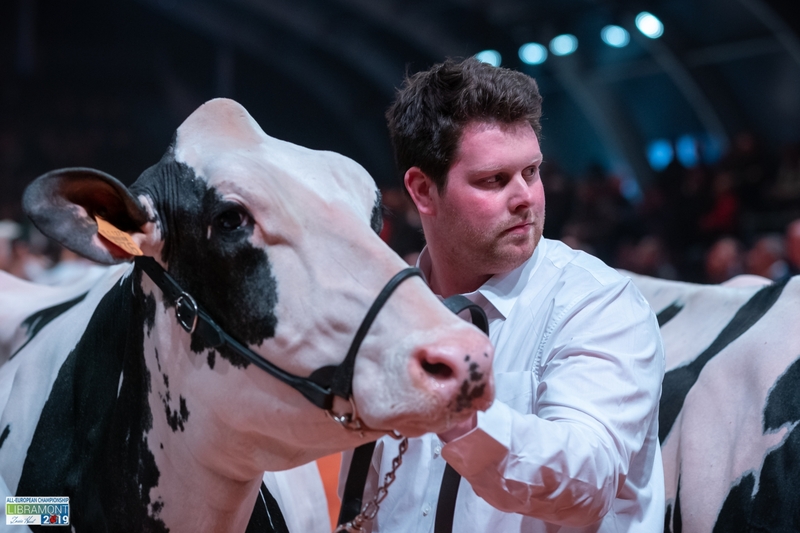 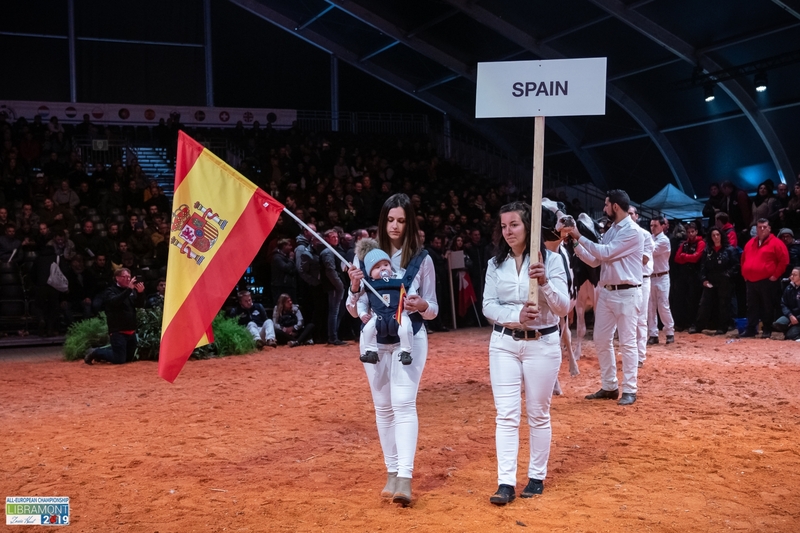 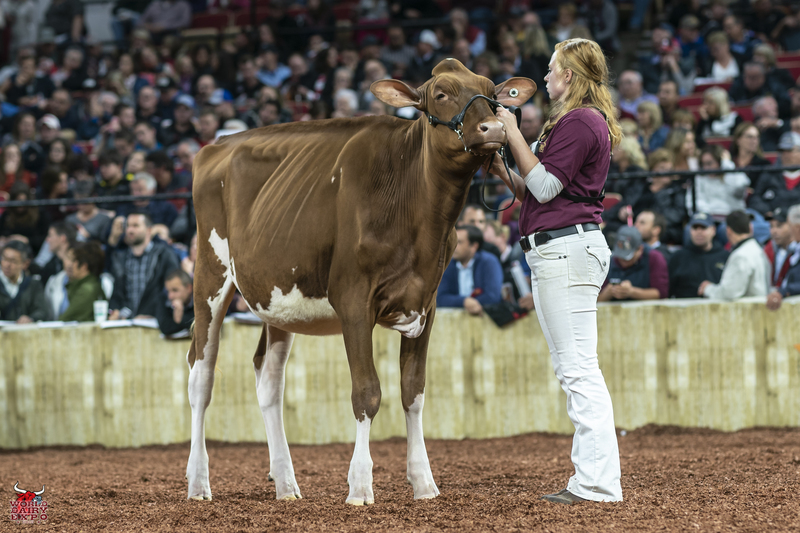 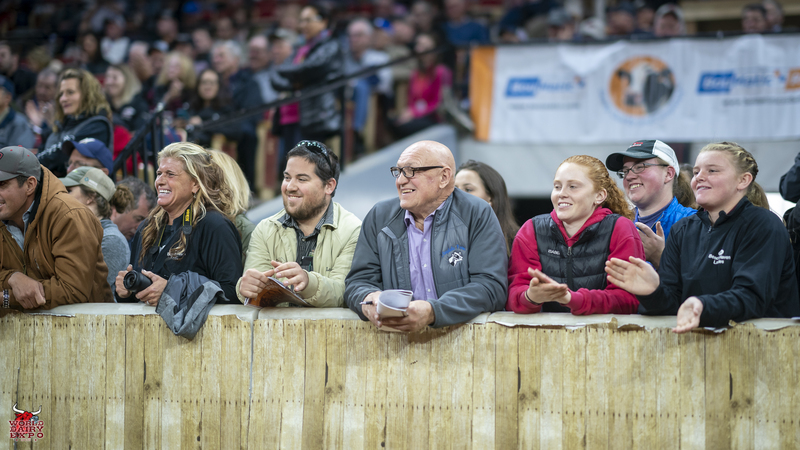 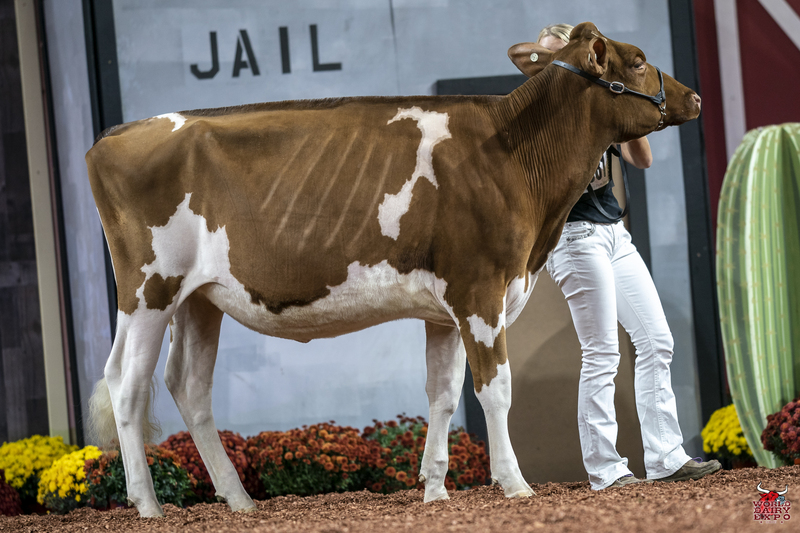 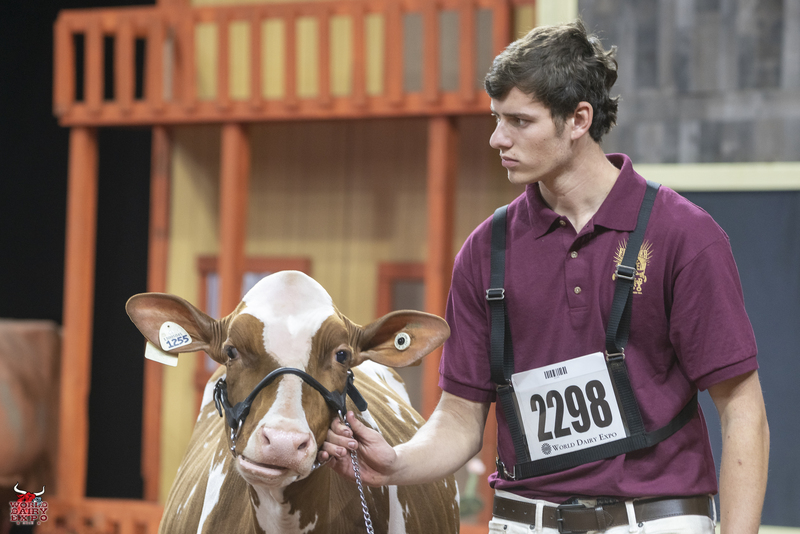 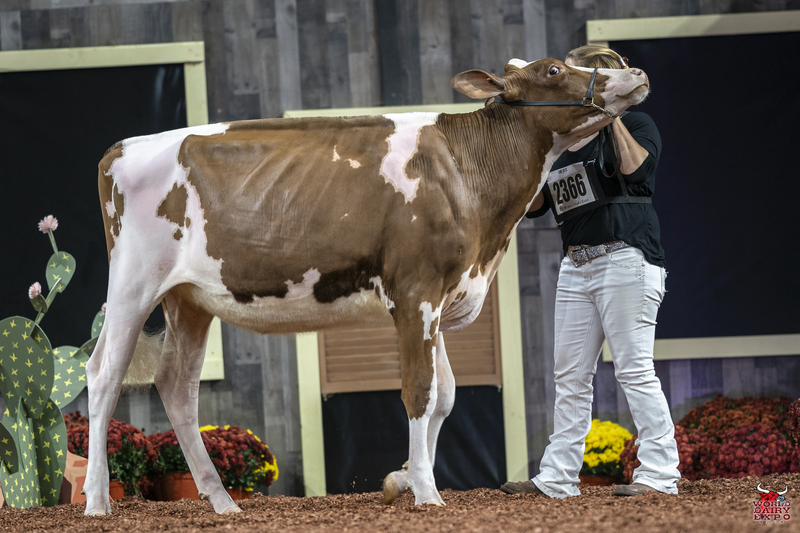 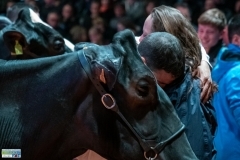 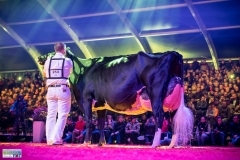 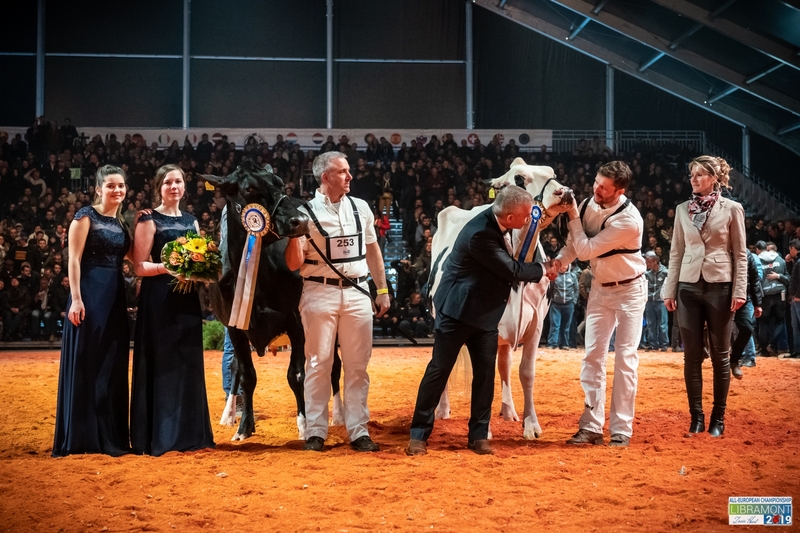 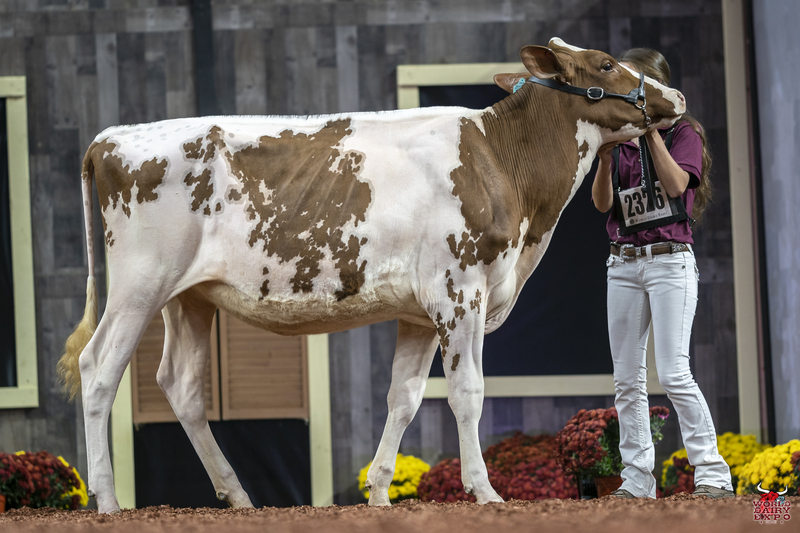 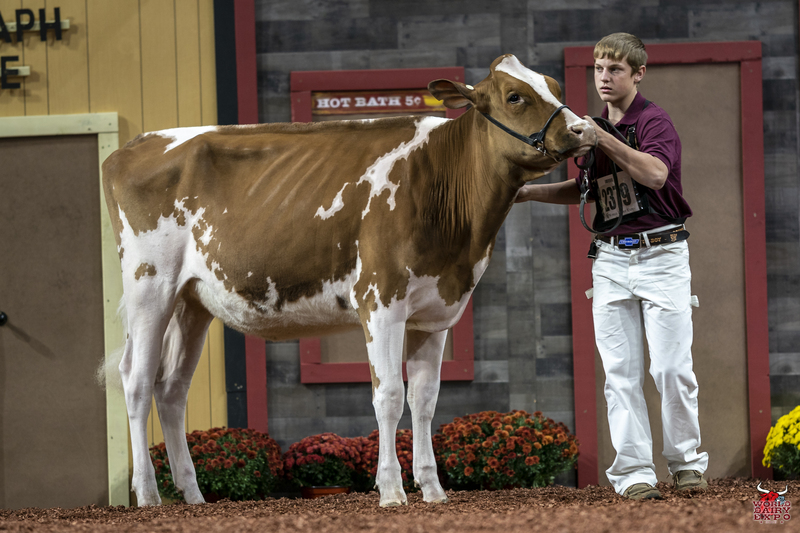 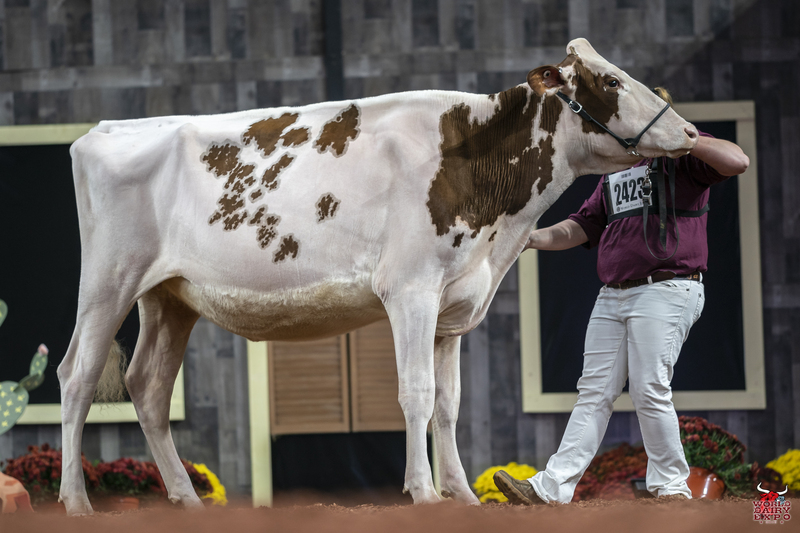 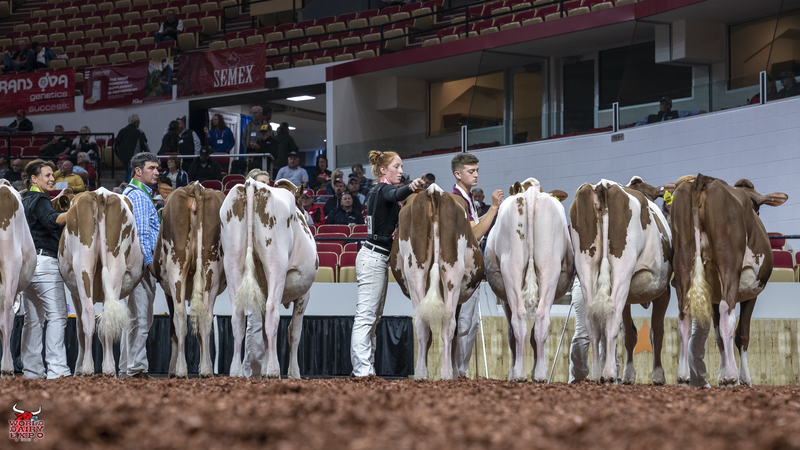 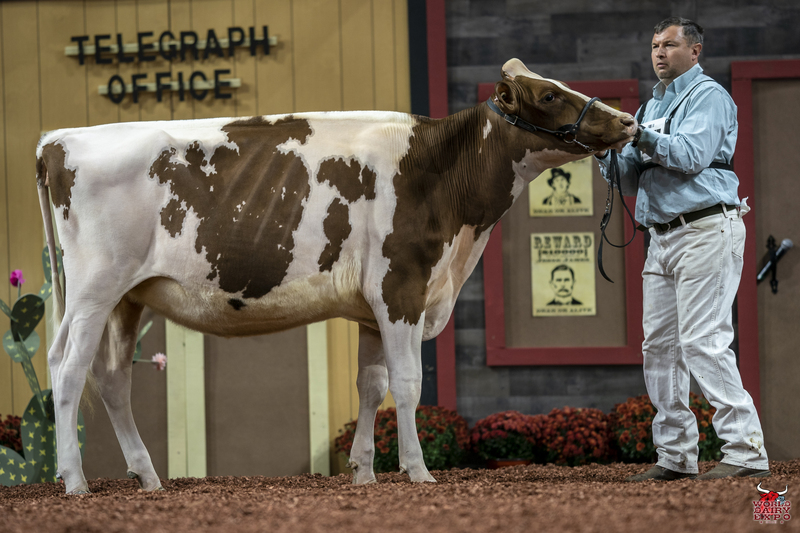 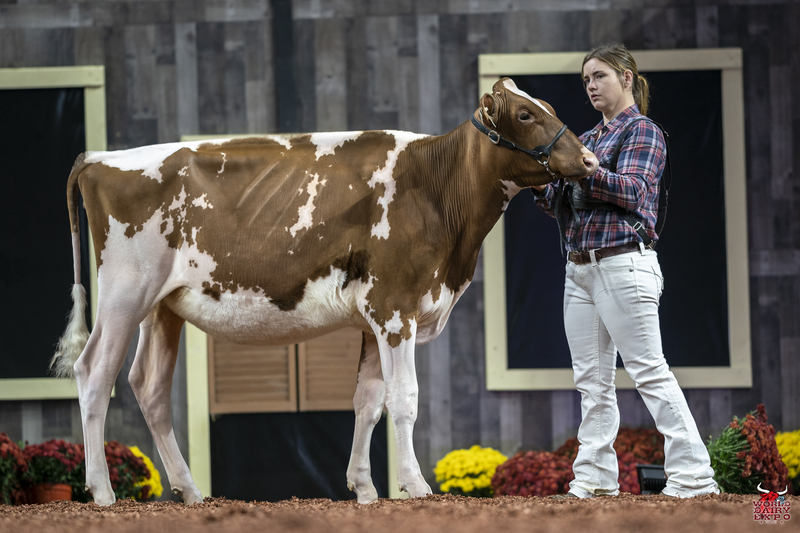 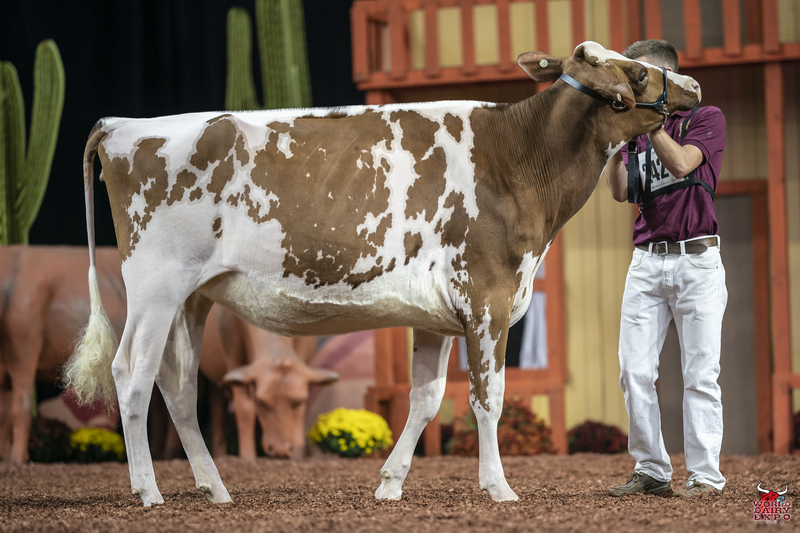 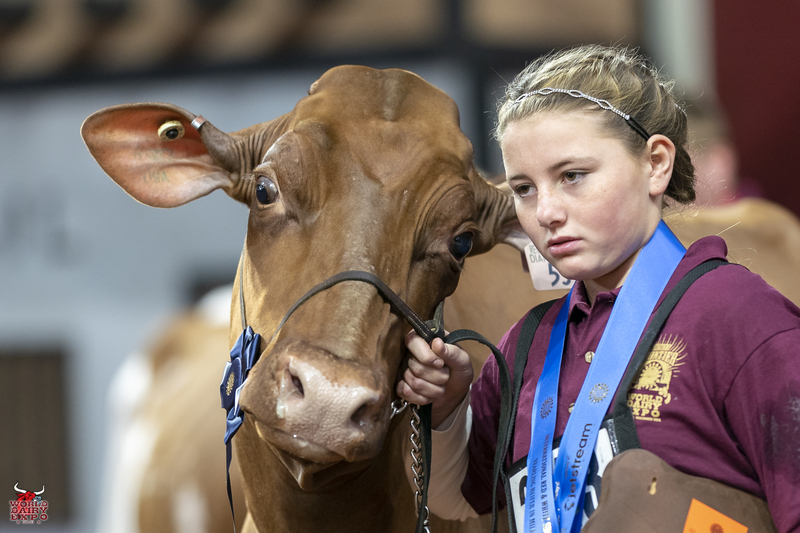 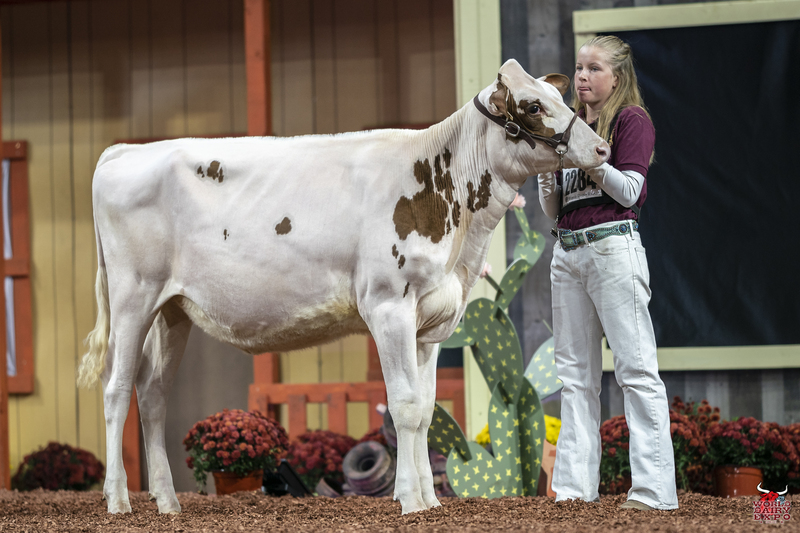 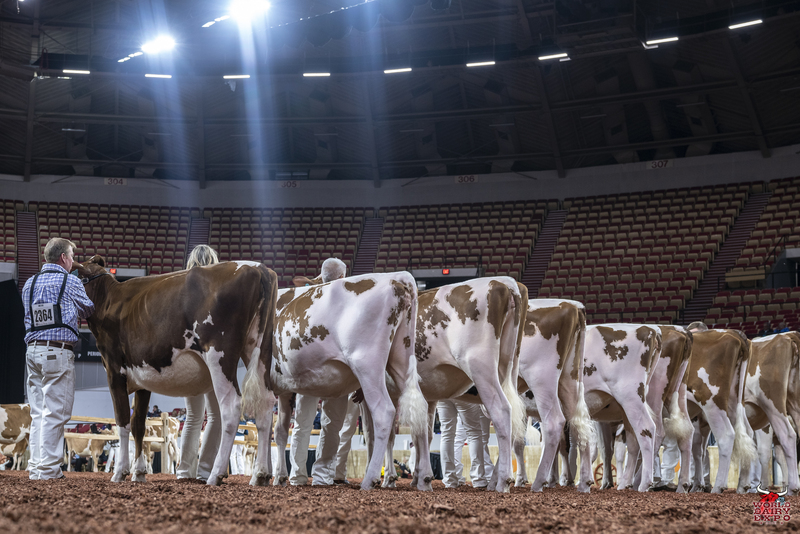 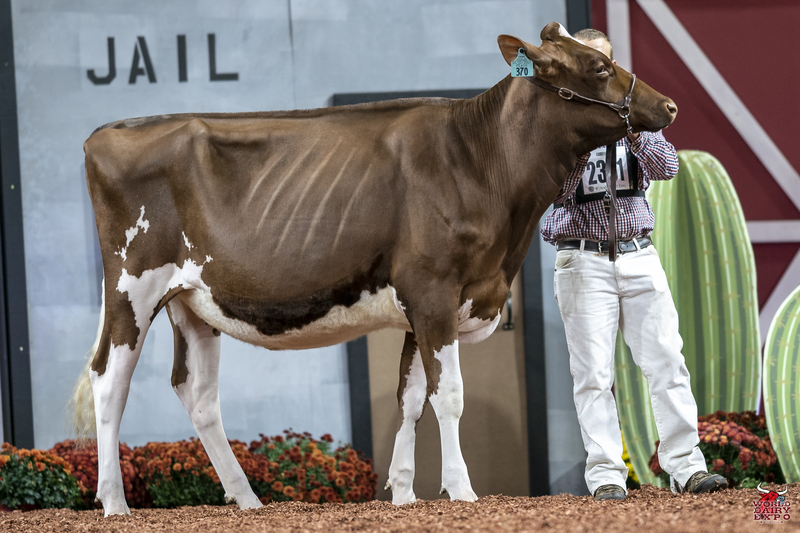 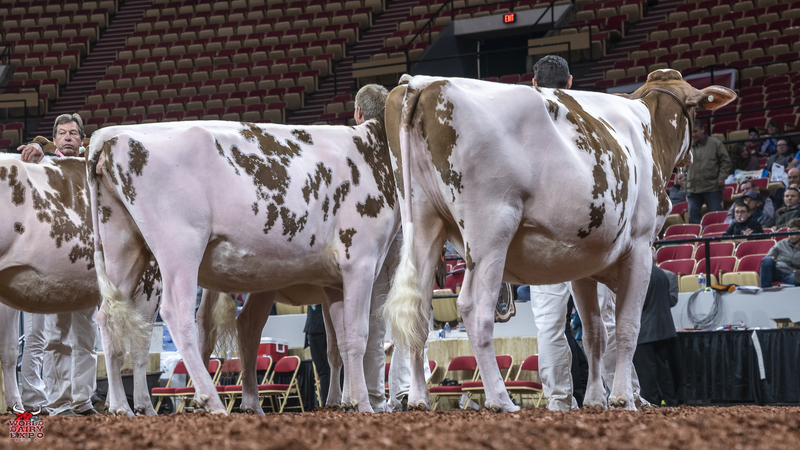 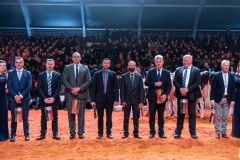 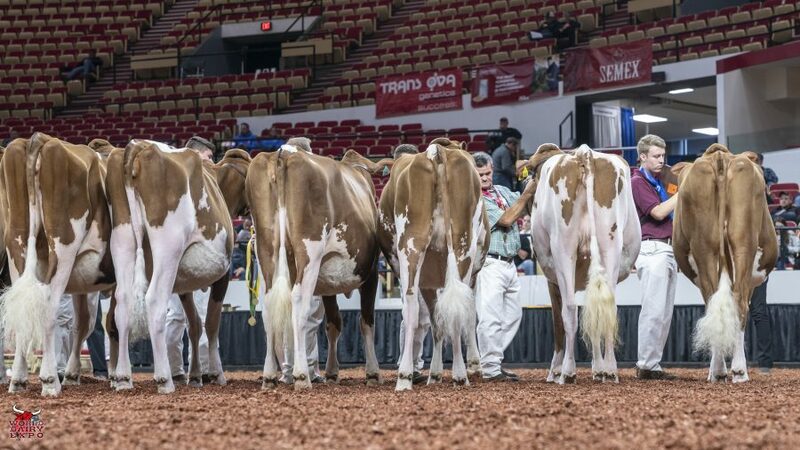 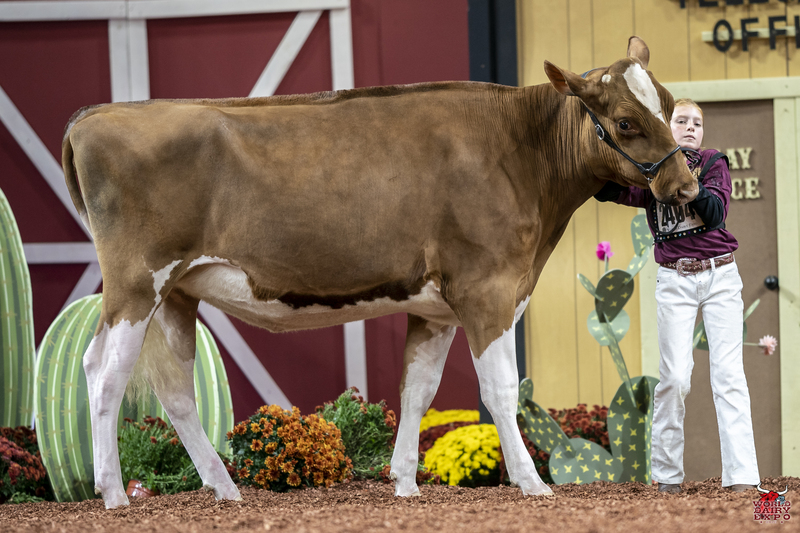 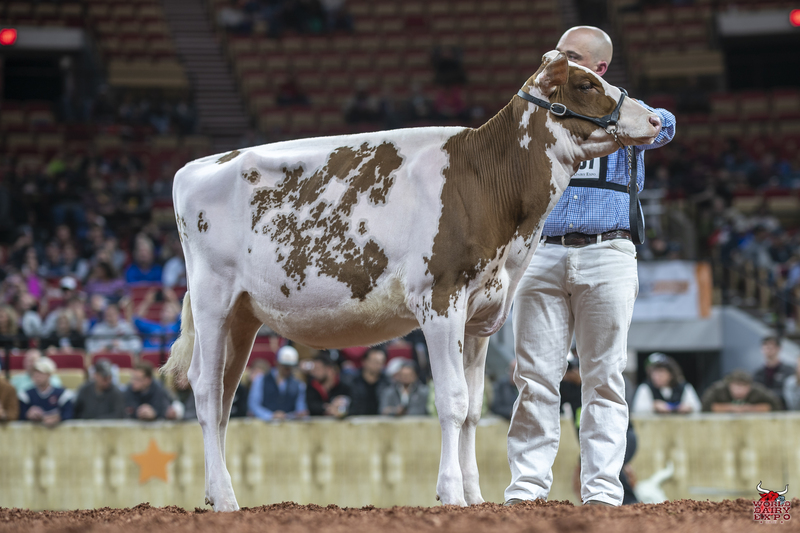 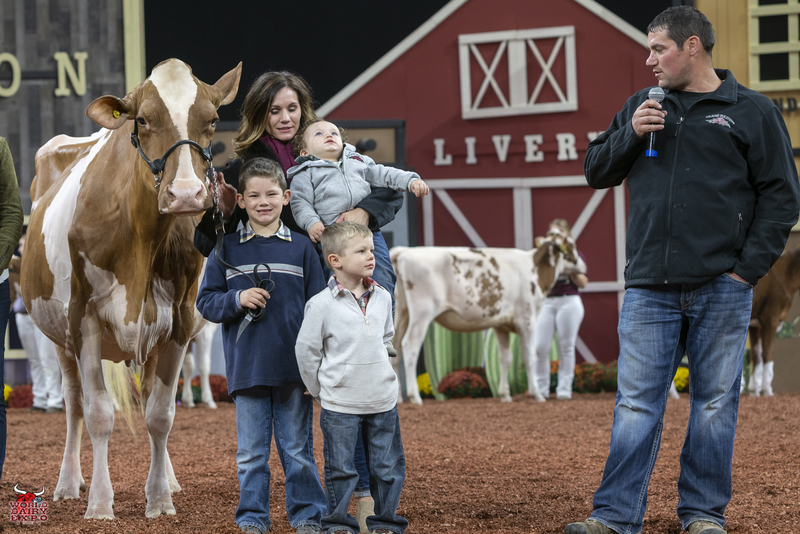 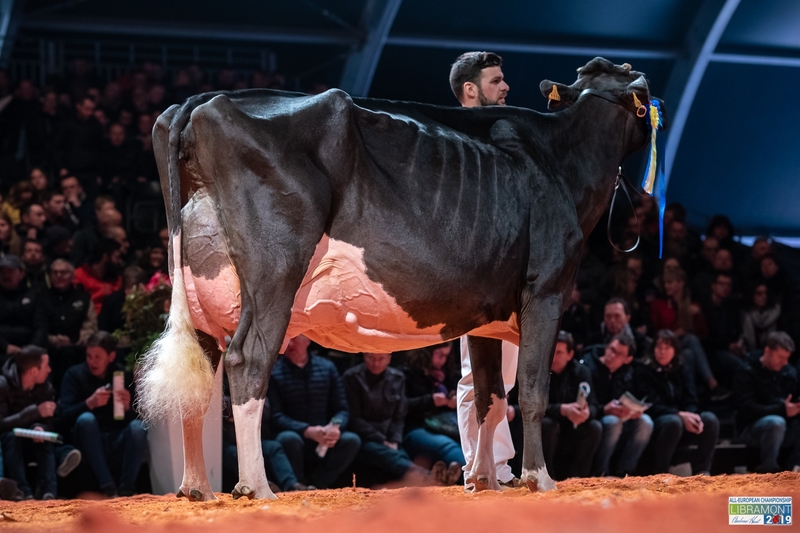 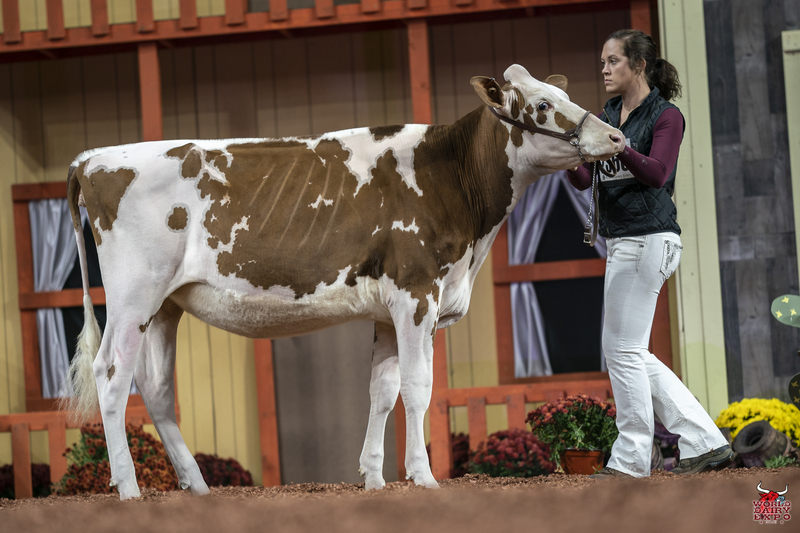 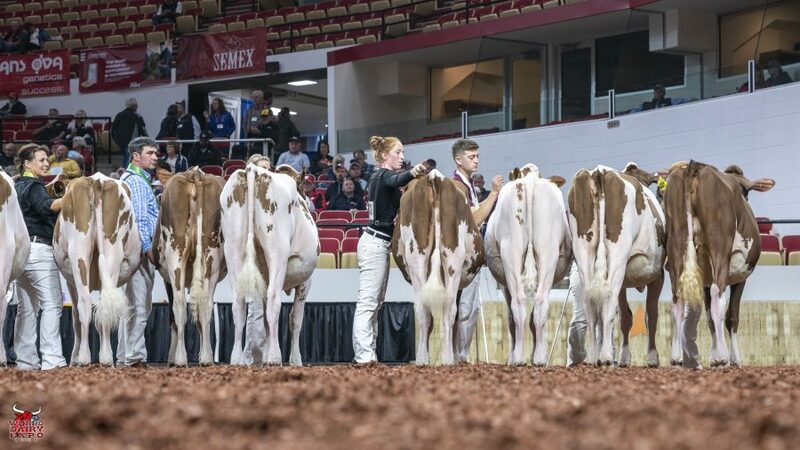 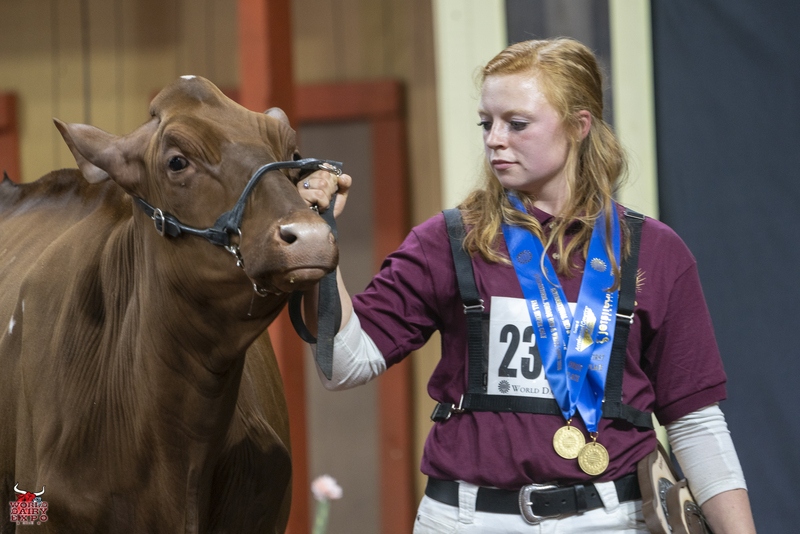 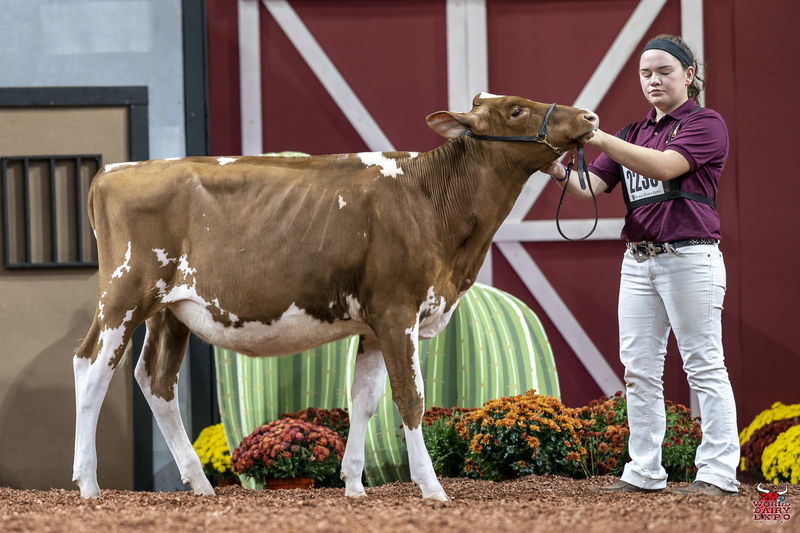 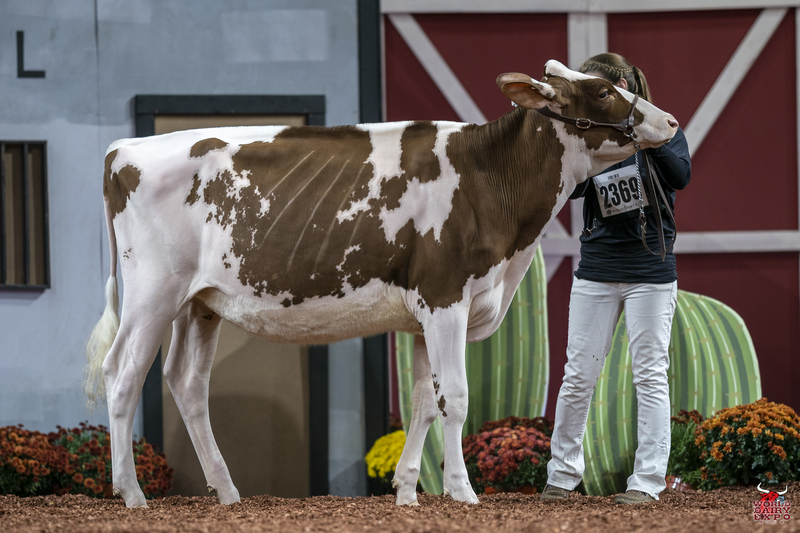 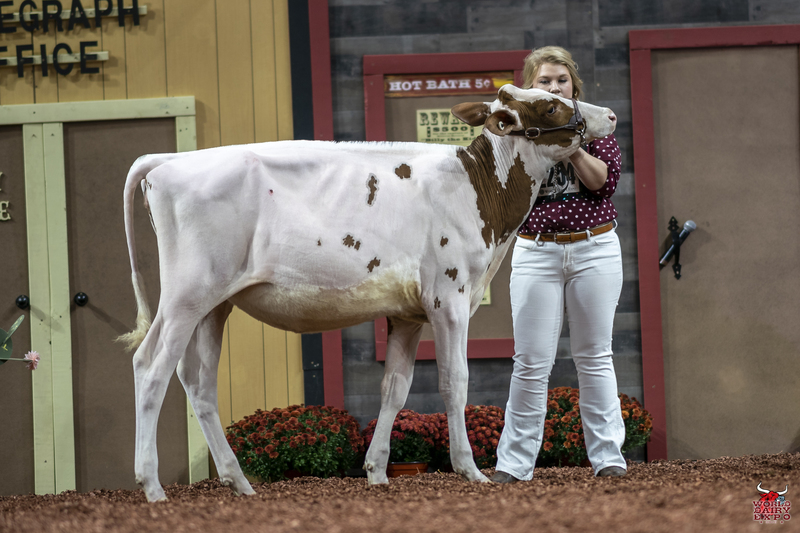 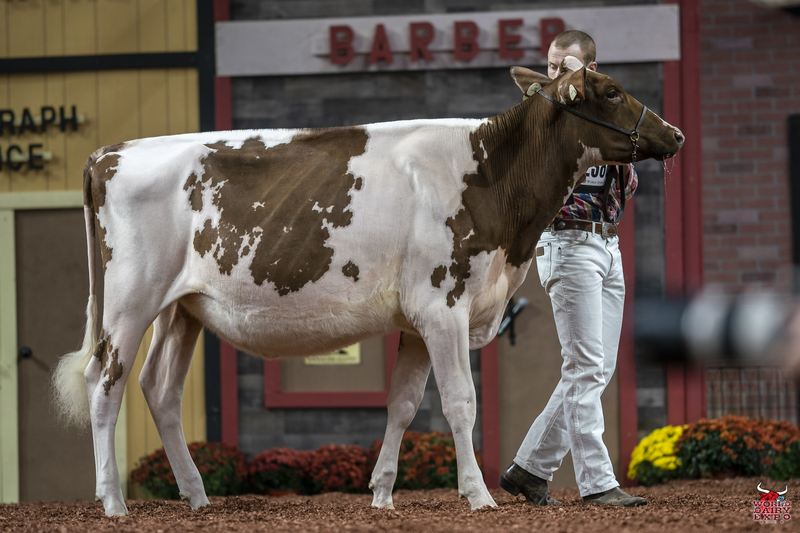 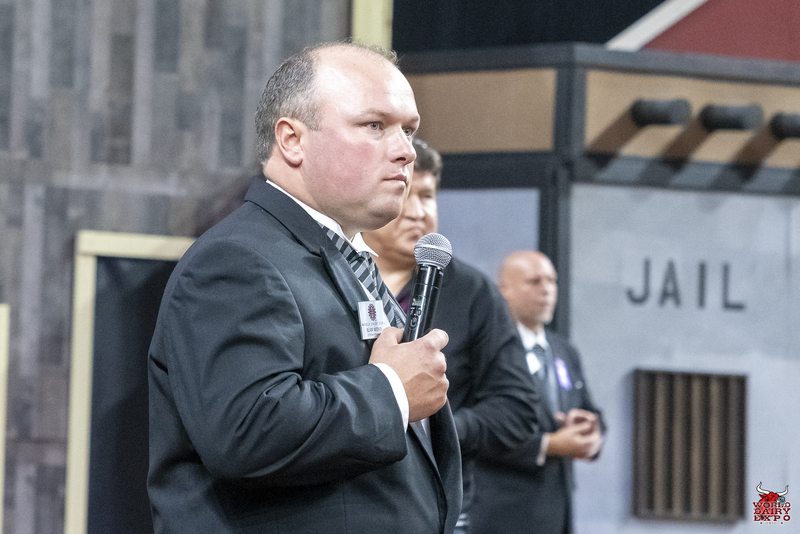 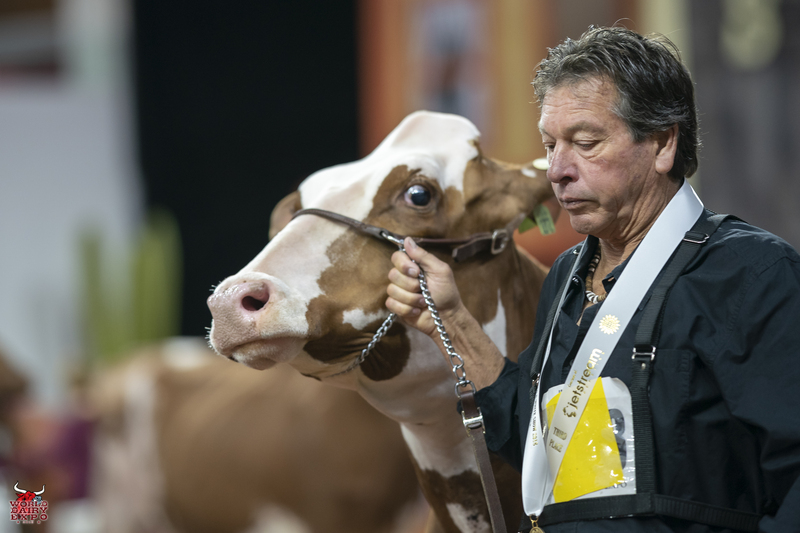 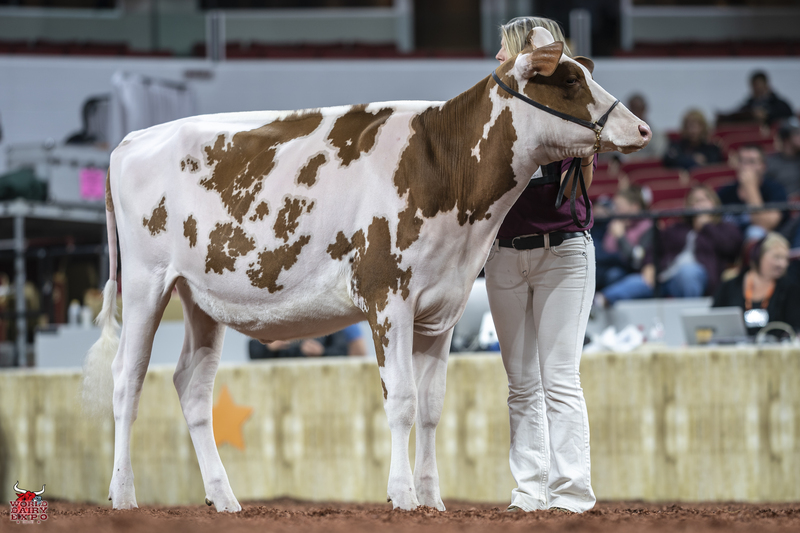 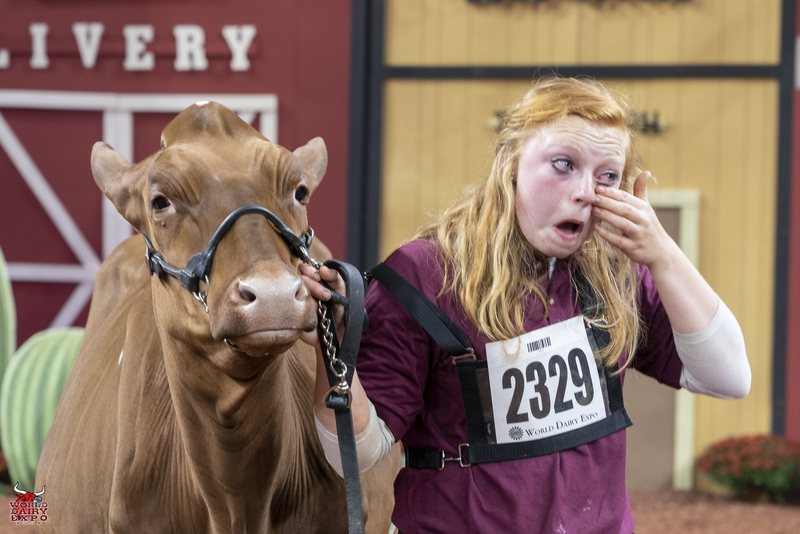 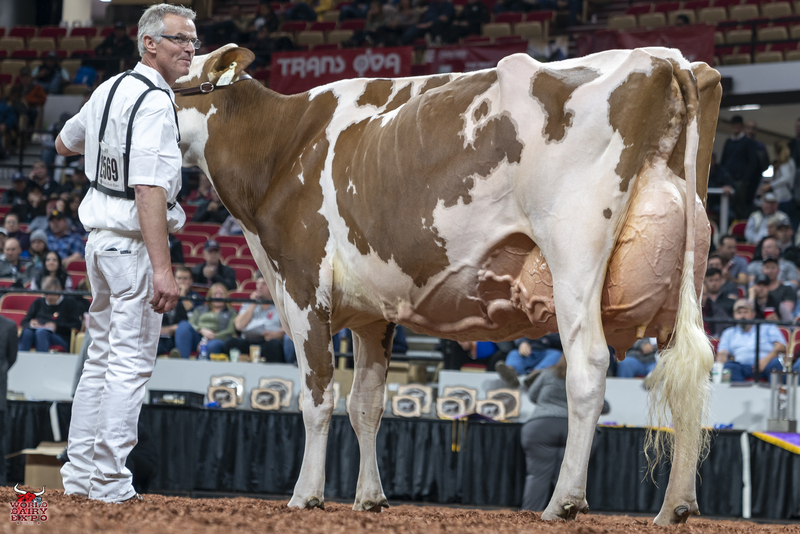 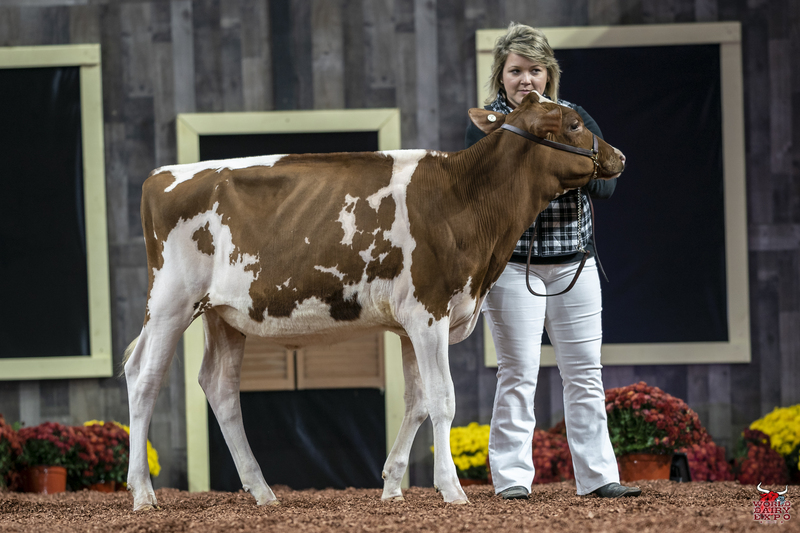 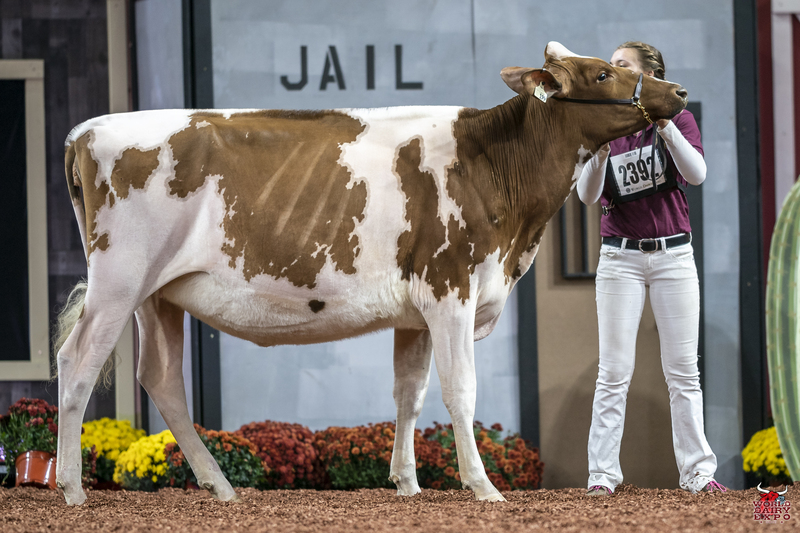 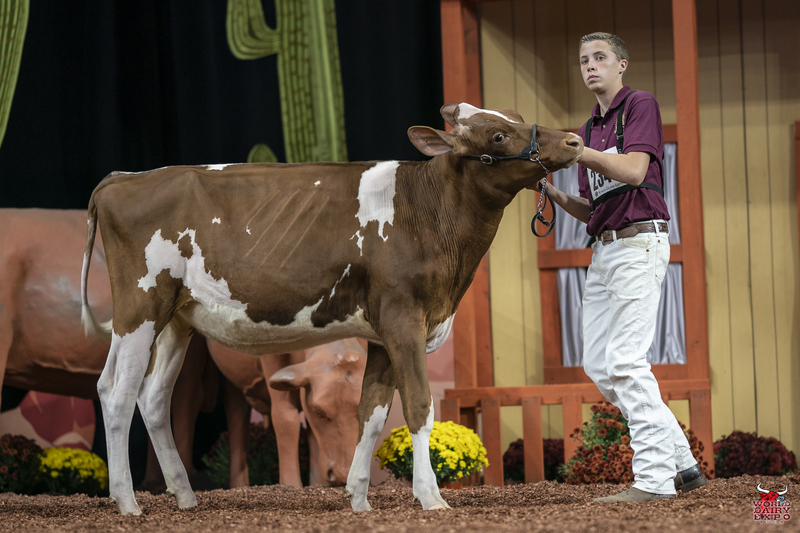 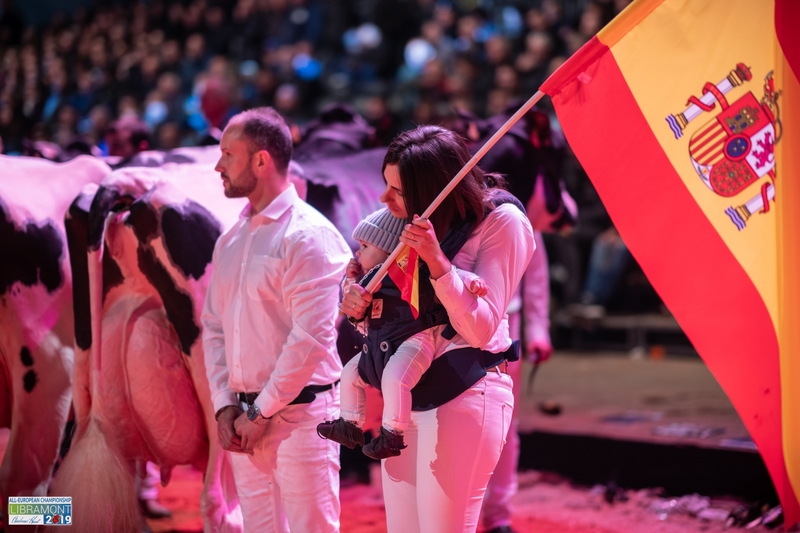 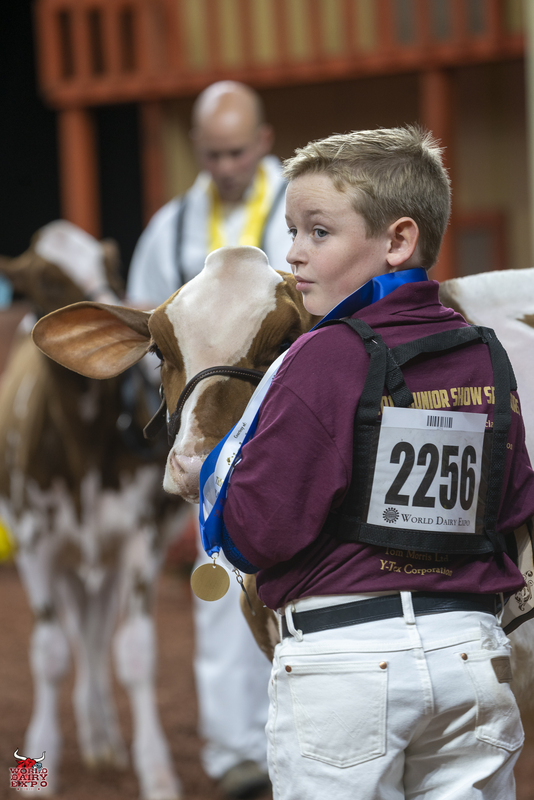 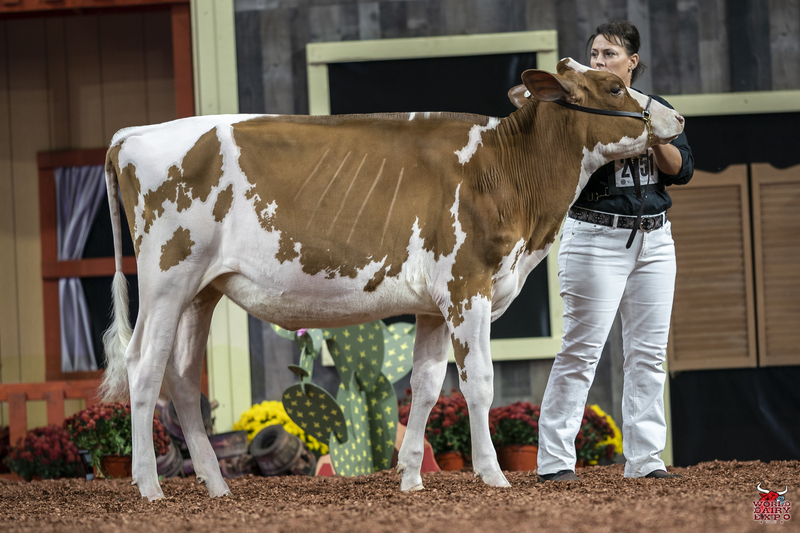 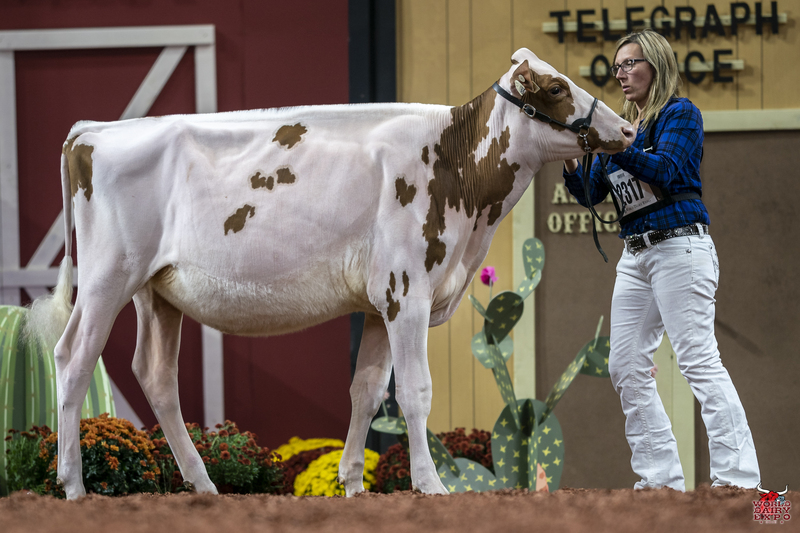 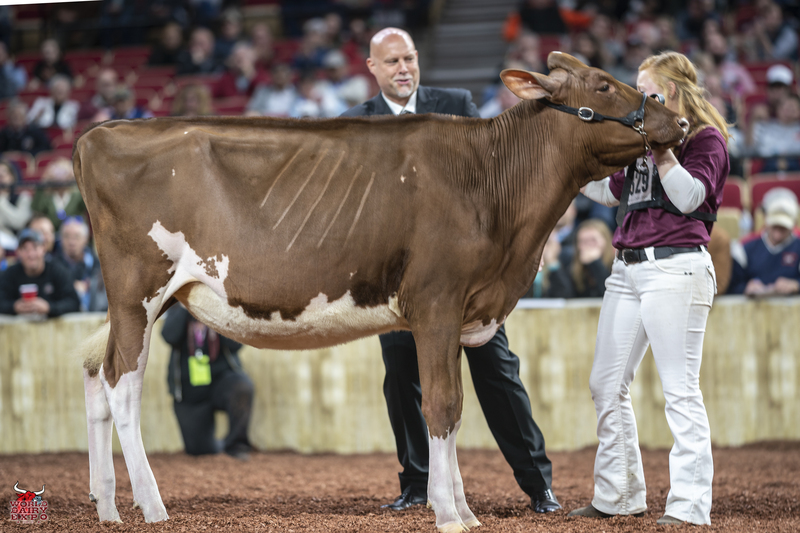 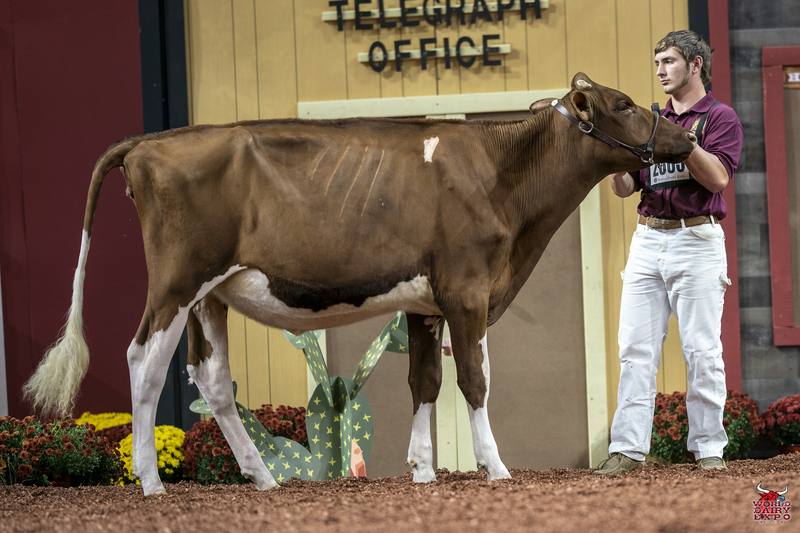 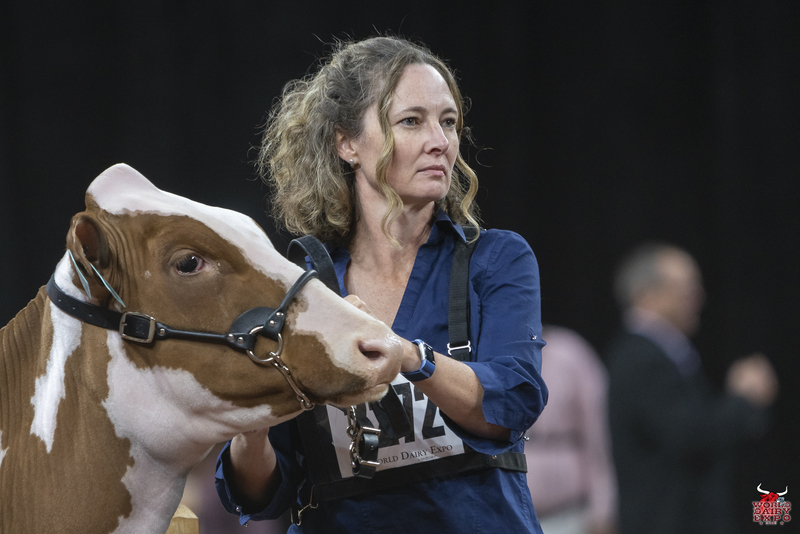 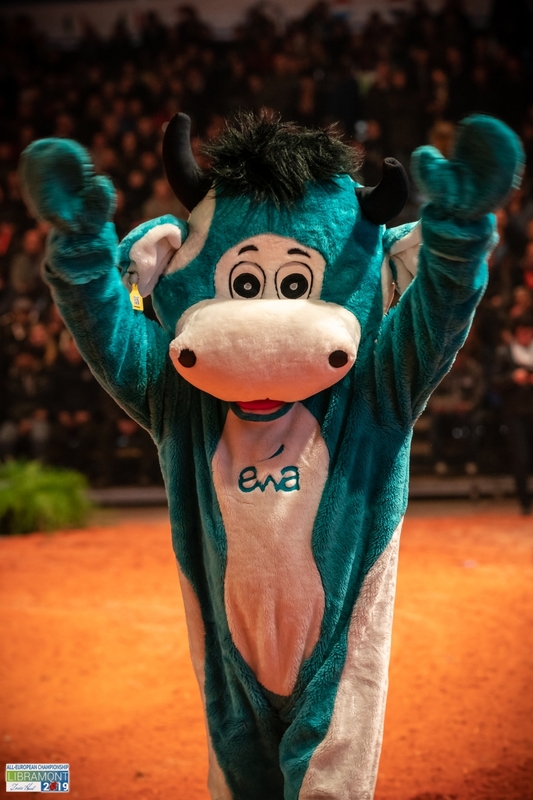 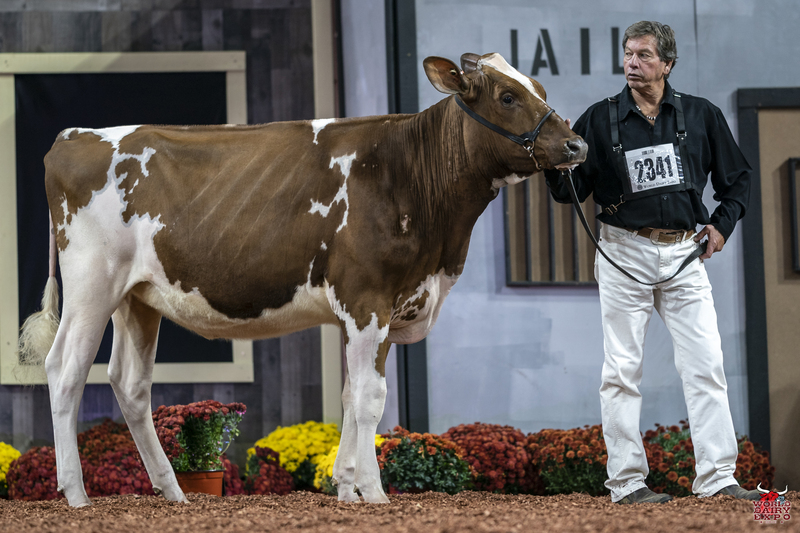 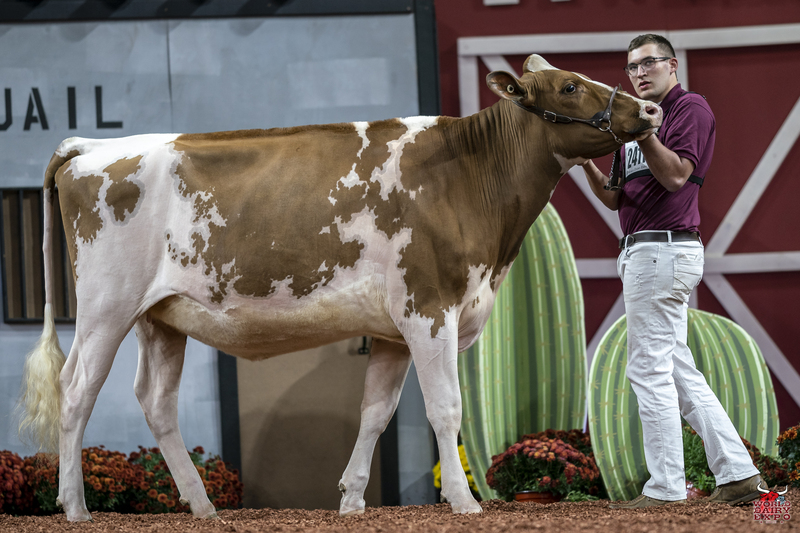 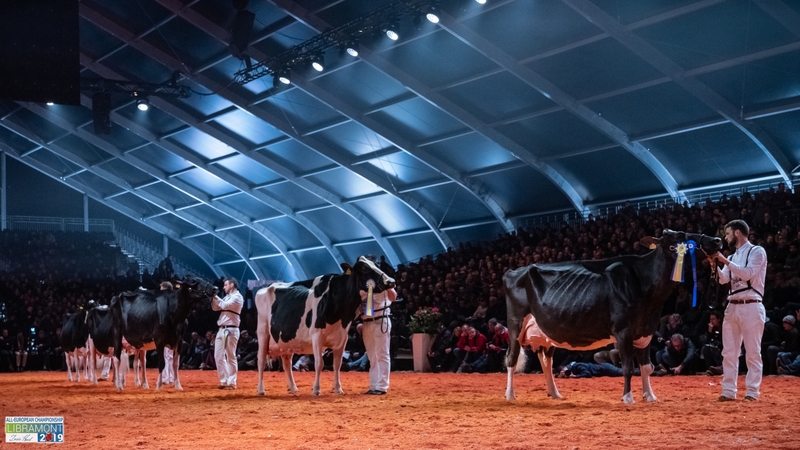 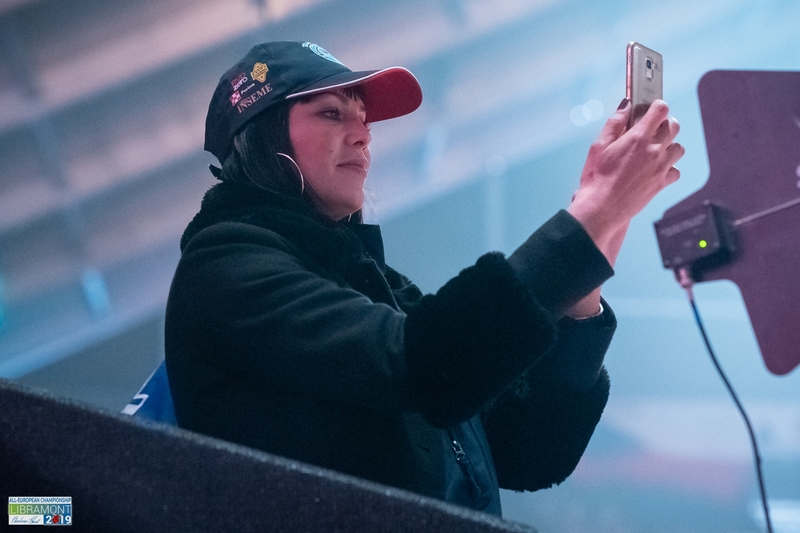 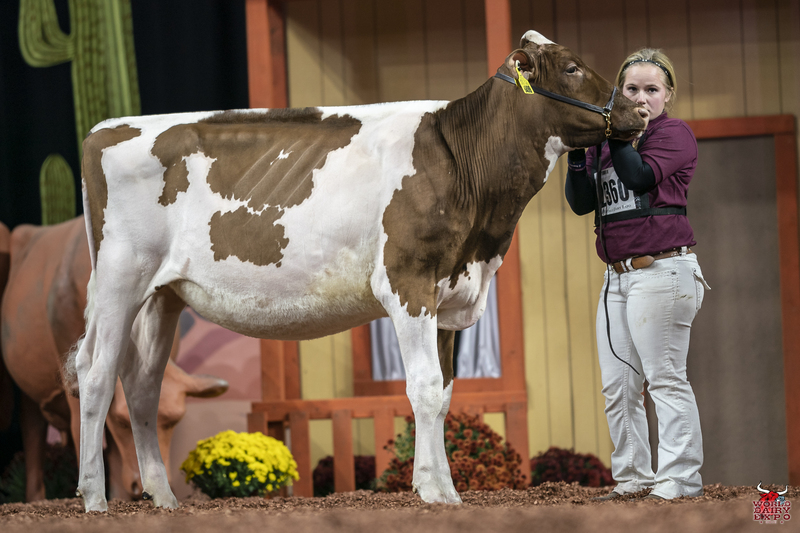 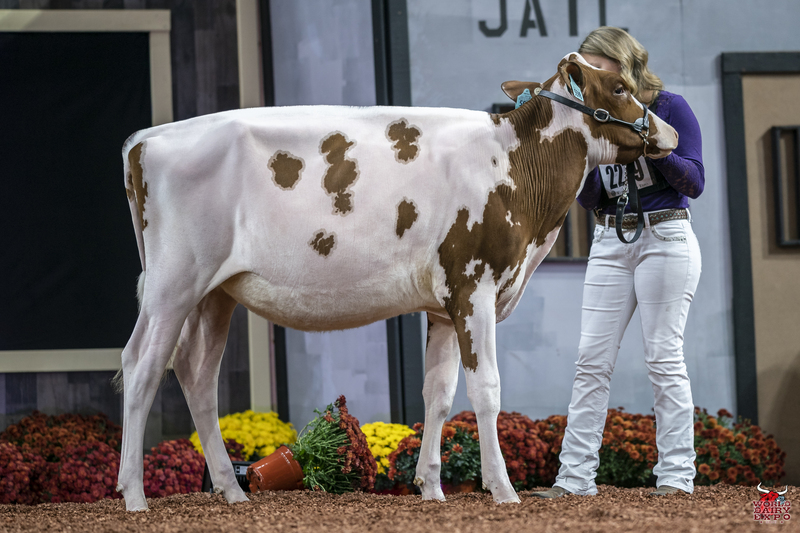 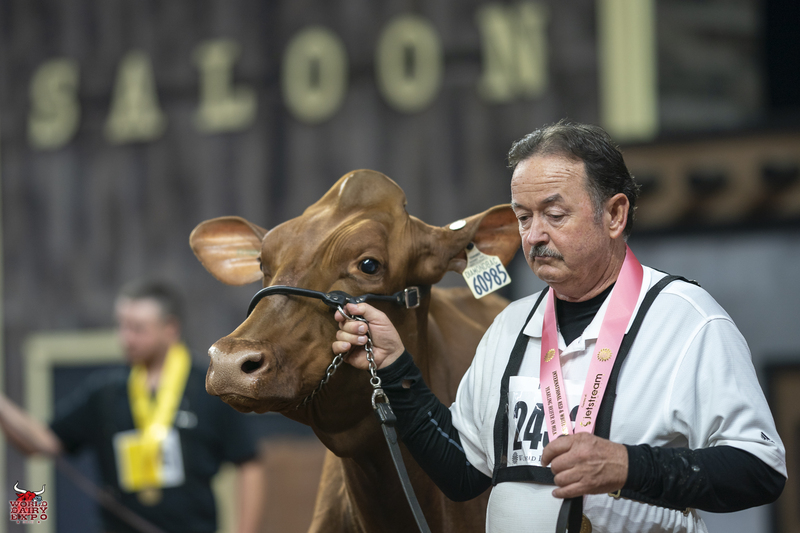 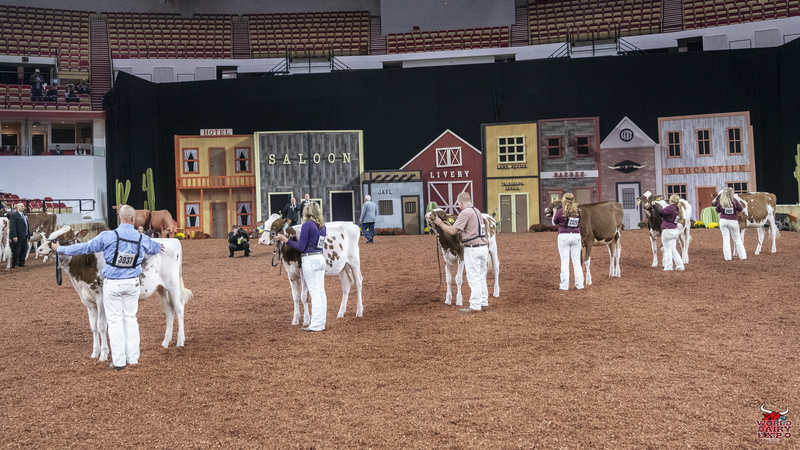 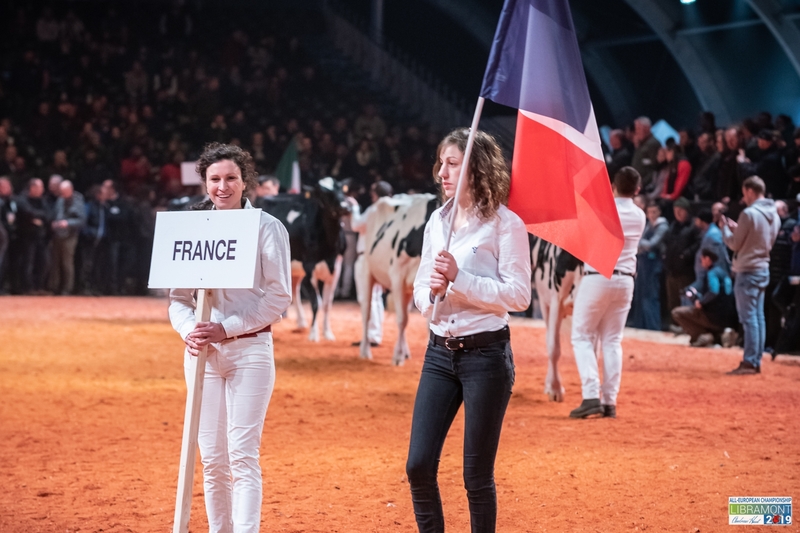 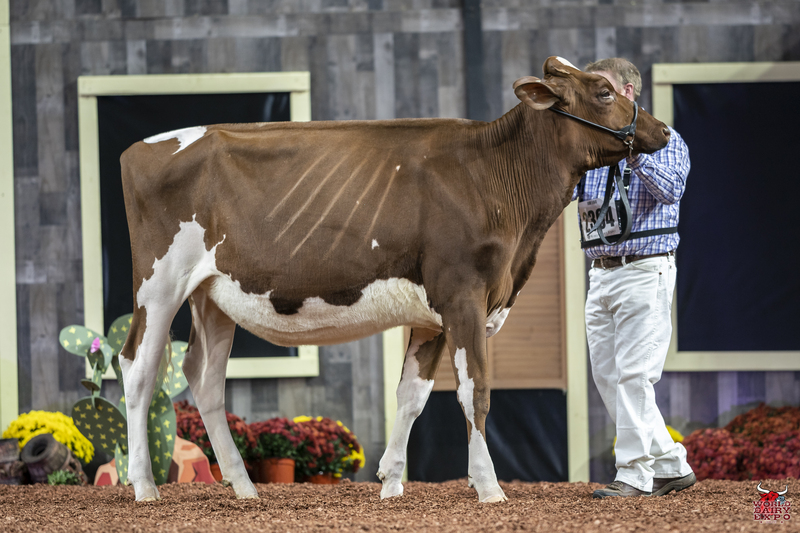 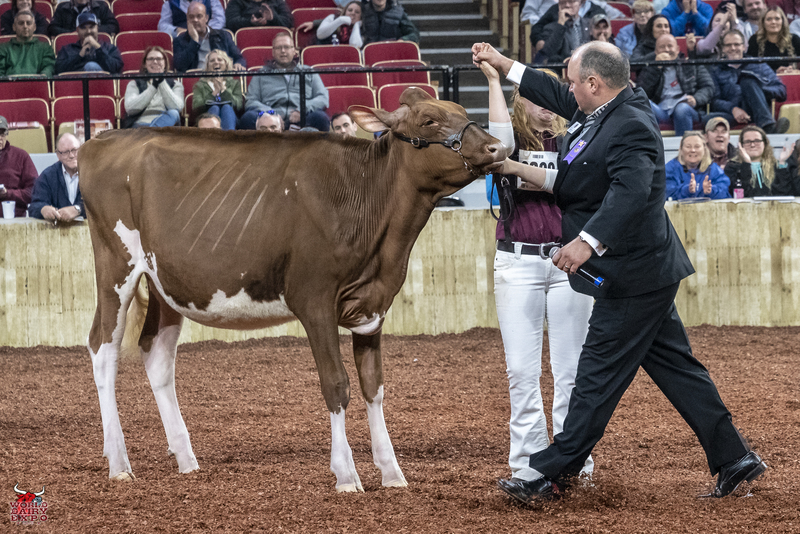 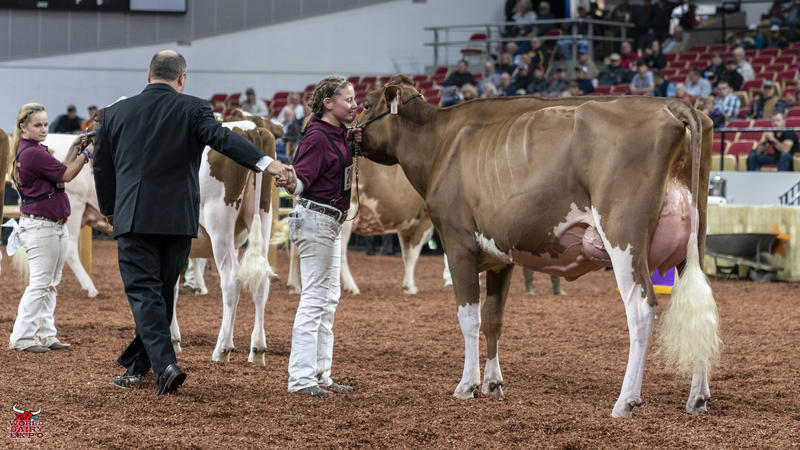 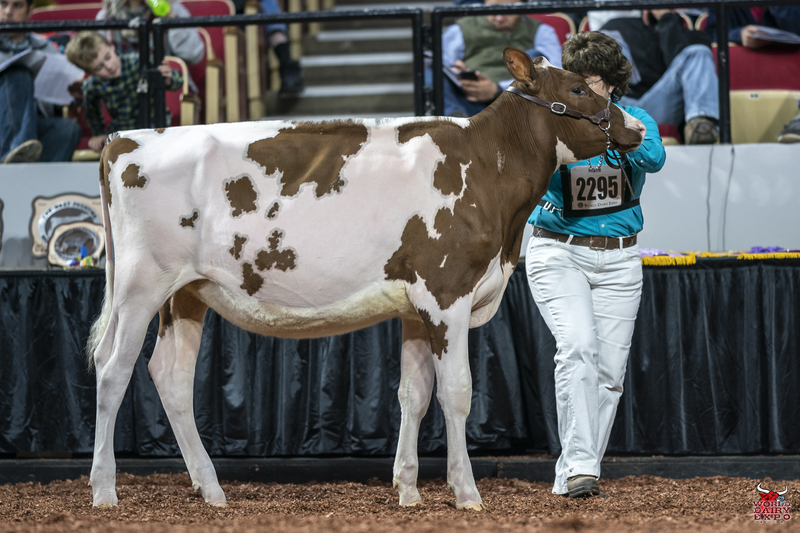 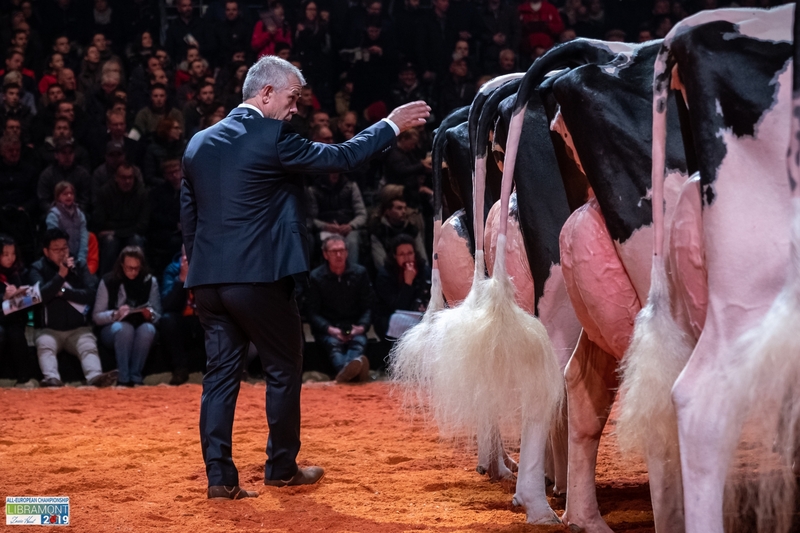 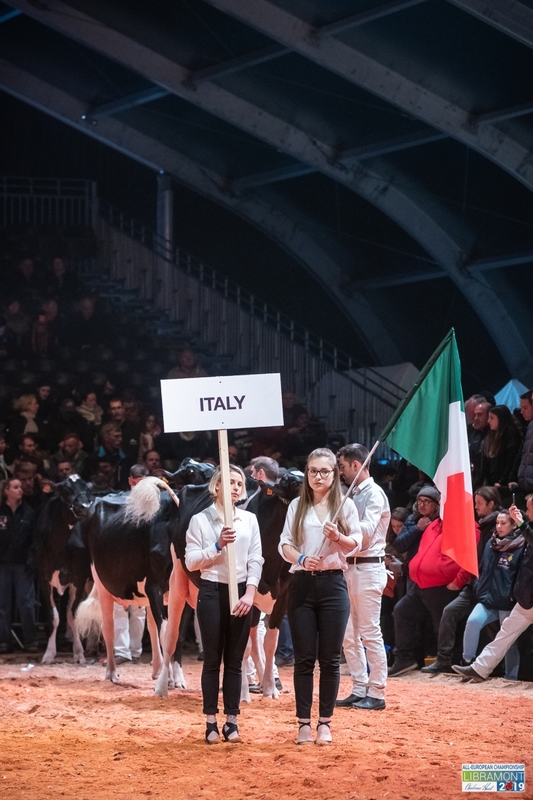 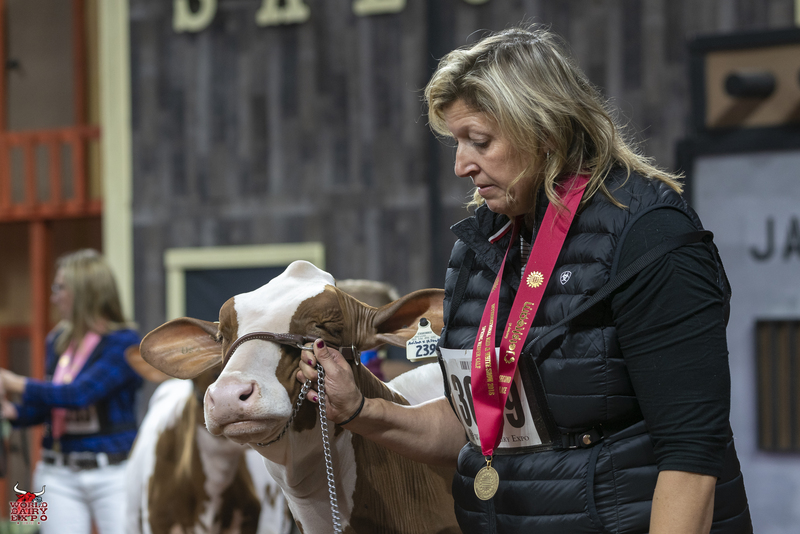 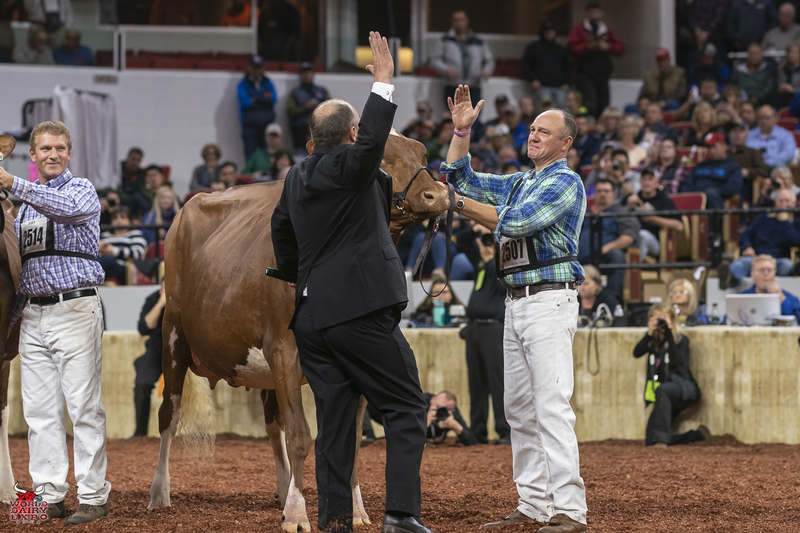 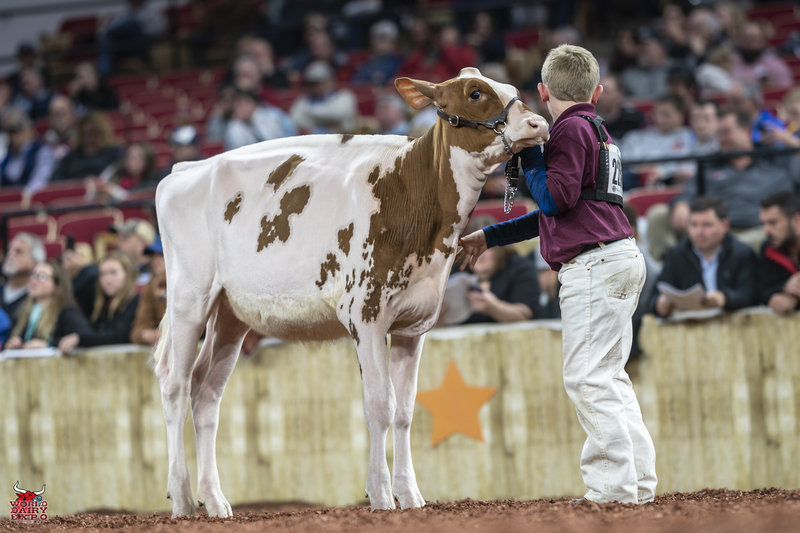 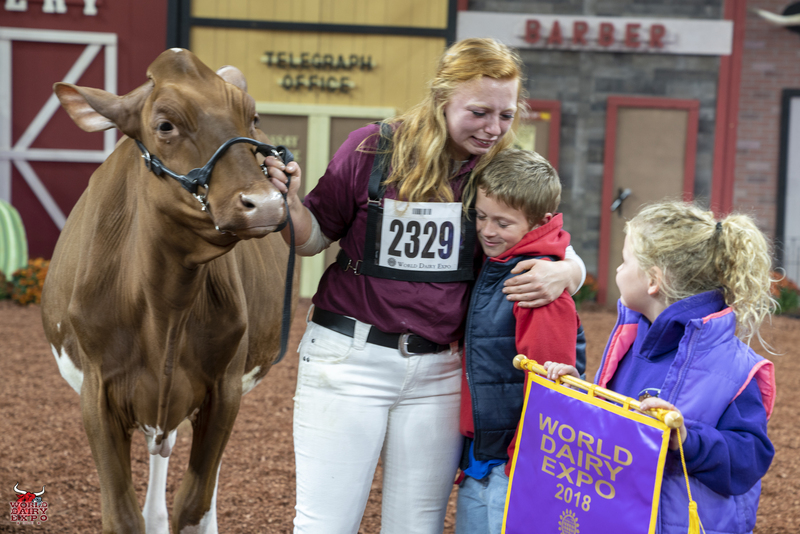 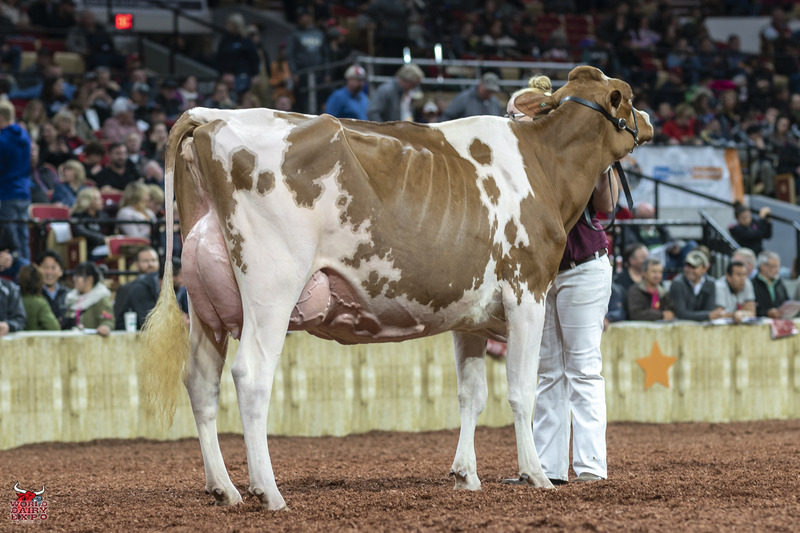 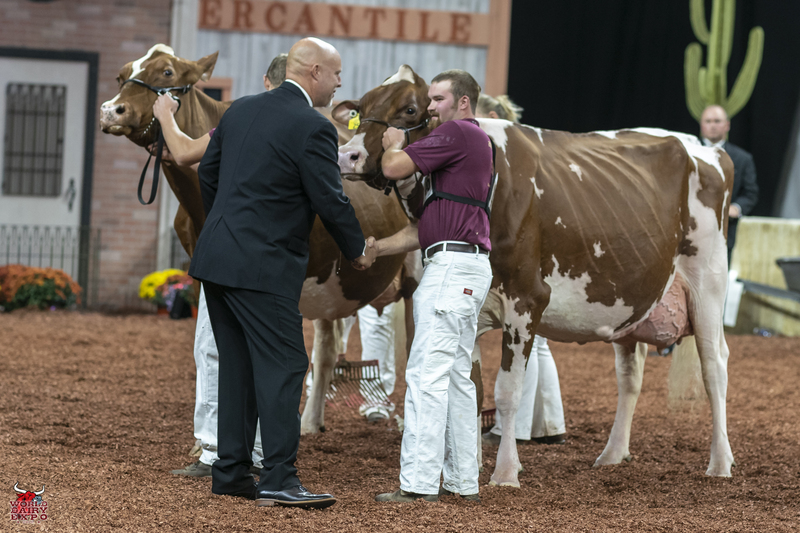 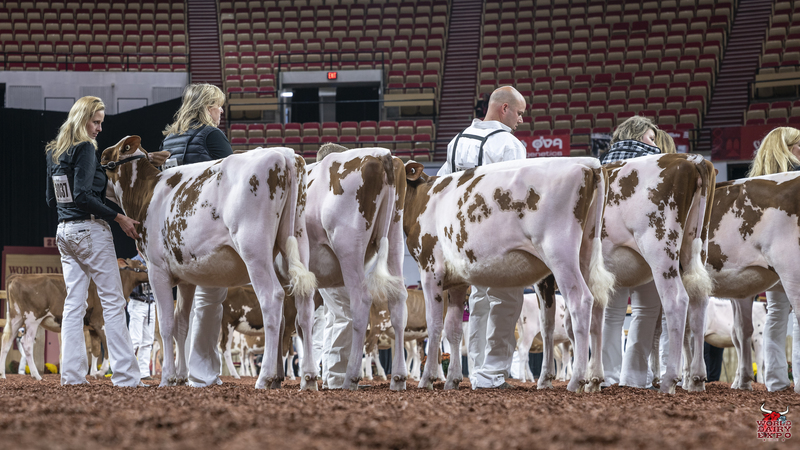 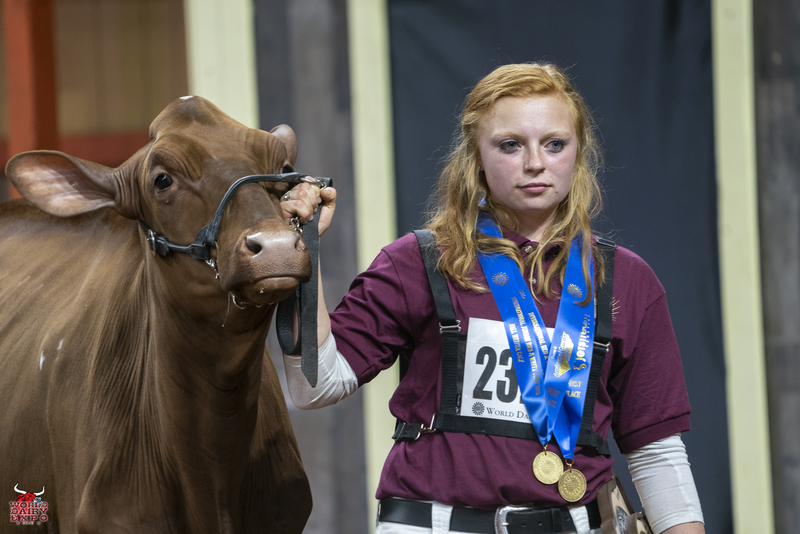 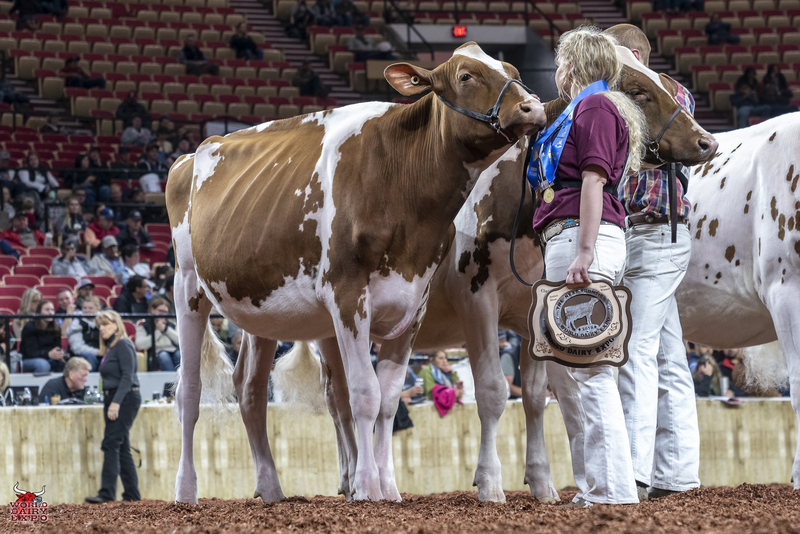 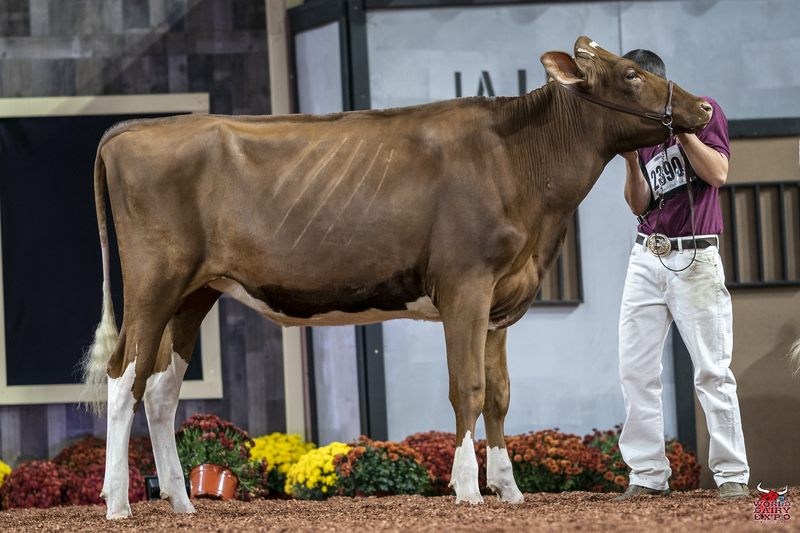 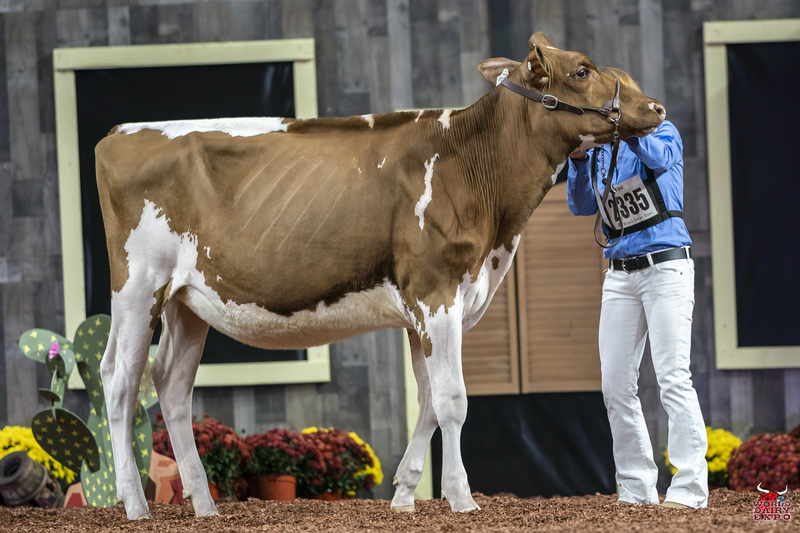 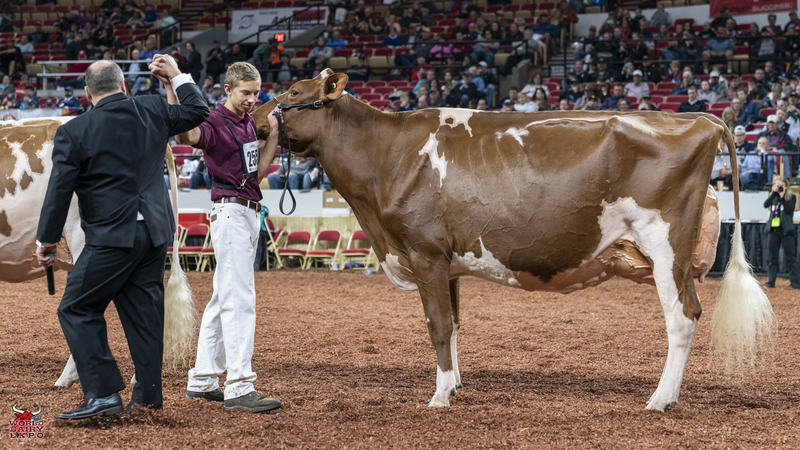 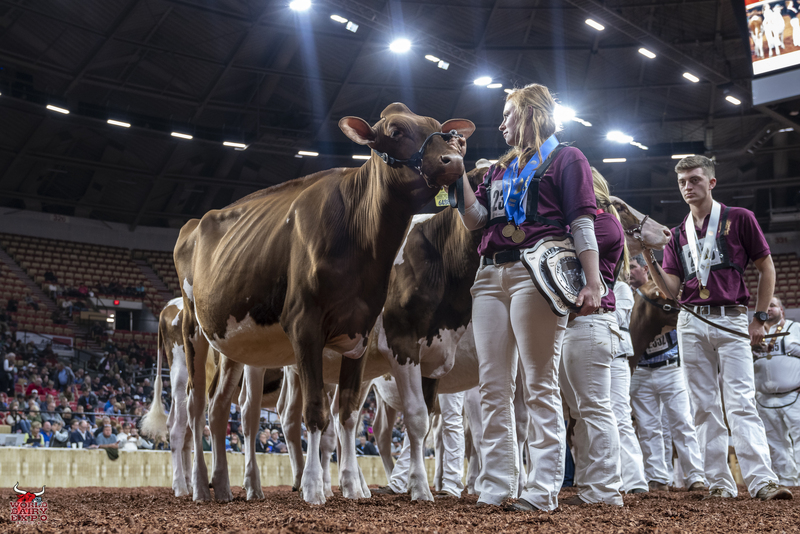 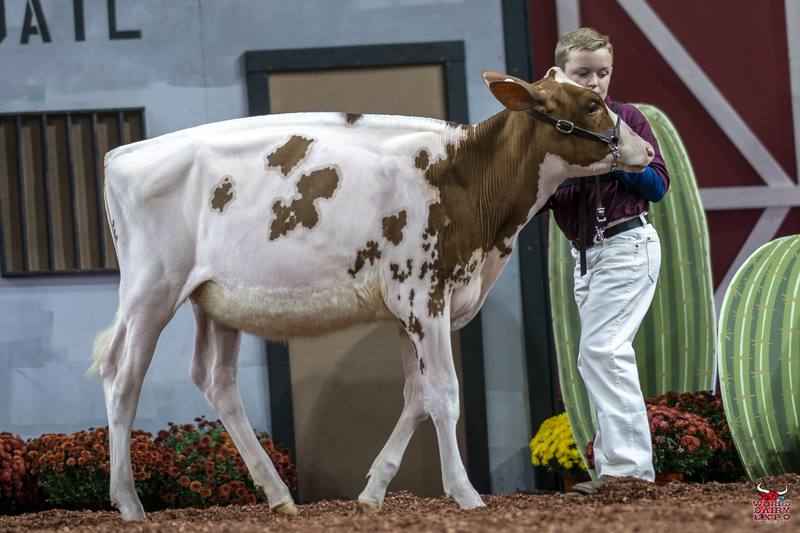 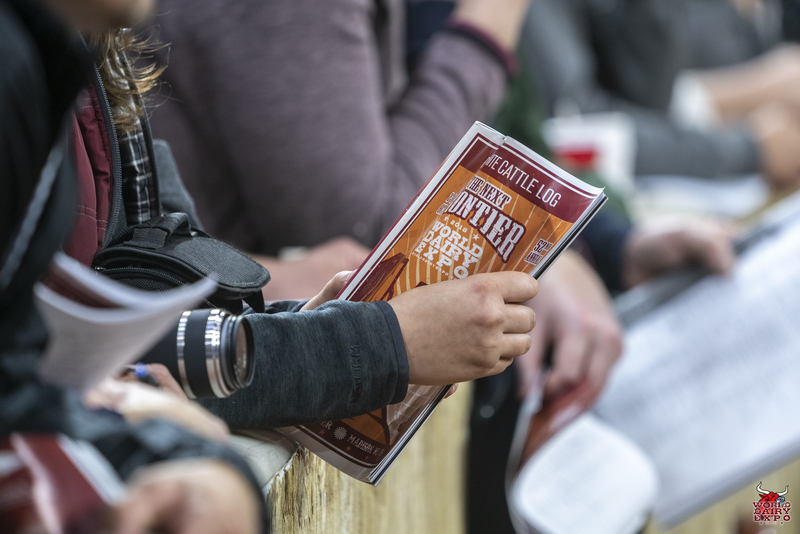 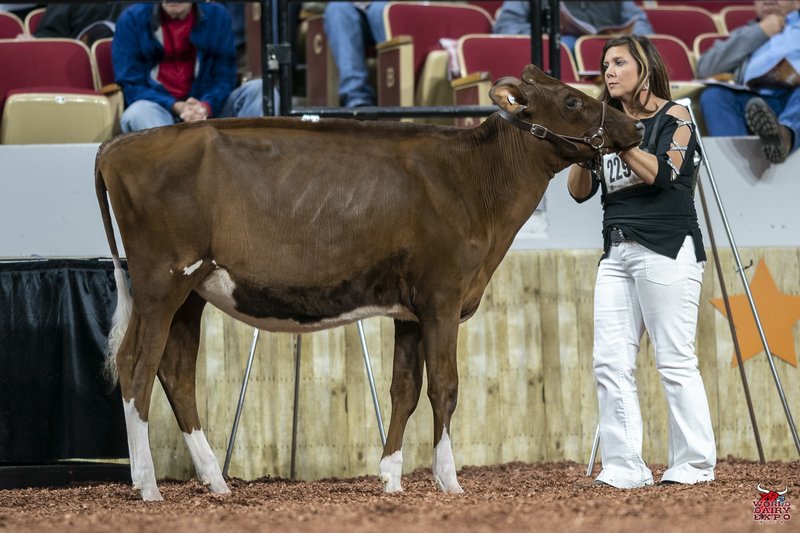 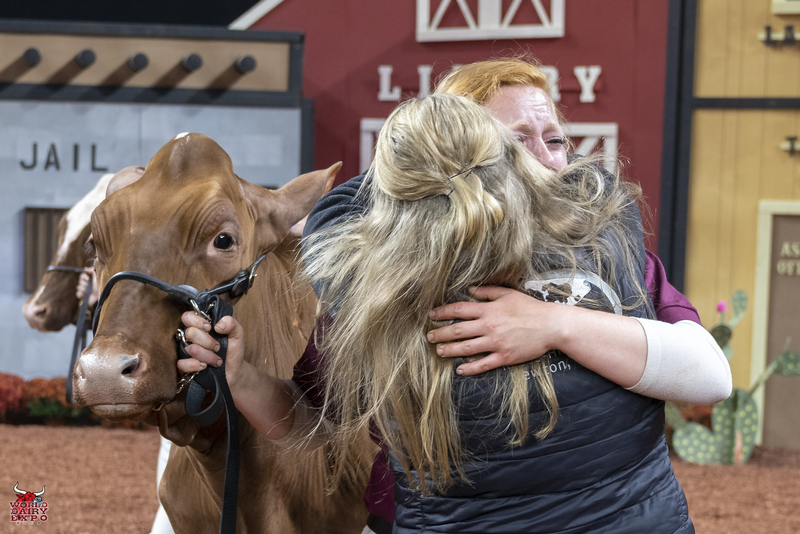 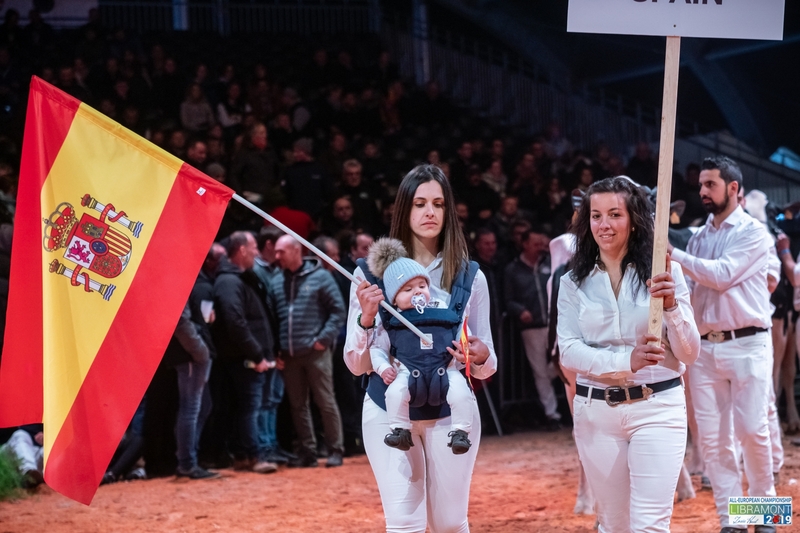 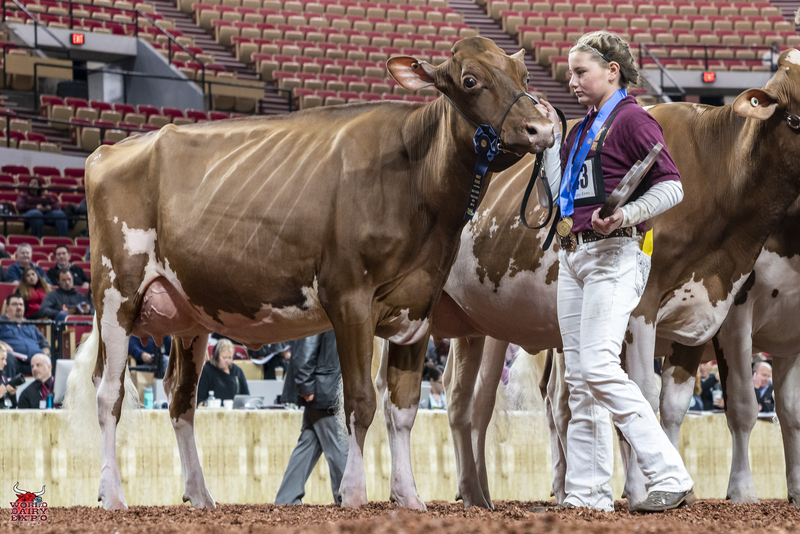 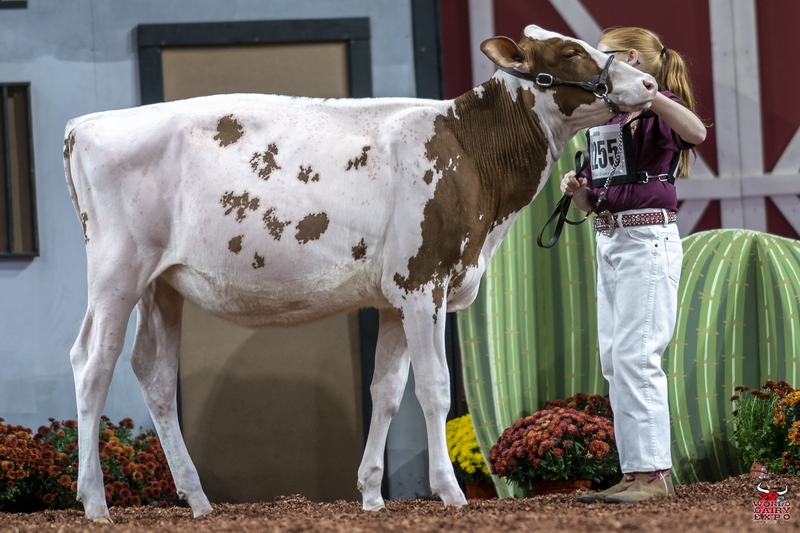 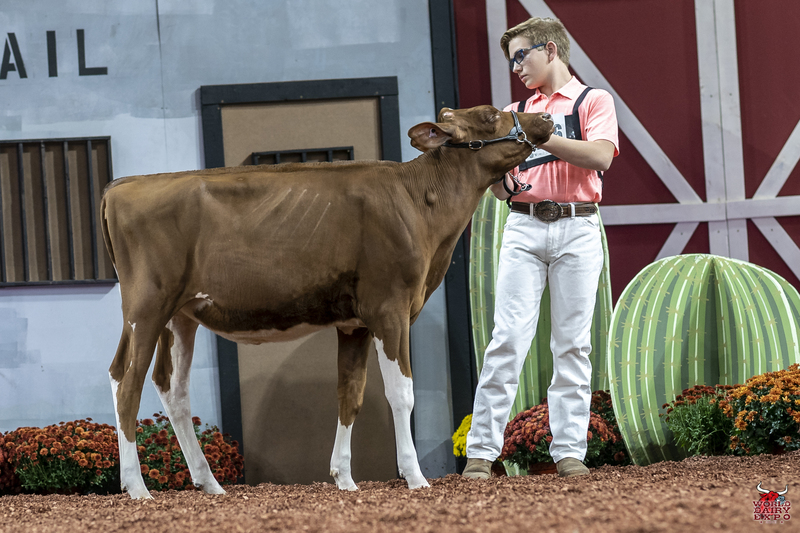 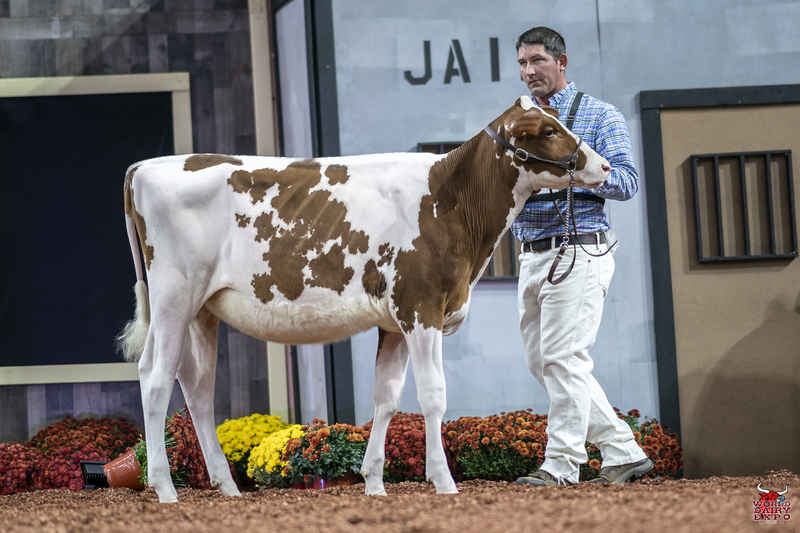 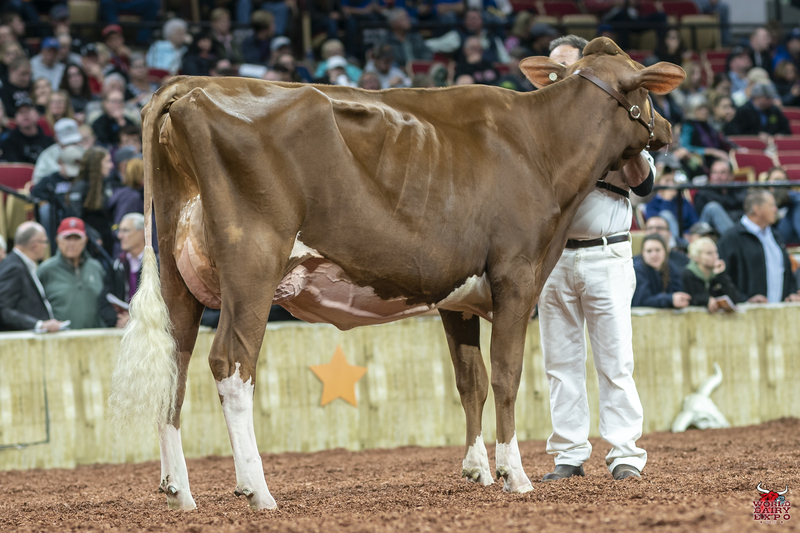 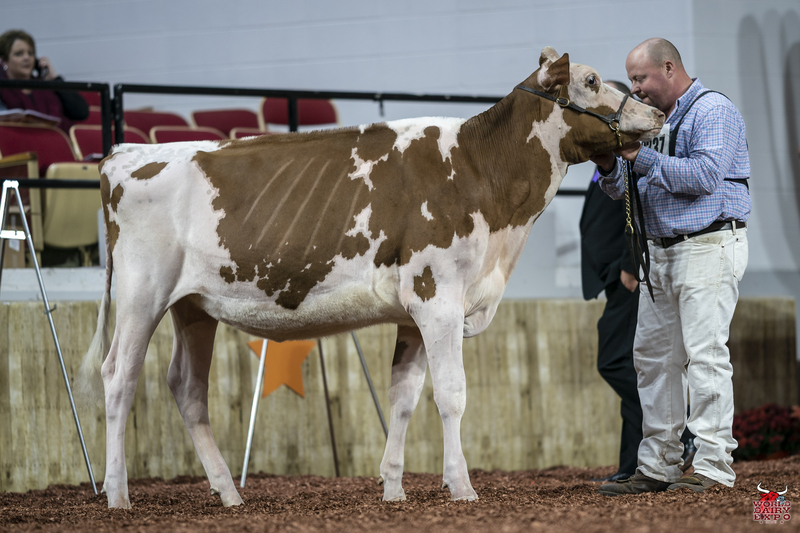 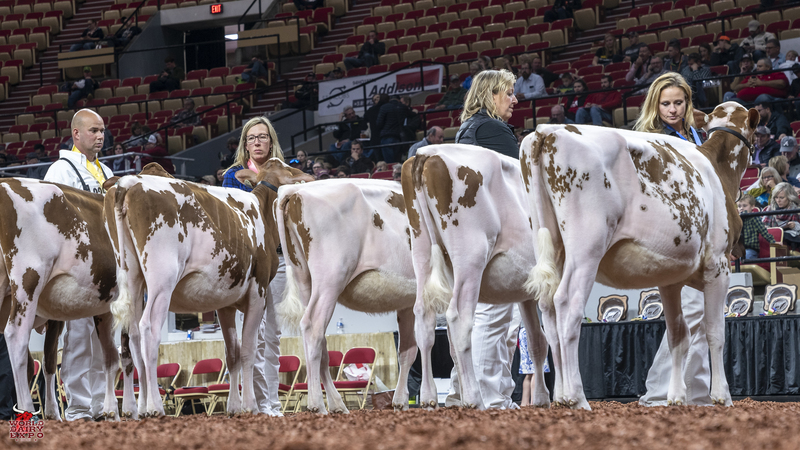 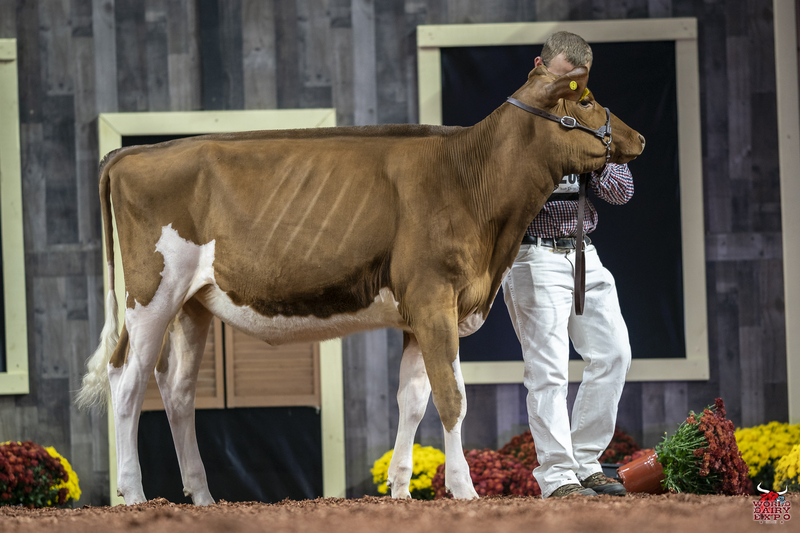 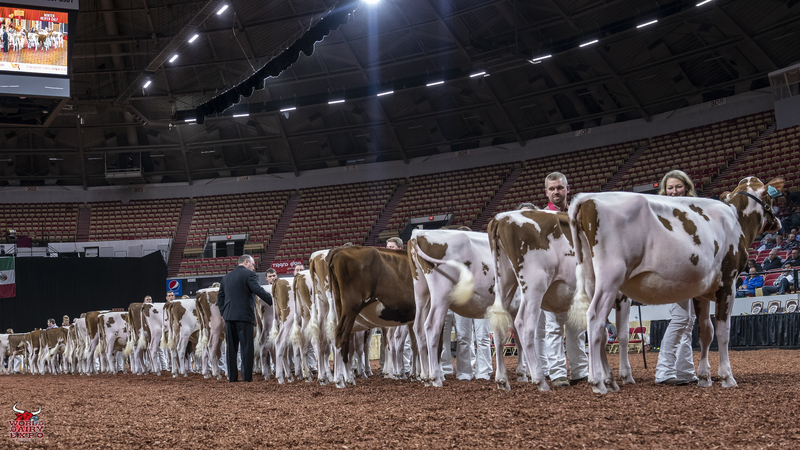 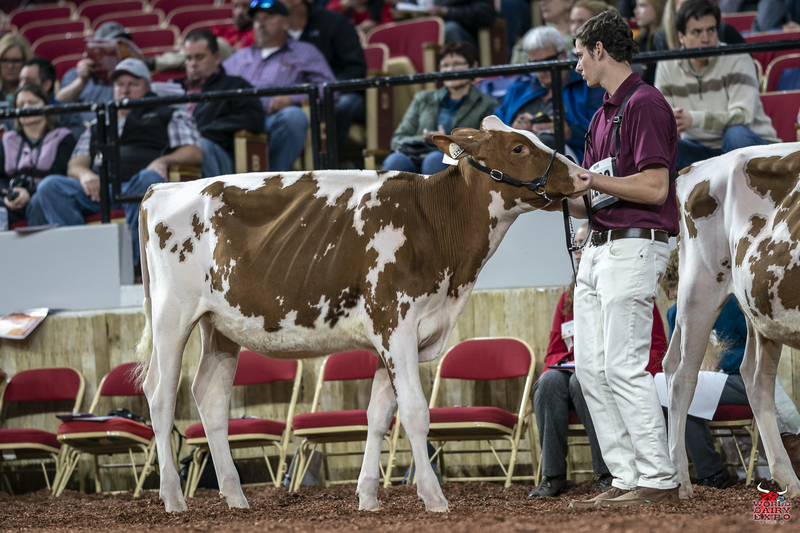 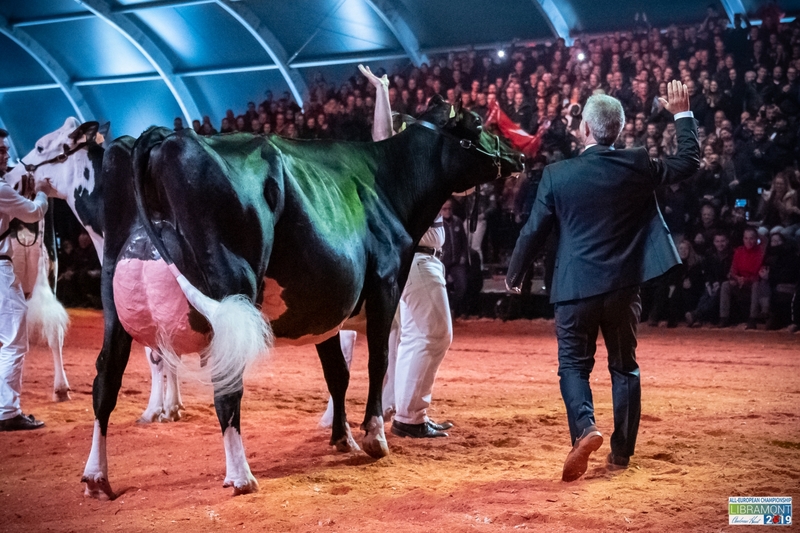 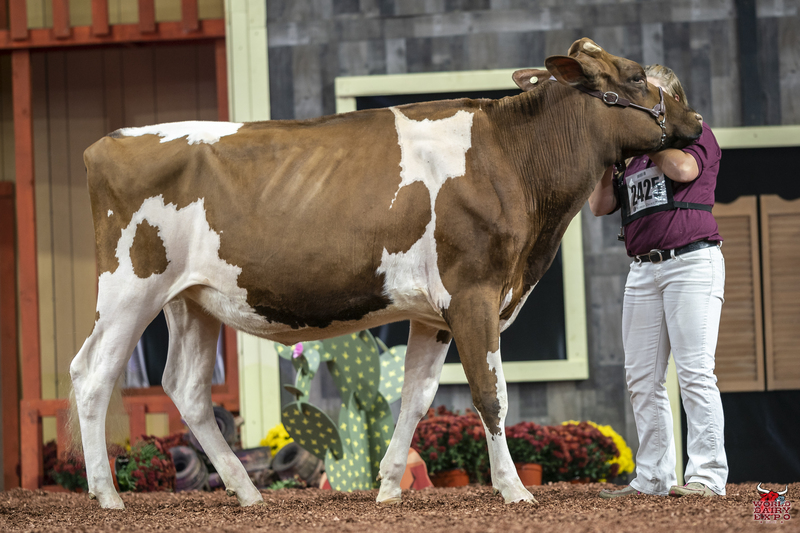 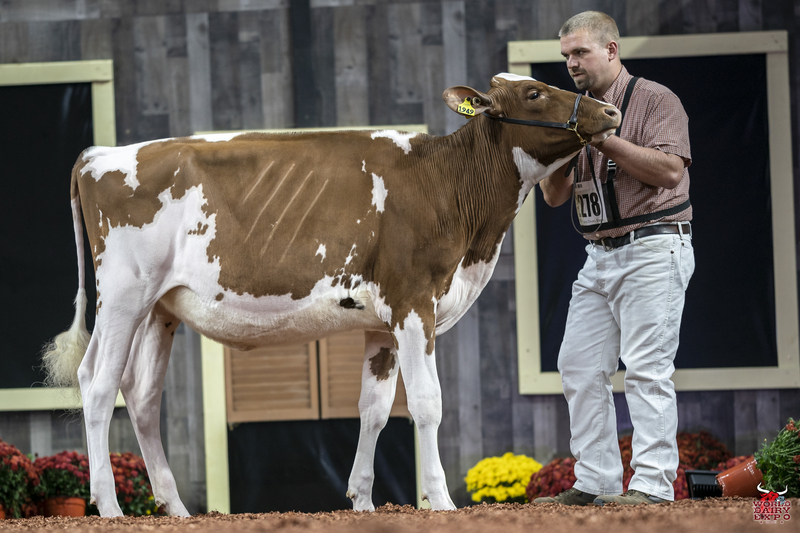 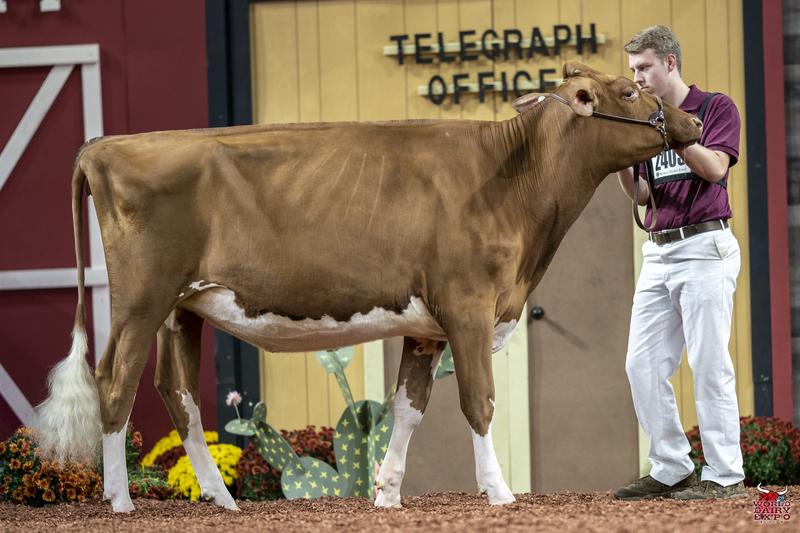 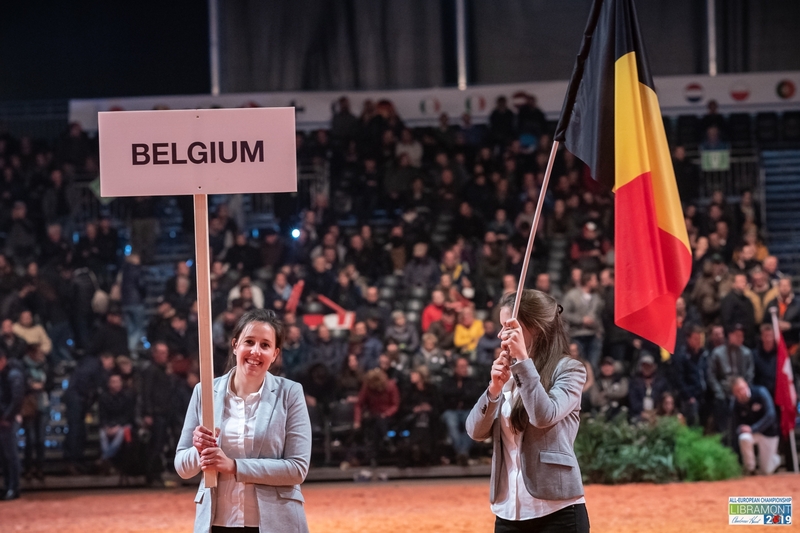 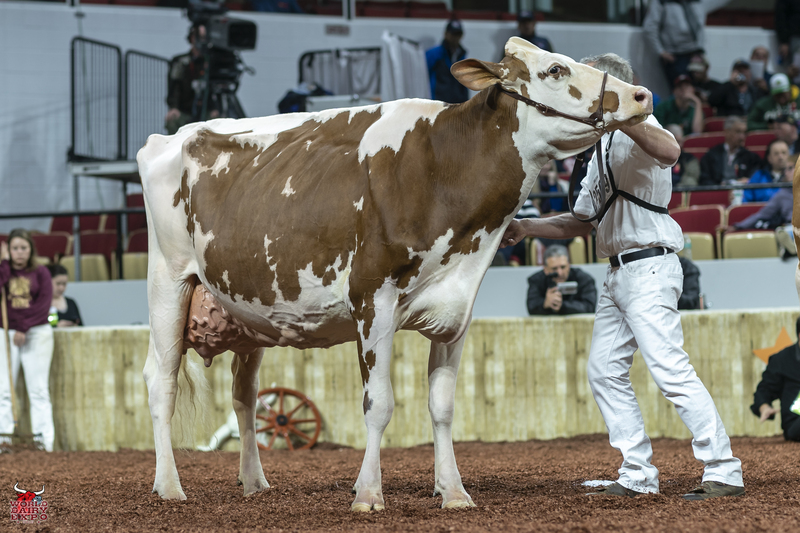 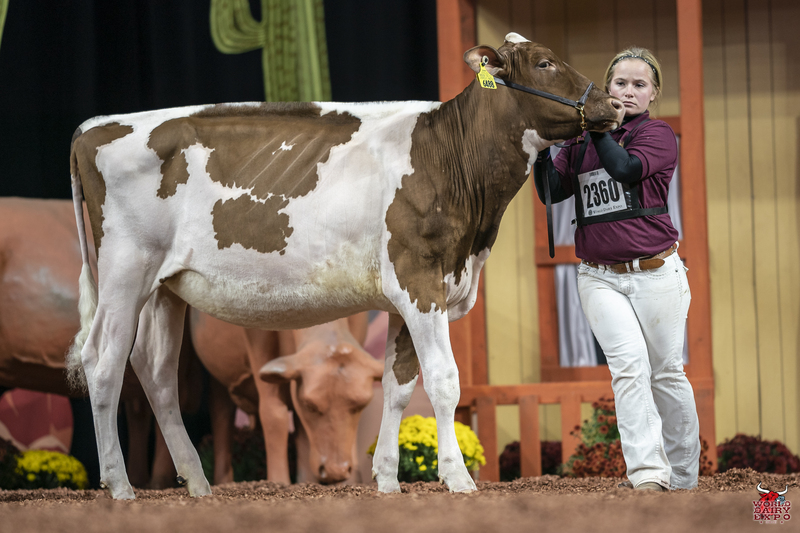 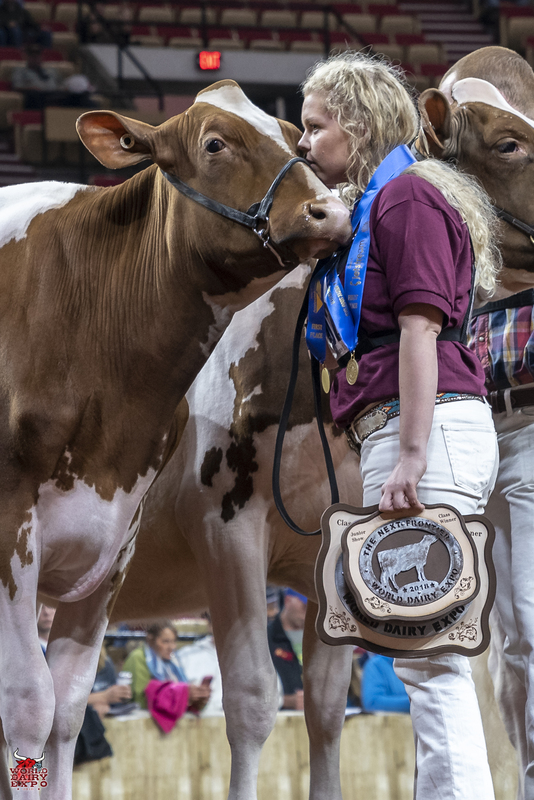 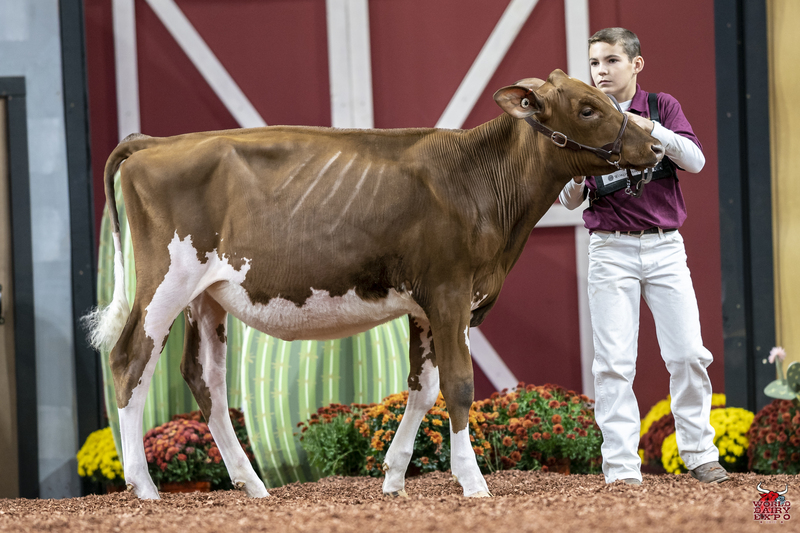 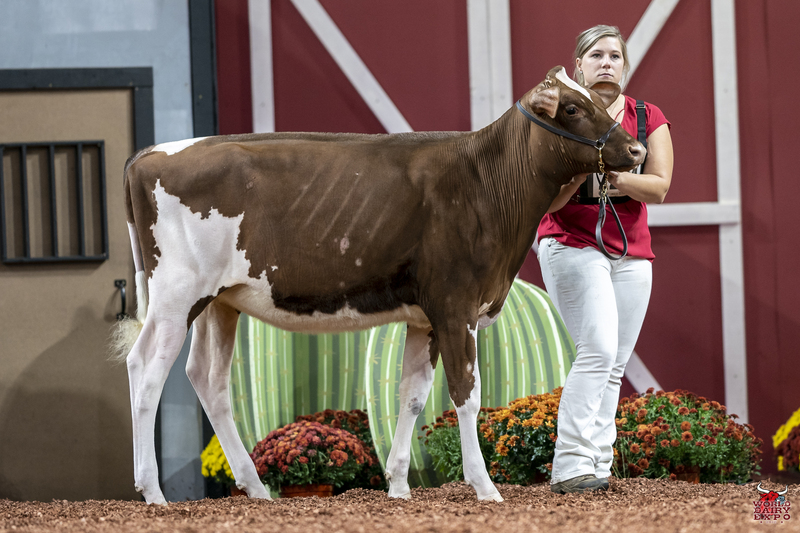 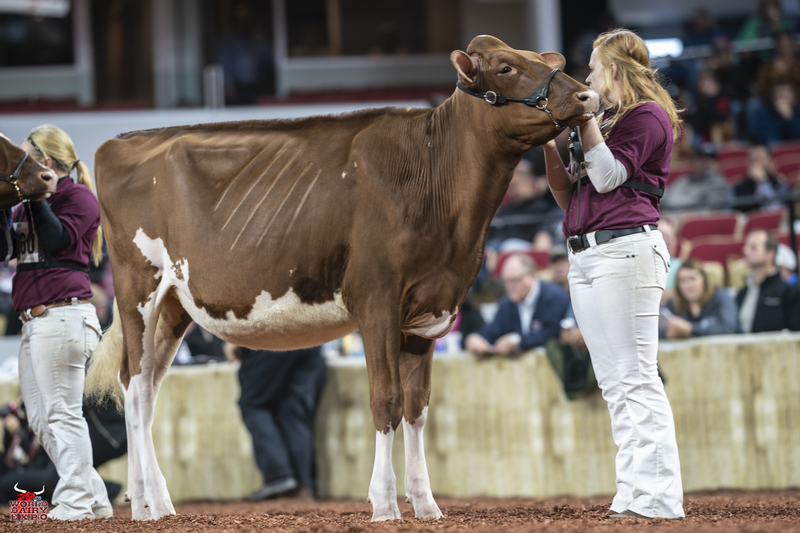 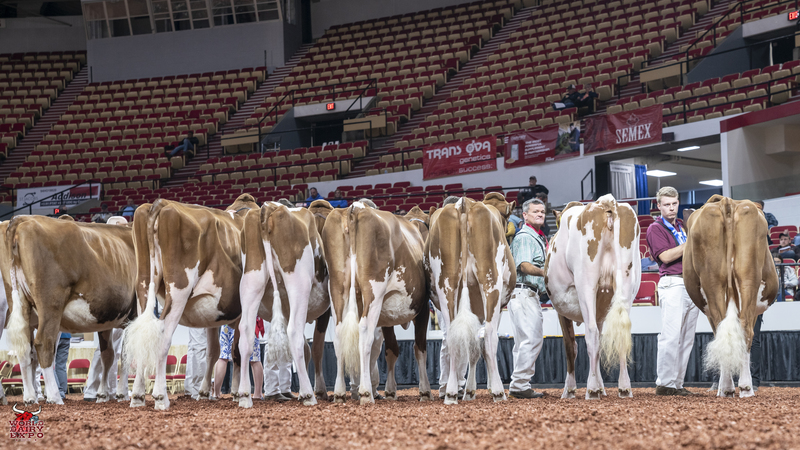 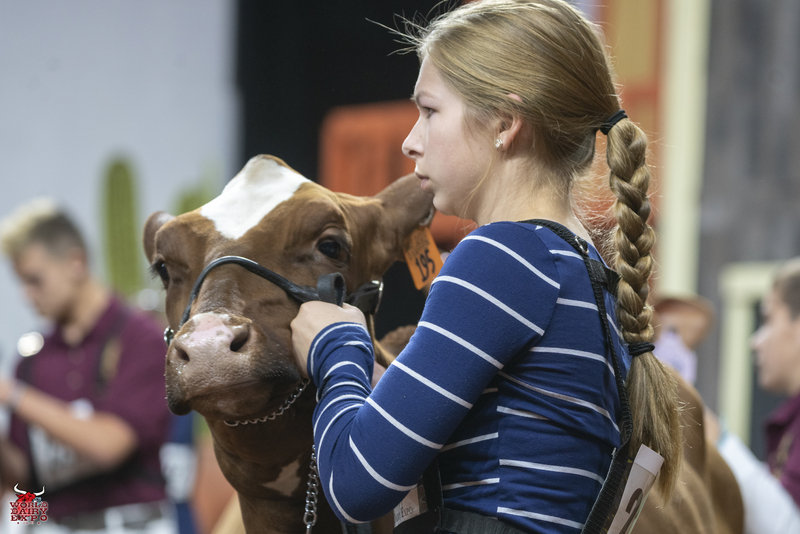 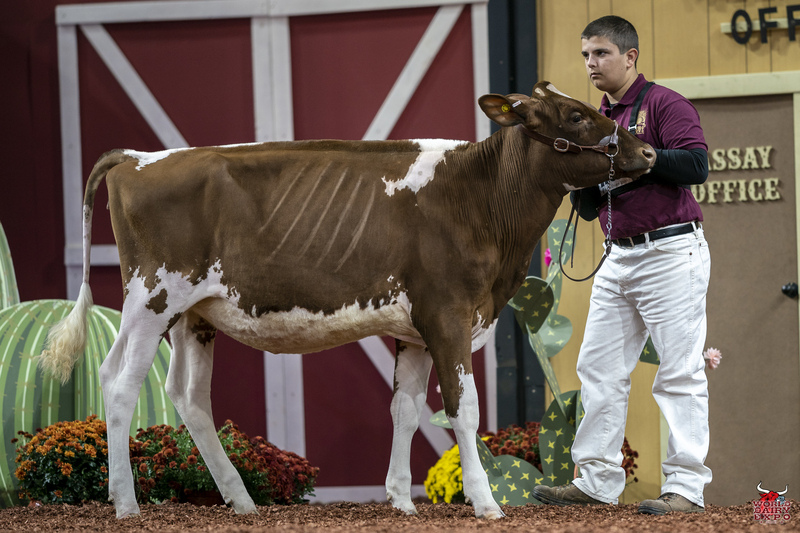 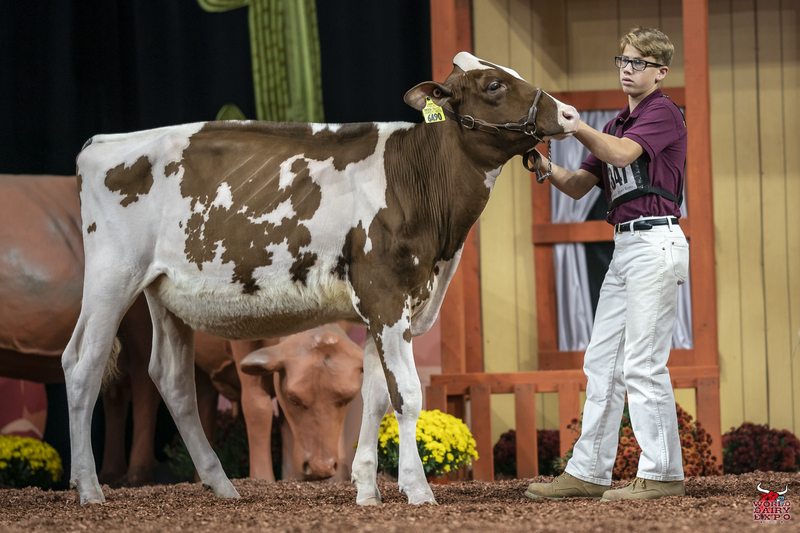 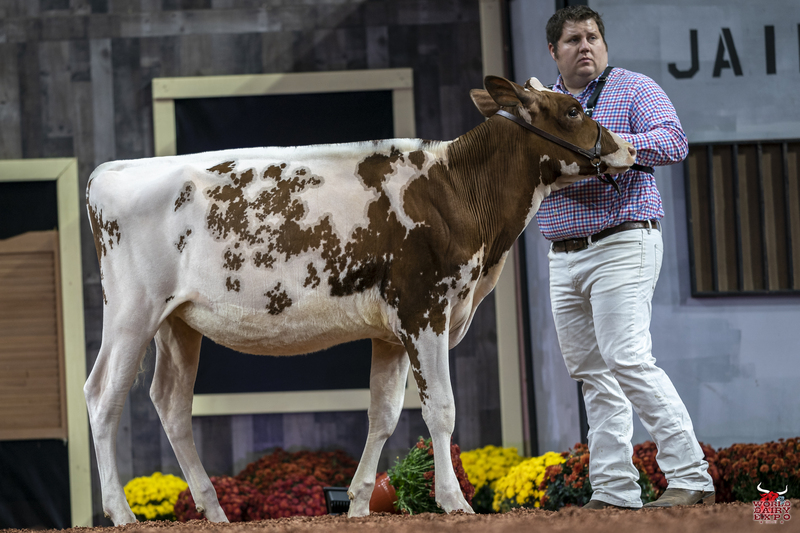 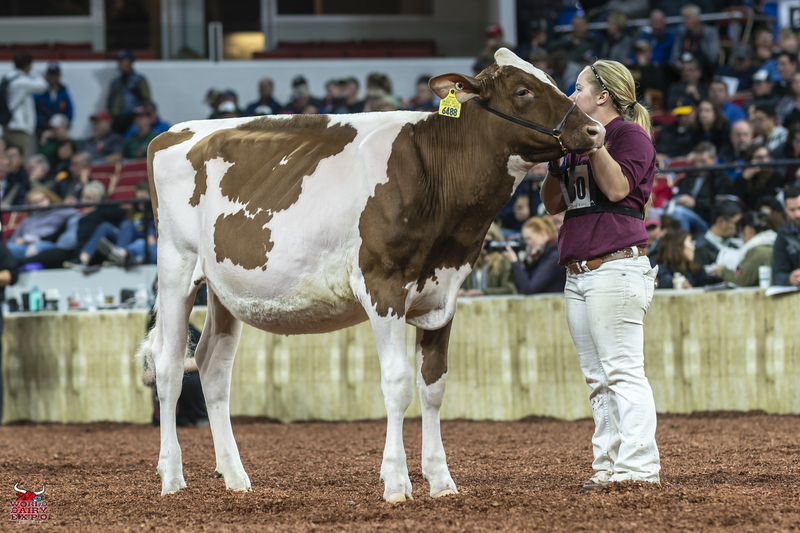 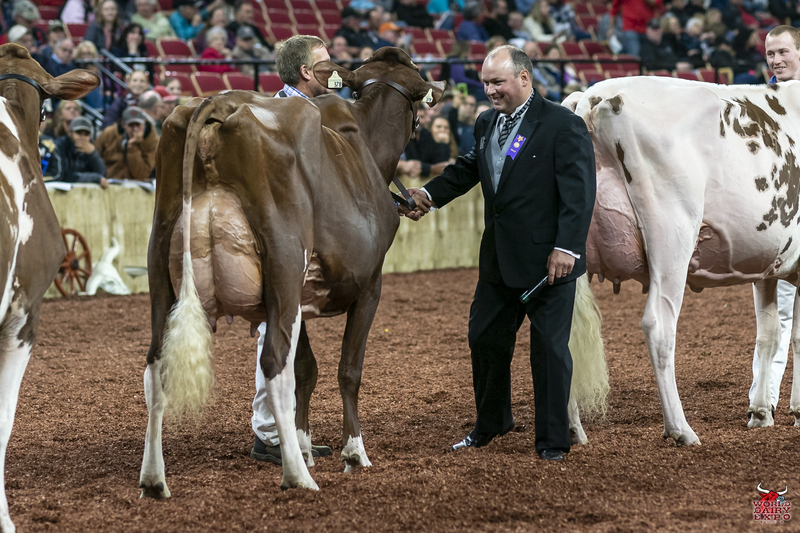 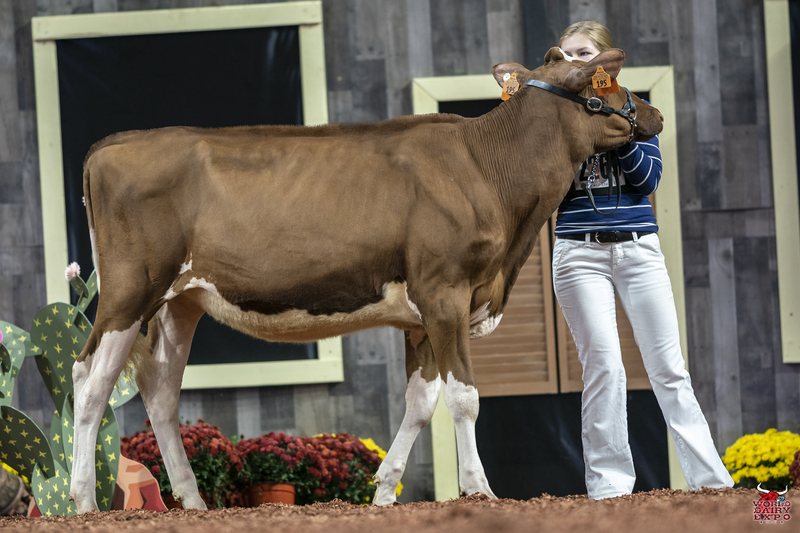 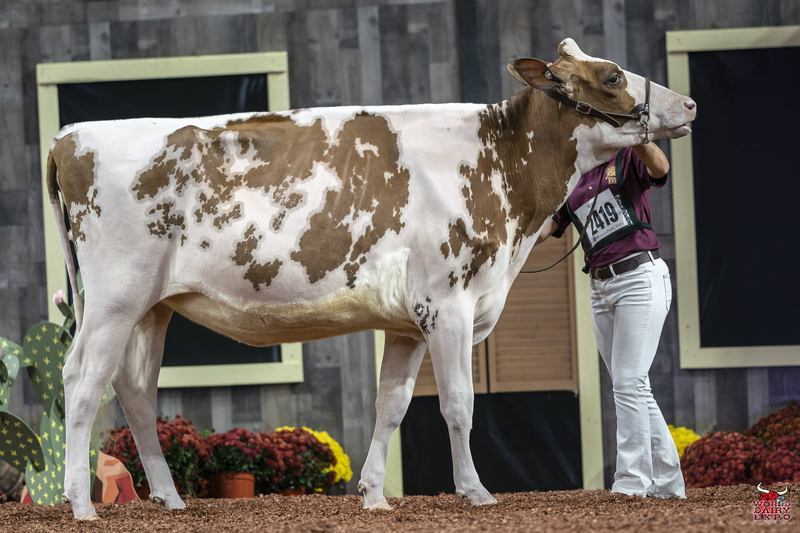 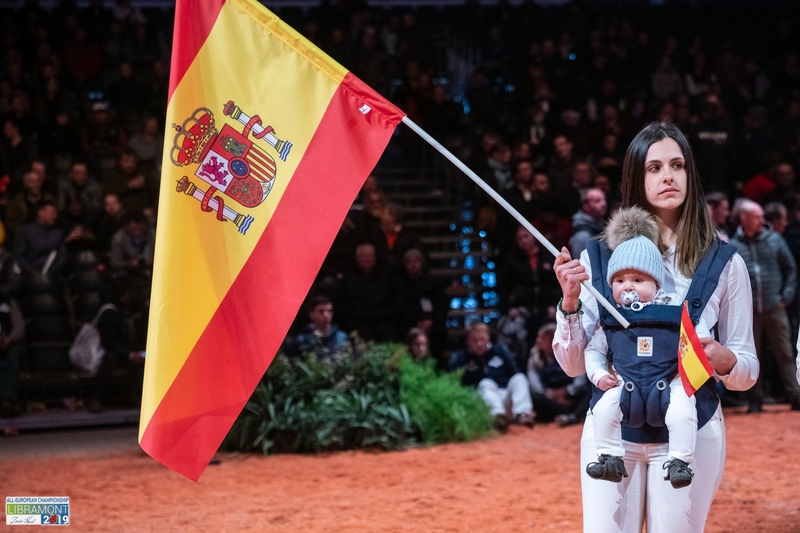 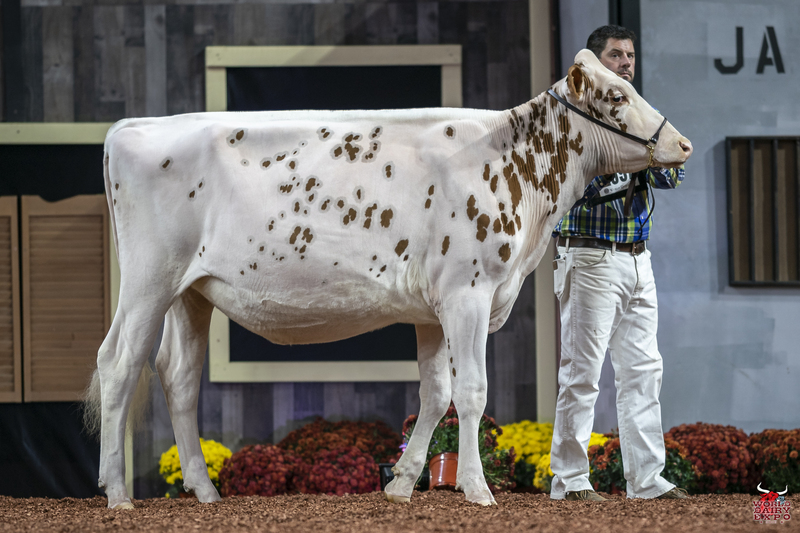 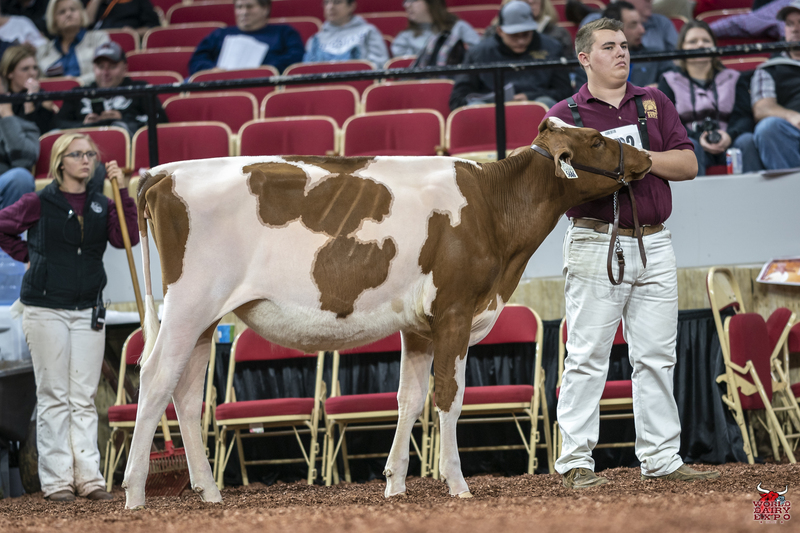 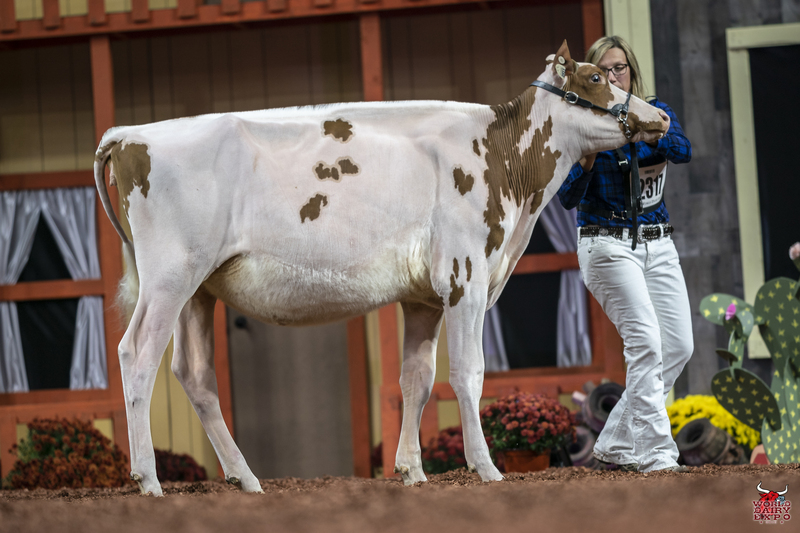 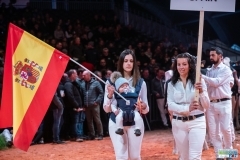 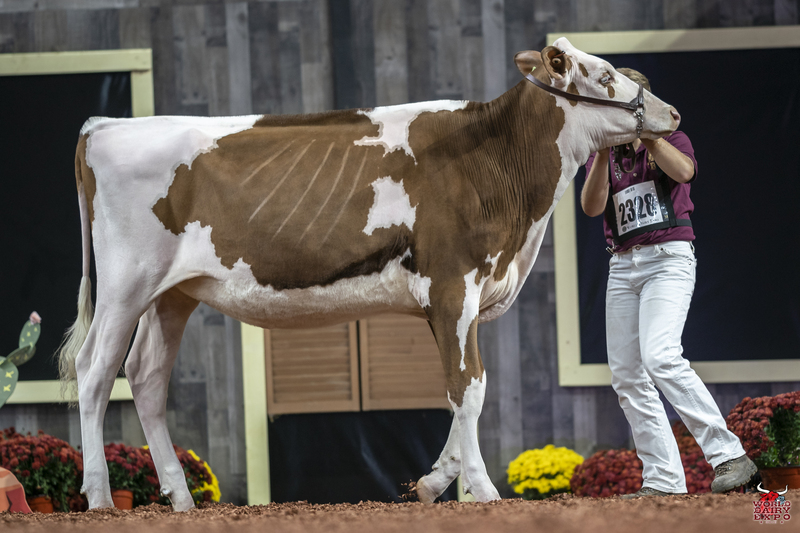 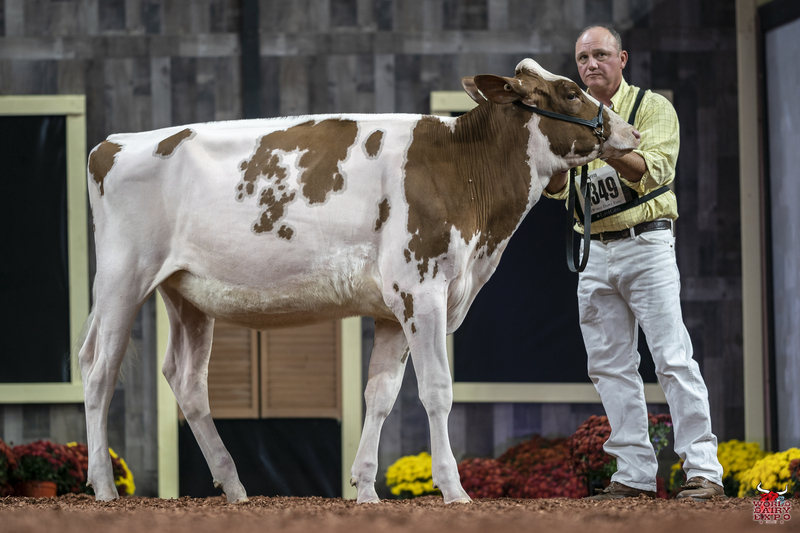 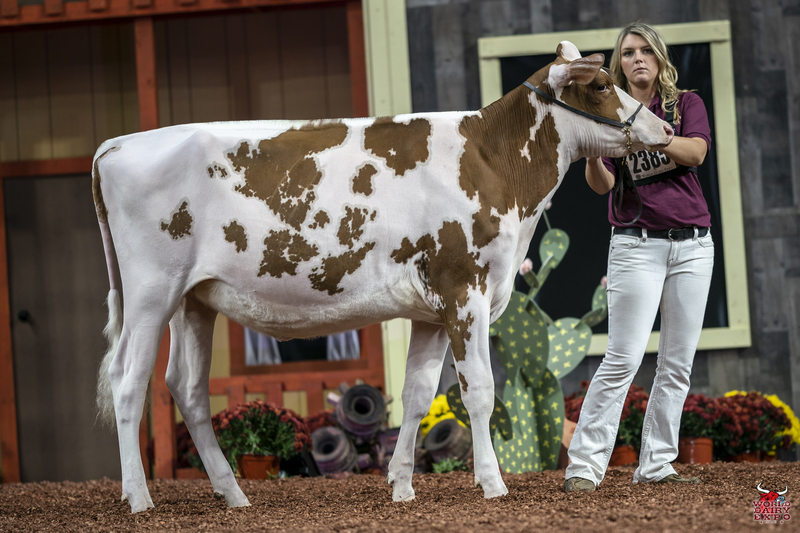 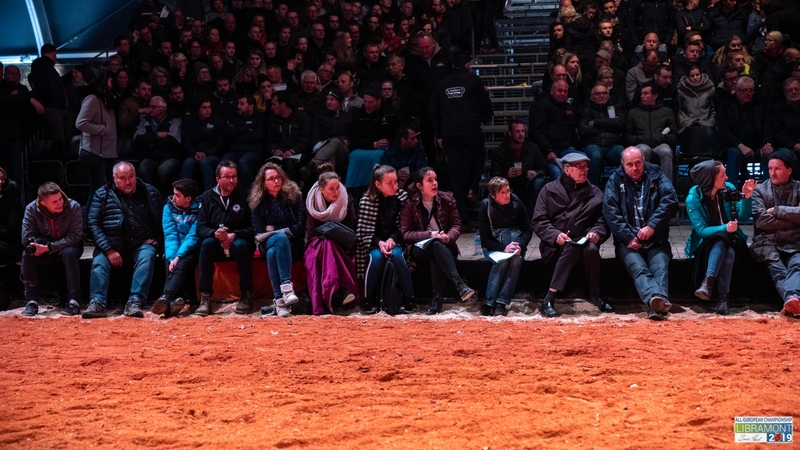 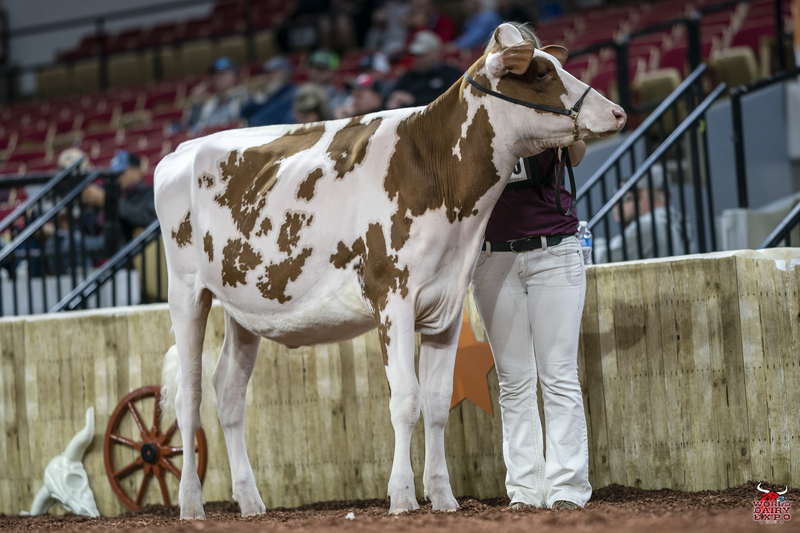 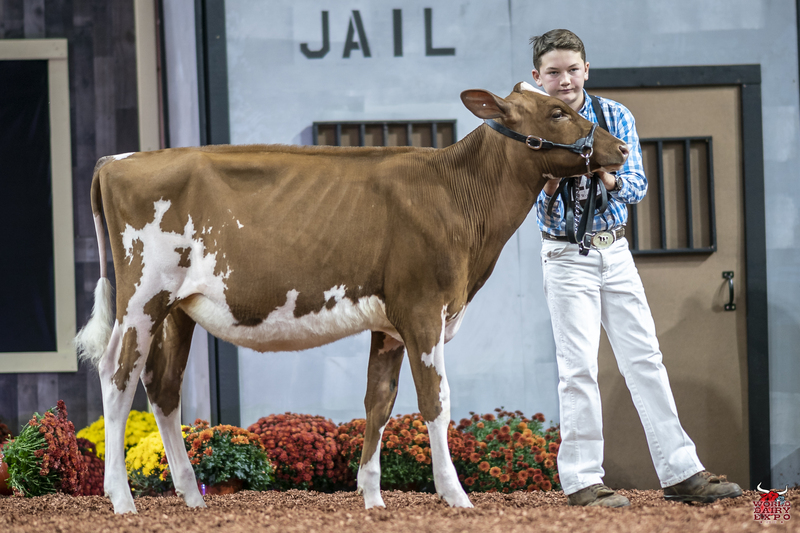 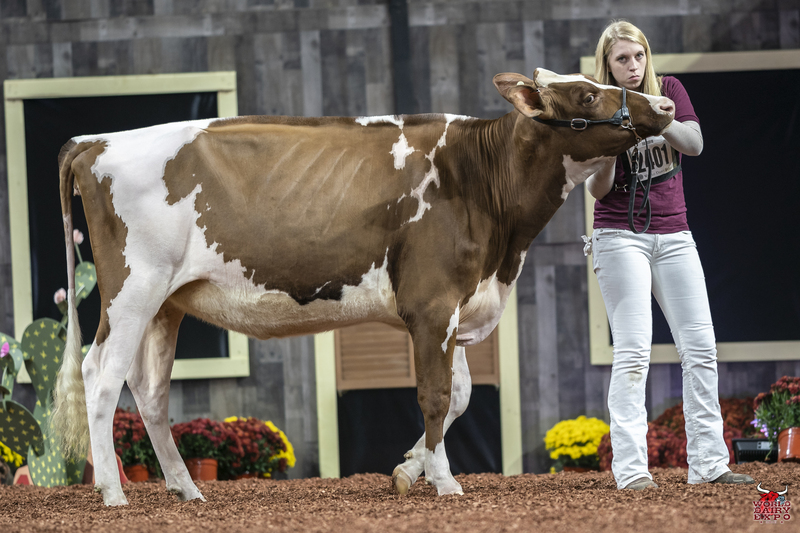 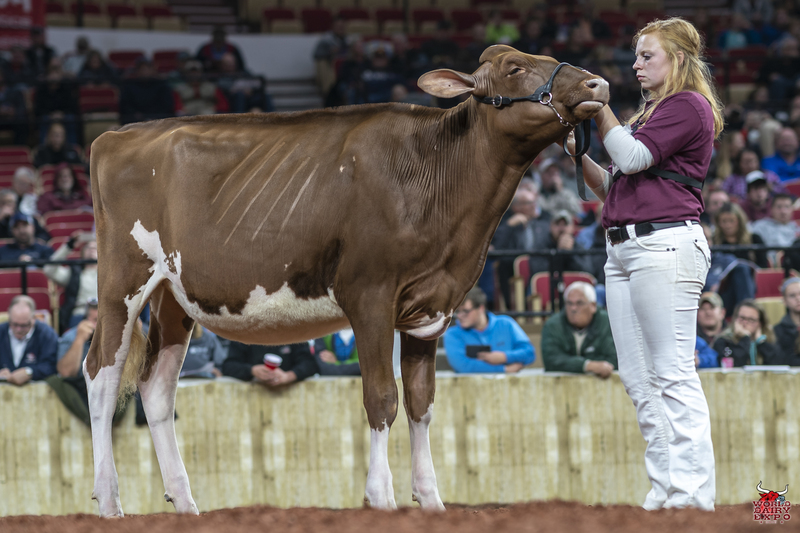 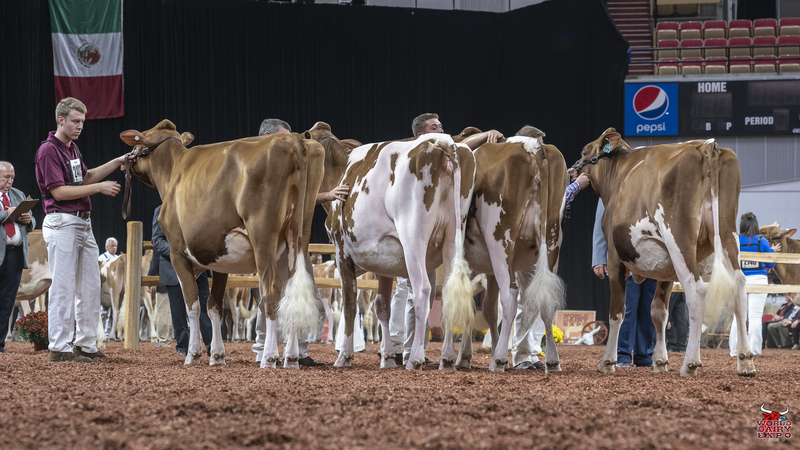 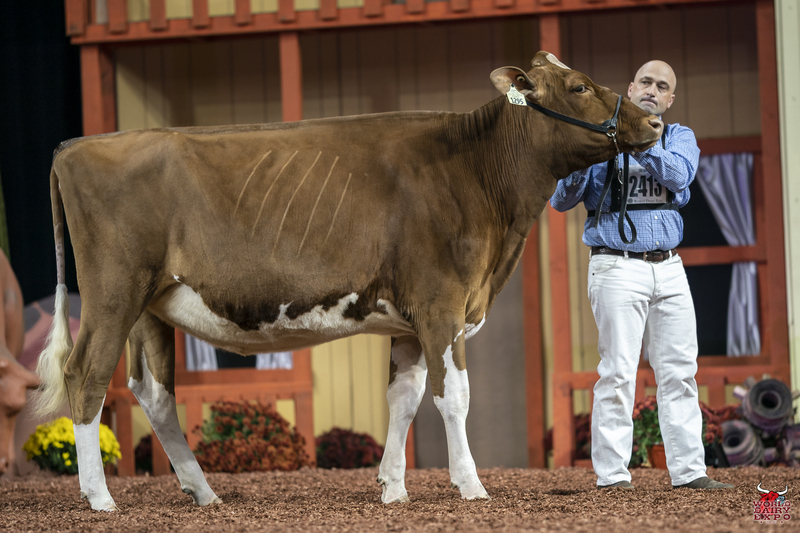 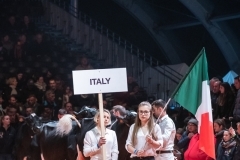 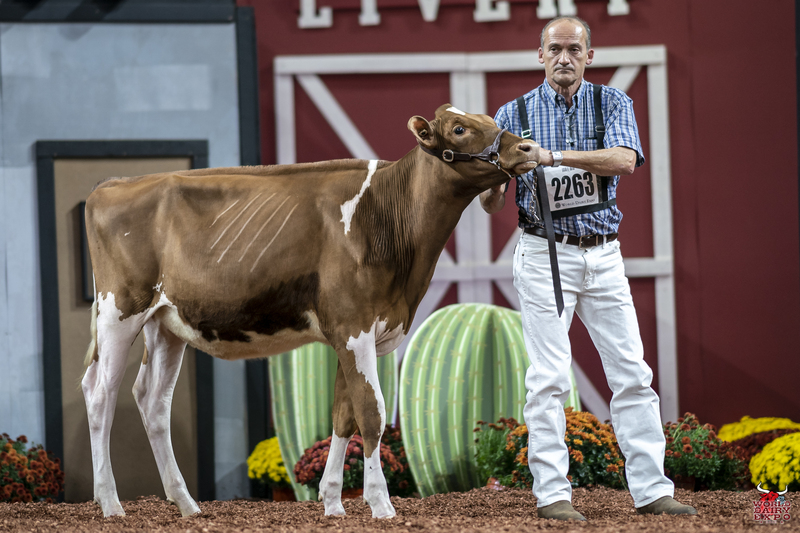 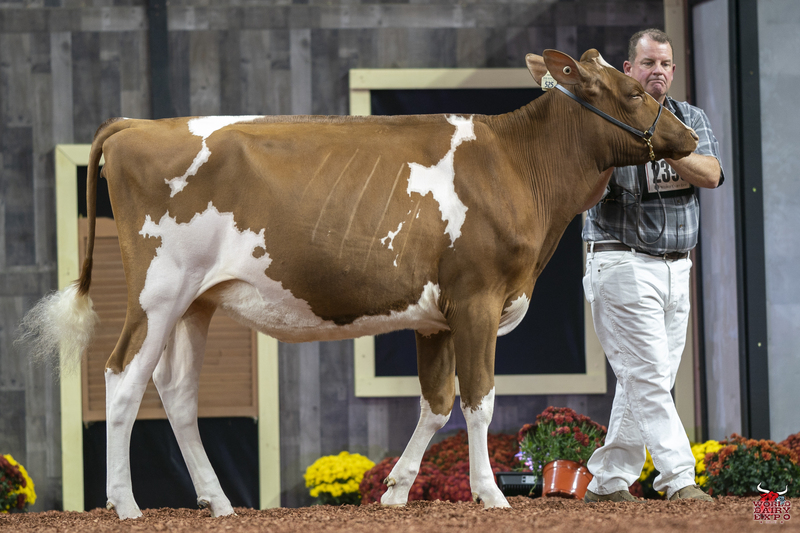 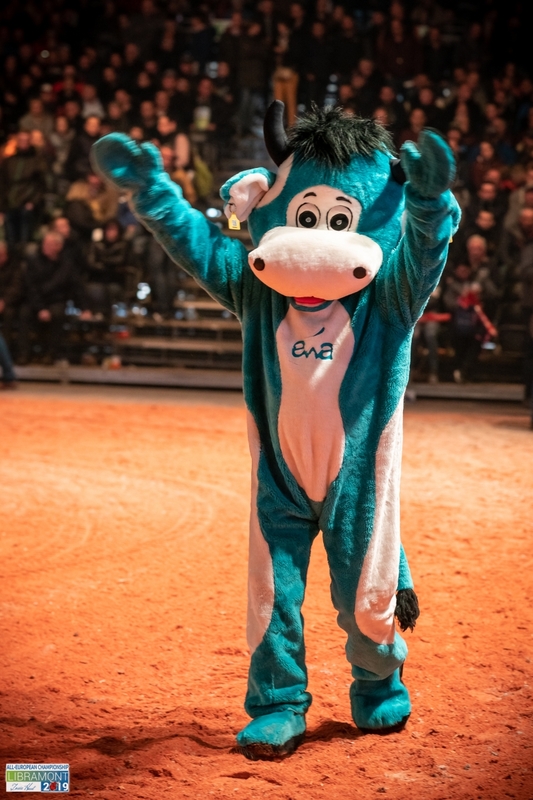 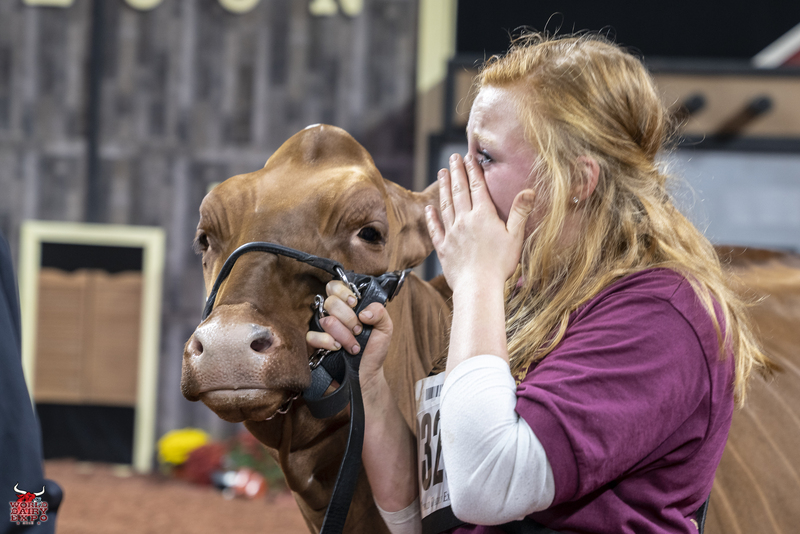 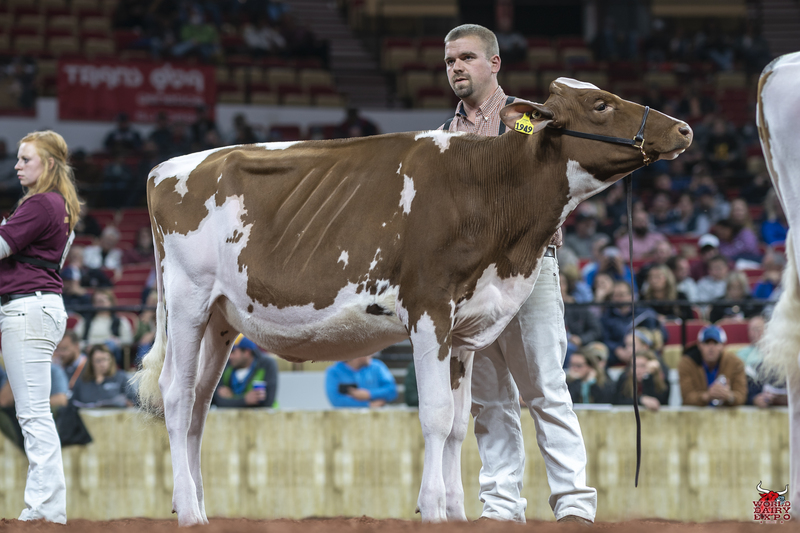 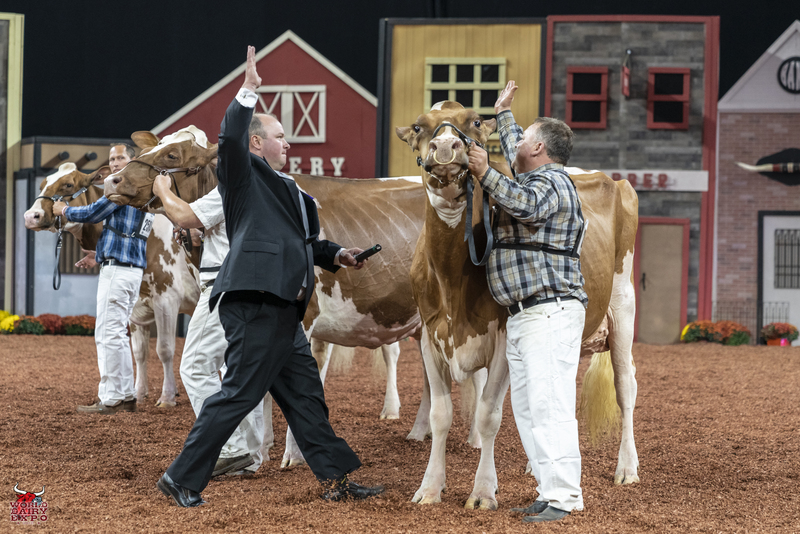 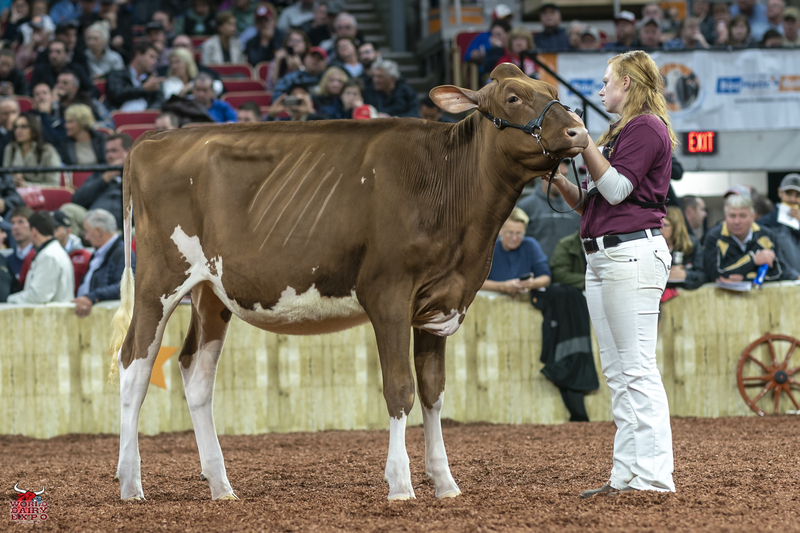 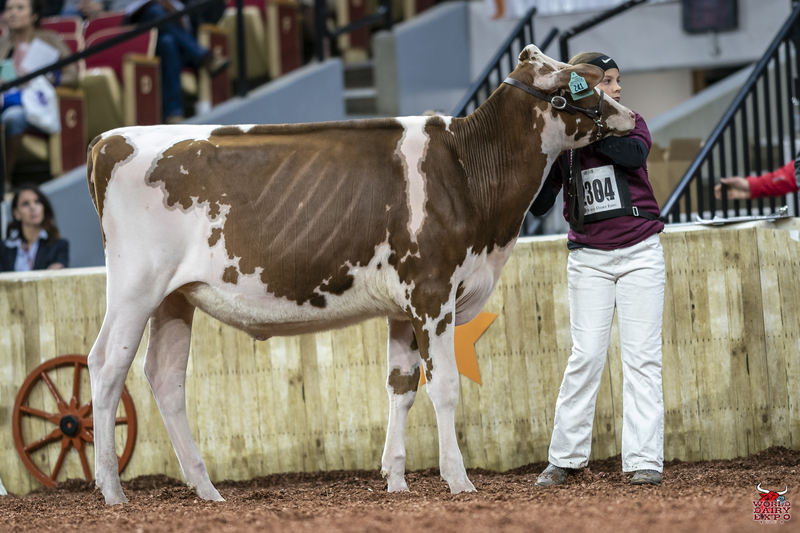 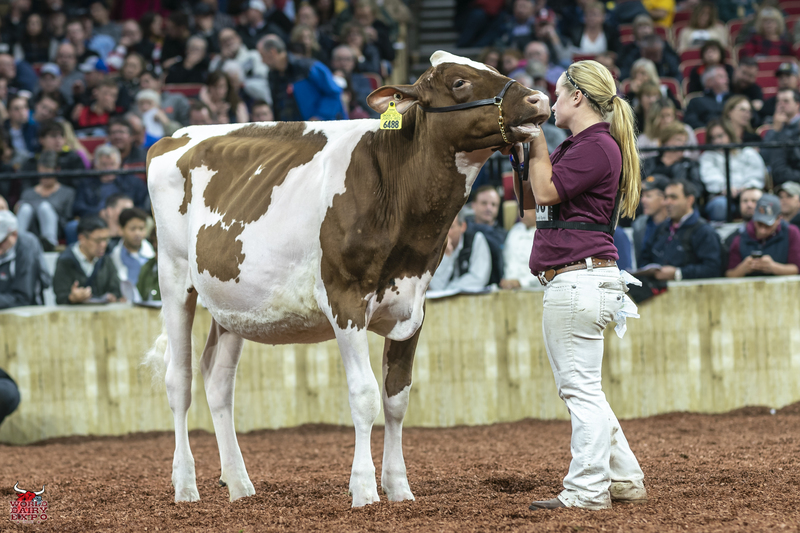 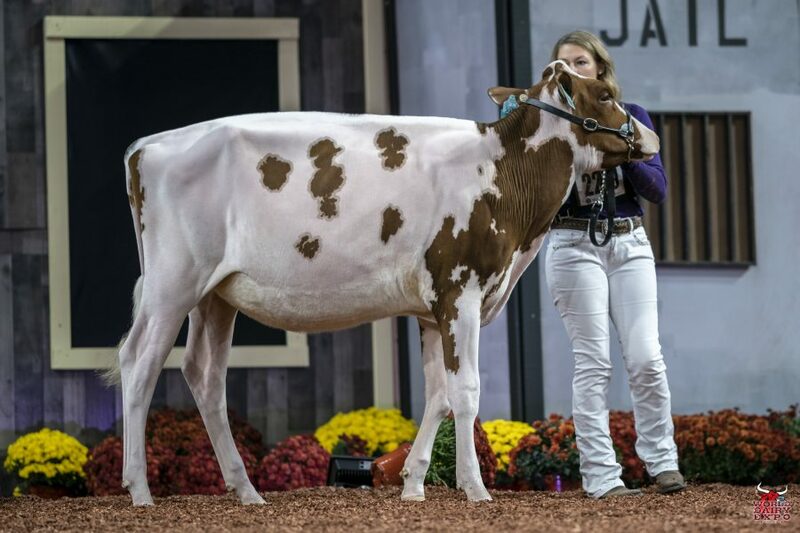 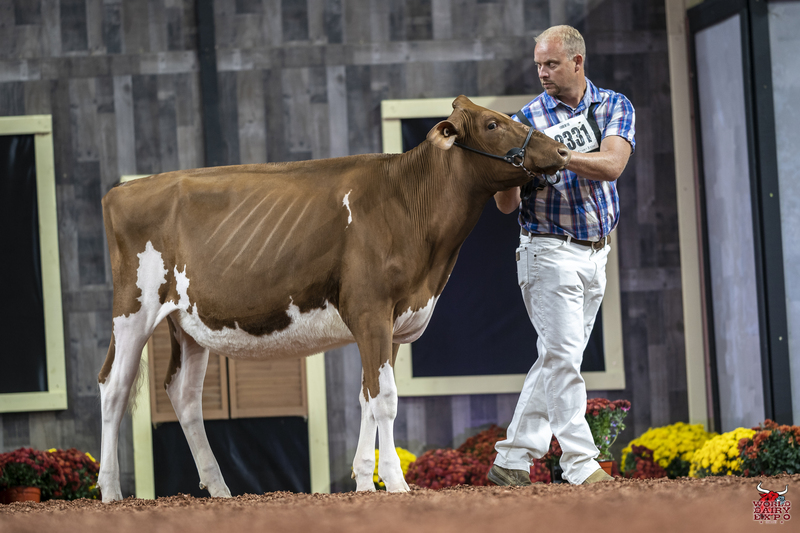 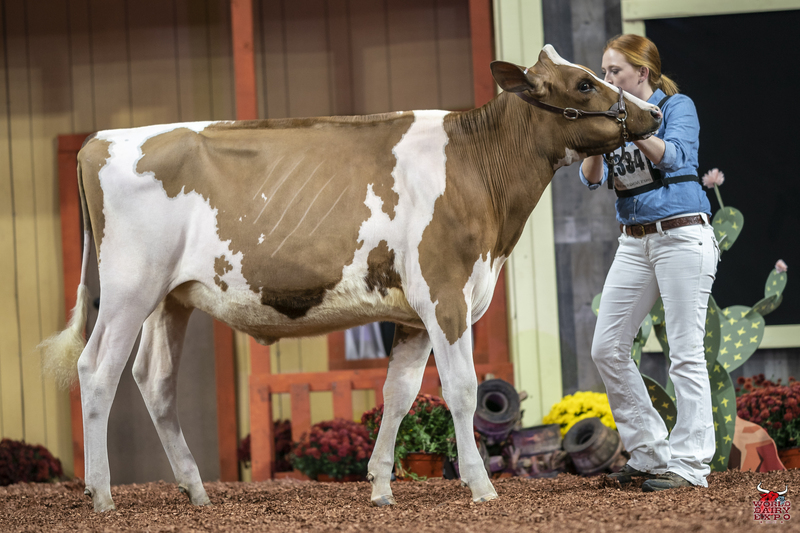 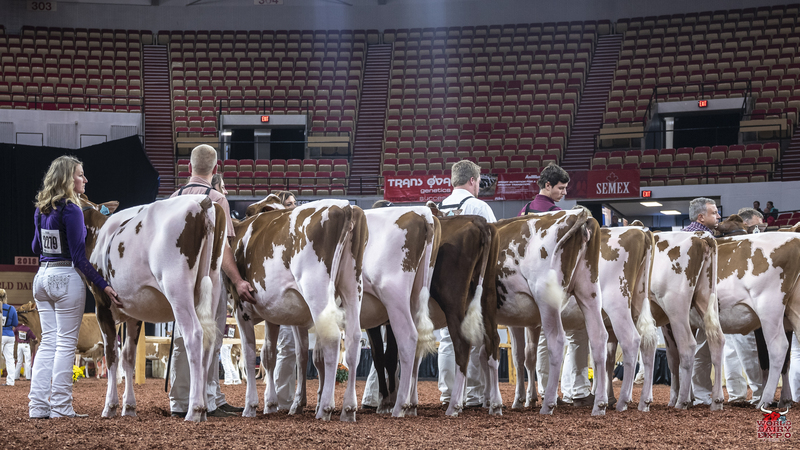 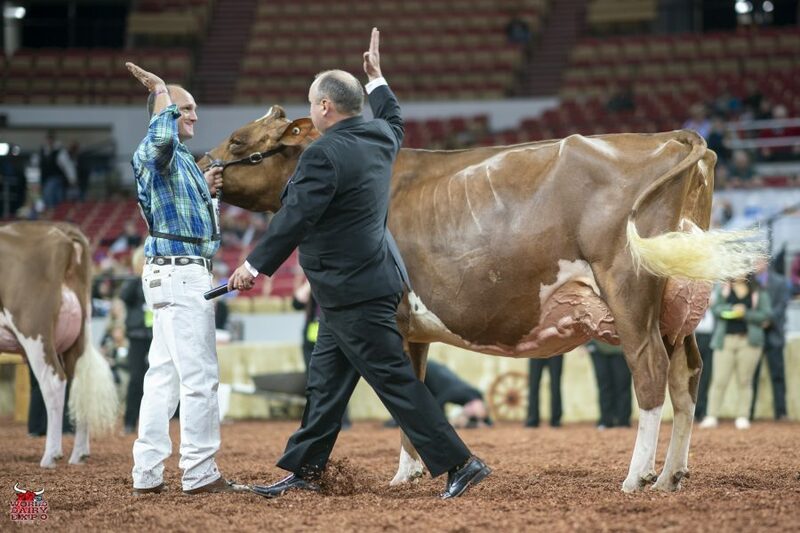 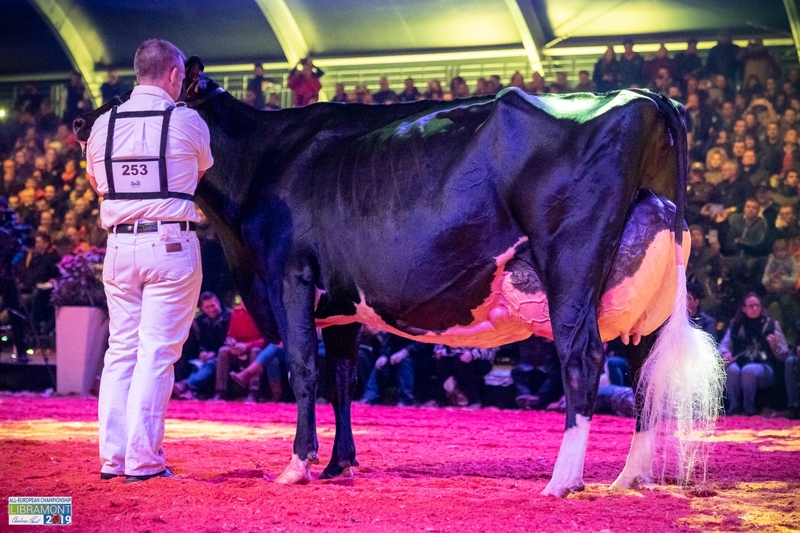 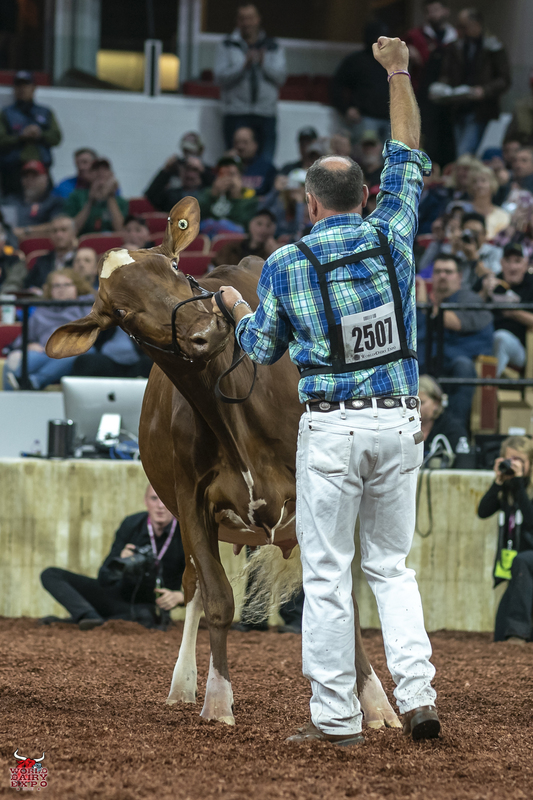 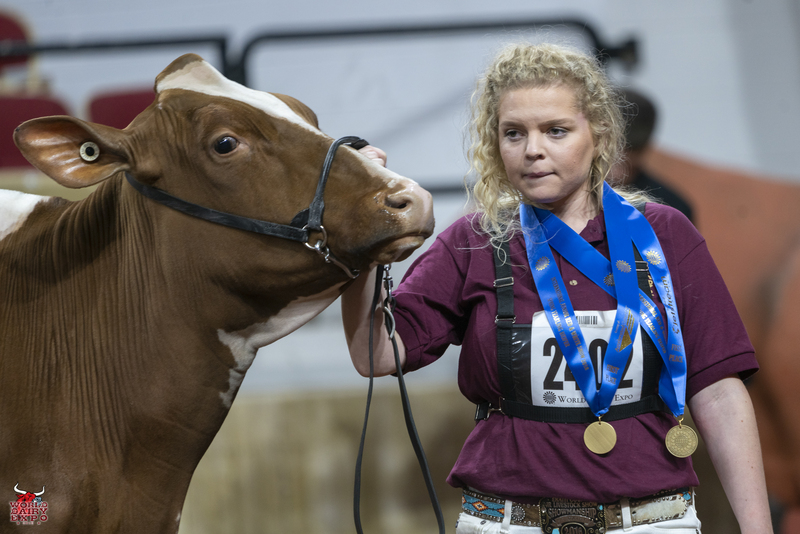 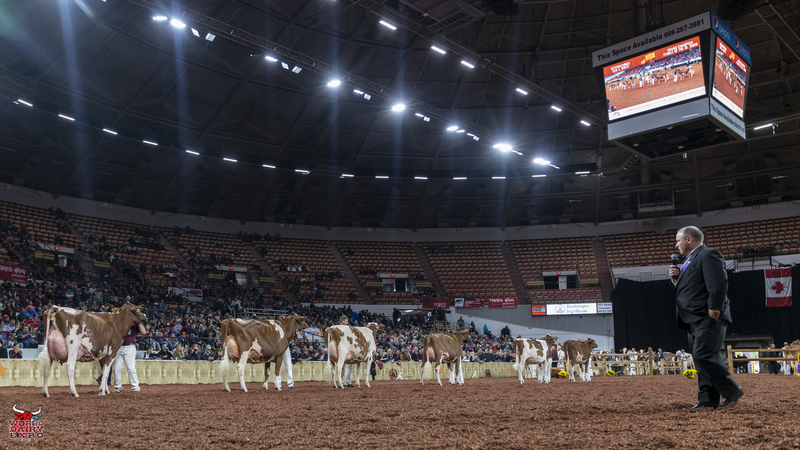 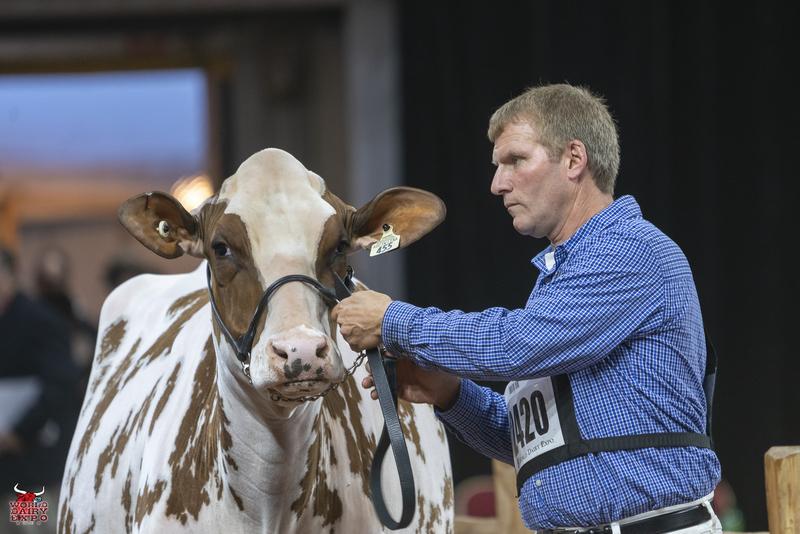 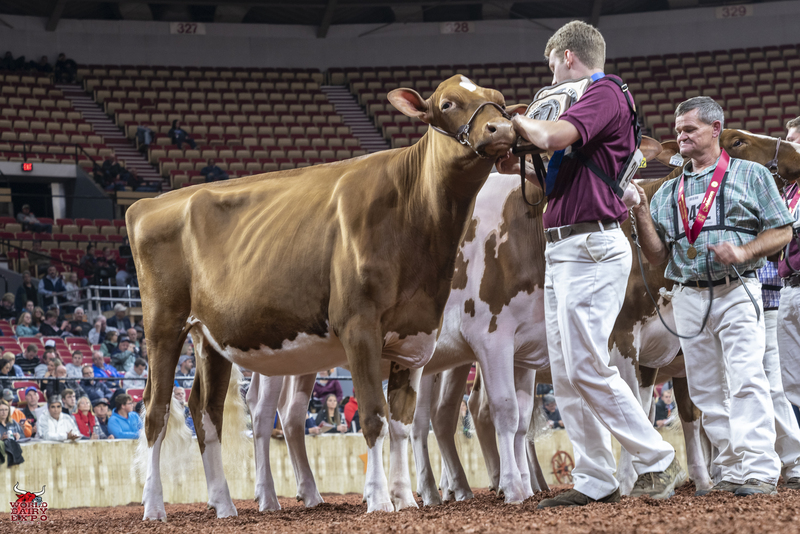 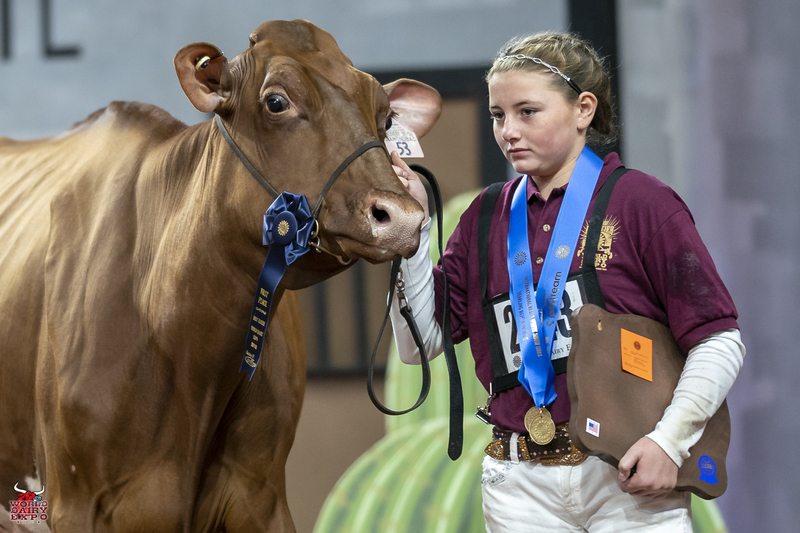 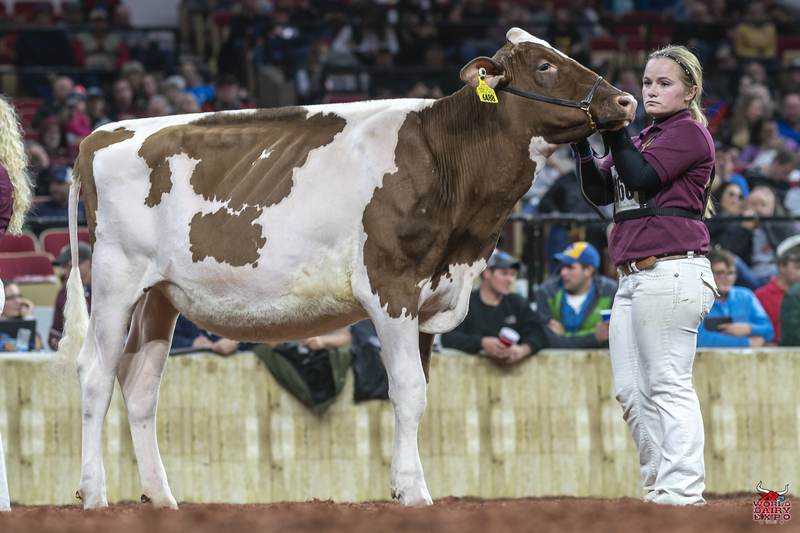 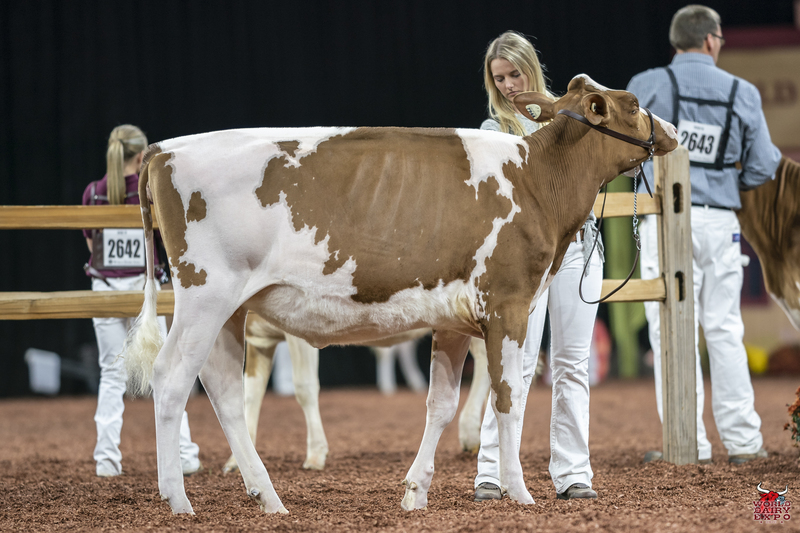 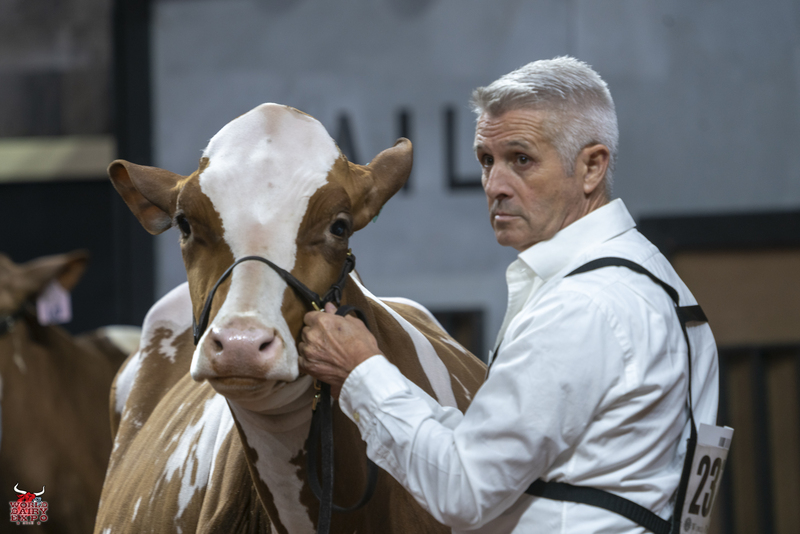 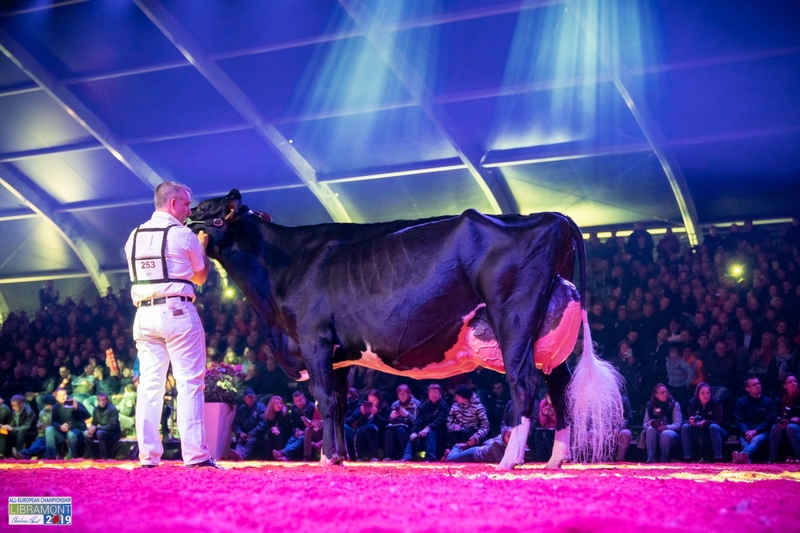 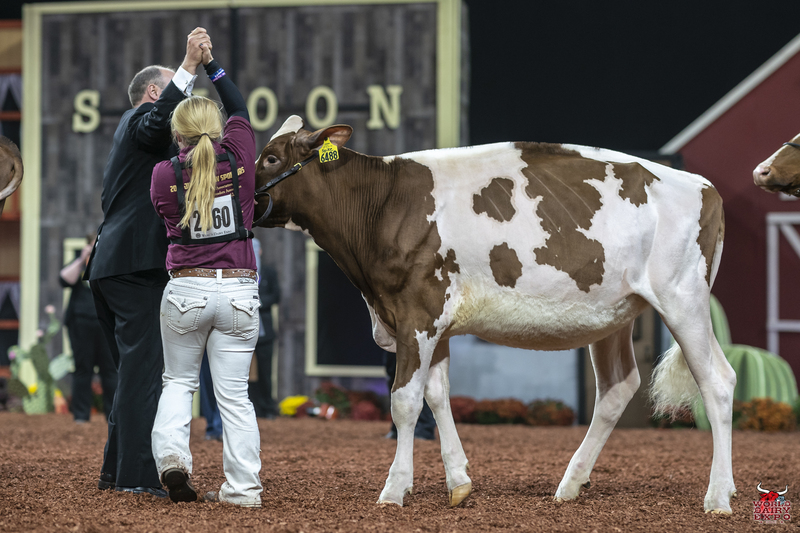 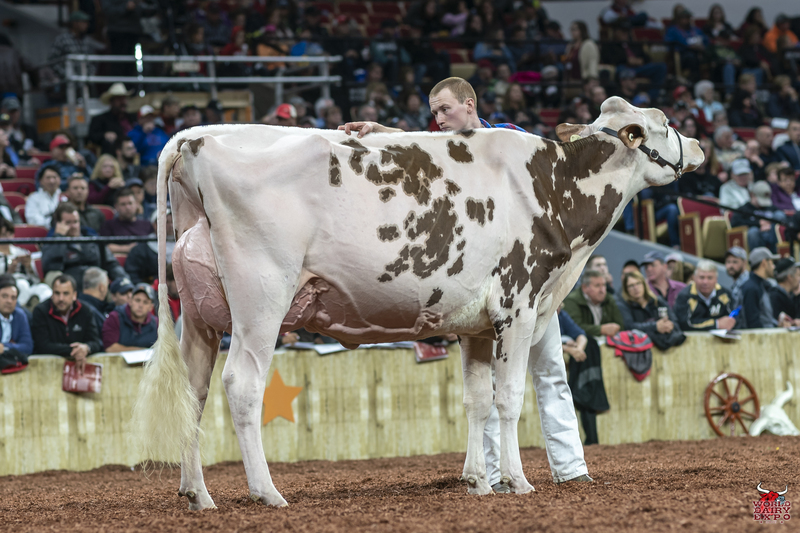 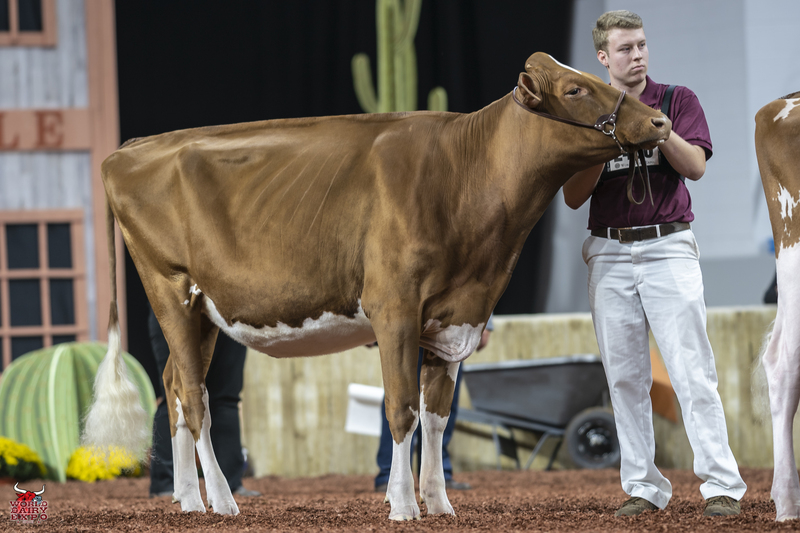 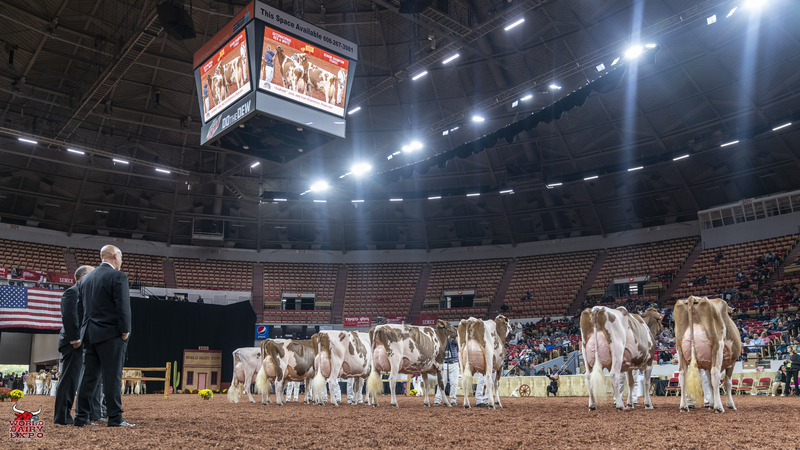 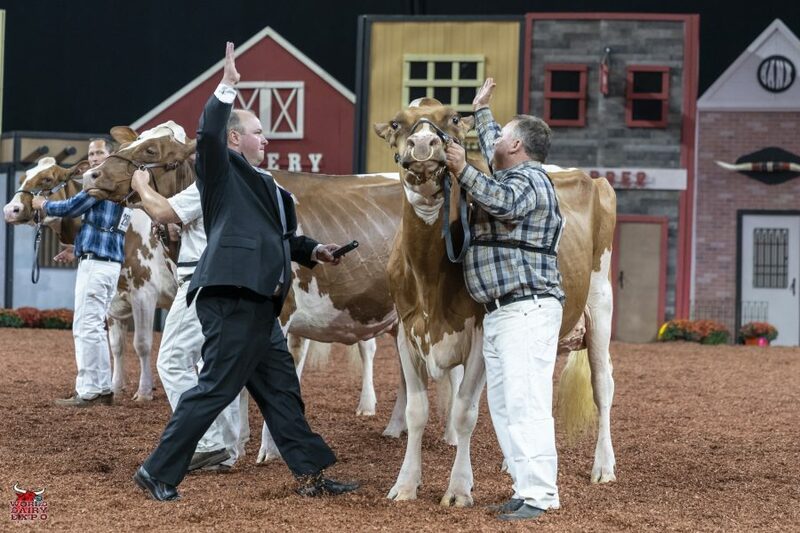 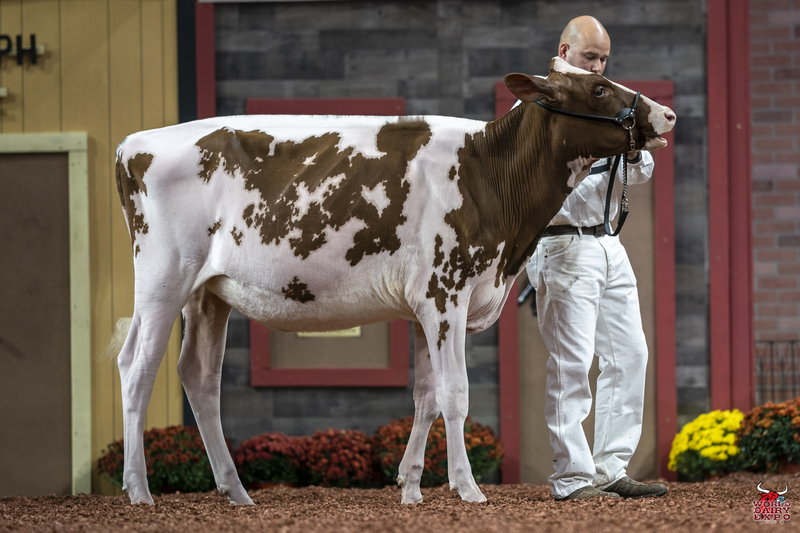 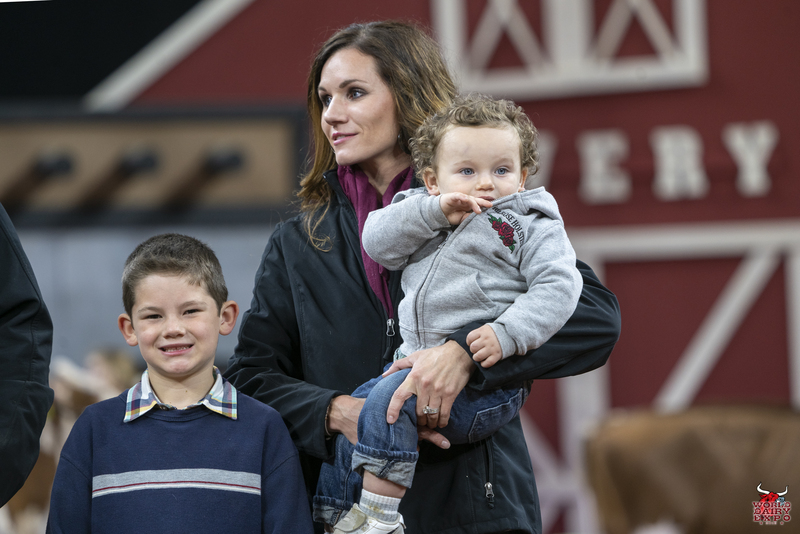 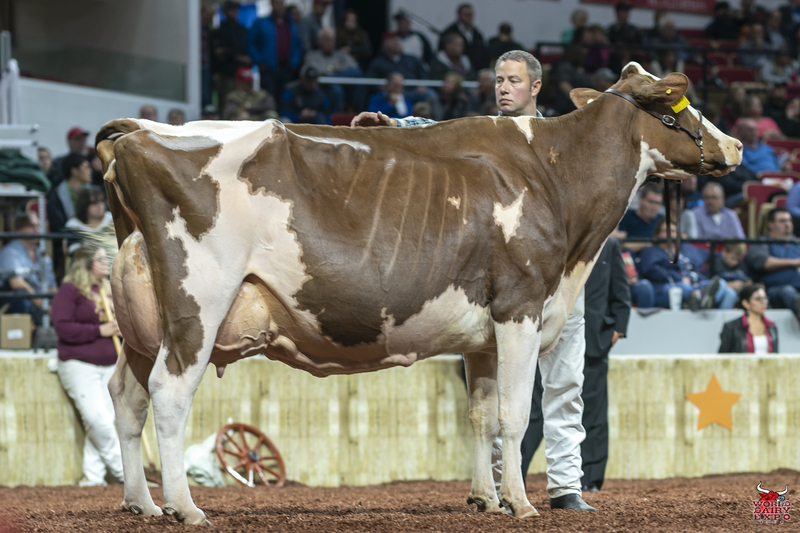 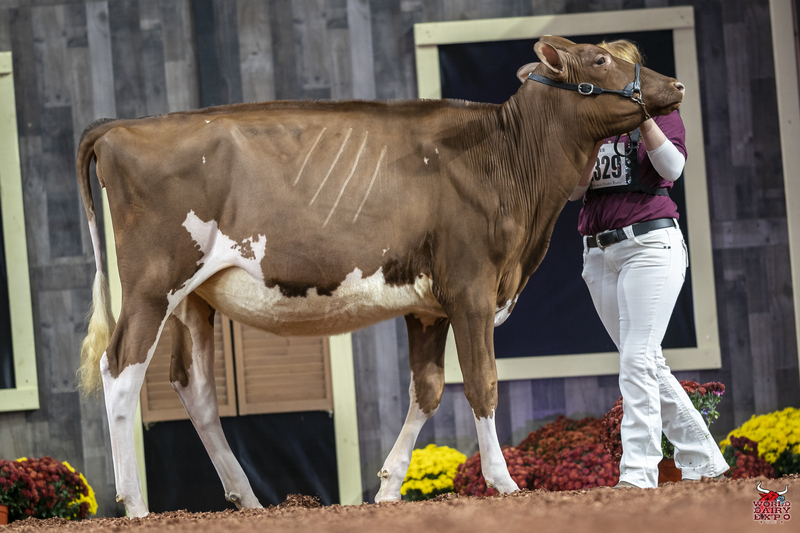 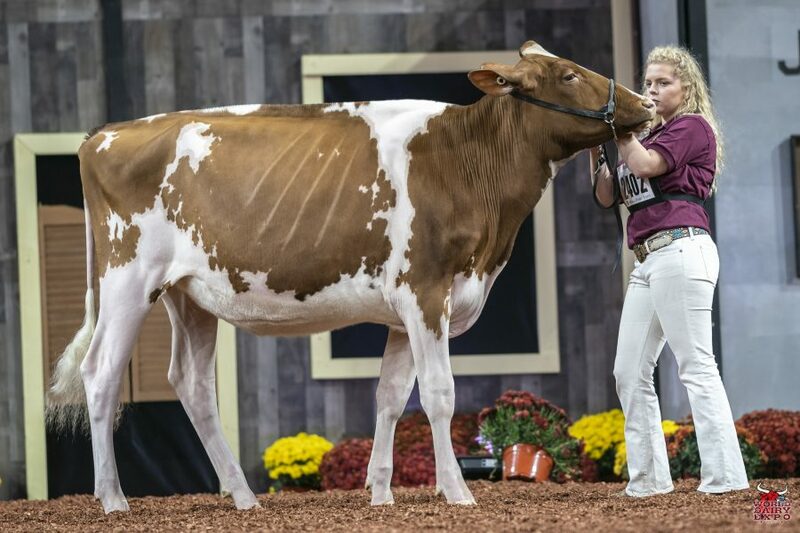 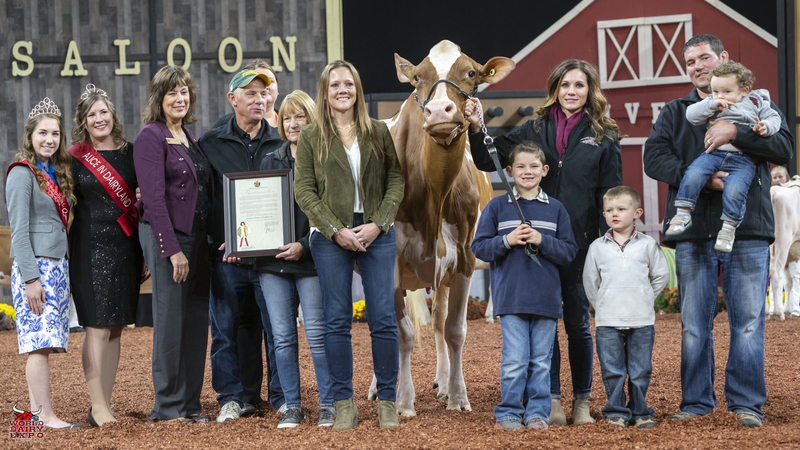 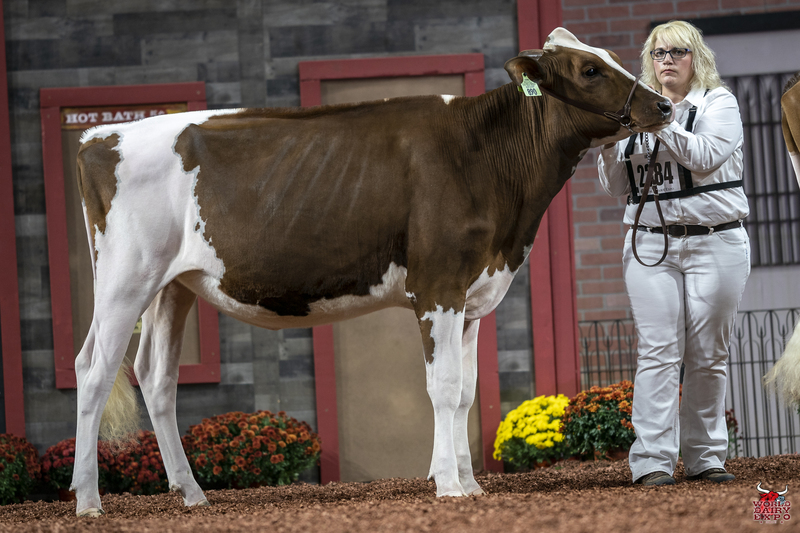 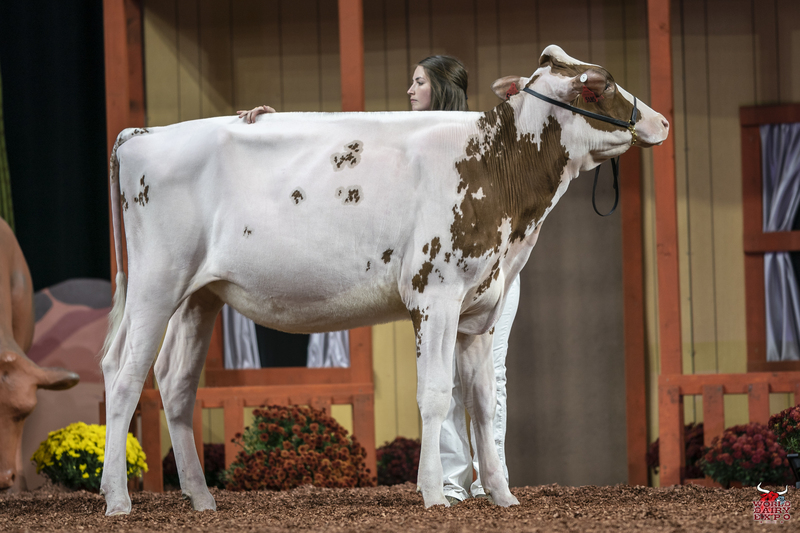 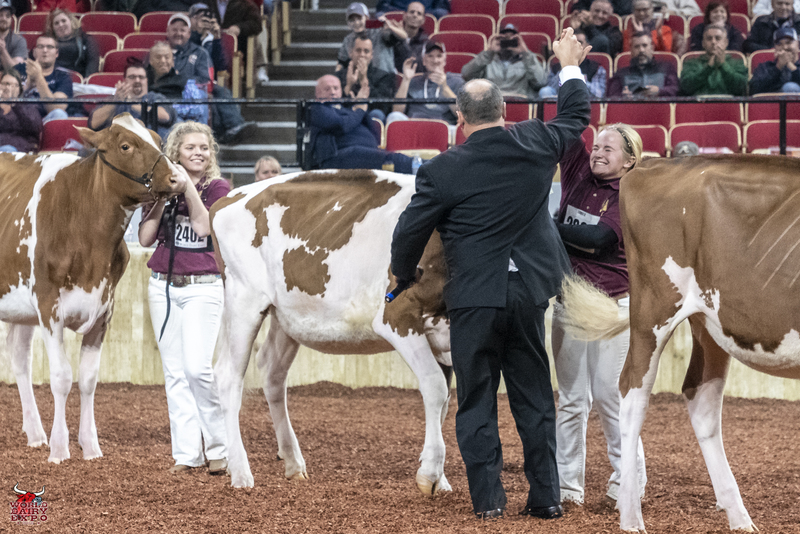 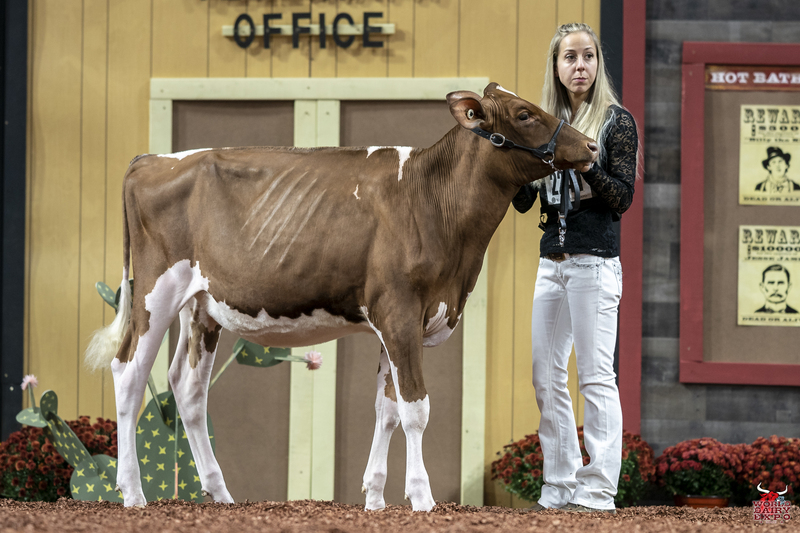 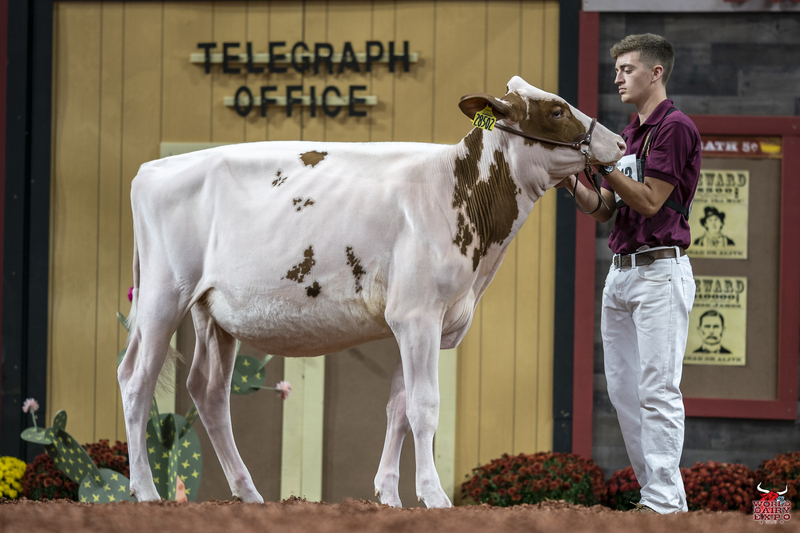 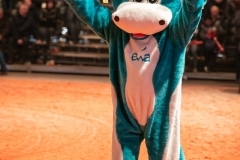 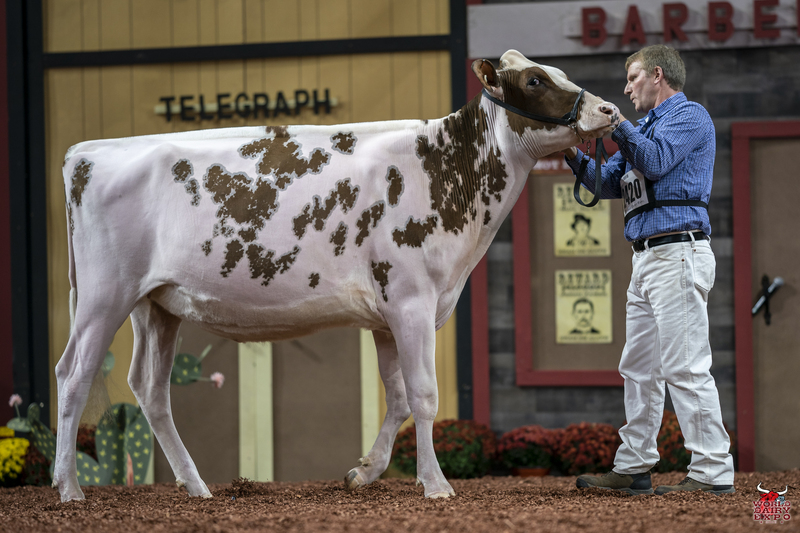 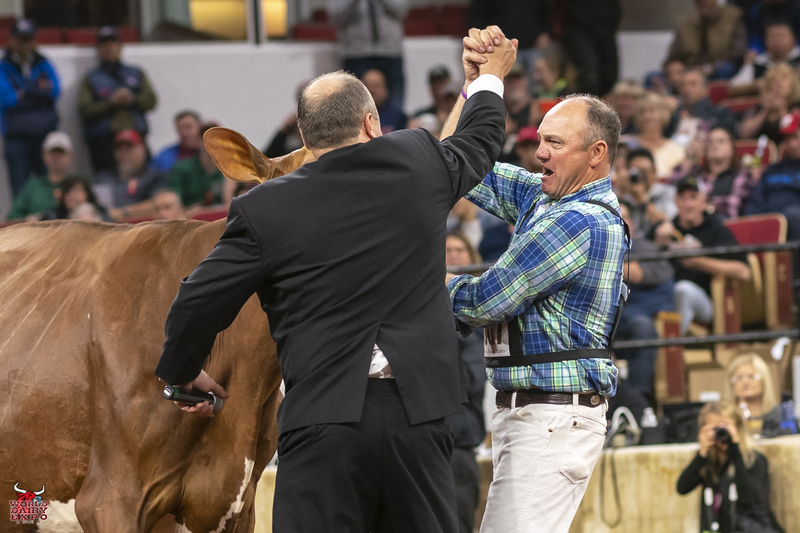 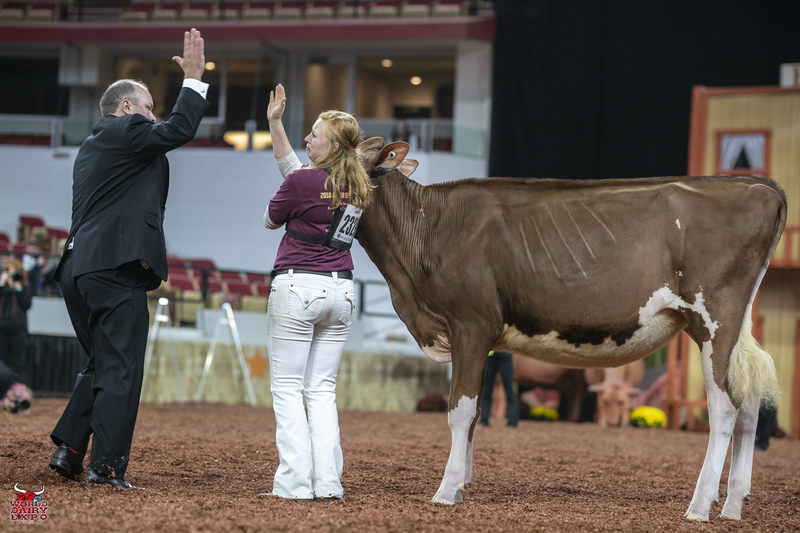 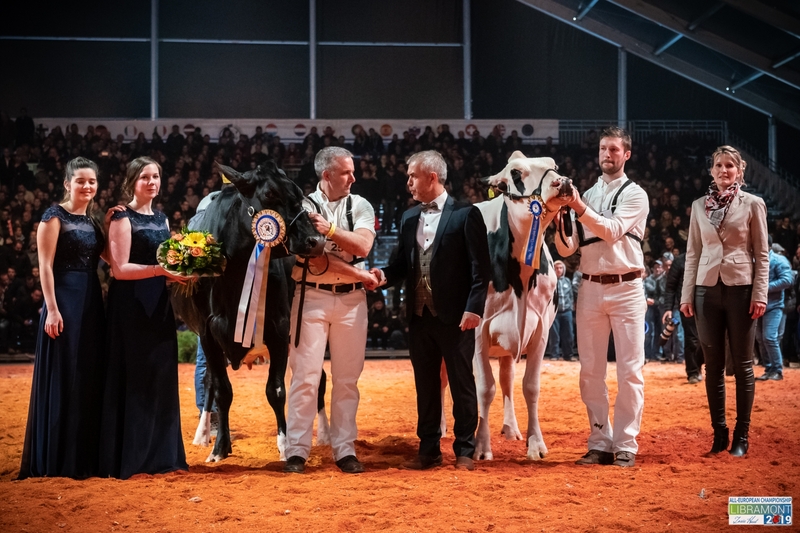 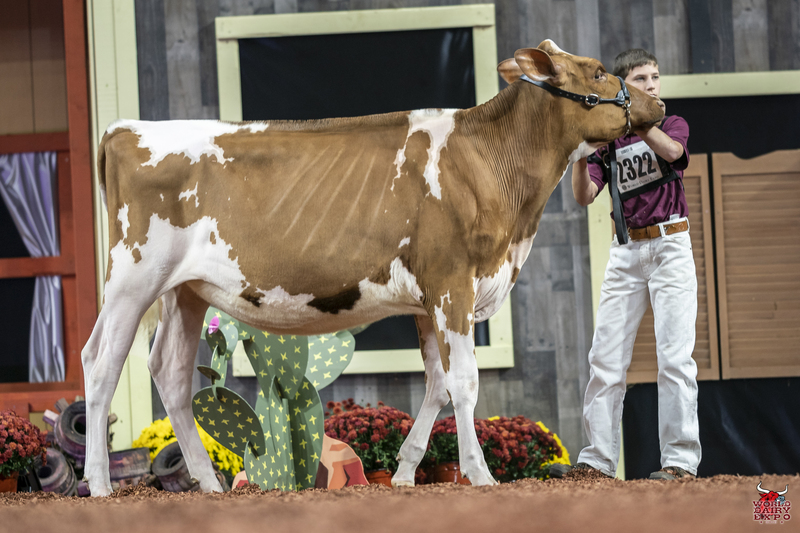 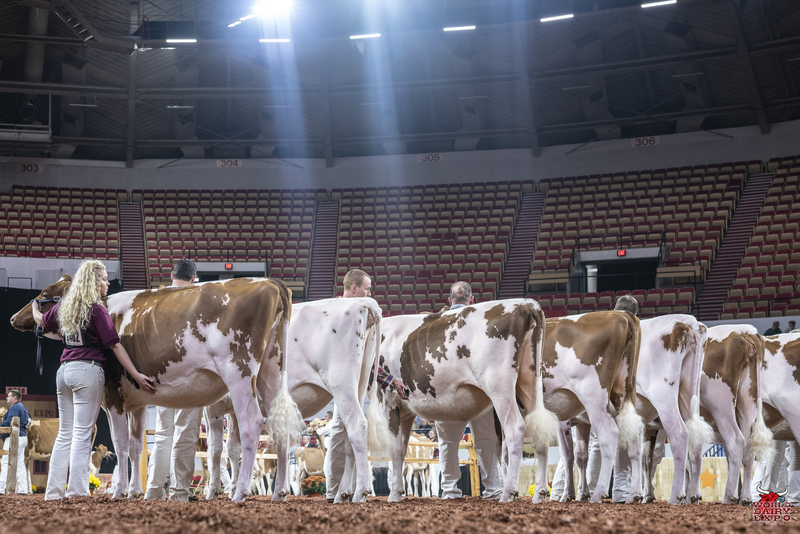 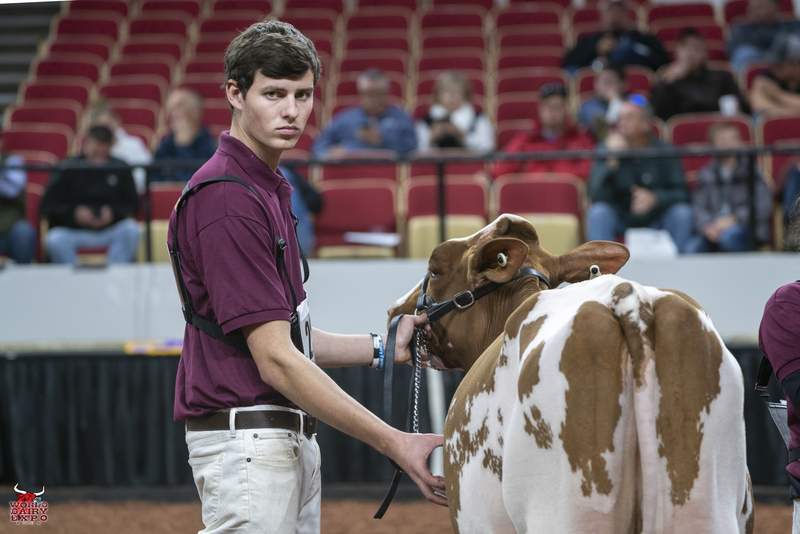 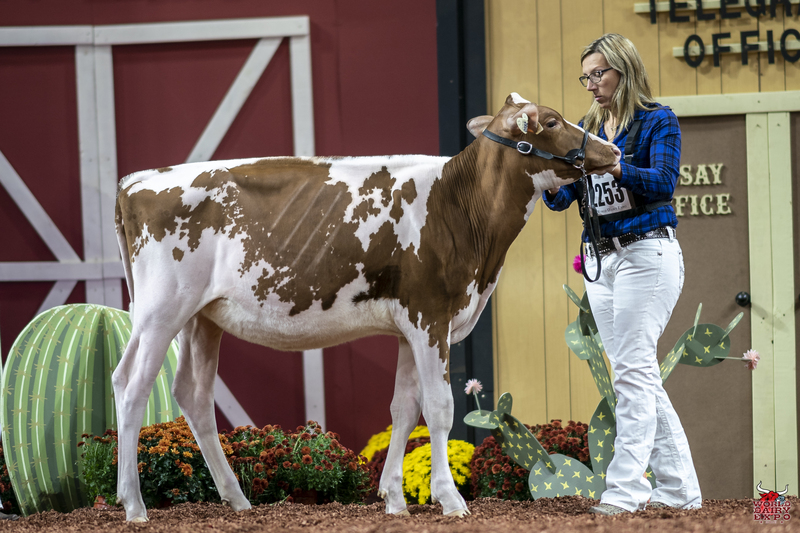 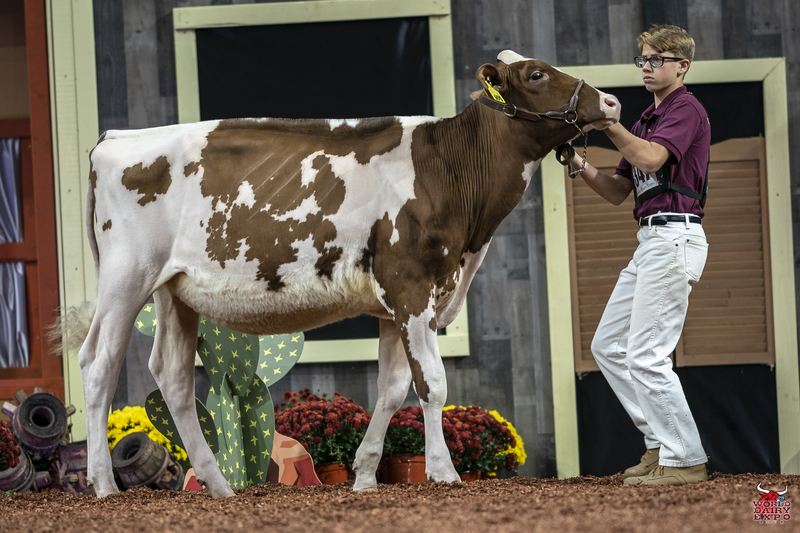 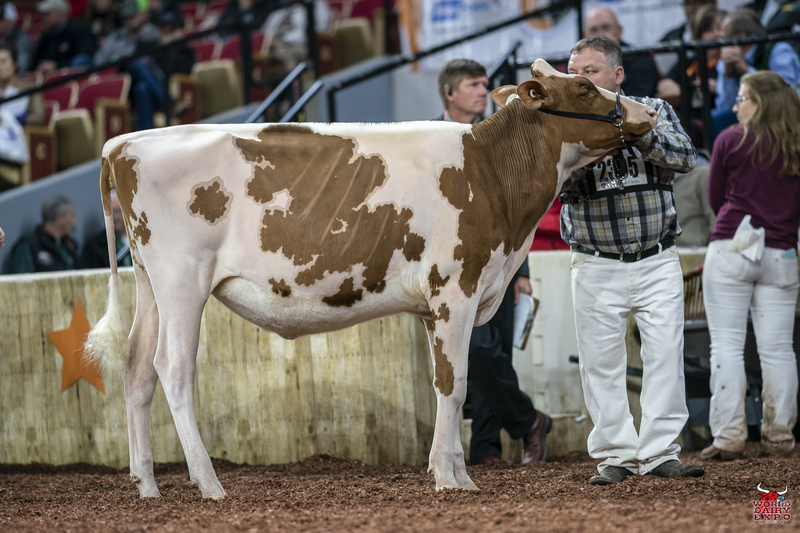 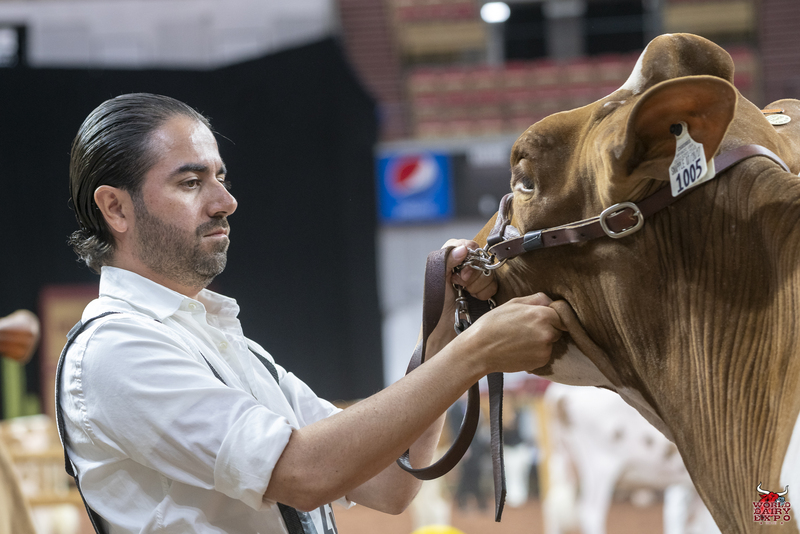 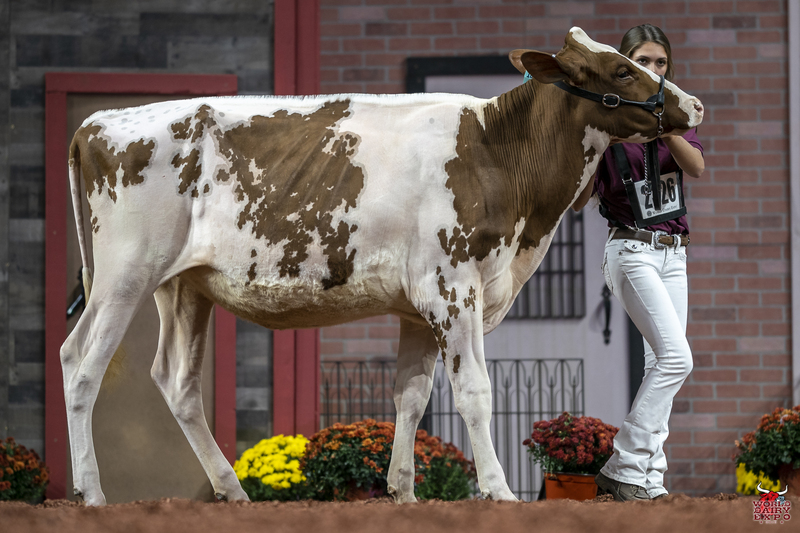 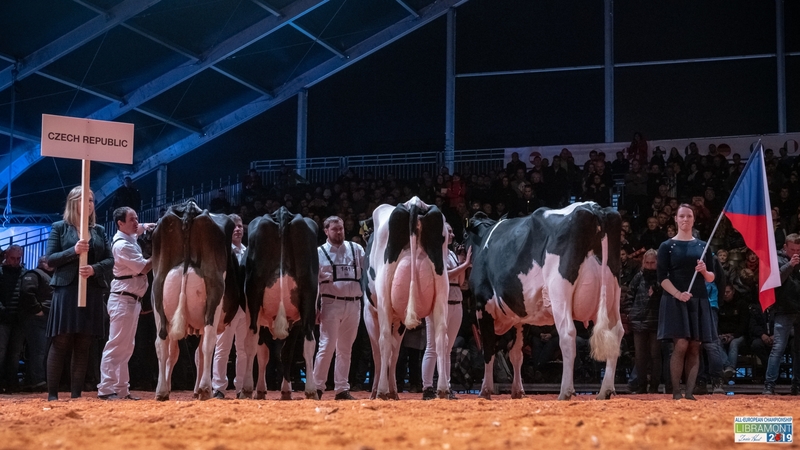 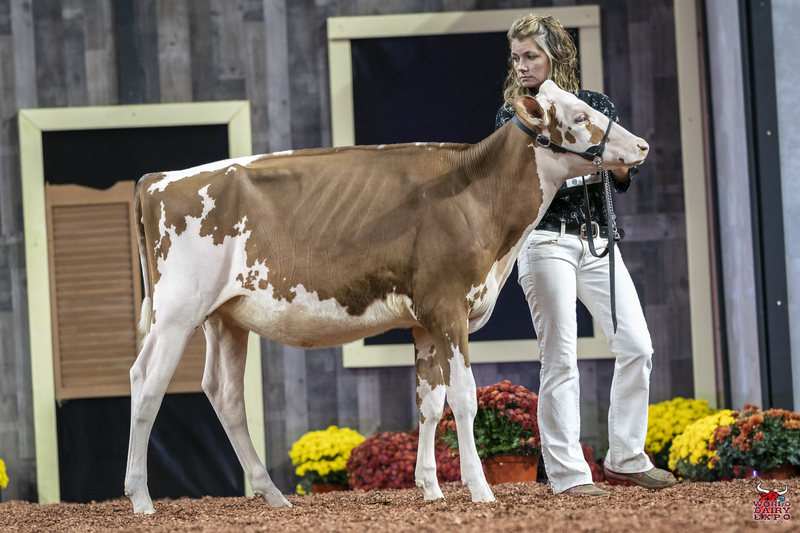 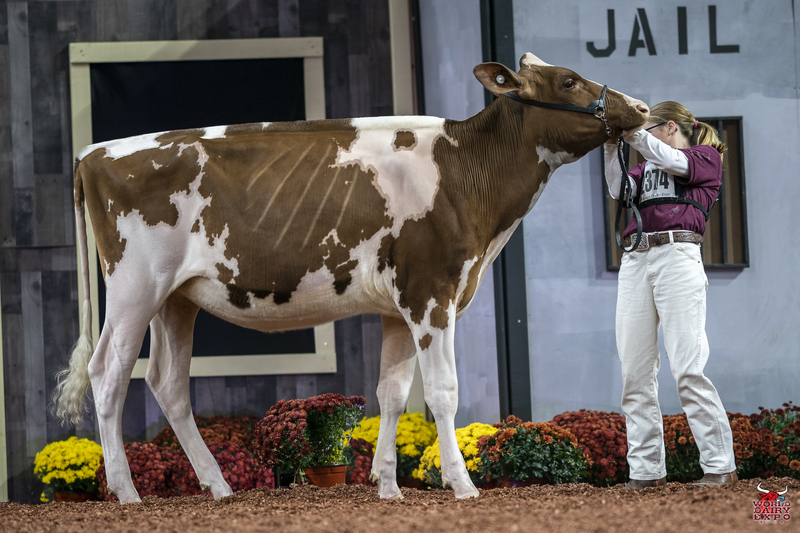 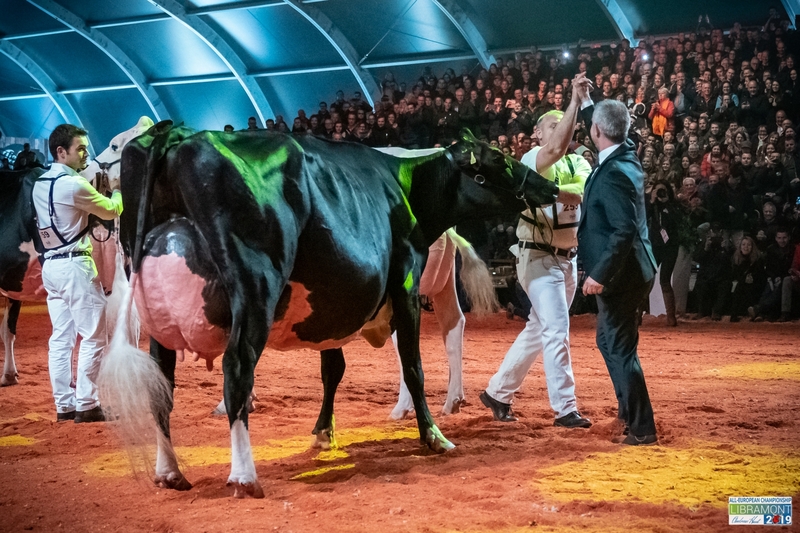 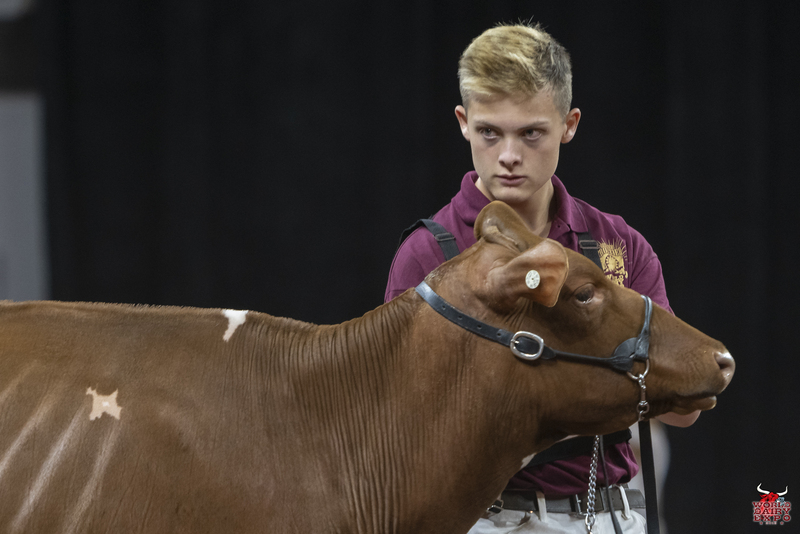 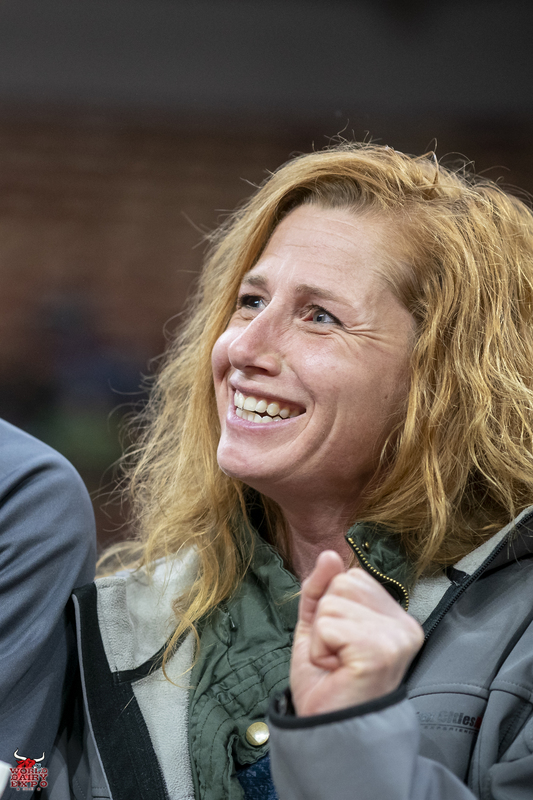 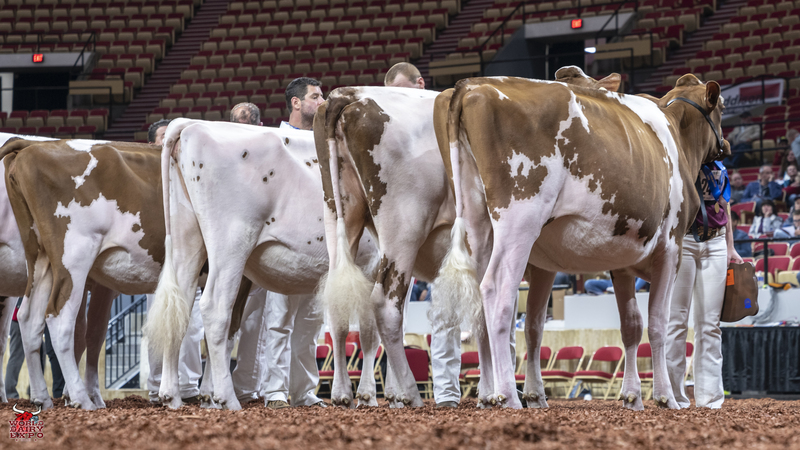 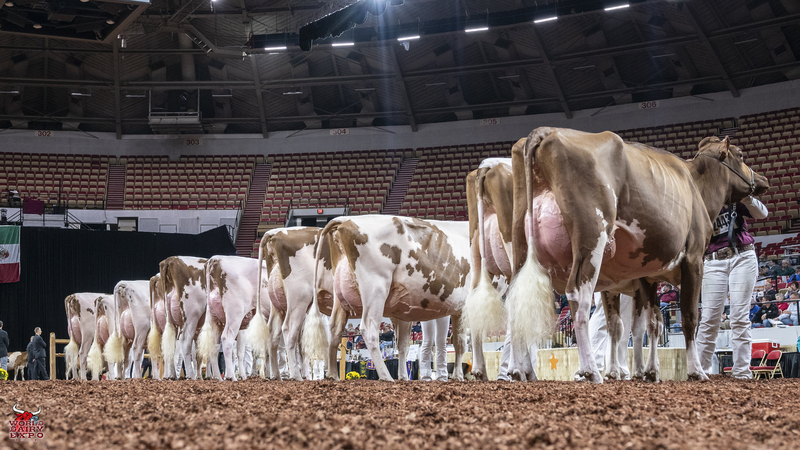 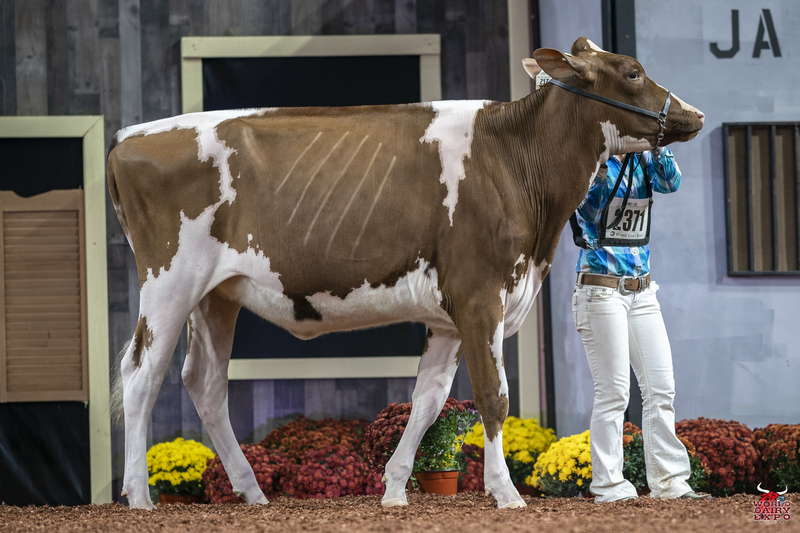 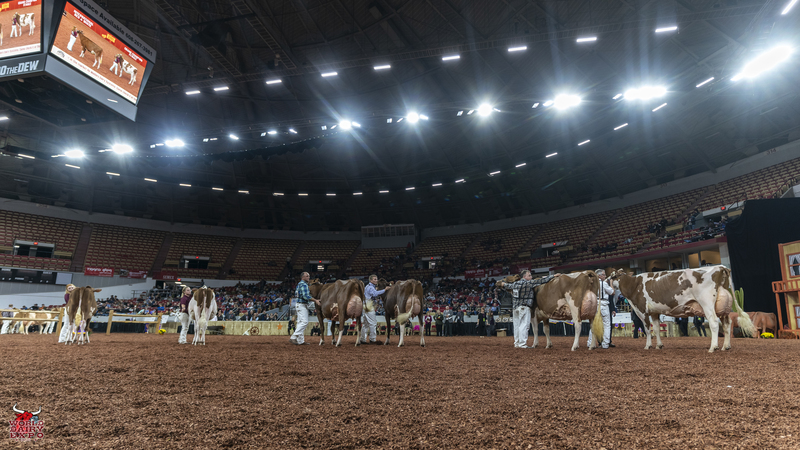 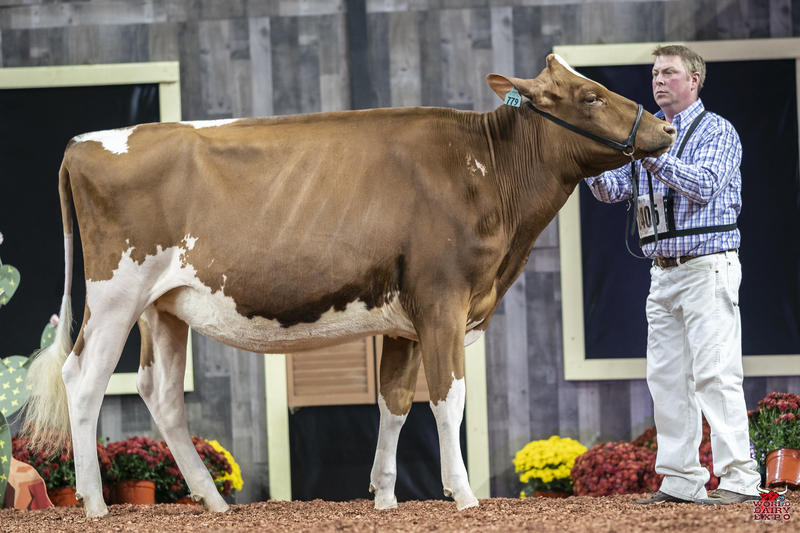 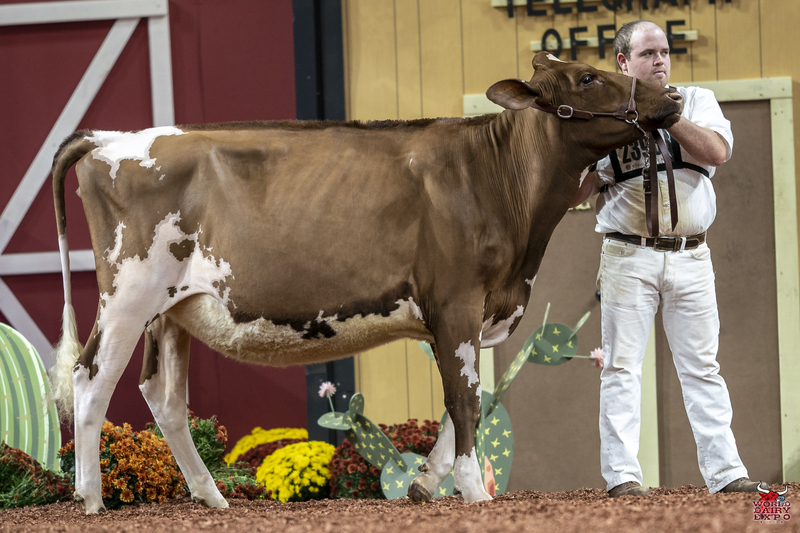 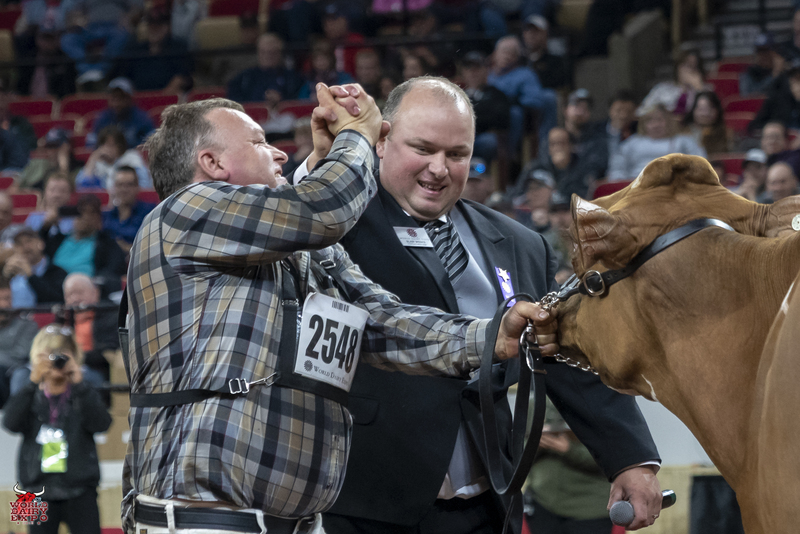 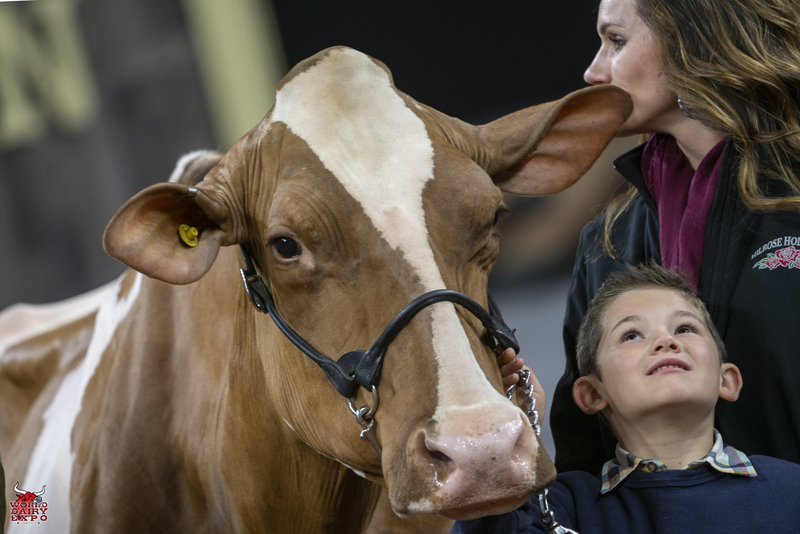 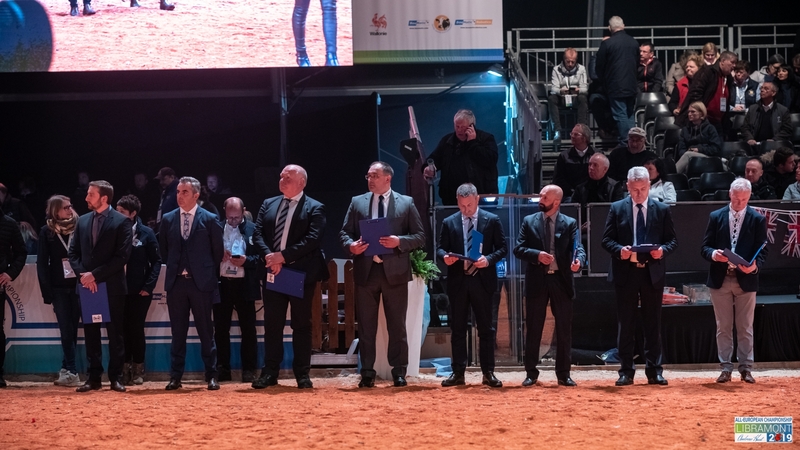 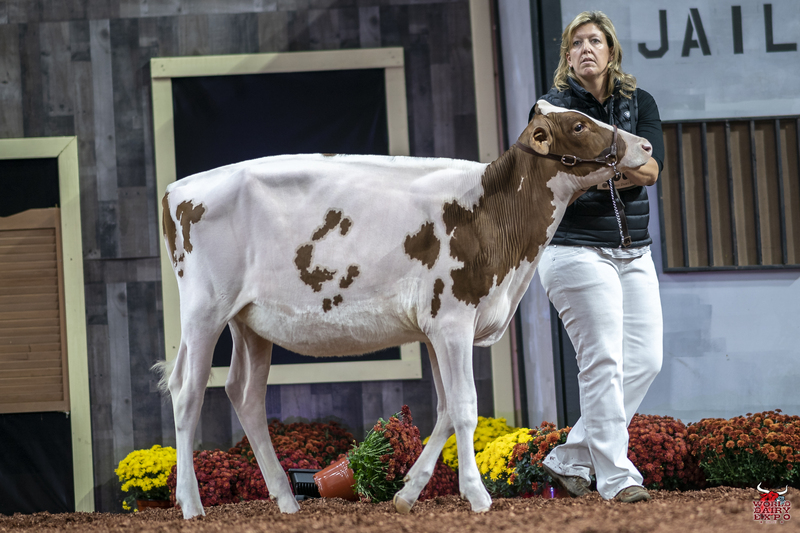 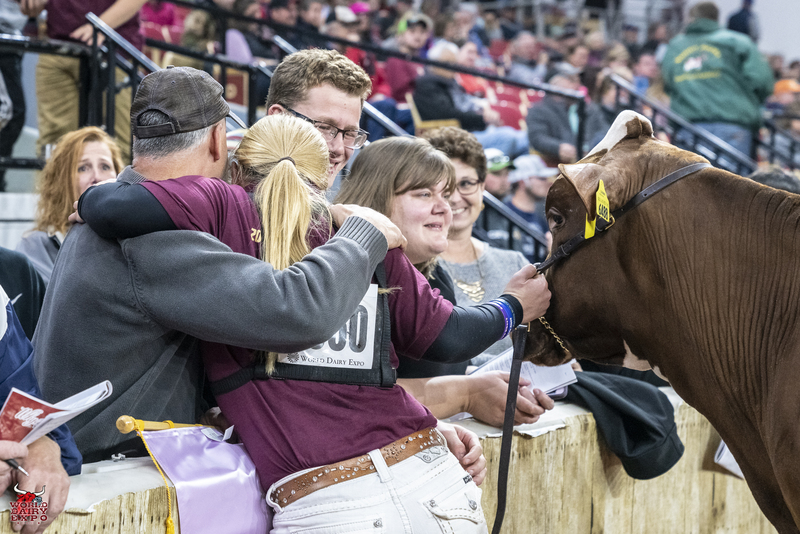 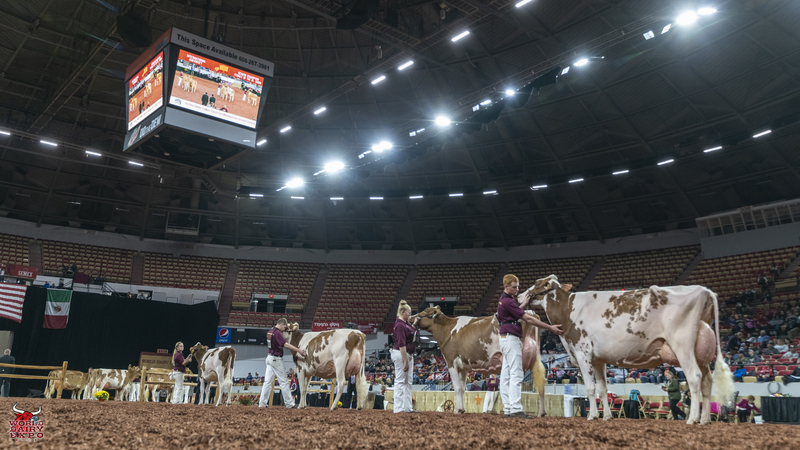 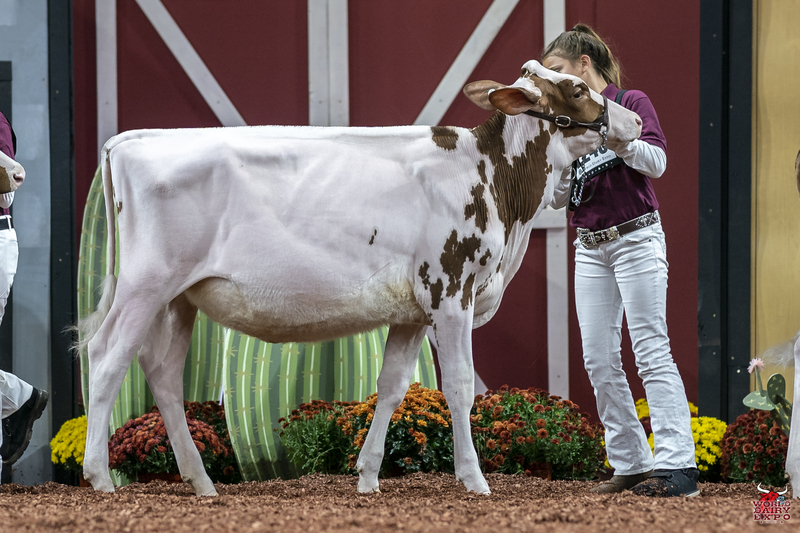 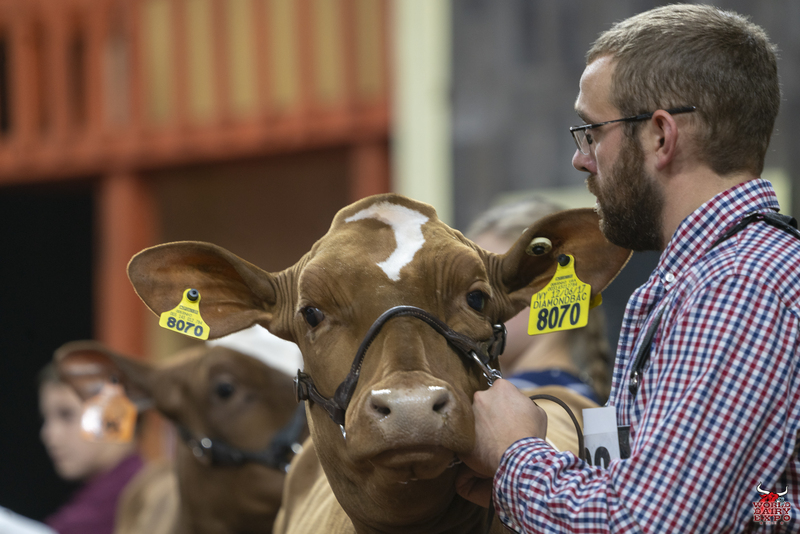 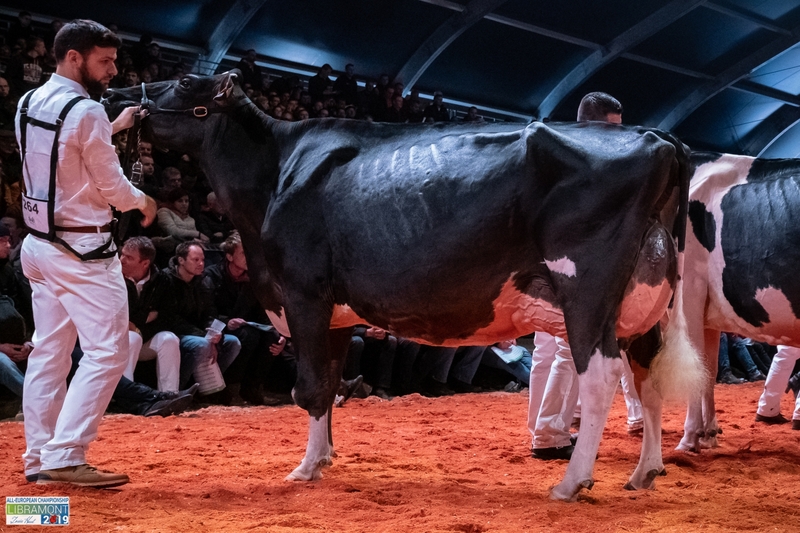 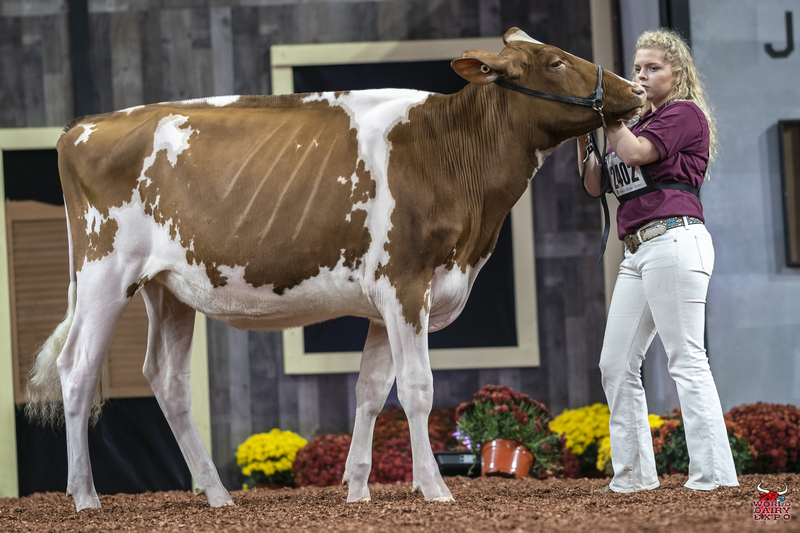 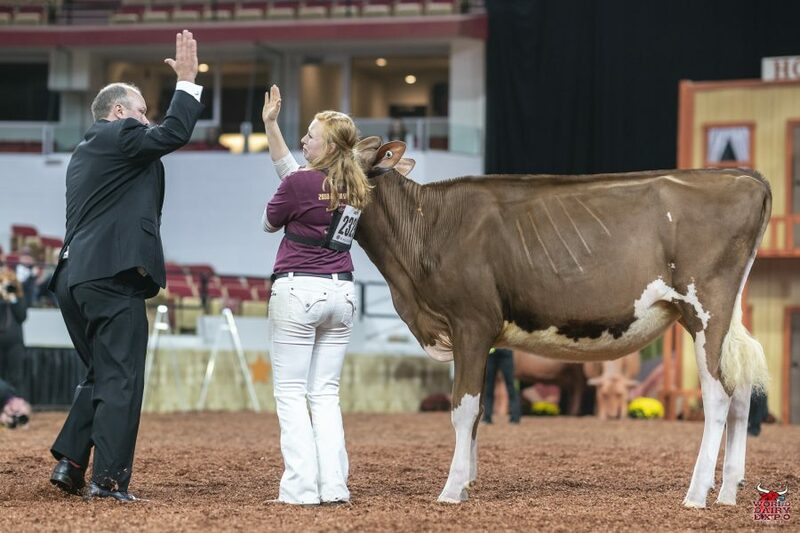 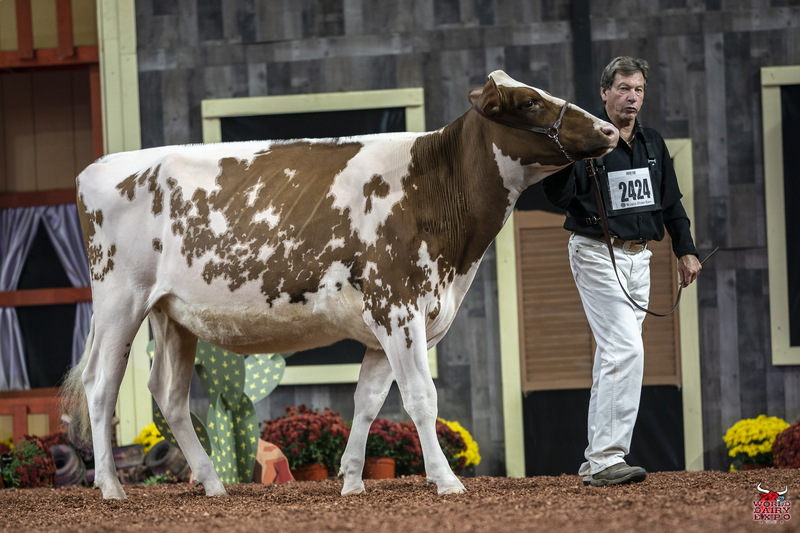 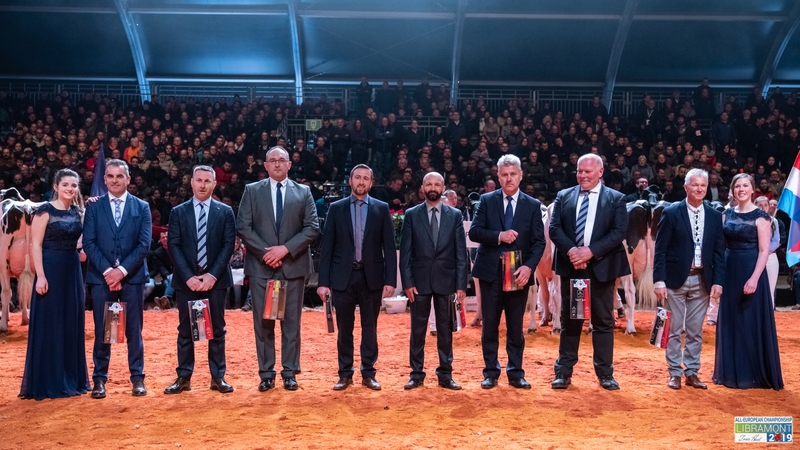 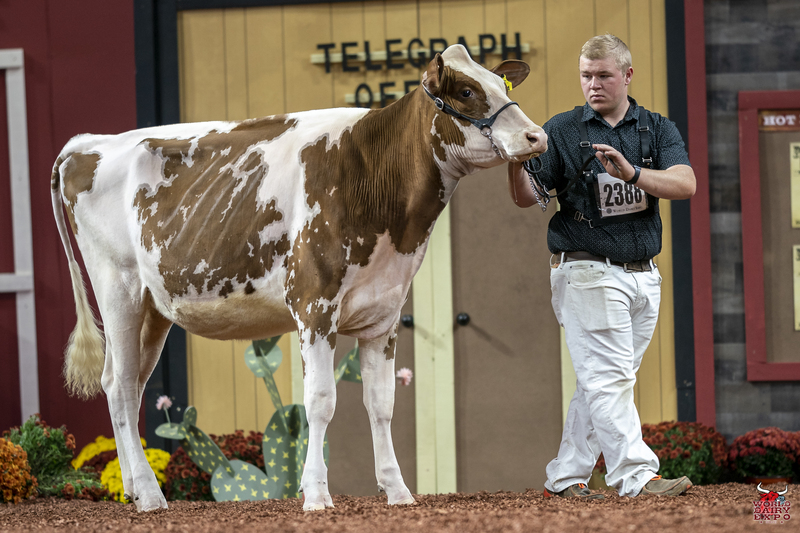 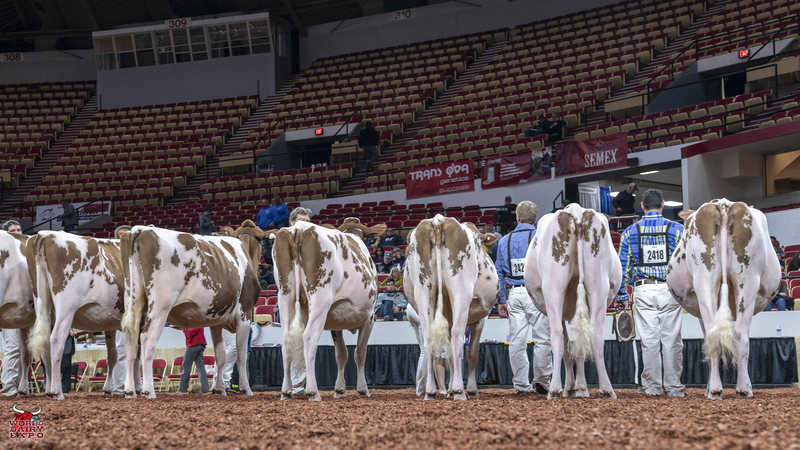 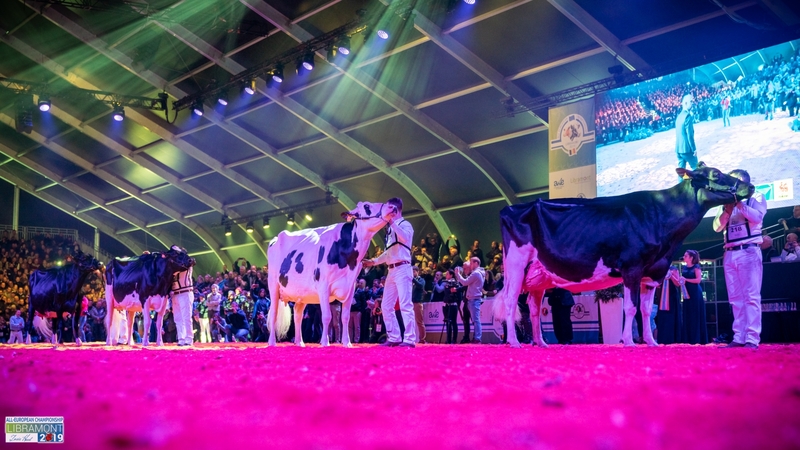 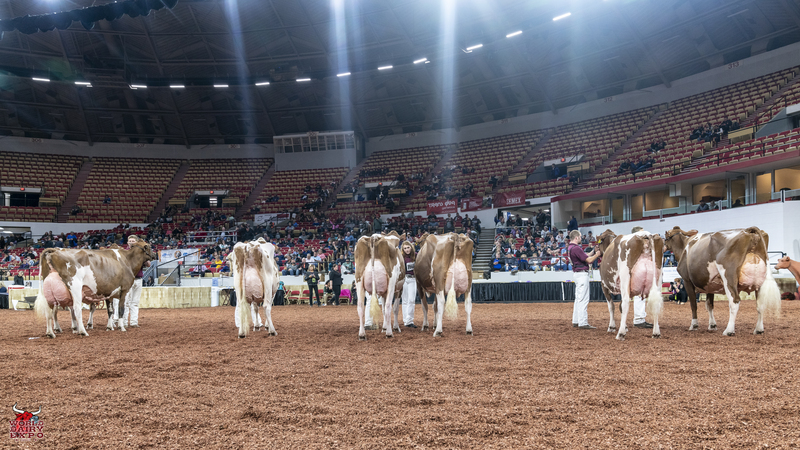 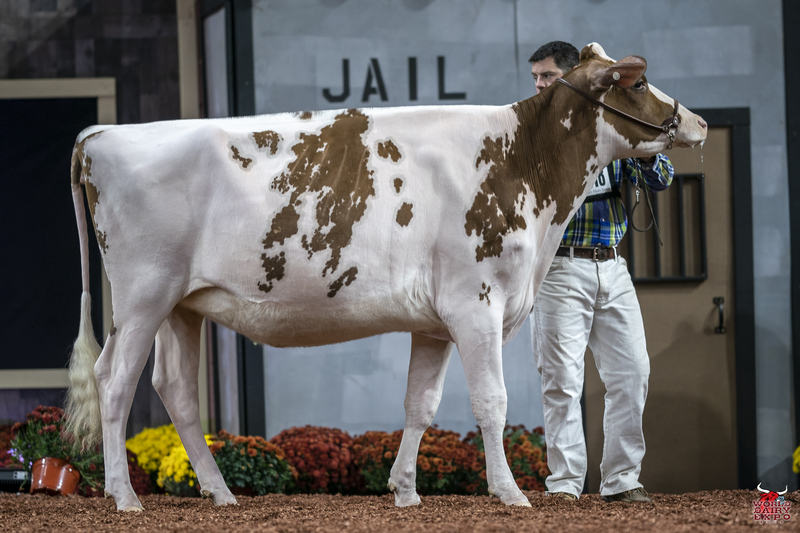 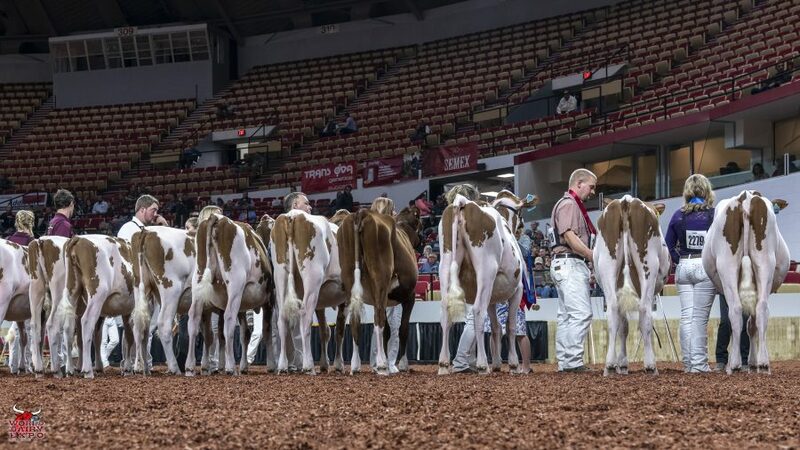 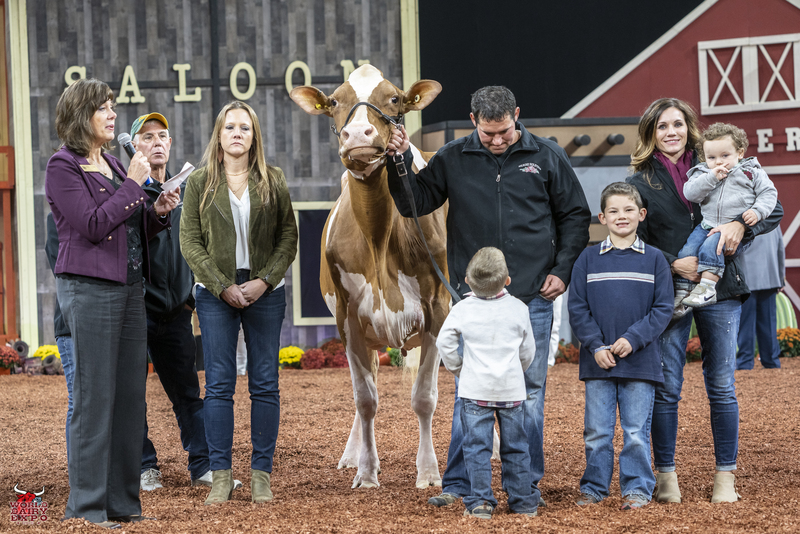 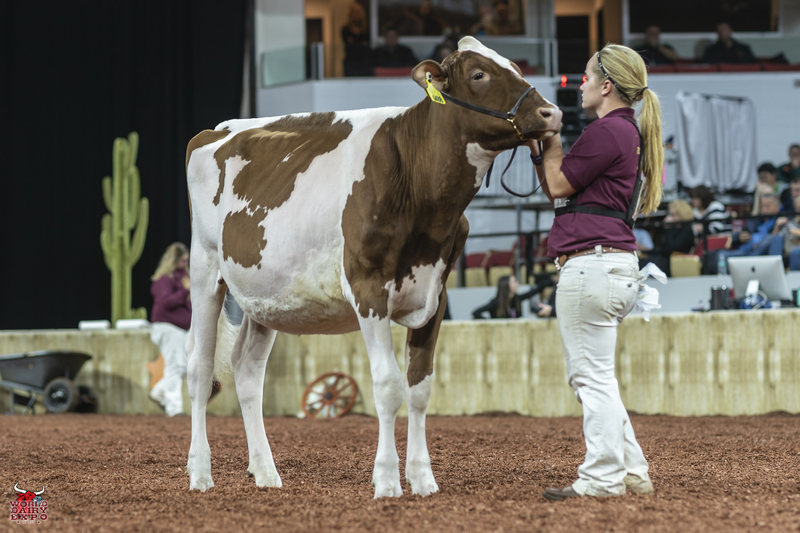 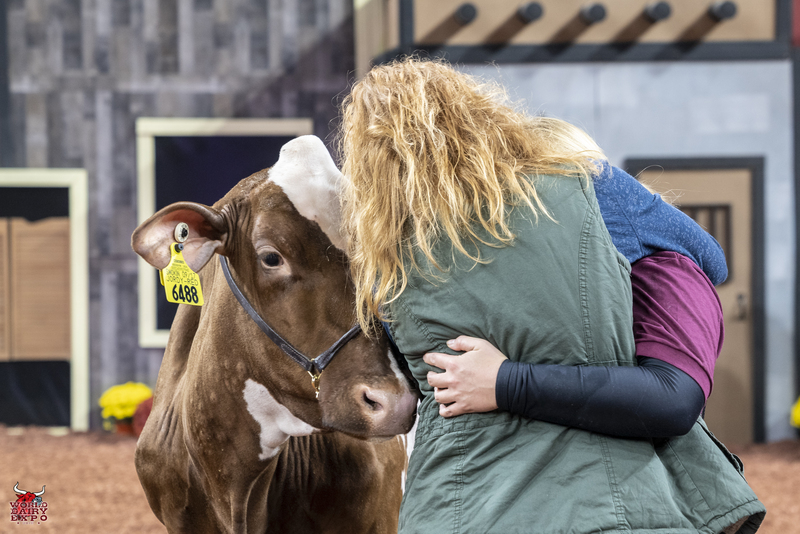 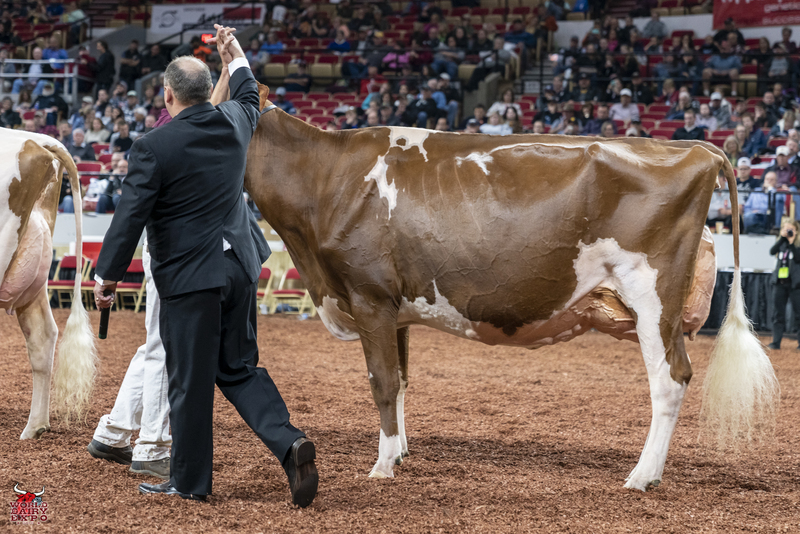 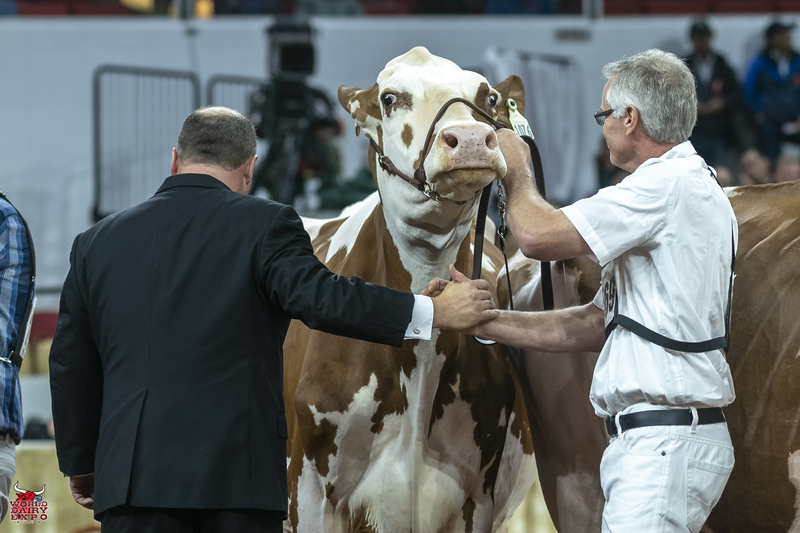 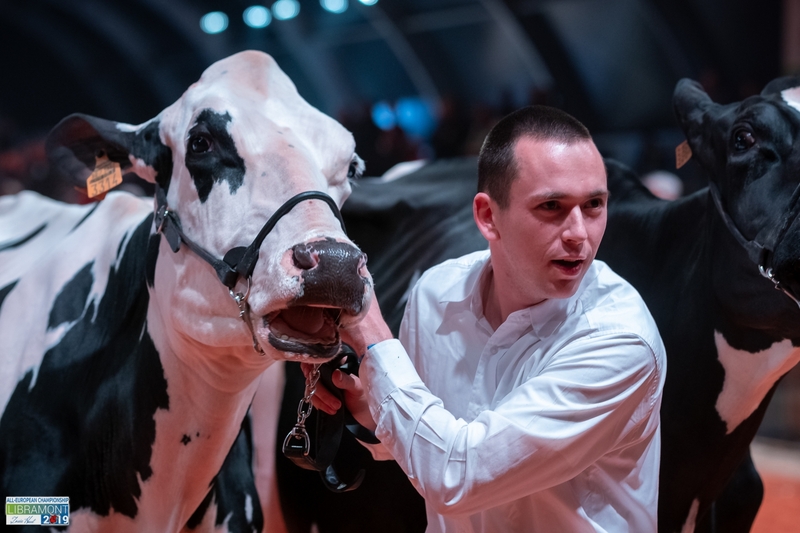 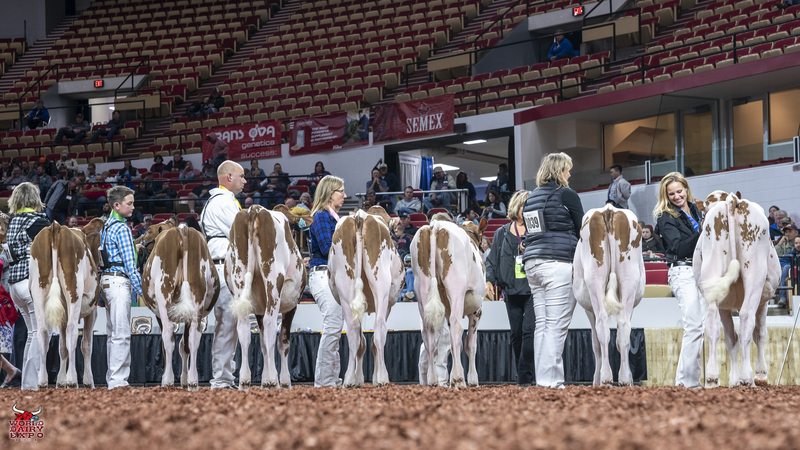 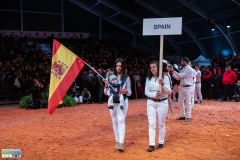 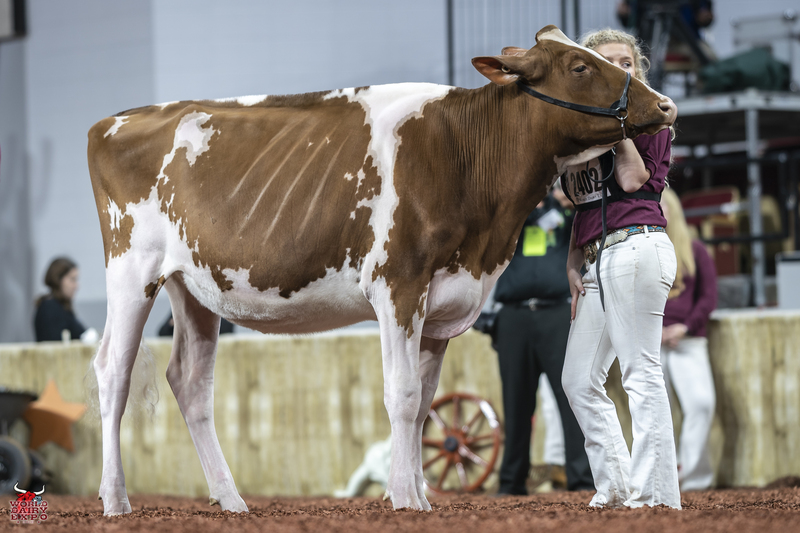 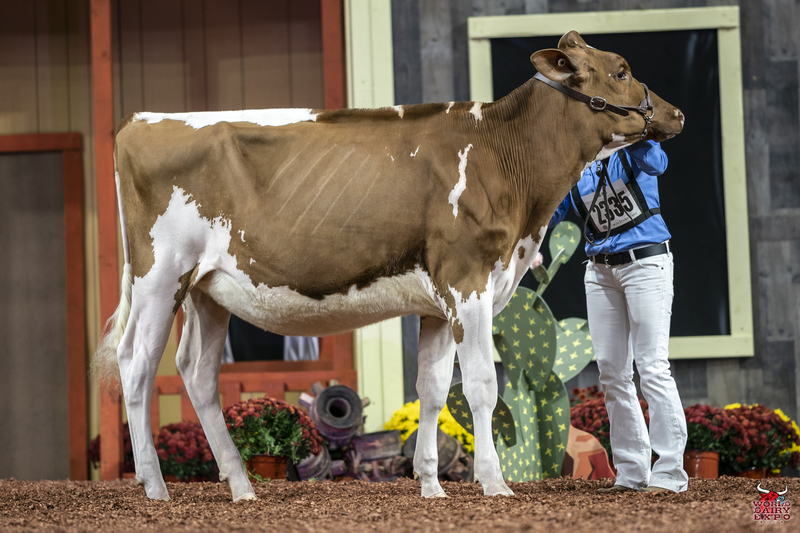 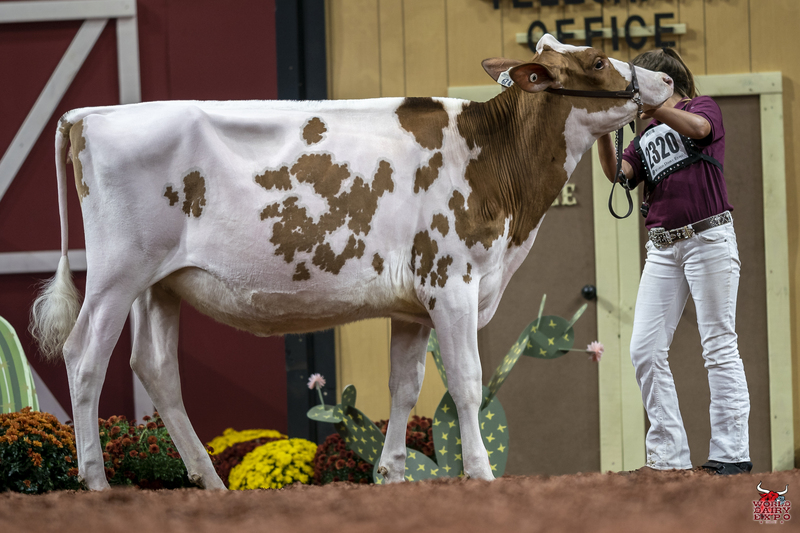 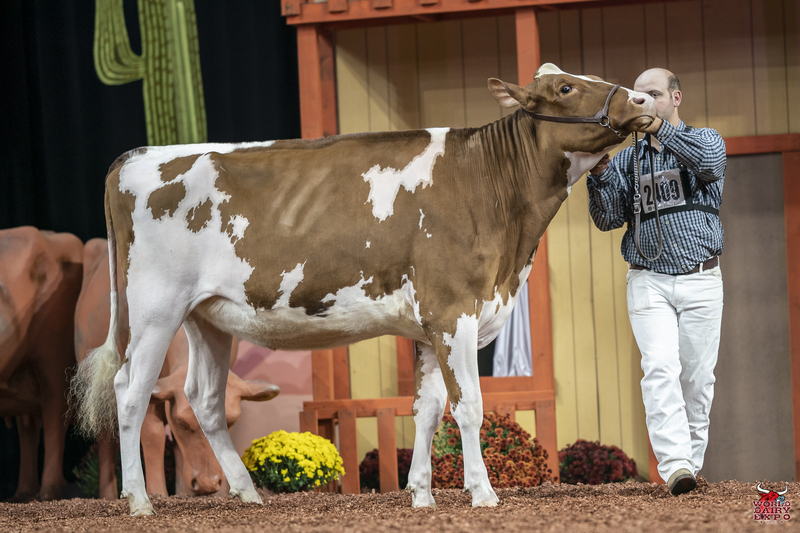 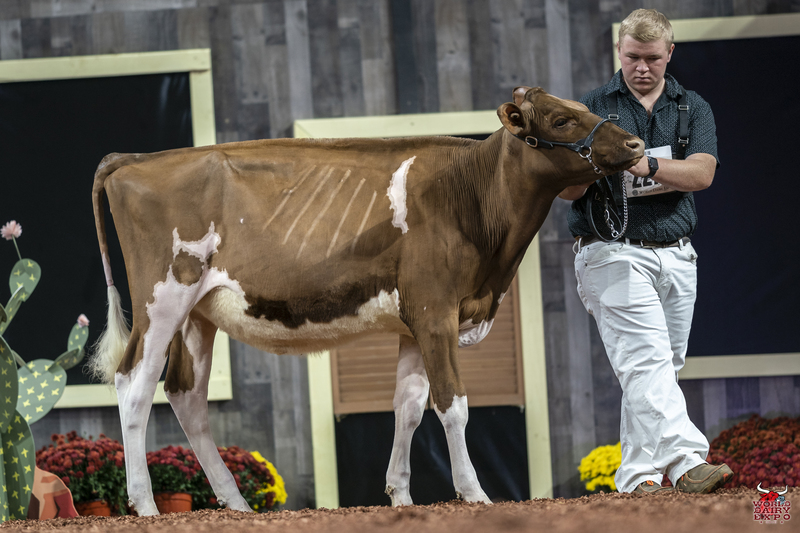 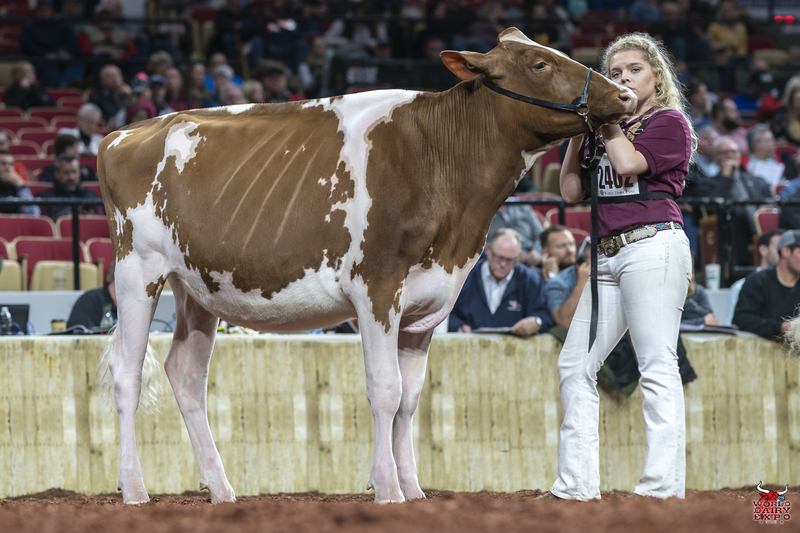 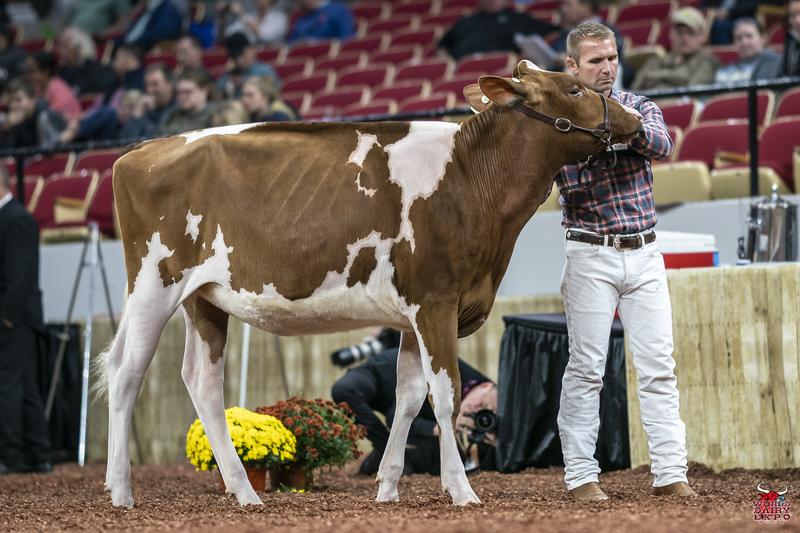 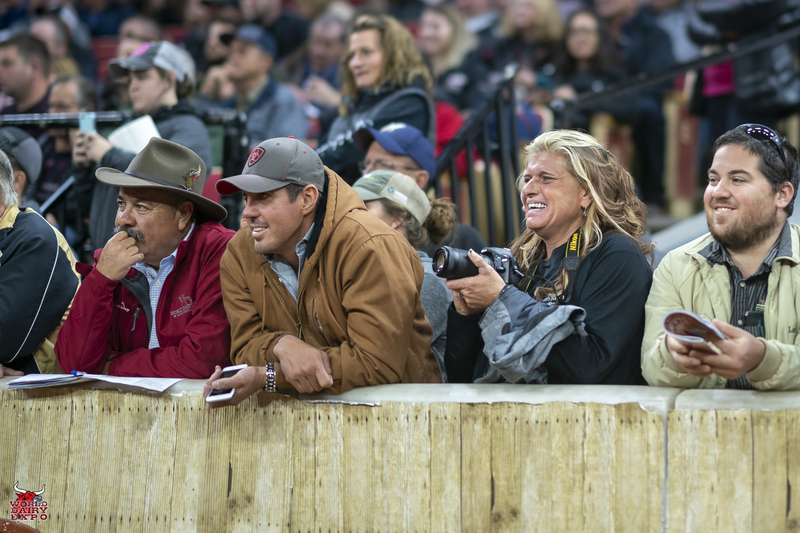 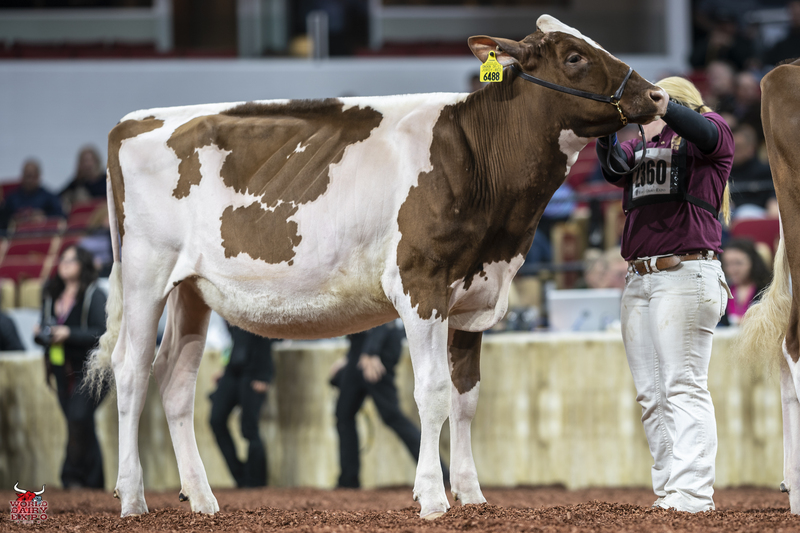 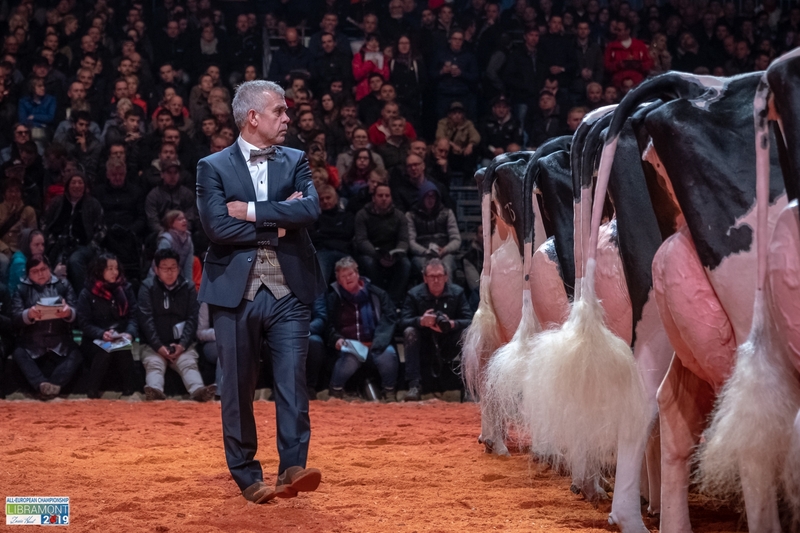 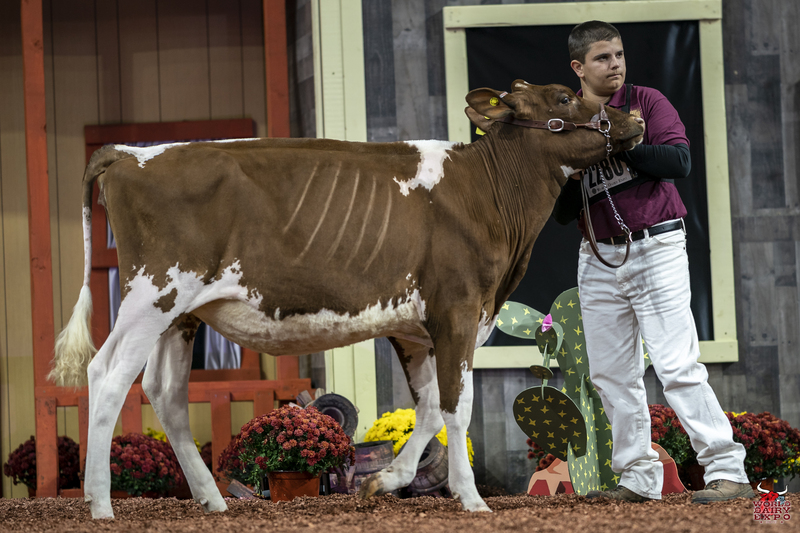 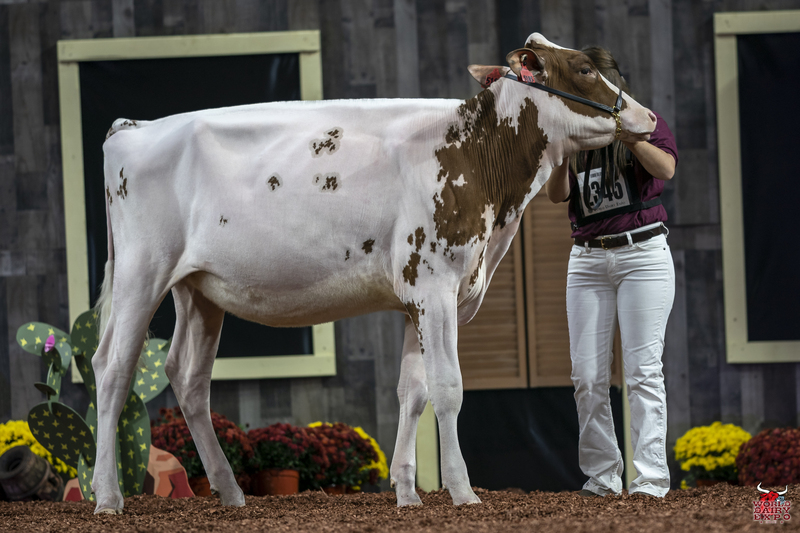 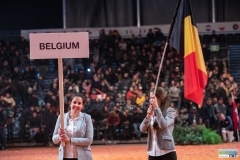 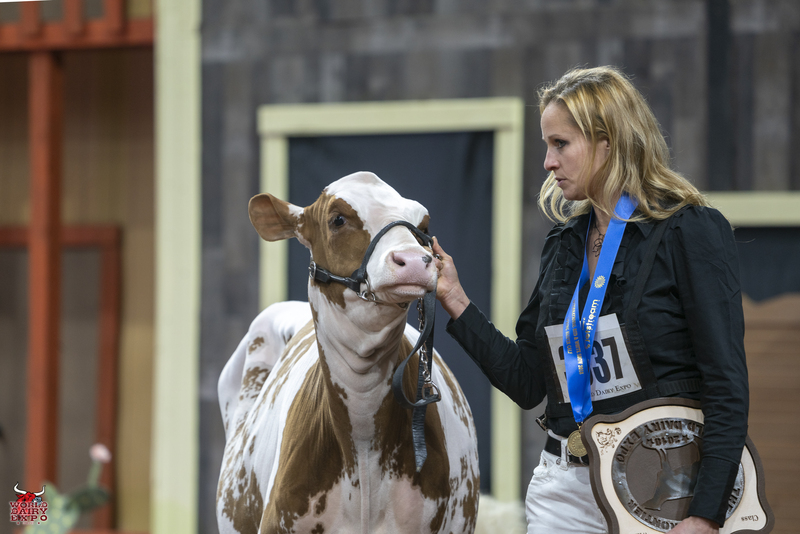 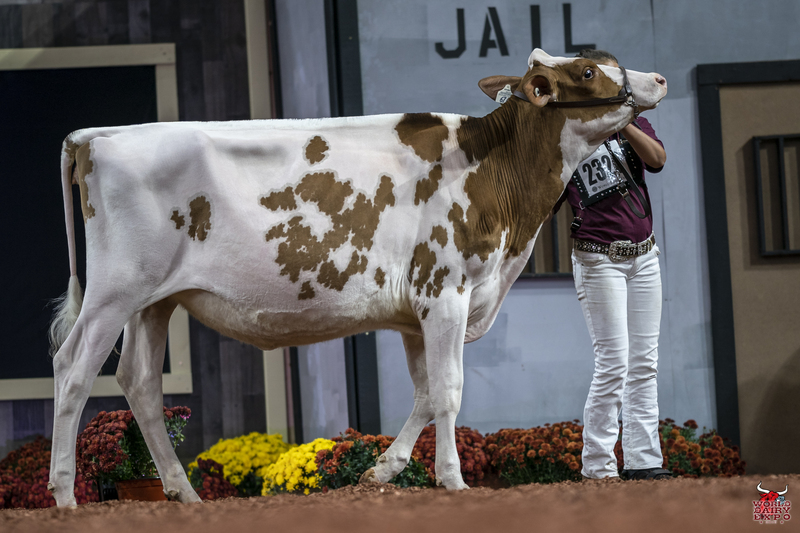 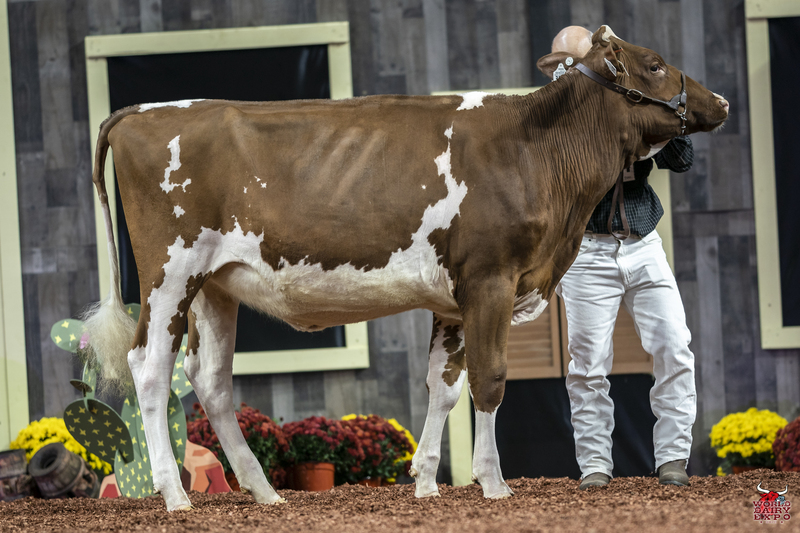 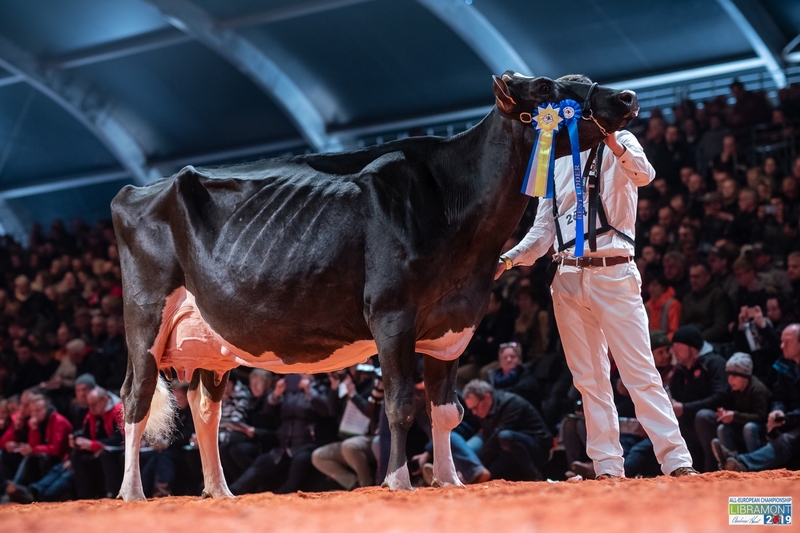 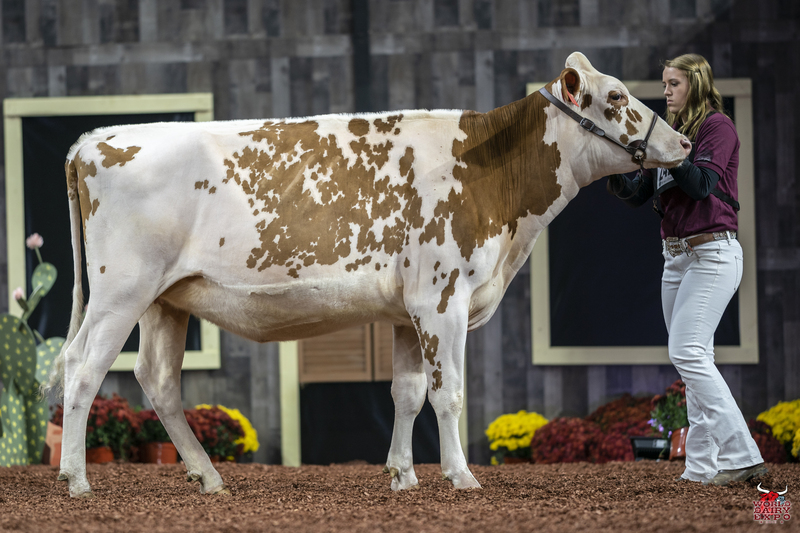 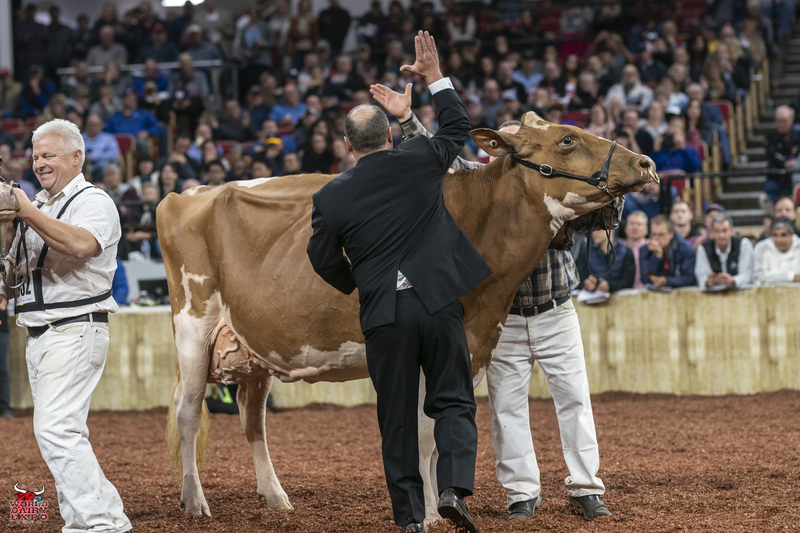 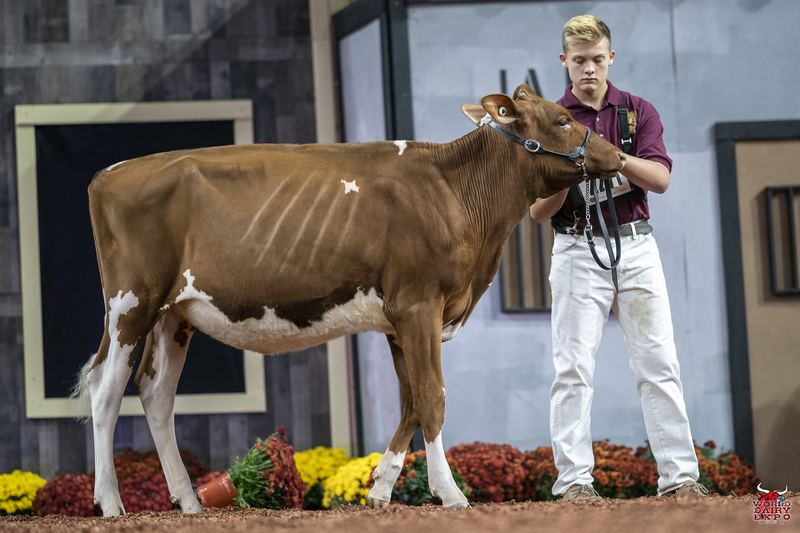 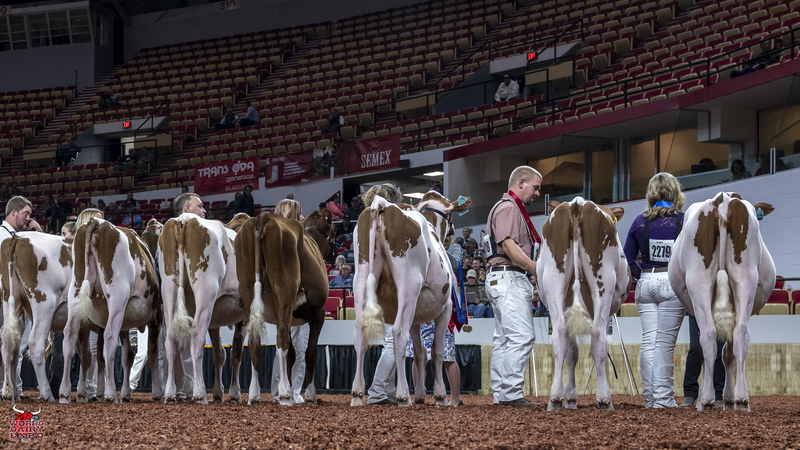 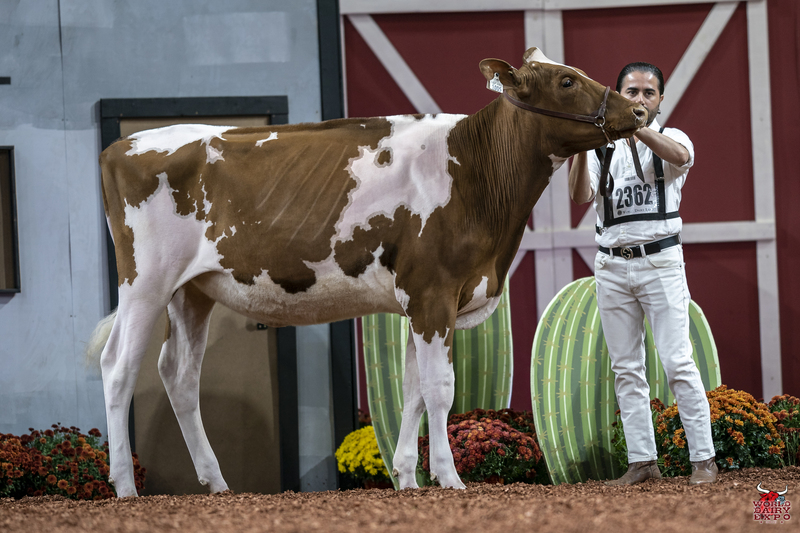 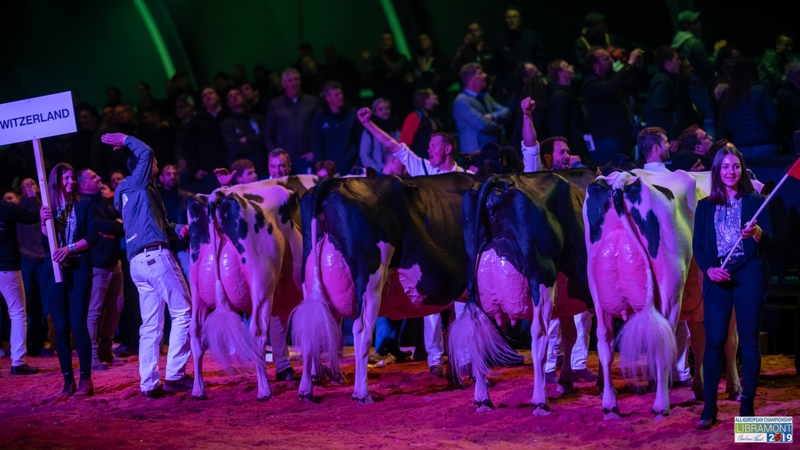 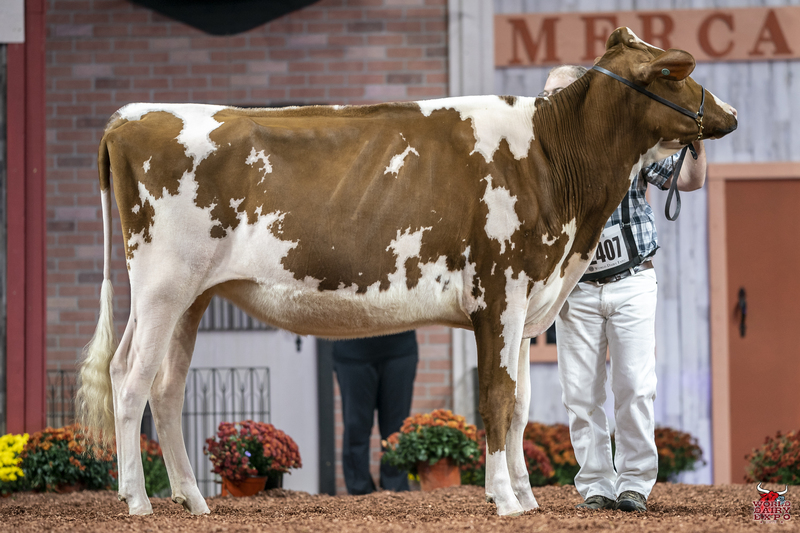 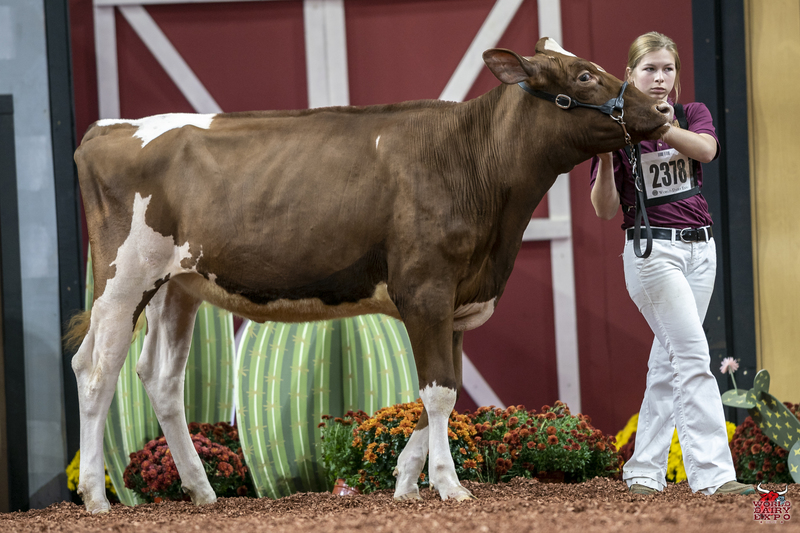 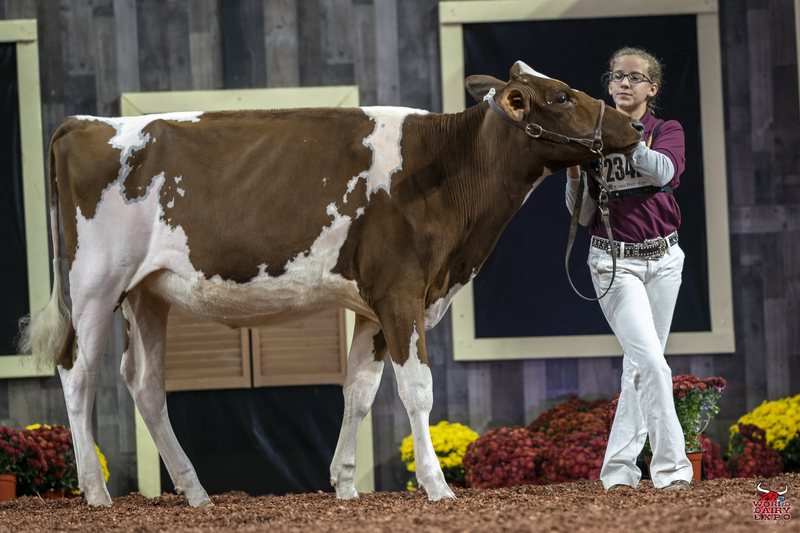 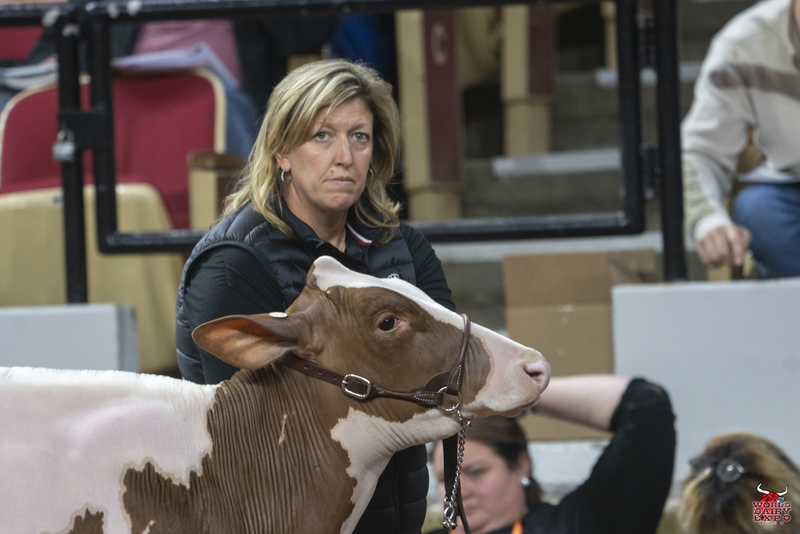 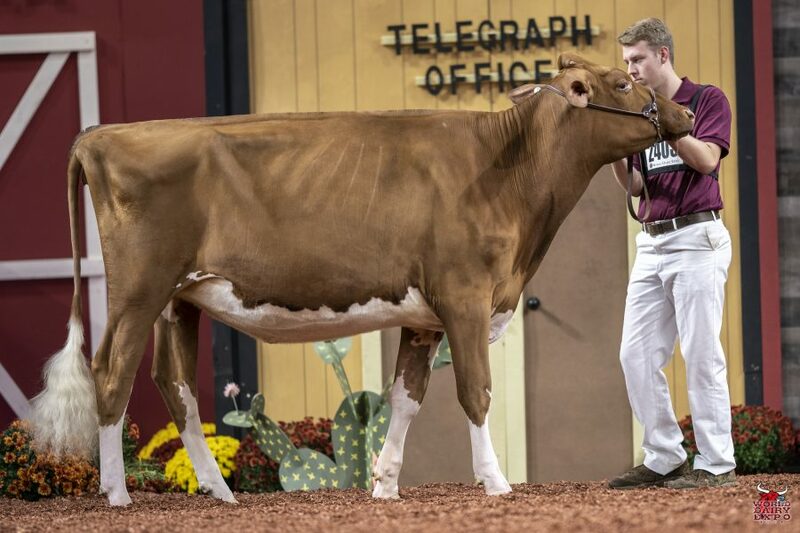 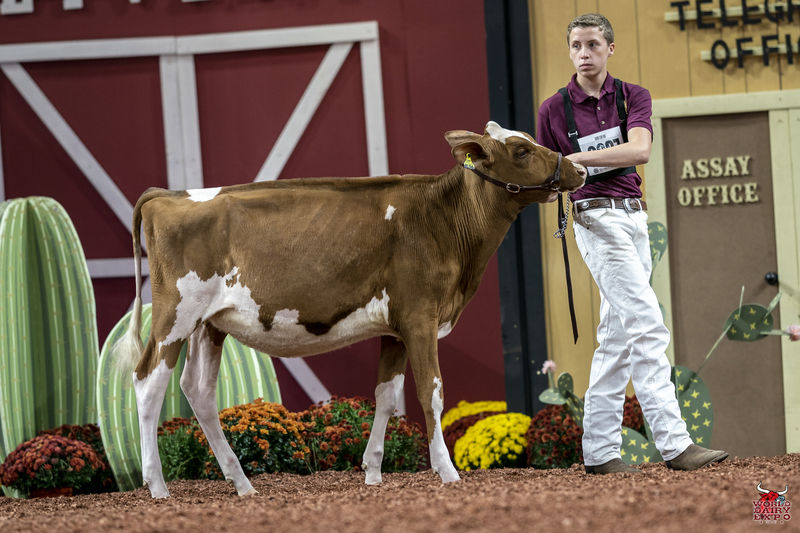 Shampagne’s first trip across the colored shavings on October 5 was when she rose to the top of the Junior Three-Year-Old Cow Class on her way to being named Intermediate and Grand Champion Female. 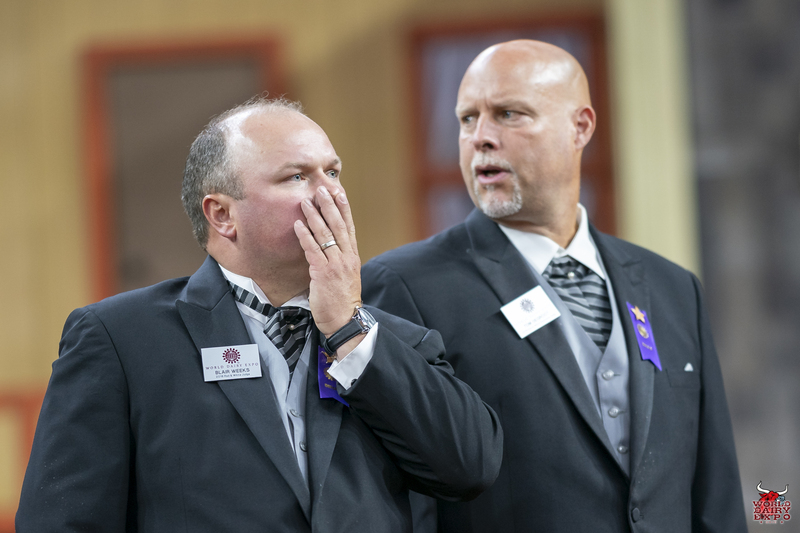 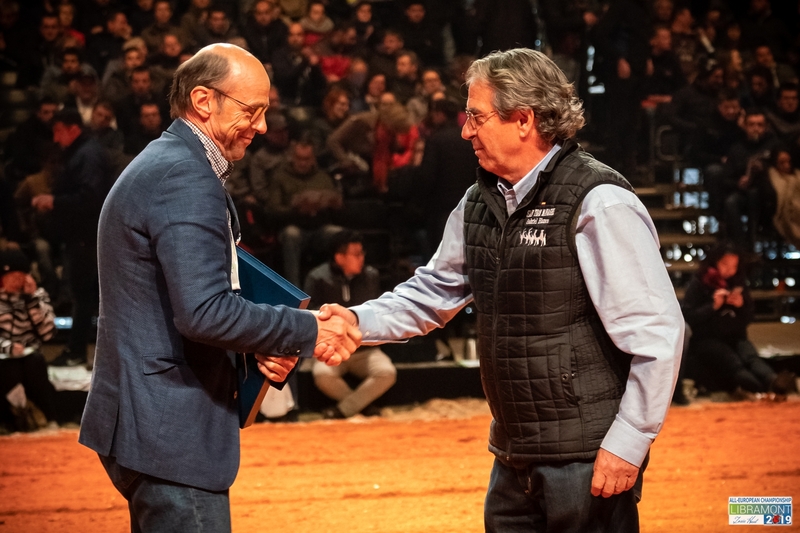 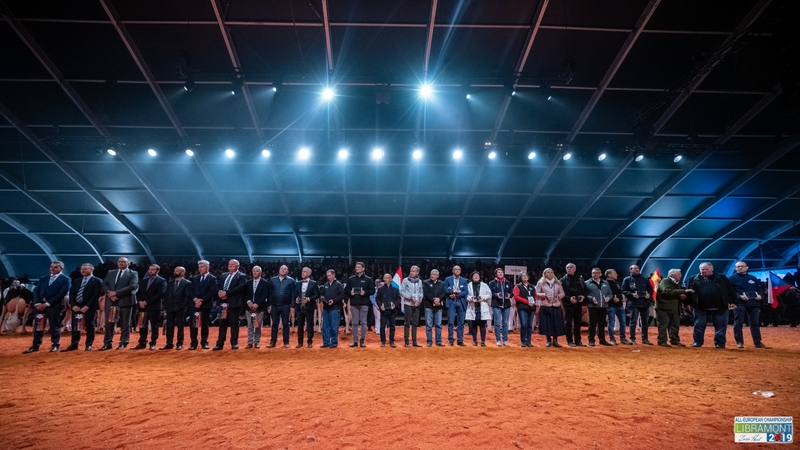 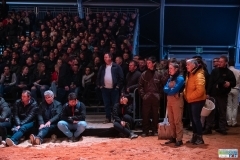 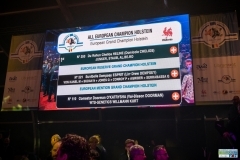 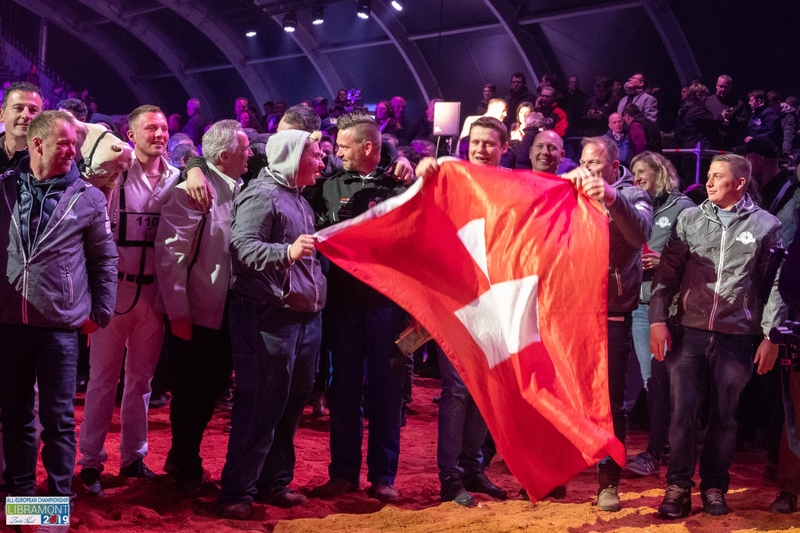 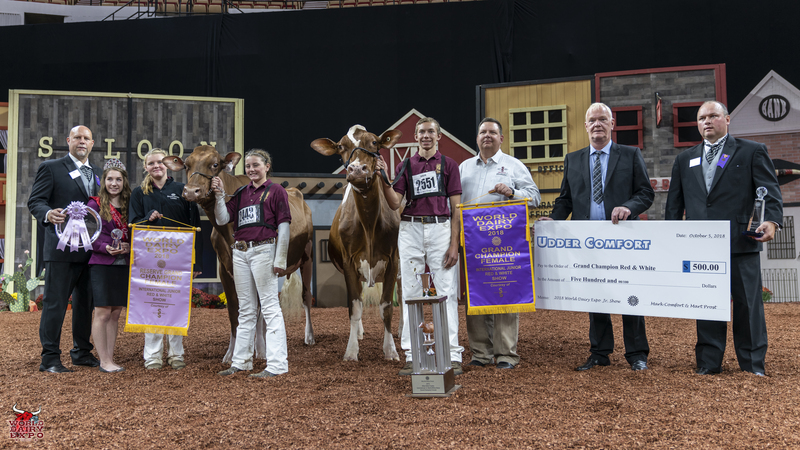 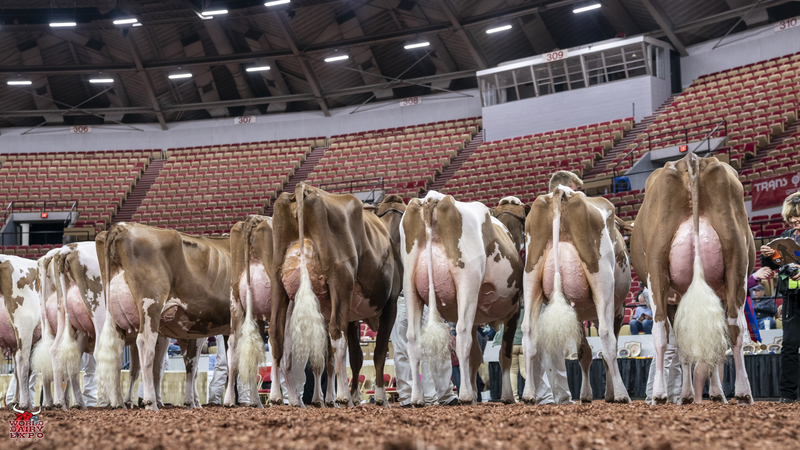 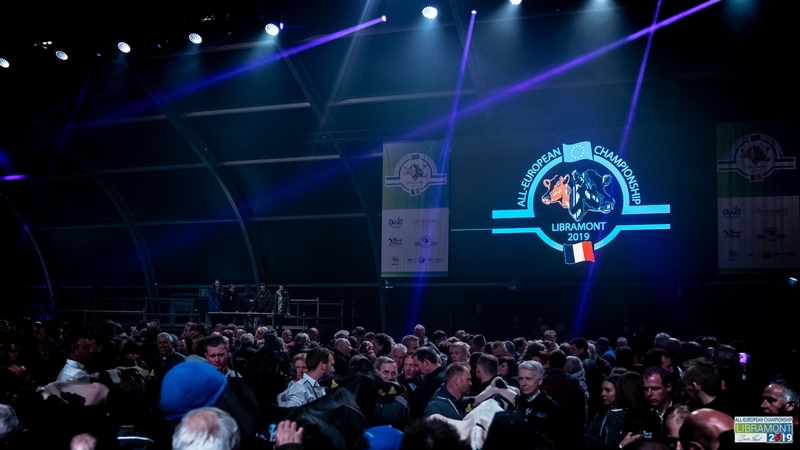 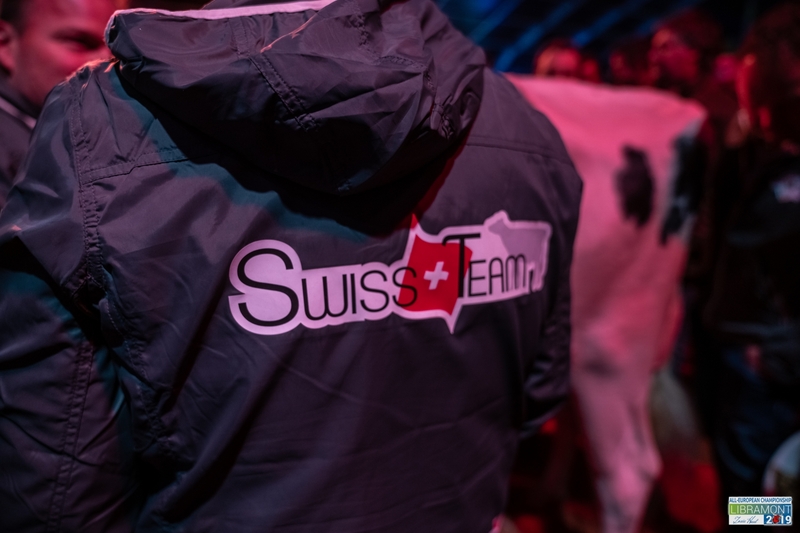 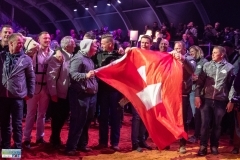 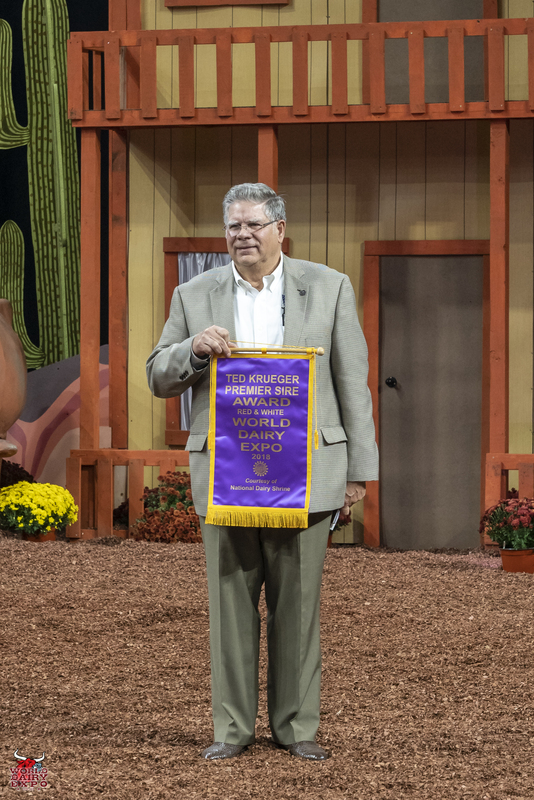 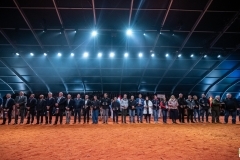 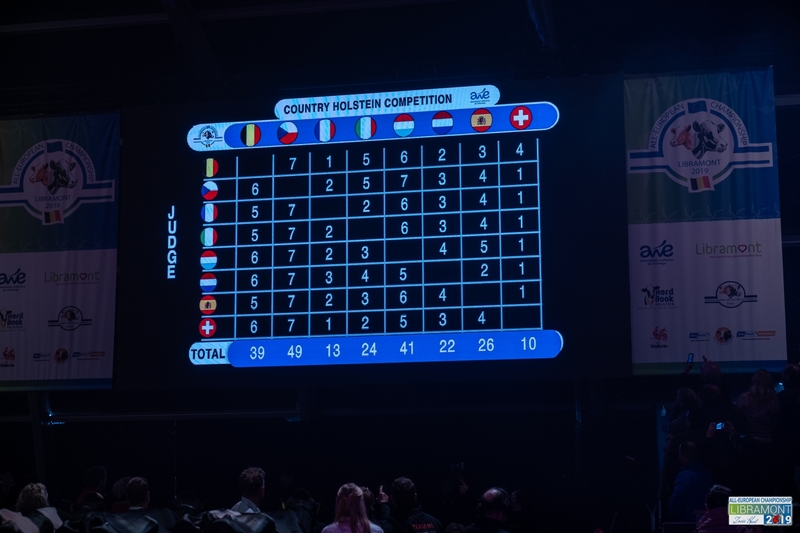 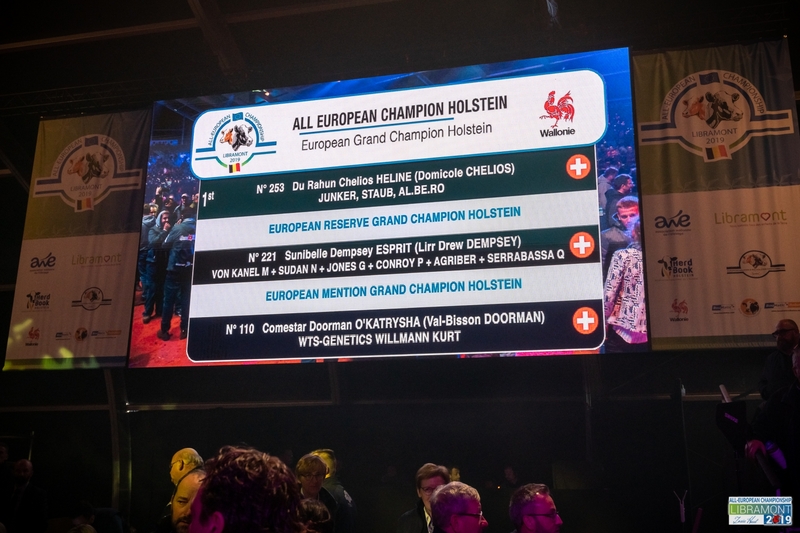 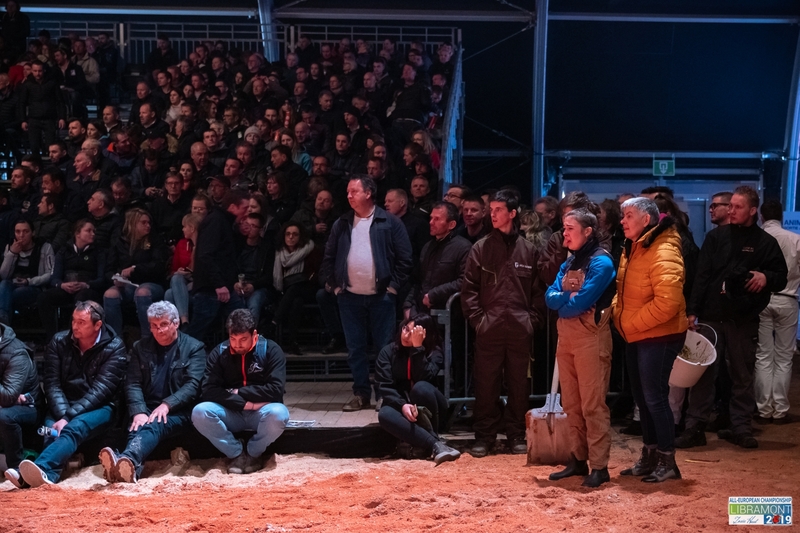 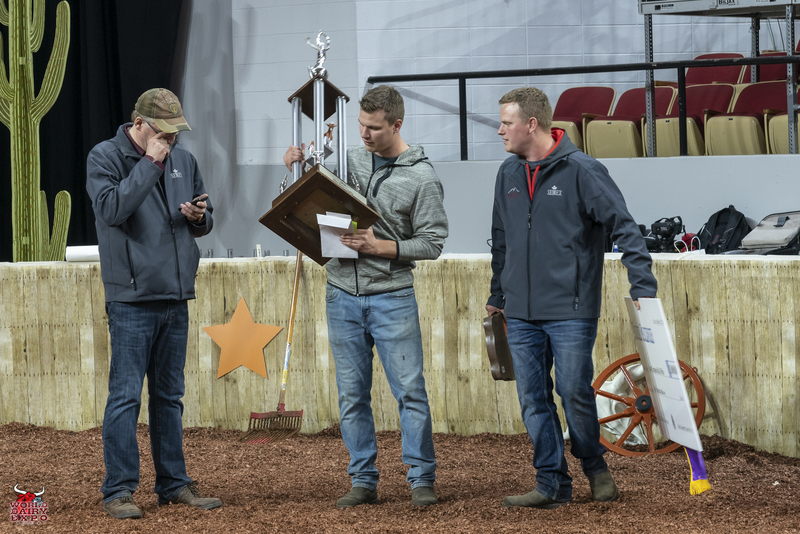 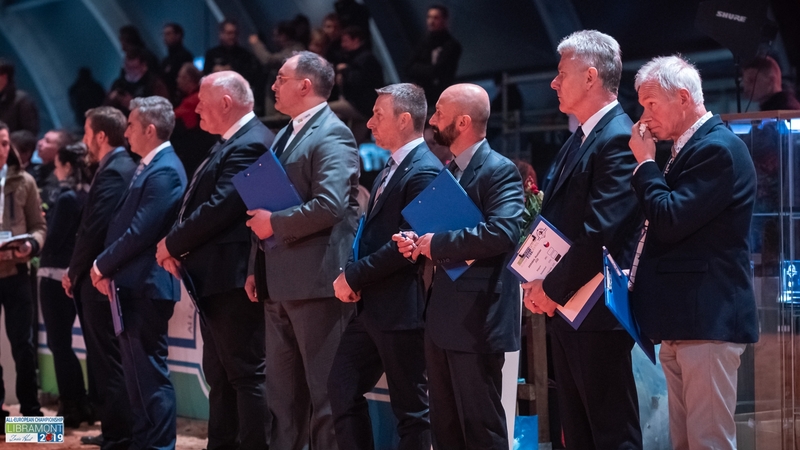 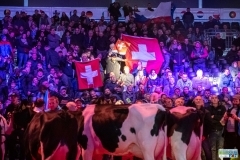 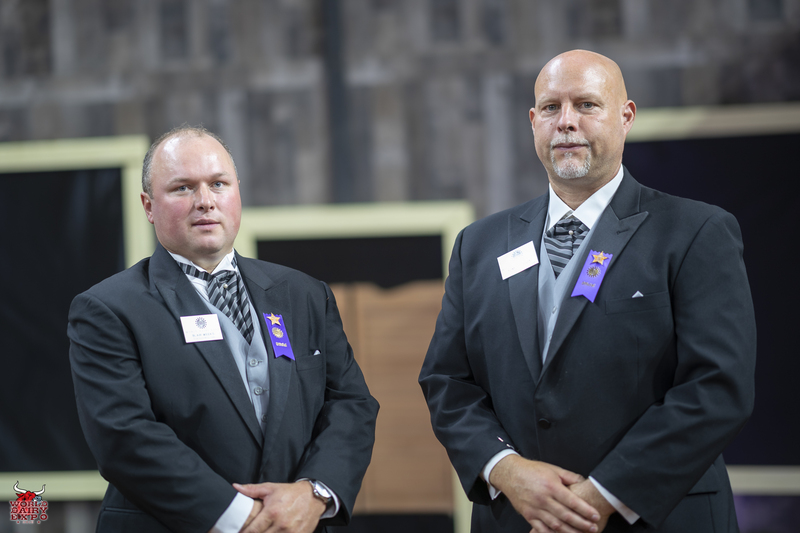 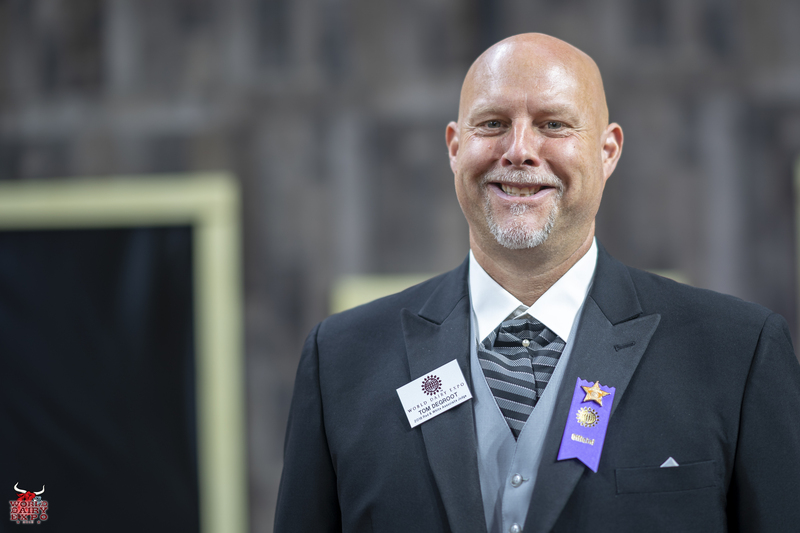 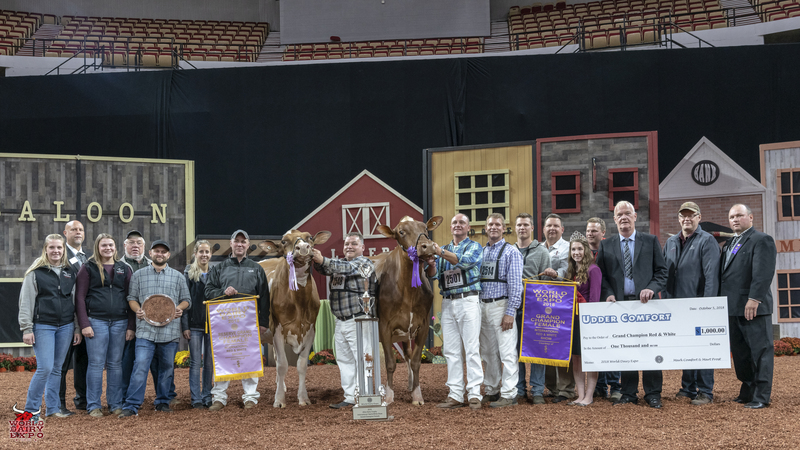 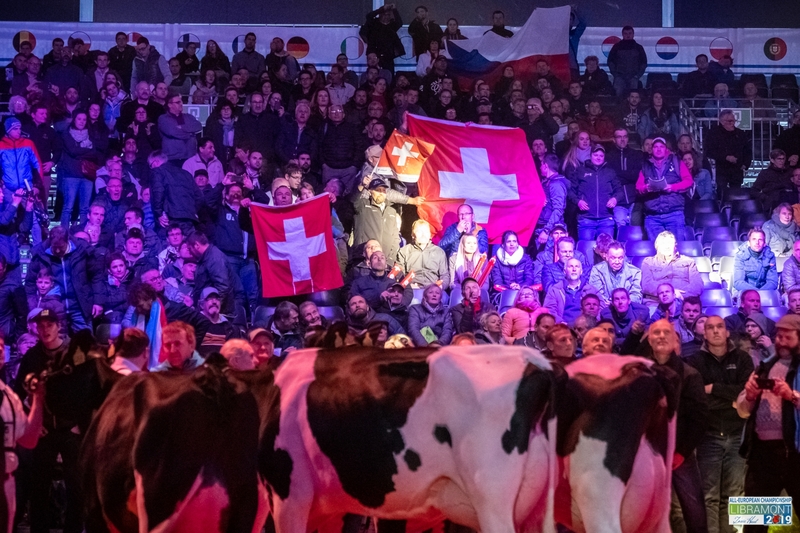 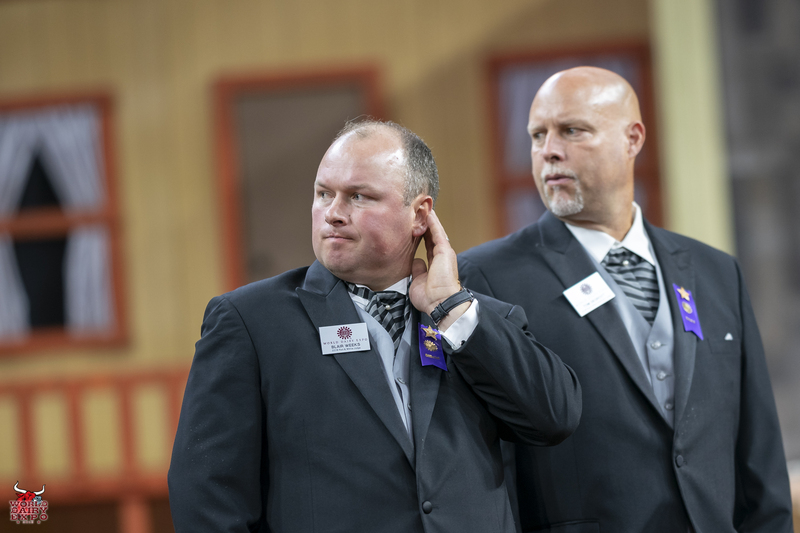 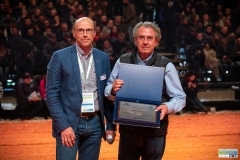 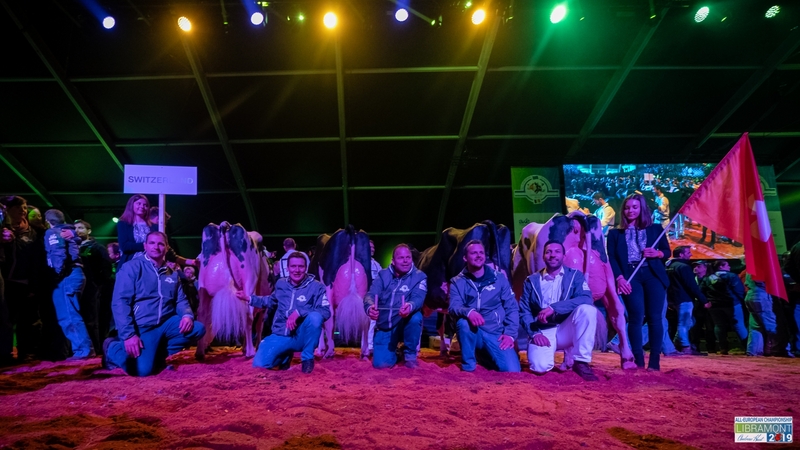 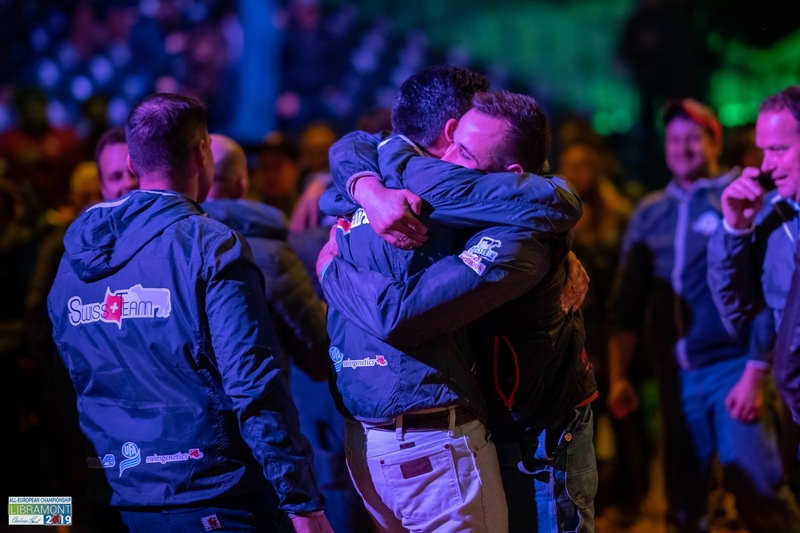 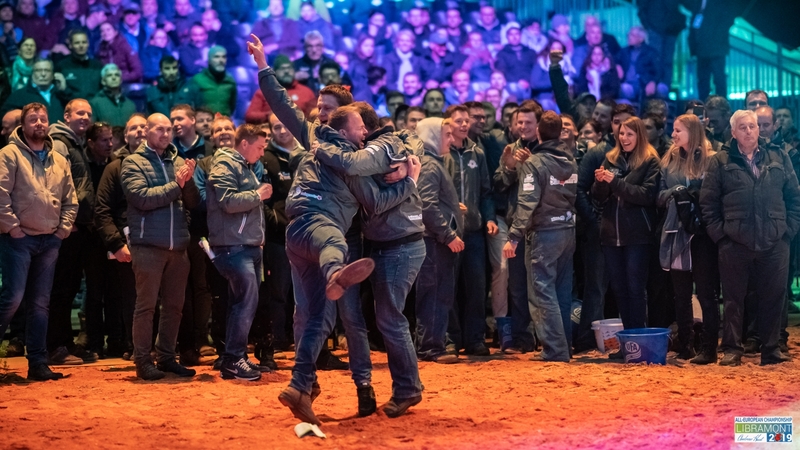 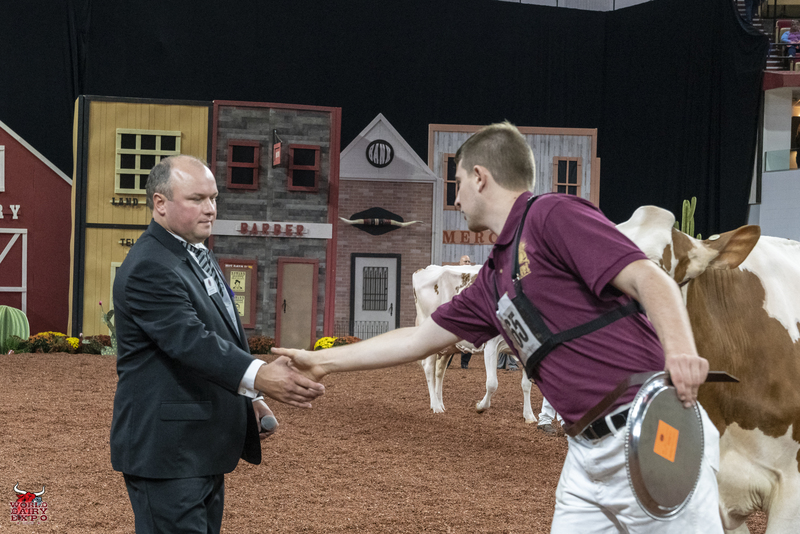 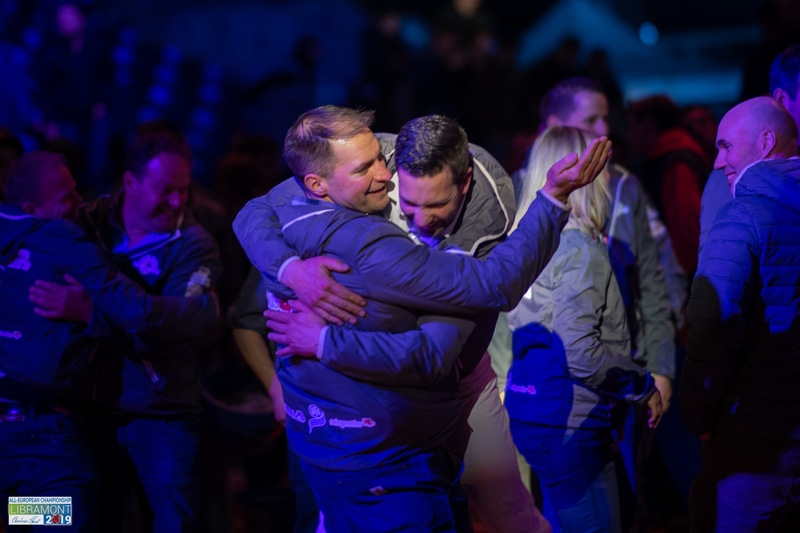 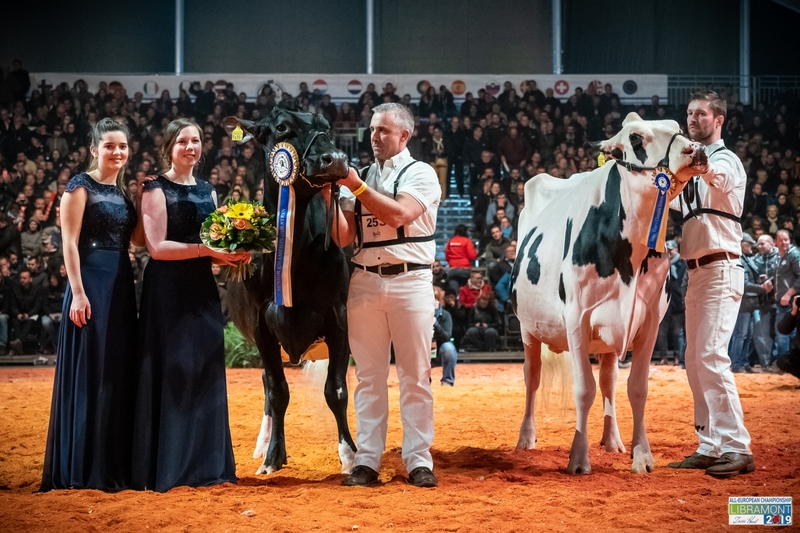 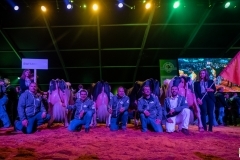 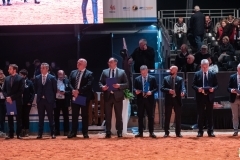 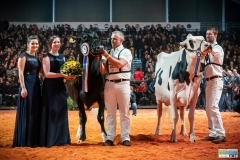 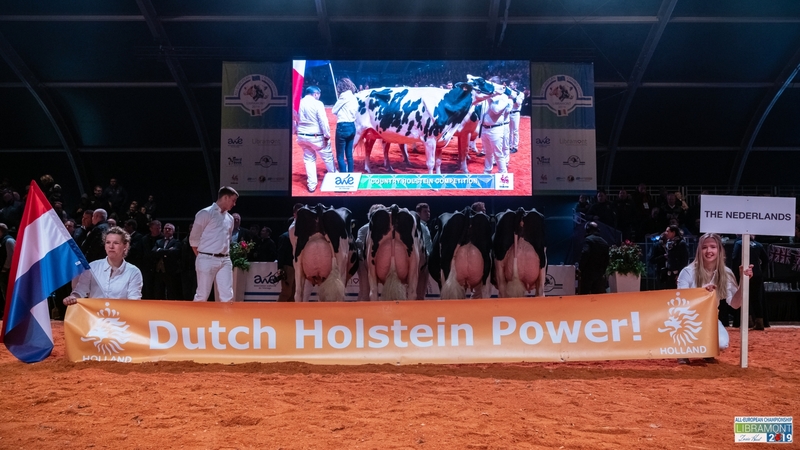 Shampagne was presented with the $1,000 Udder Comfort Grand Champion Cash Award and the Allen Hetts Grand Champion Trophy and as Intermediate Champion, a free ovum pick-up, compliments of Vytelle LLC. 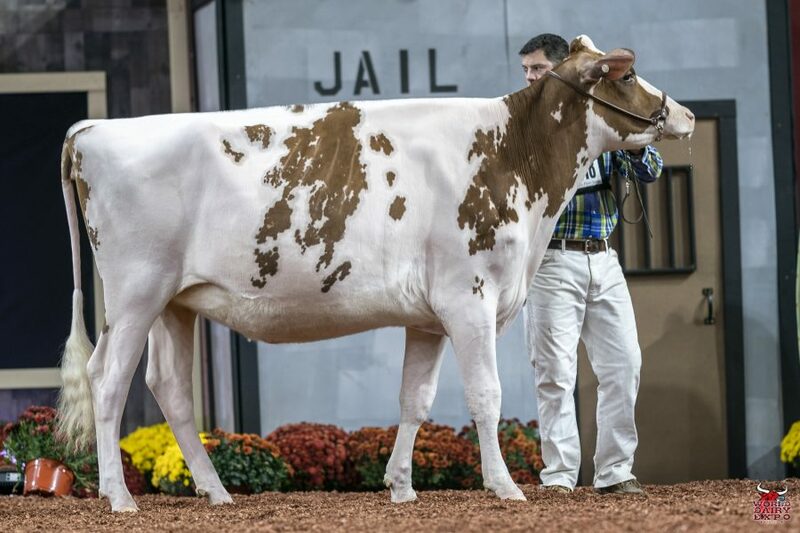 First in the Four-Year-Old Cow Class, Senior Champion Female and Reserve Grand Champion of the International Red & White Show was Highcroft Absolute Lily-Red, exhibited by Steve Smith and Anthony Crothers of Nicholasville, Ky.
Winning Four-Year-Old Cow, Robin-Hood Pretty In-Red, took home two Champion honors at the International Junior Red & White Show. 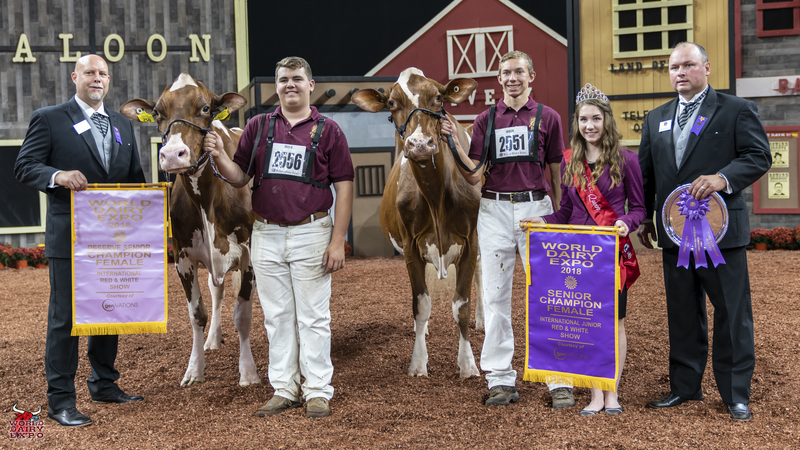 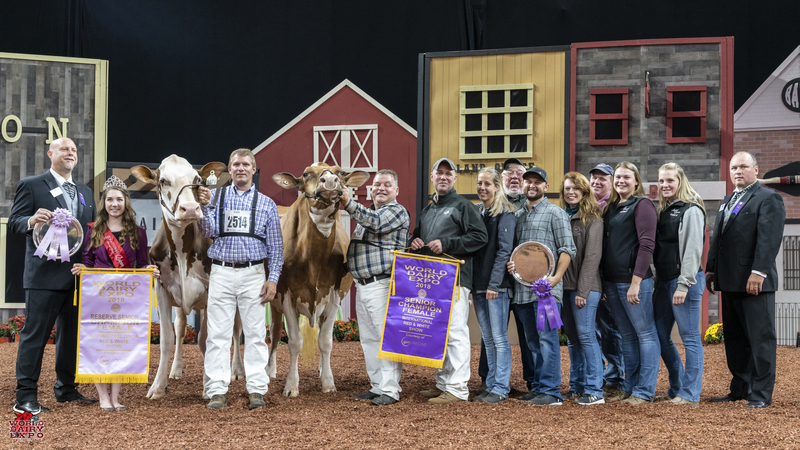 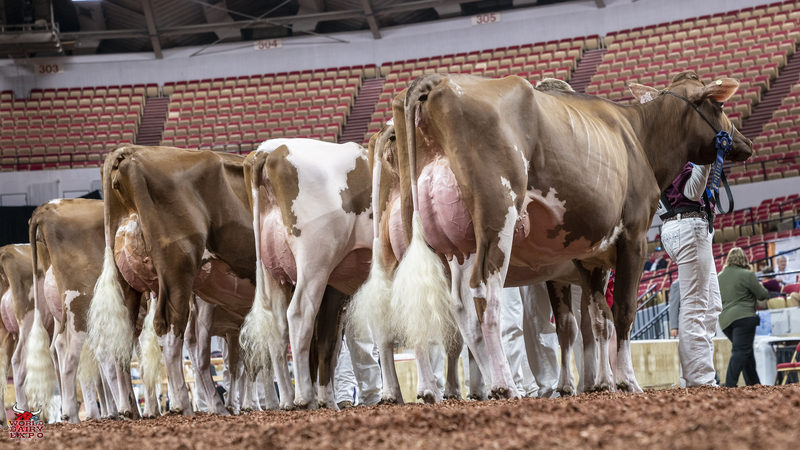 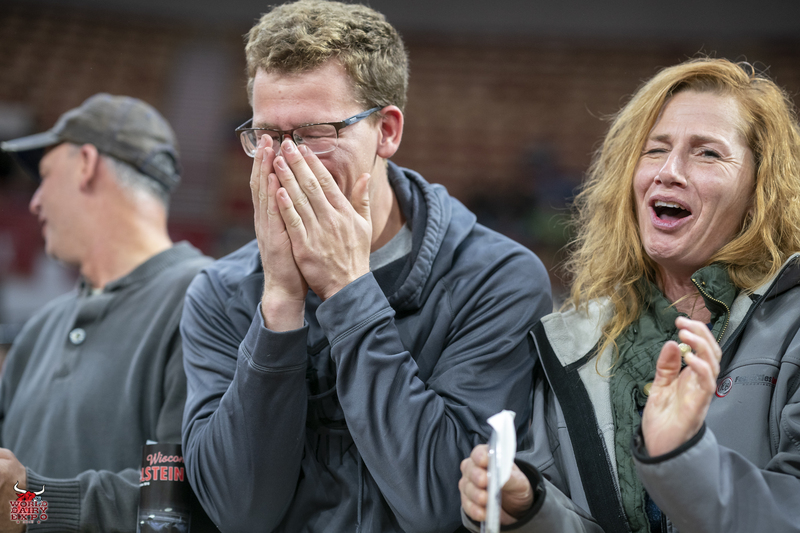 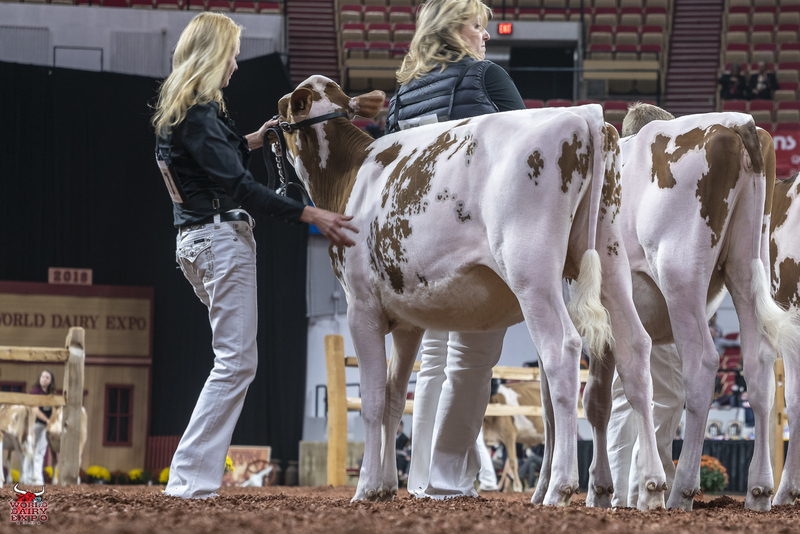 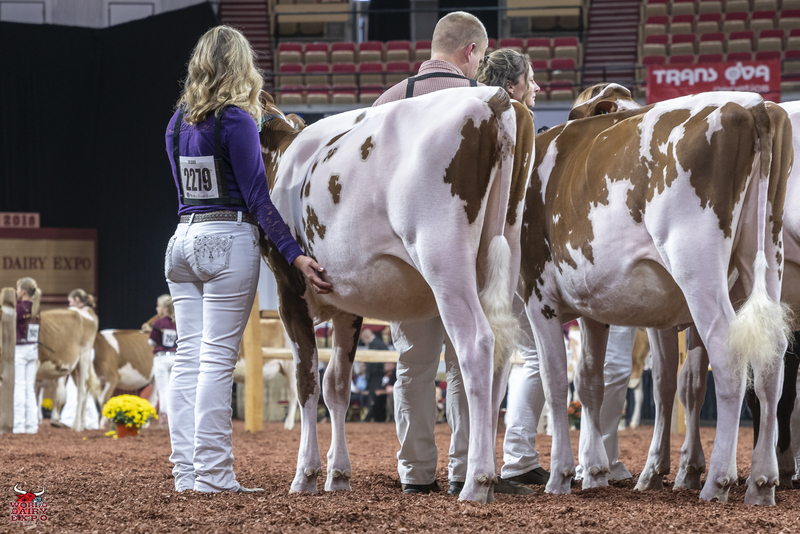 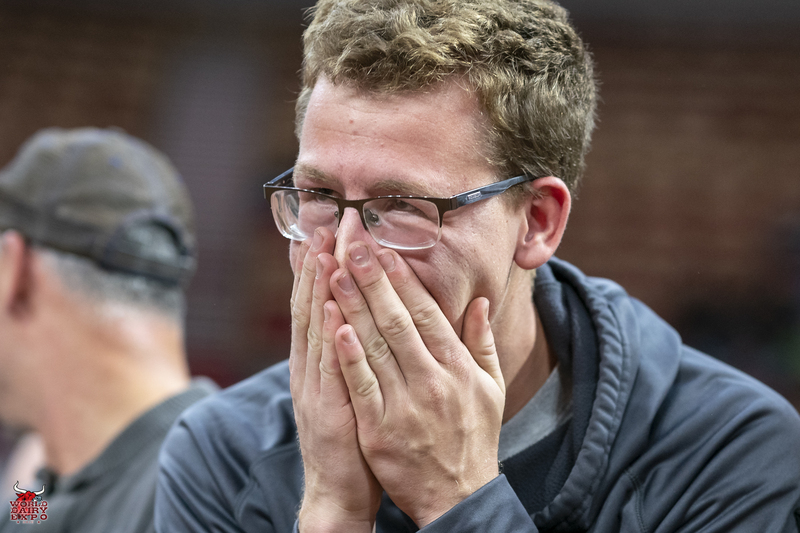 Owned by Regan Demmer of Peosta, Iowa, Pretty-In-Red was named Senior and Grand Champion Female and was presented the $500 Udder Comfort Grand Champion Cash Award and the Lillian & Keith King and Jim King Grand Champion of the Junior Show Award. 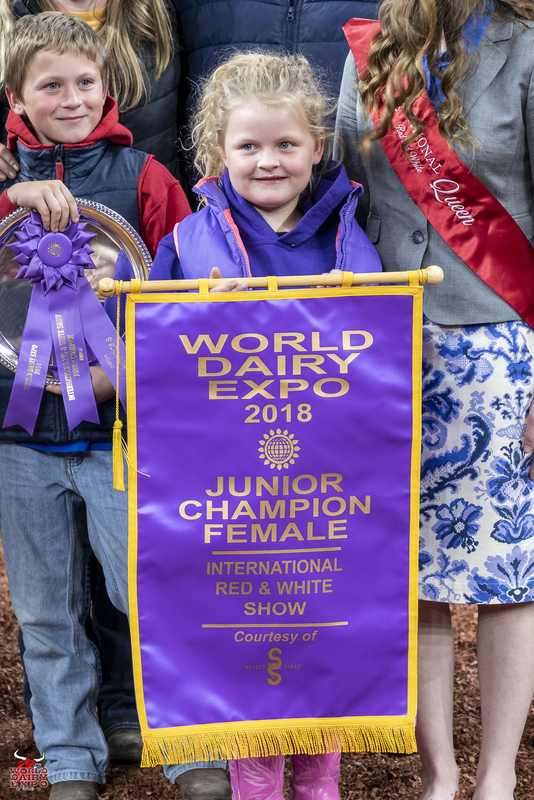 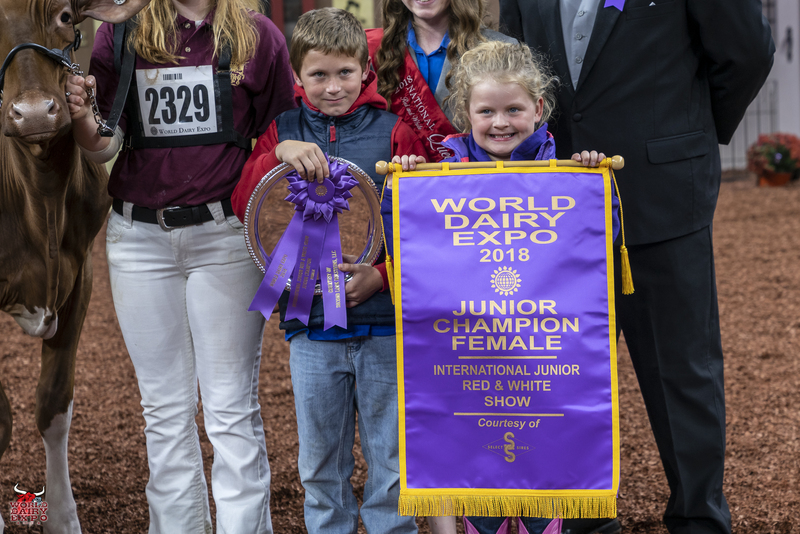 Reserve Grand Champion of the International Junior Red & White Show was Ms Aol Diamondback Raspberry-Red-ET, shown by Jaydn, Kennedy, Caroline and Andrew Kimball of Windham, Maine. 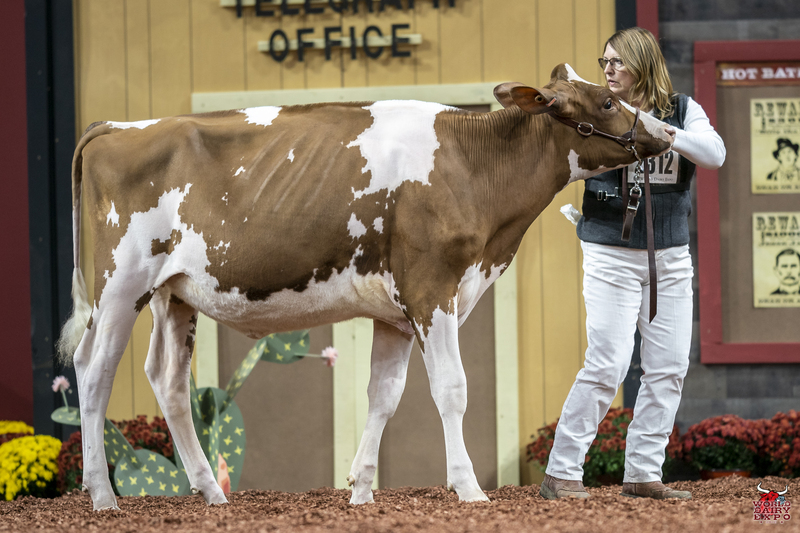 Raspberry was the winning Yearling Heifer in Milk and Intermediate Champion of the Show. 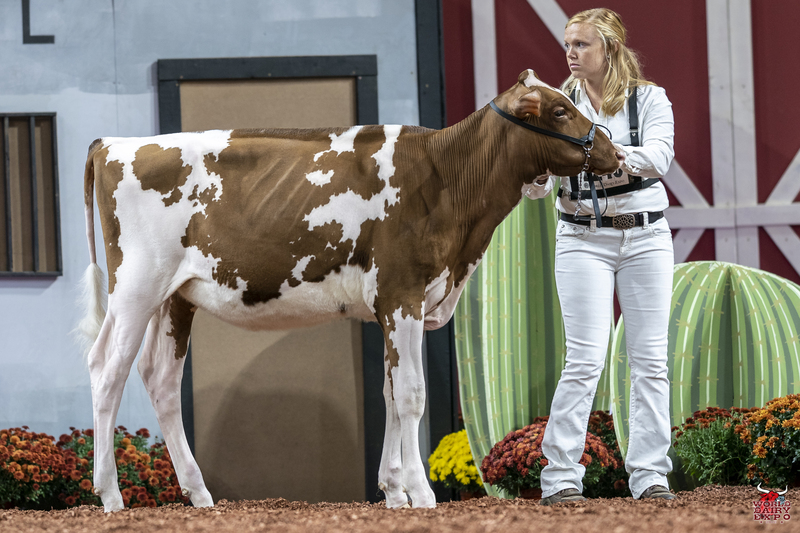 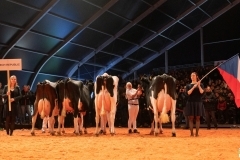 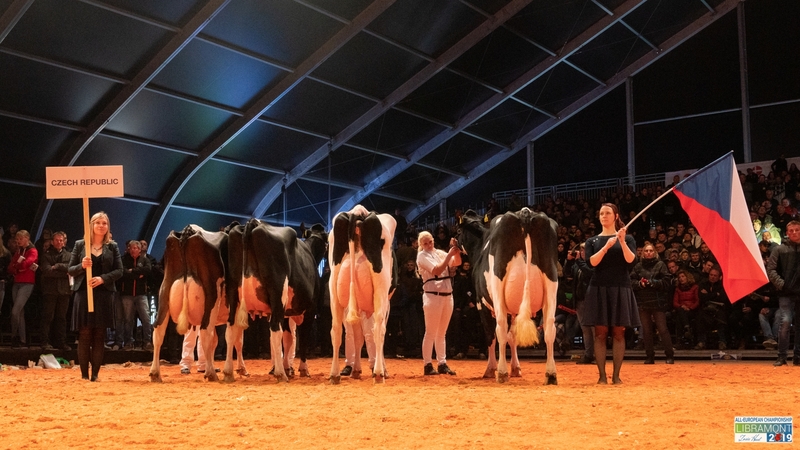 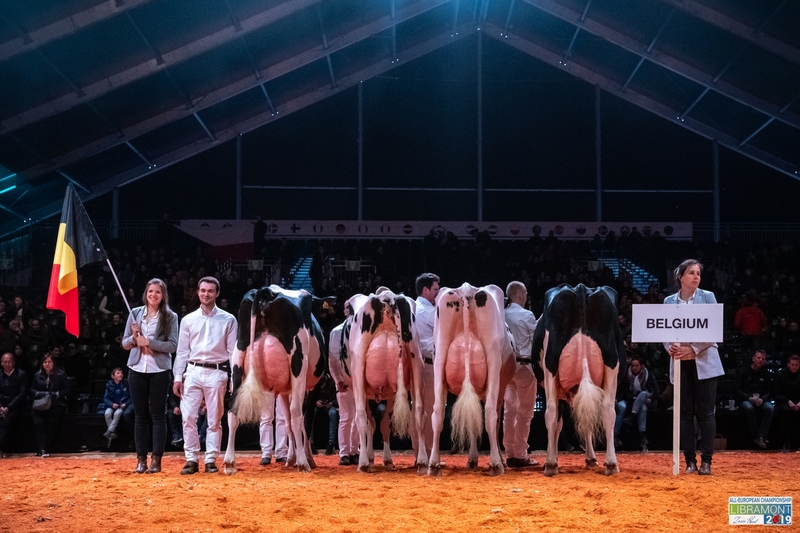 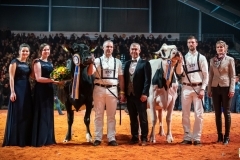 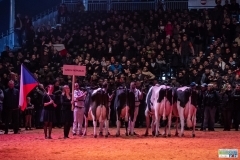 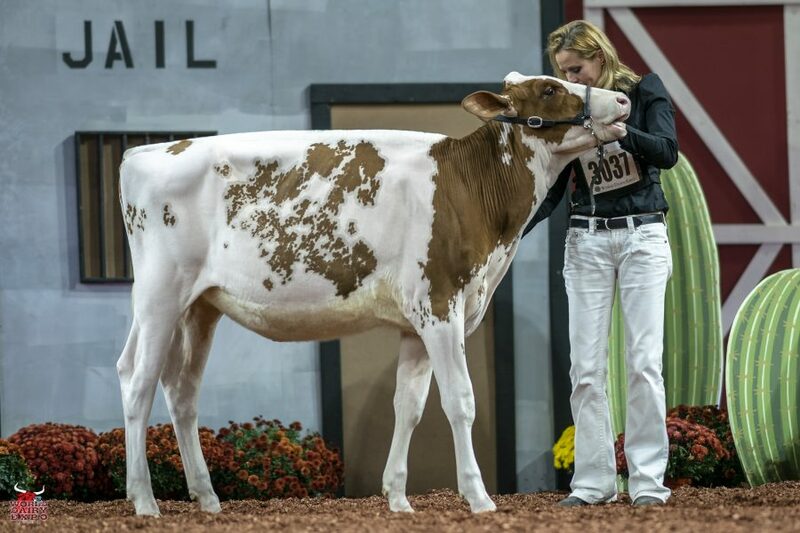 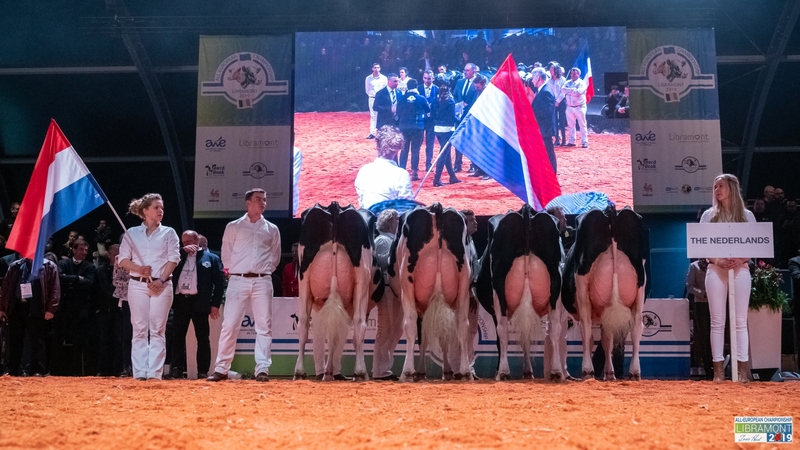 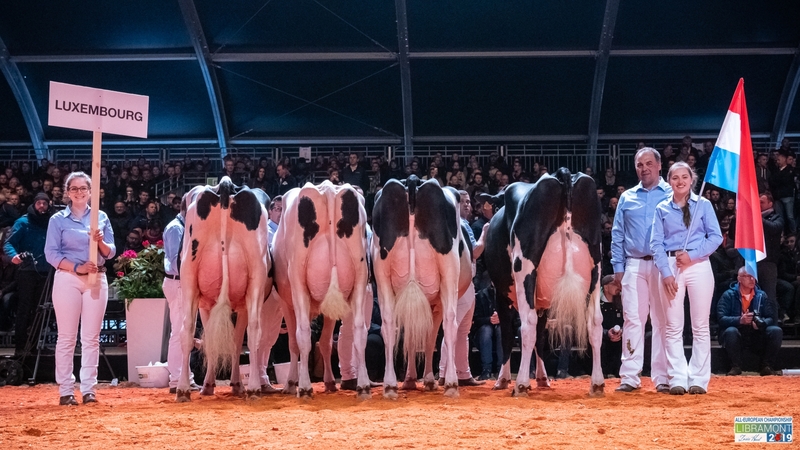 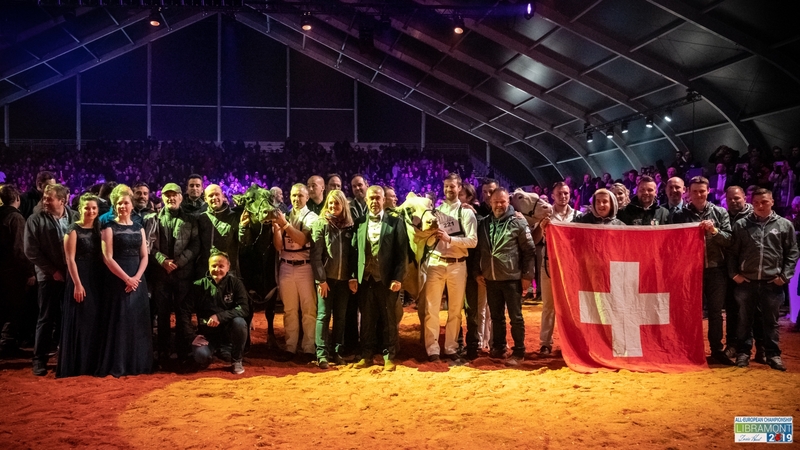 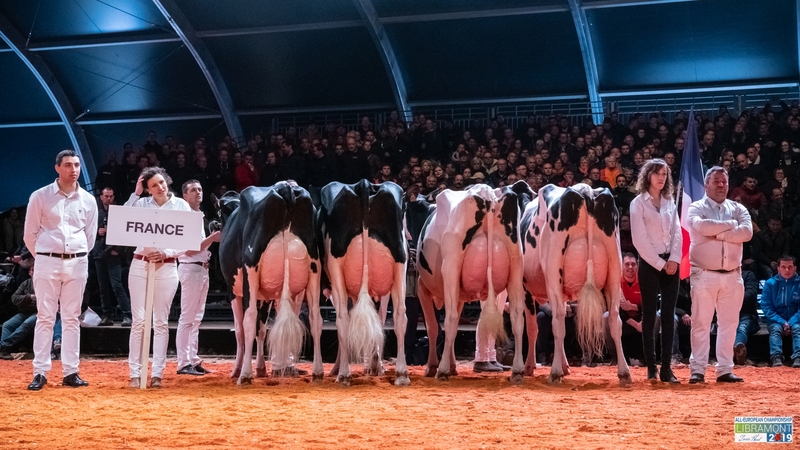 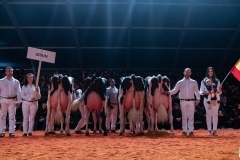 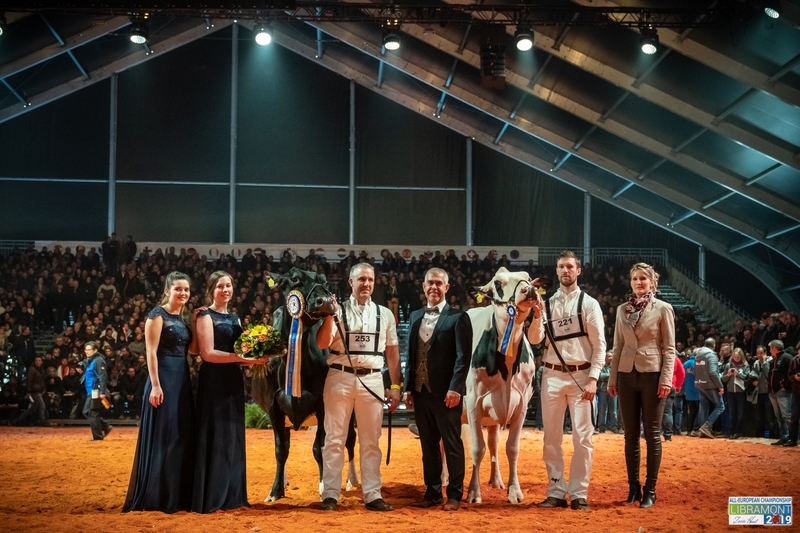 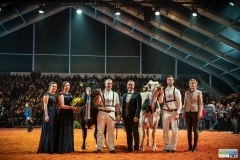 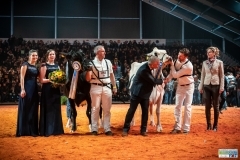 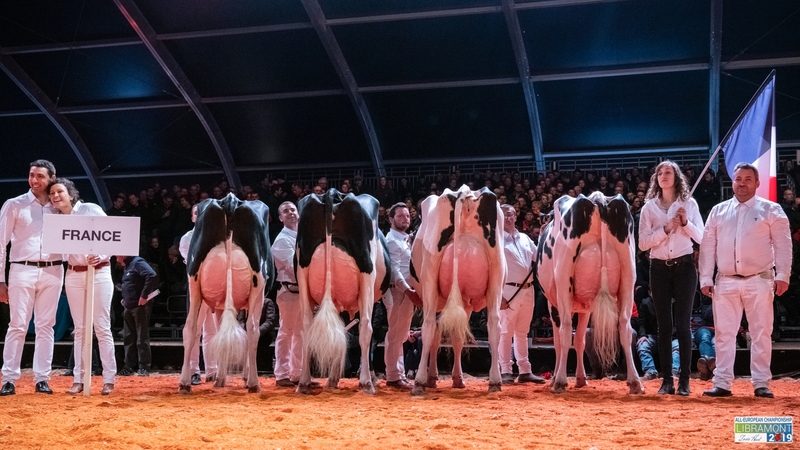 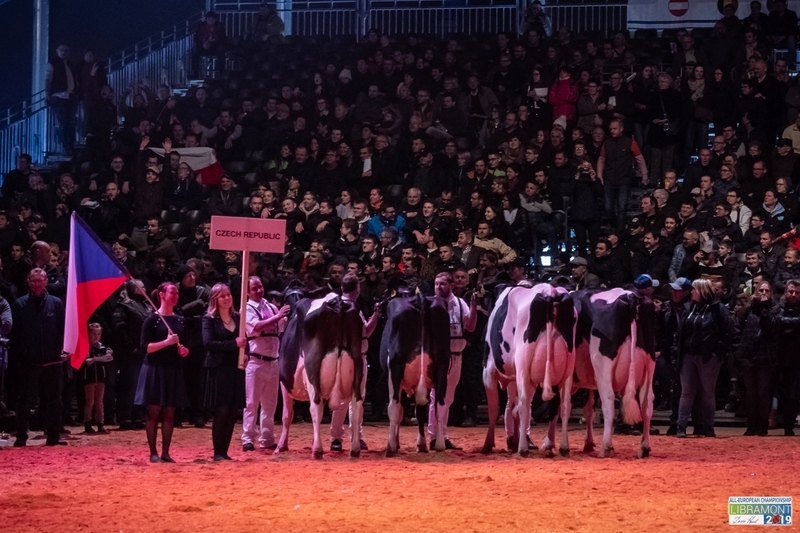 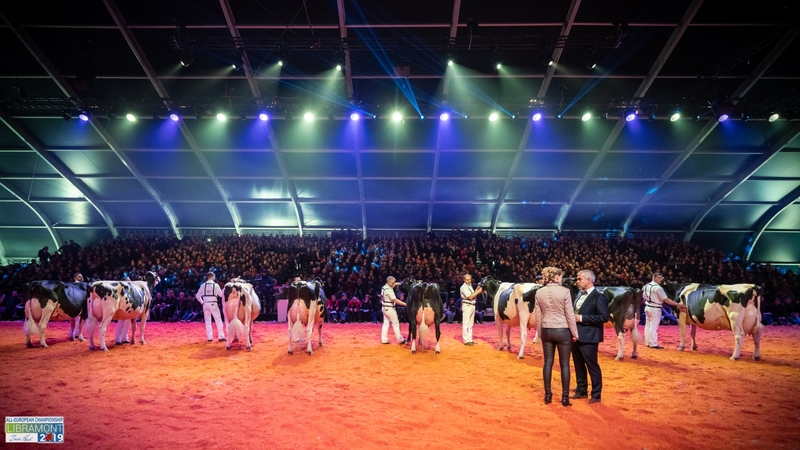 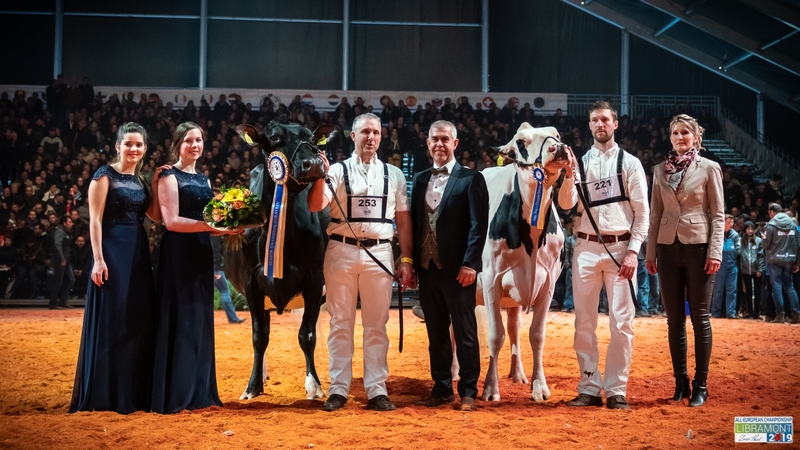 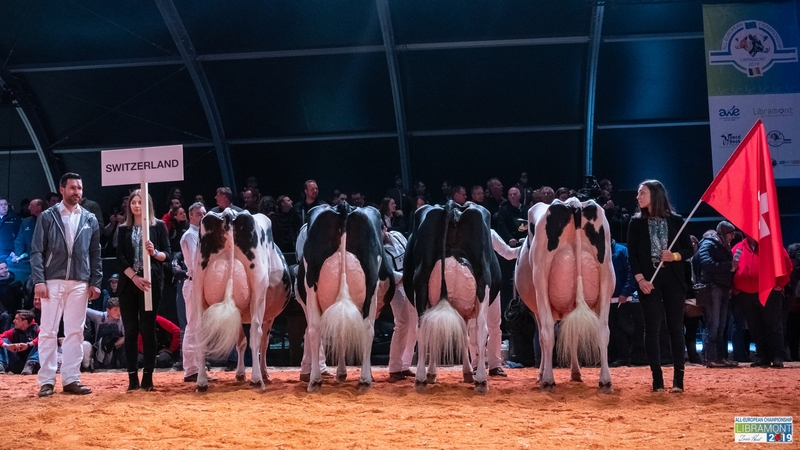 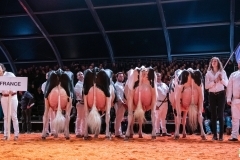 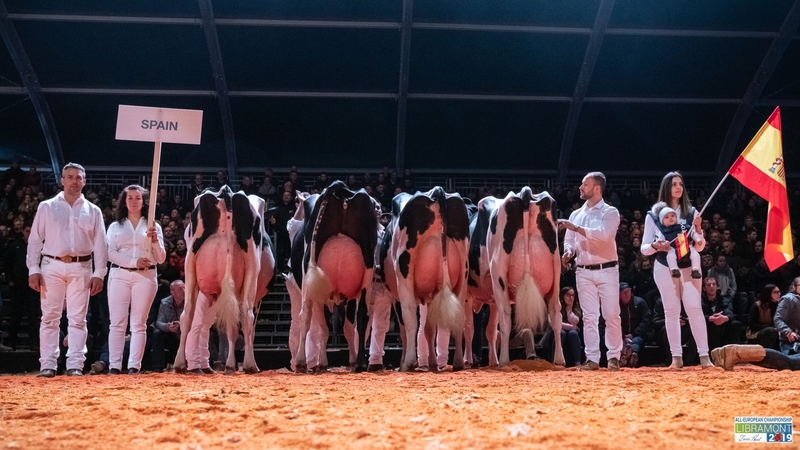 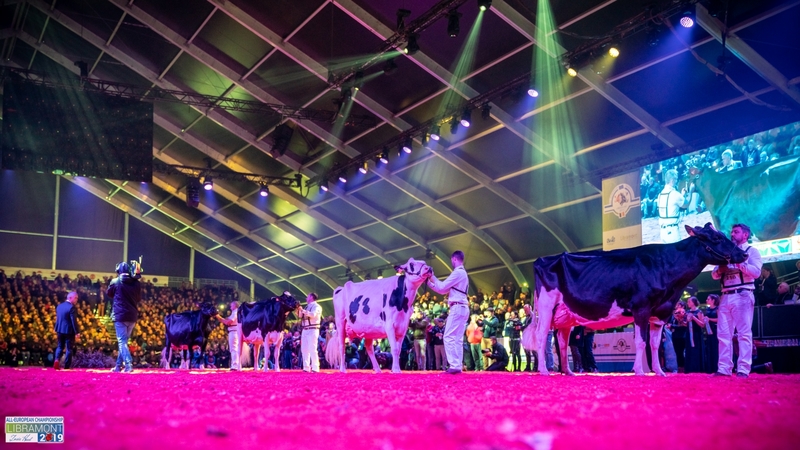 Reserve Senior Champion of the International Junior Red & White Show was Kamps-Hollow Acapela-Red-ET. 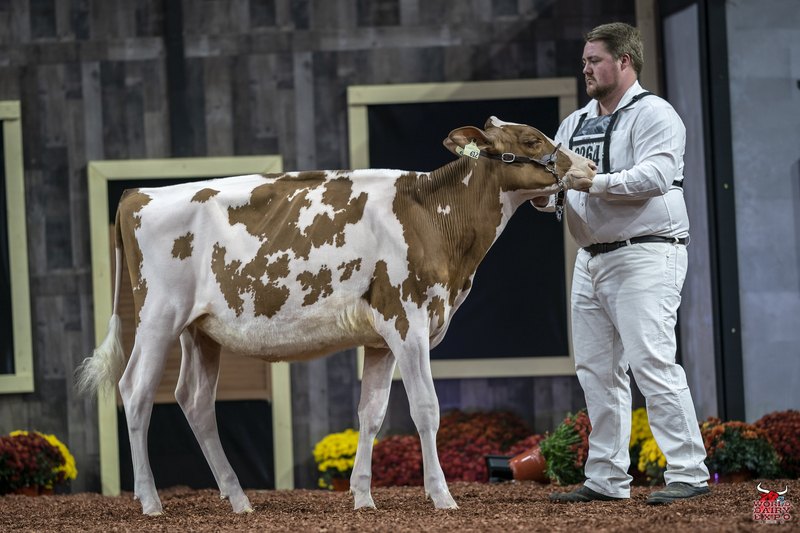 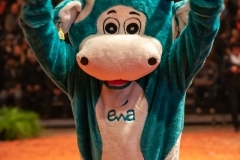 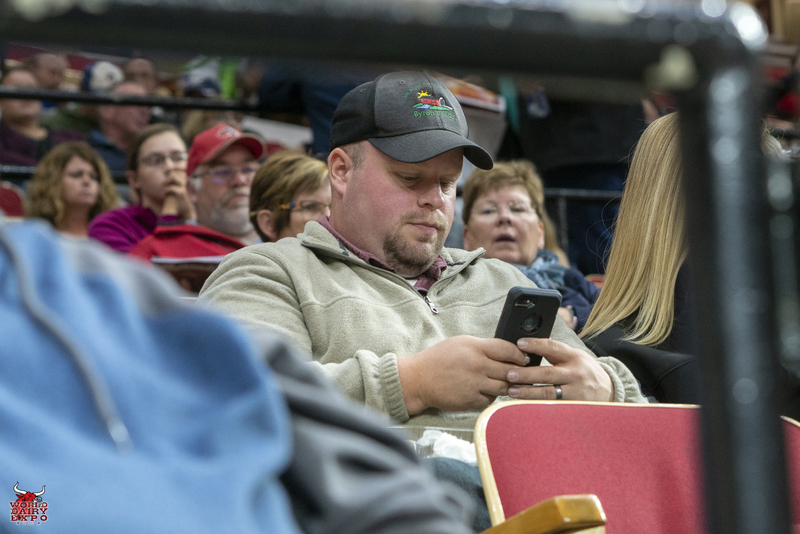 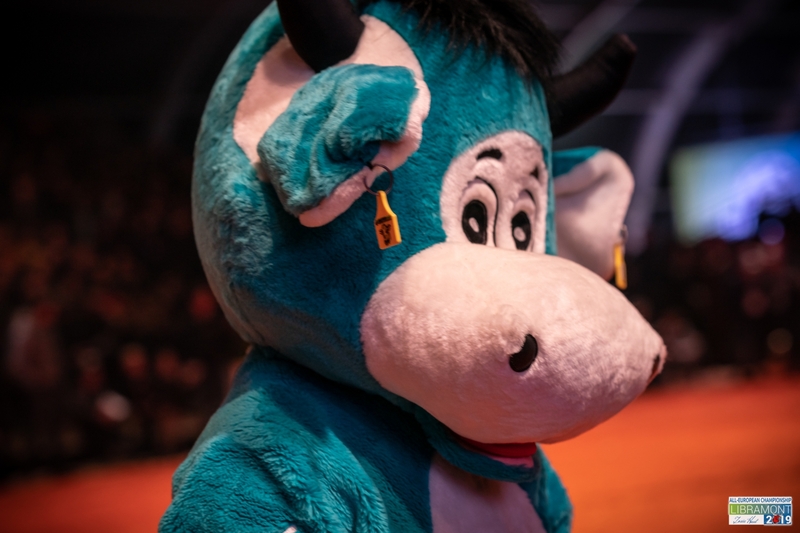 Acapela hails from Ixonia, Wis., and is owned by Grady and Lane Wendorf. 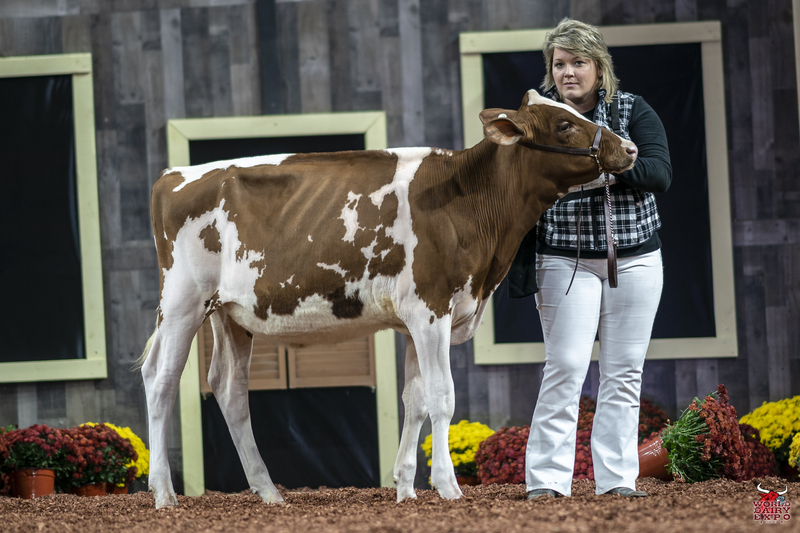 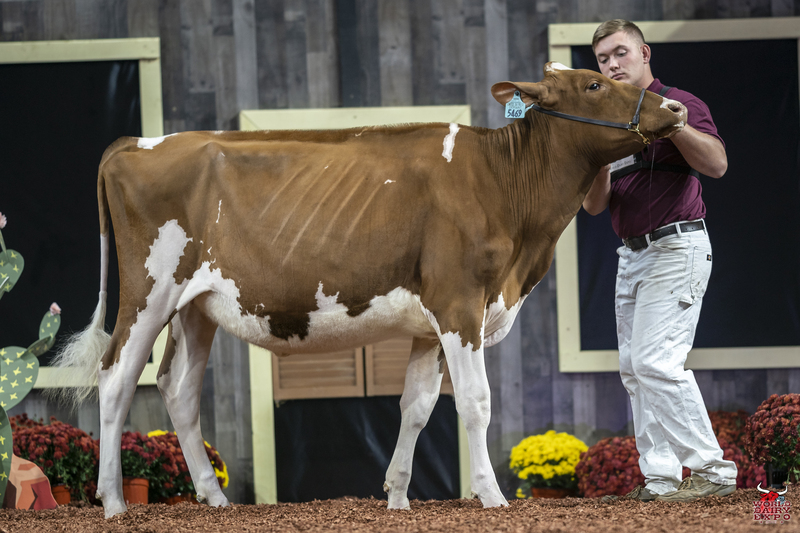 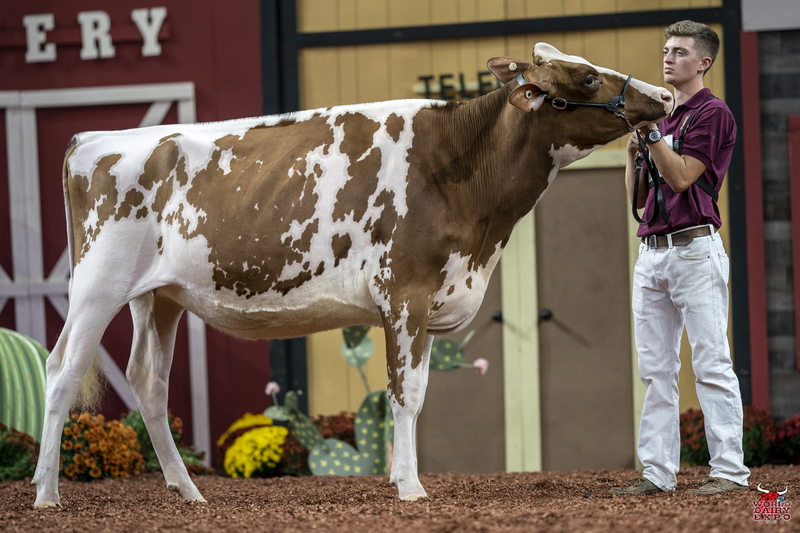 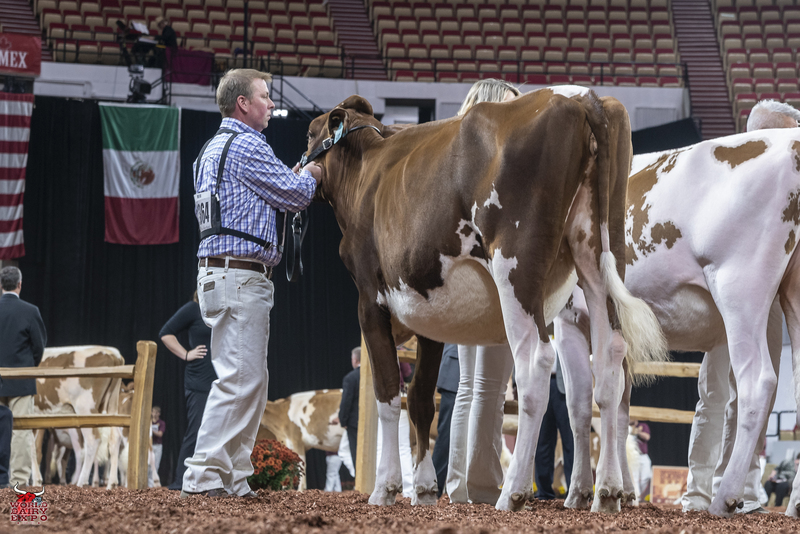 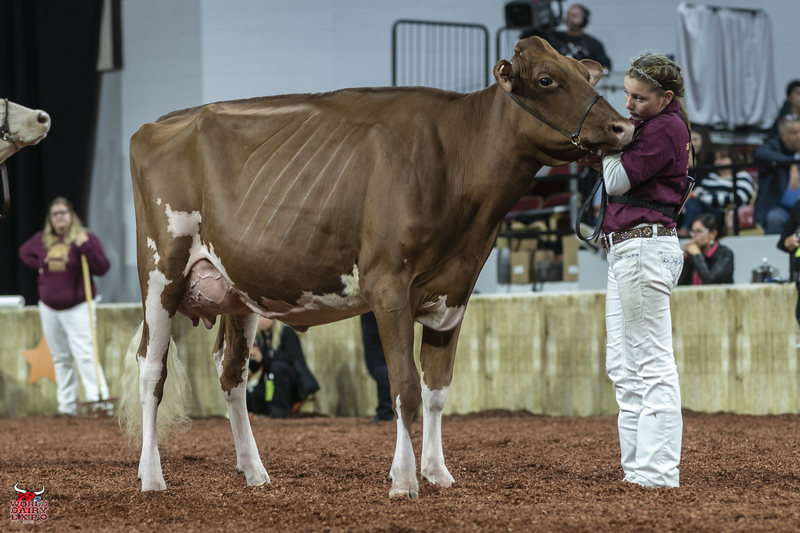 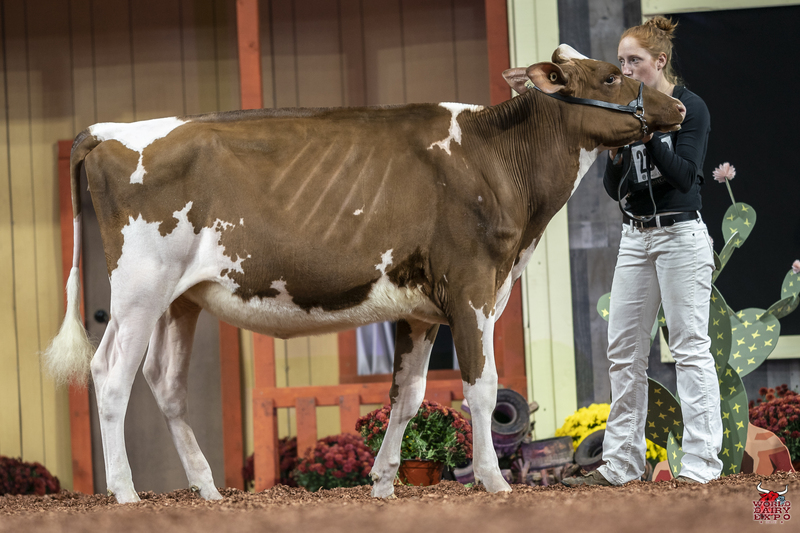 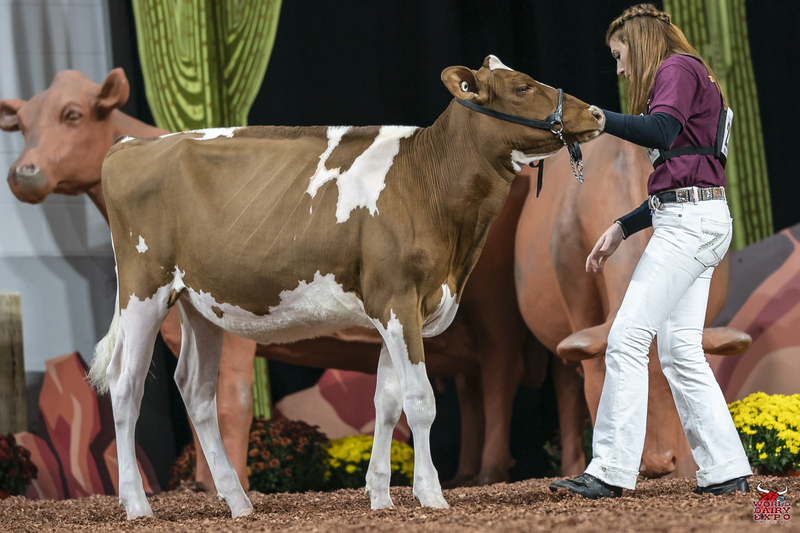 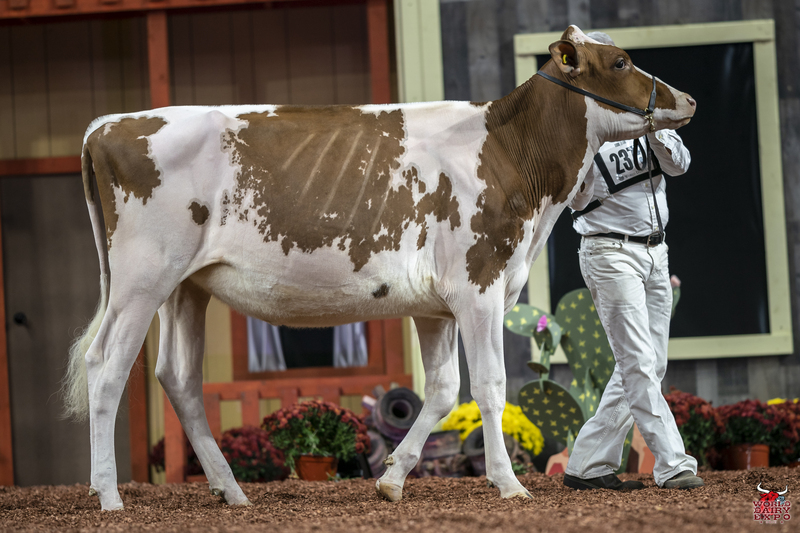 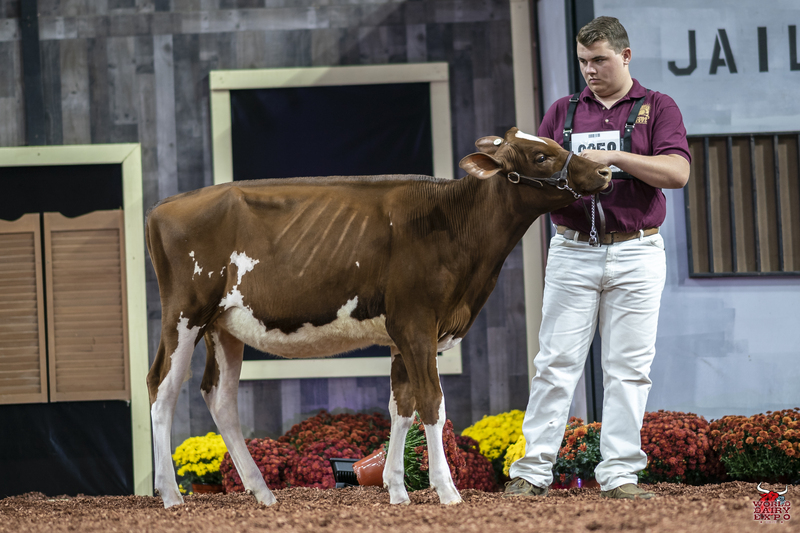 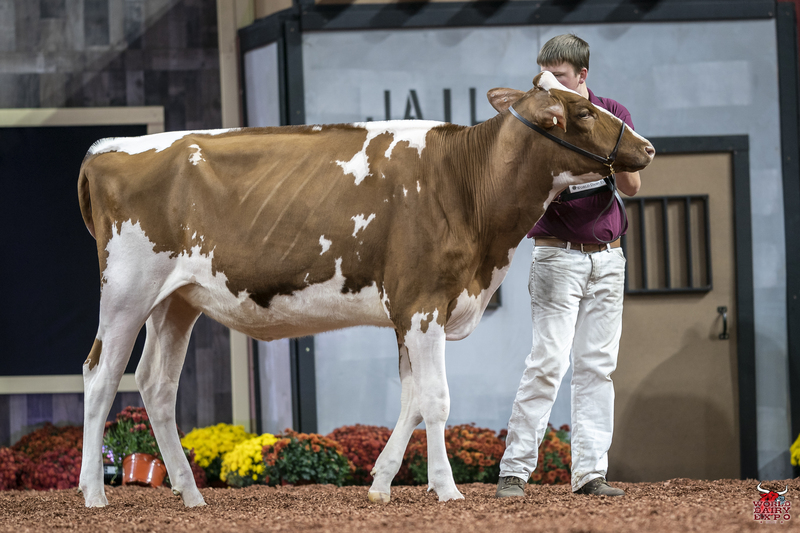 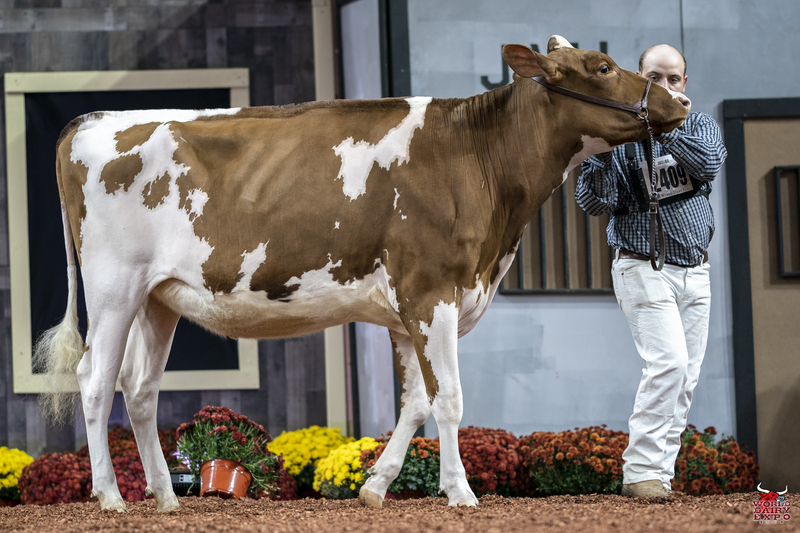 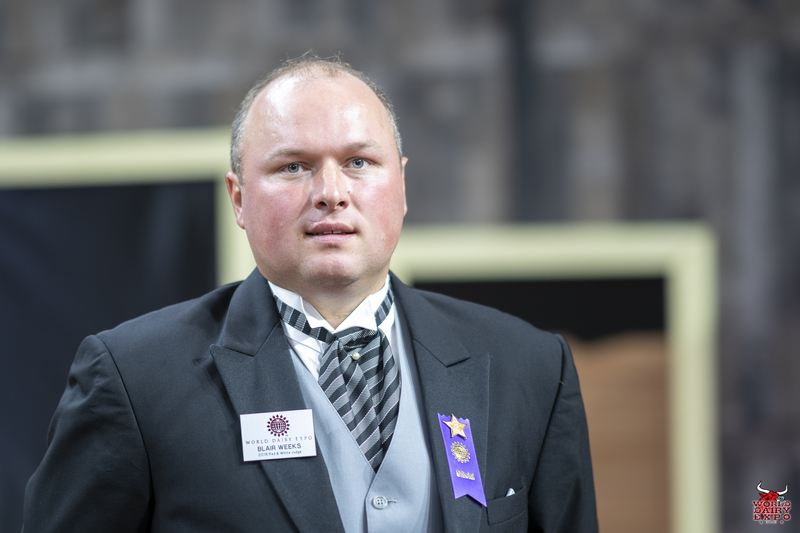 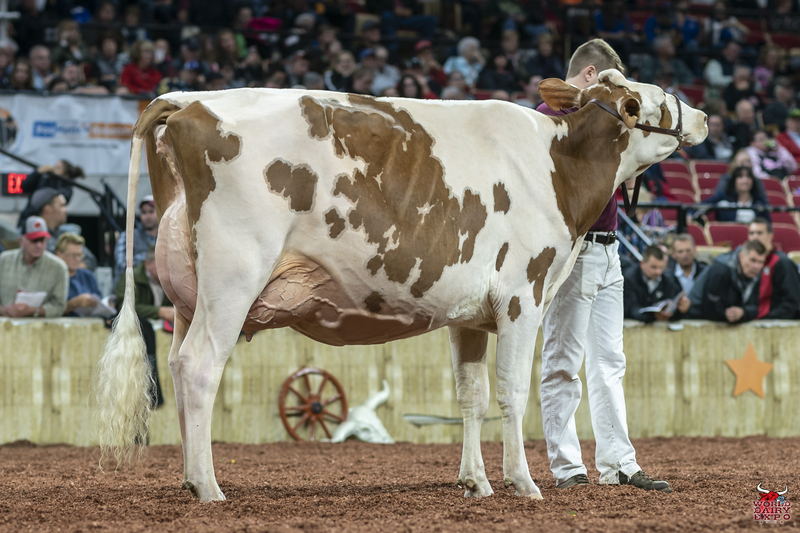 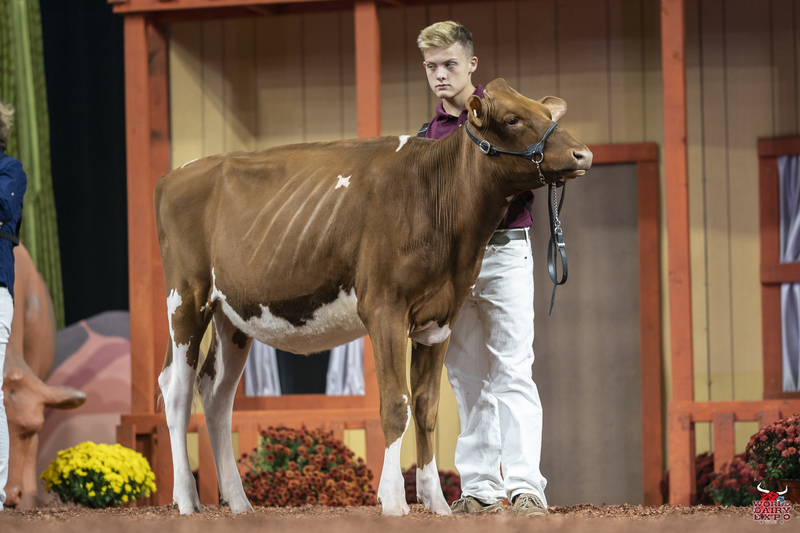 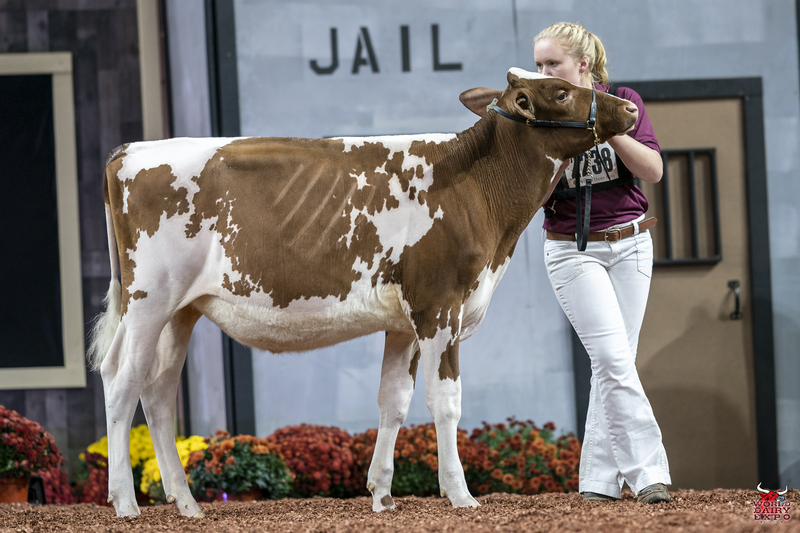 Reserve Intermediate Champion, from Algoma, Wis., was Mead-Manor Def Adeline-Red. 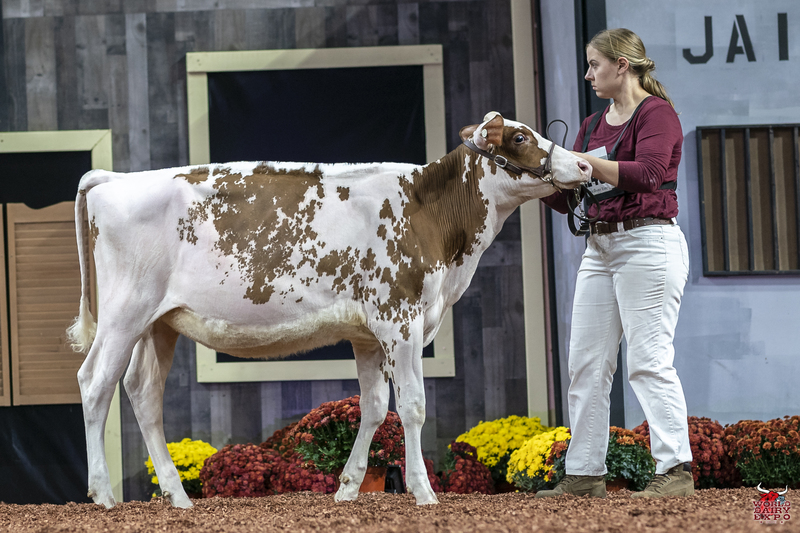 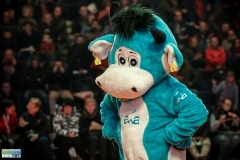 Adeline is owned by Mike and Megan Moede. 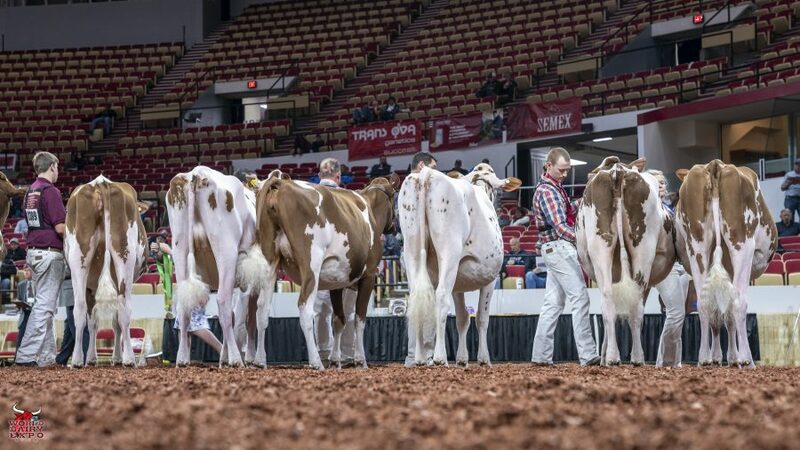 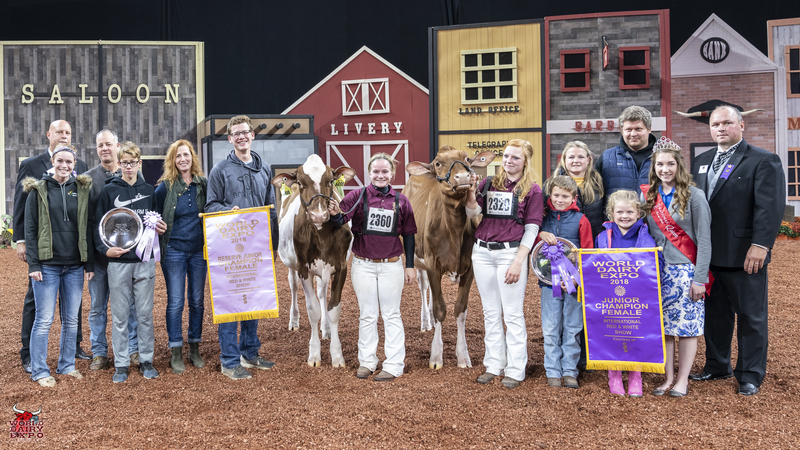 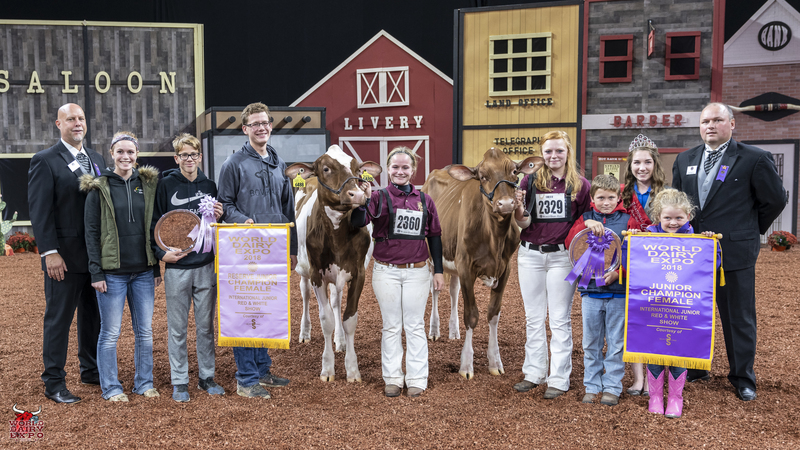 The winning pair of Fall Heifer Calves took home Junior Champion and Reserve Junior Champion of the International Red & White Junior Show; Ms Kress-Hil Saphire-Red-ET, exhibited by Owen and Kendyll Kress and Savanah Barts of Newton, Wis., and Synergy Jordys Spike-Red-ET, exhibited by M, C, & E Jauquet and M, C, & S Haack of Pulaski, Wis., respectively. 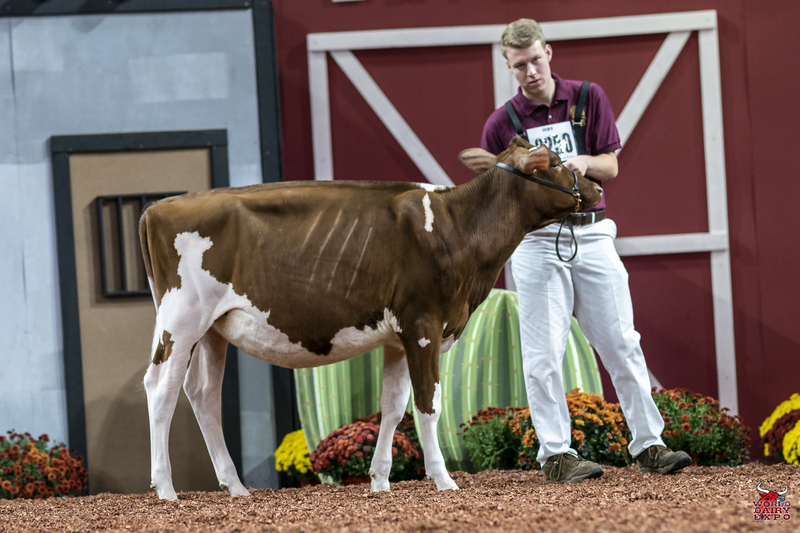 Maple-Downs Farms II and Thomas Hoskings, Jr.